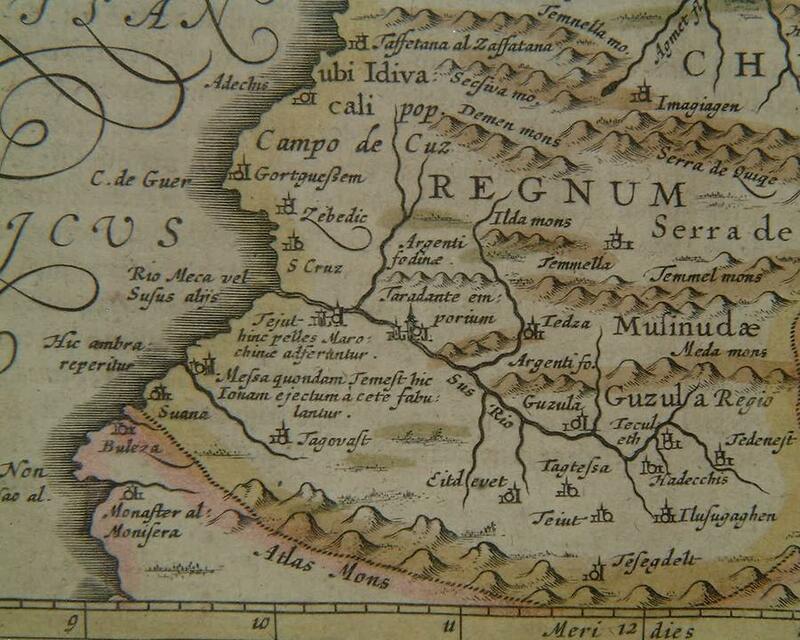 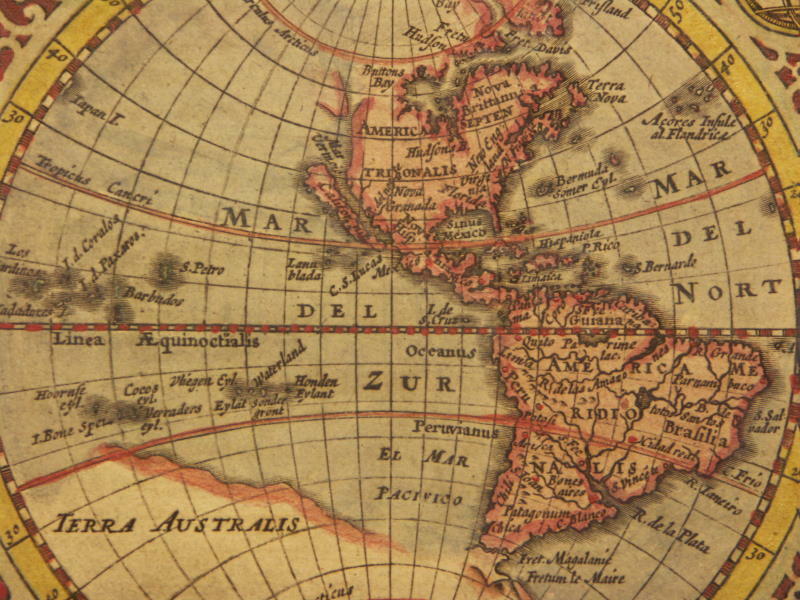 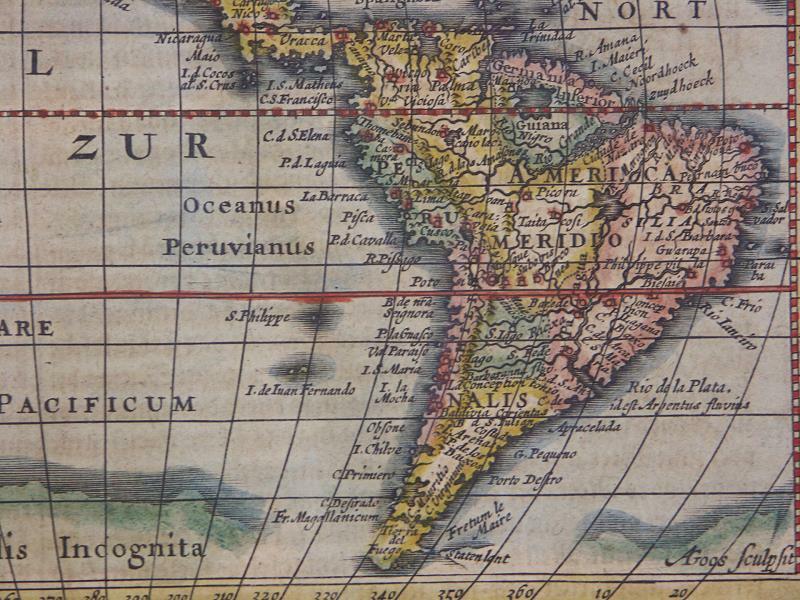 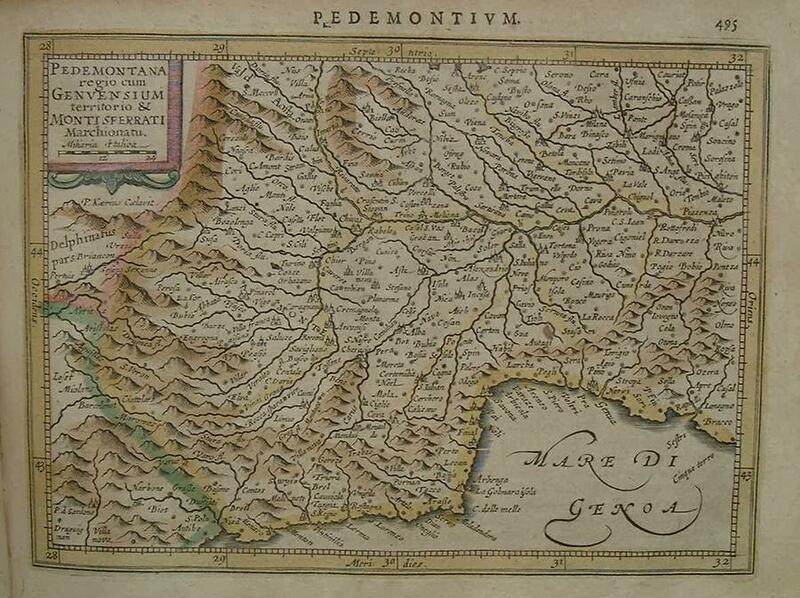 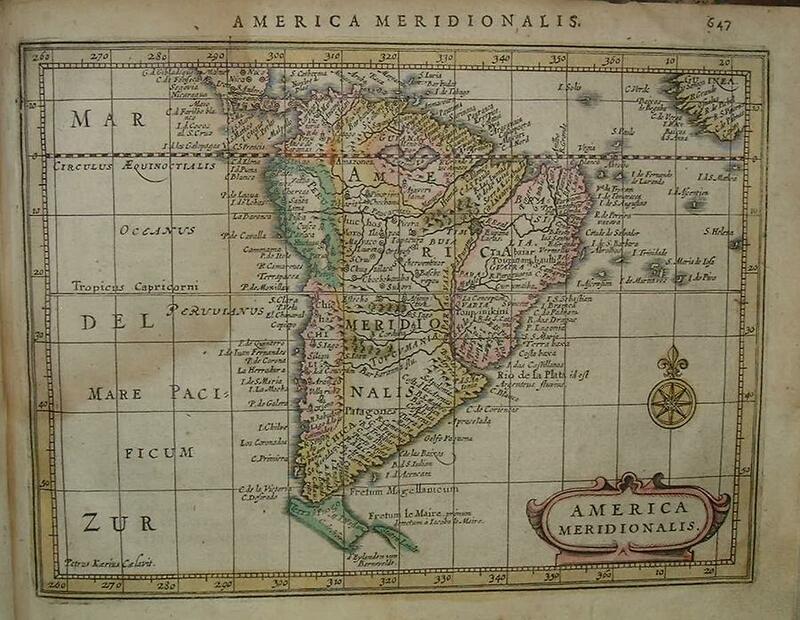 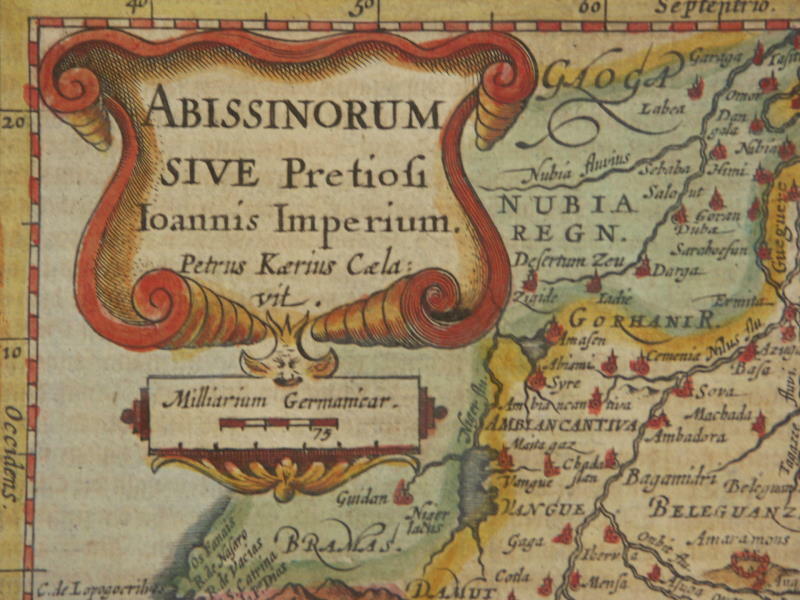 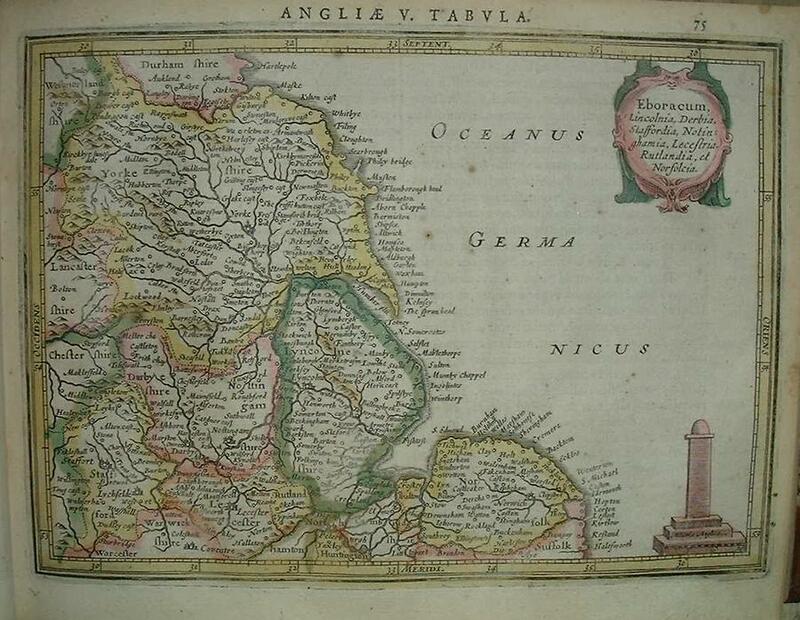 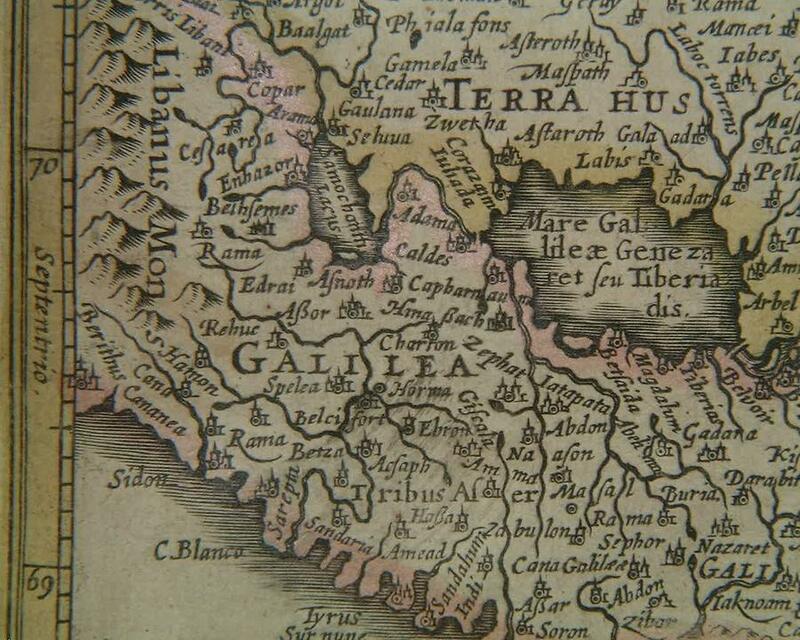 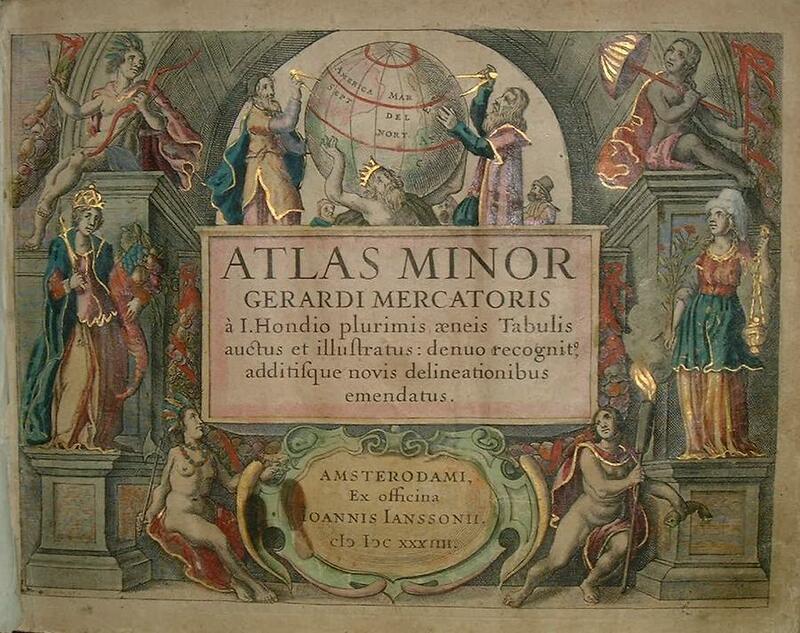 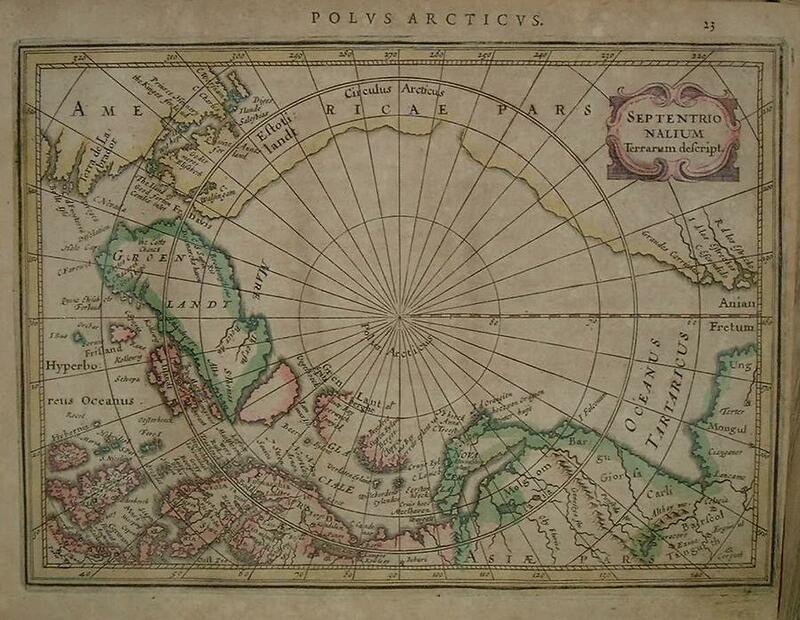 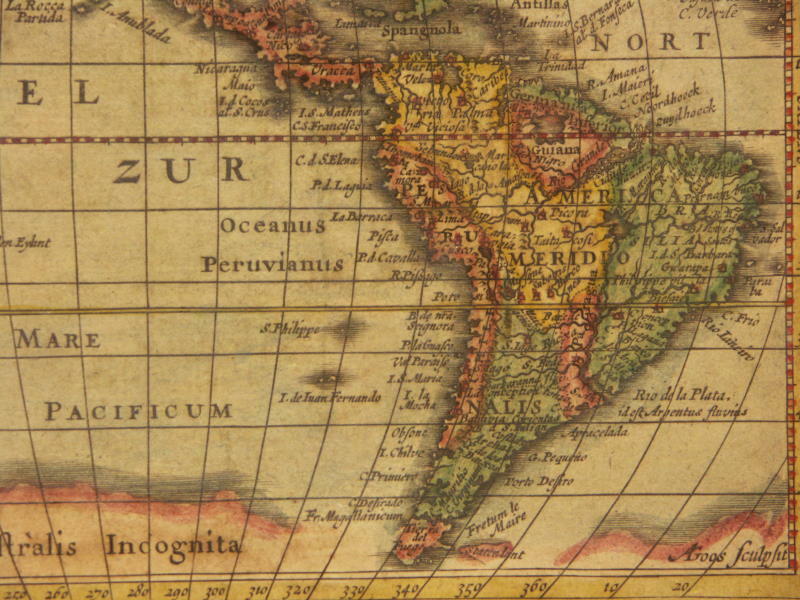 The "Atlas Minor" by *Gerard Mercator*, Jodocus Hondius the Elder & Joannes Janssonius had the full title of "ATLAS MINOR GERARDI MERCATORIS À I. HONDIO PLURIMIS ÆNEIS TABULIS AUCTUS ET ILLUSTRATUS: DENUO RECOGNIT, ADDITISQUE NOVIS DELINEATIONIBUS EMENDATUS" Amsterodami, Ex officina Ioannis Ianssonii, 1634. 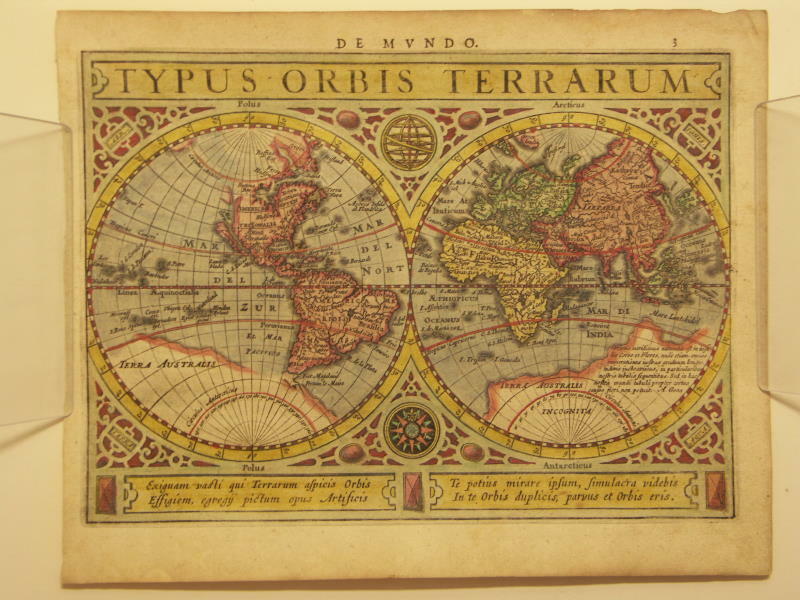 "Originally published in 1607 by Jodocus Hondius and Jan Janszoon, this is the 1634 Latin edition of Mercator's Atlas minor, published by Joh. 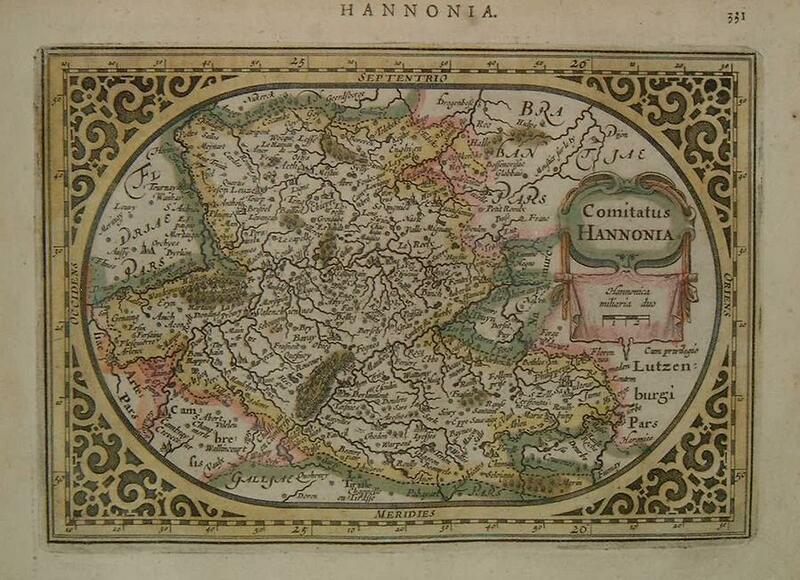 Janssonius. 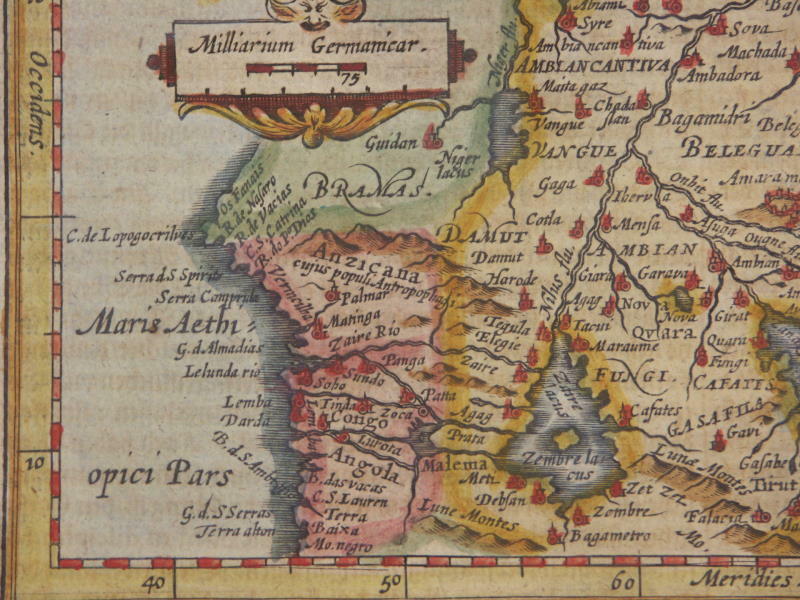 Gerard Mercator spent his childhood in Gülich and went to the University of Leuven where he was registered as a student without means' on 29 August 1530. 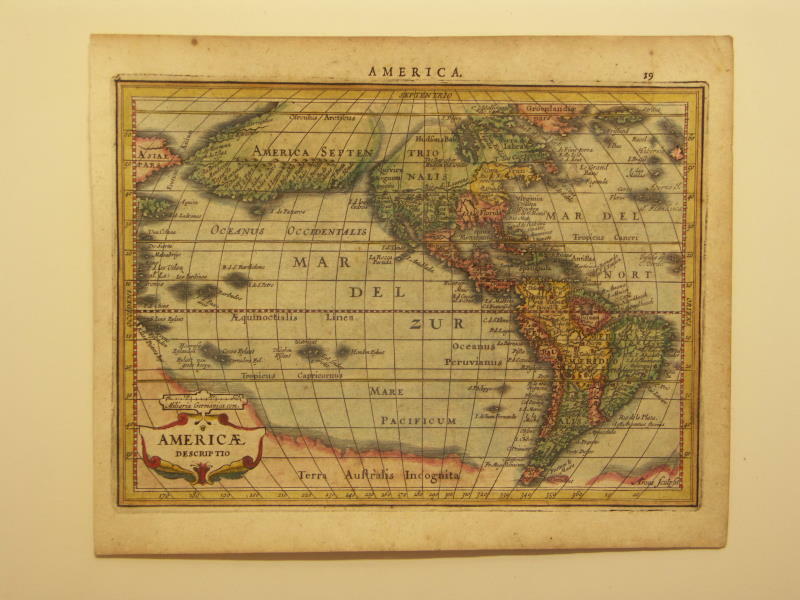 The problems of the creation of the Universe and the Earth interested him in particular; this is reflected by his works, written in later years. 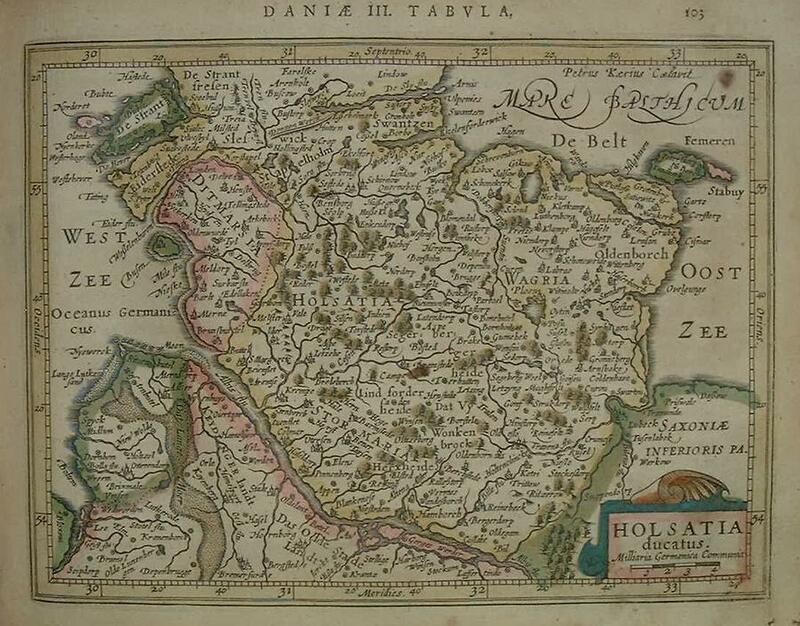 As his personal opinions did not agree with the scholastic philosophy as lectured at Leuven, he left the city for Antwerp, where he could contemplate without being influenced. 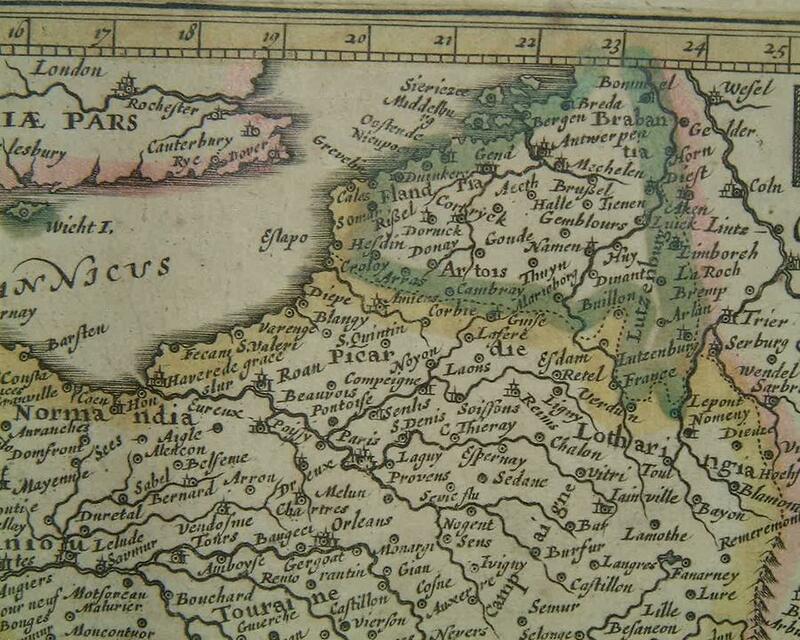 Convinced of the importance of exact sciences, for the study of the true configuration of the world, he returned to Leuven, ca. 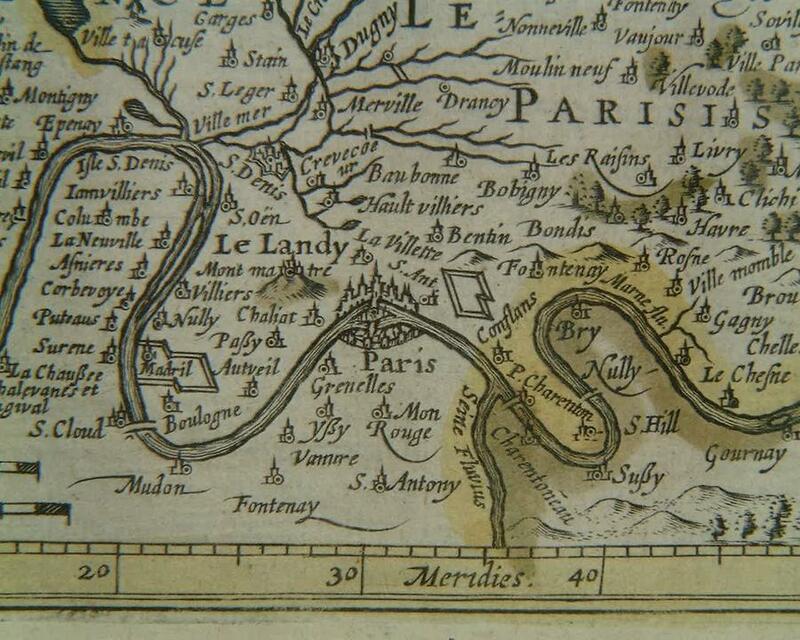 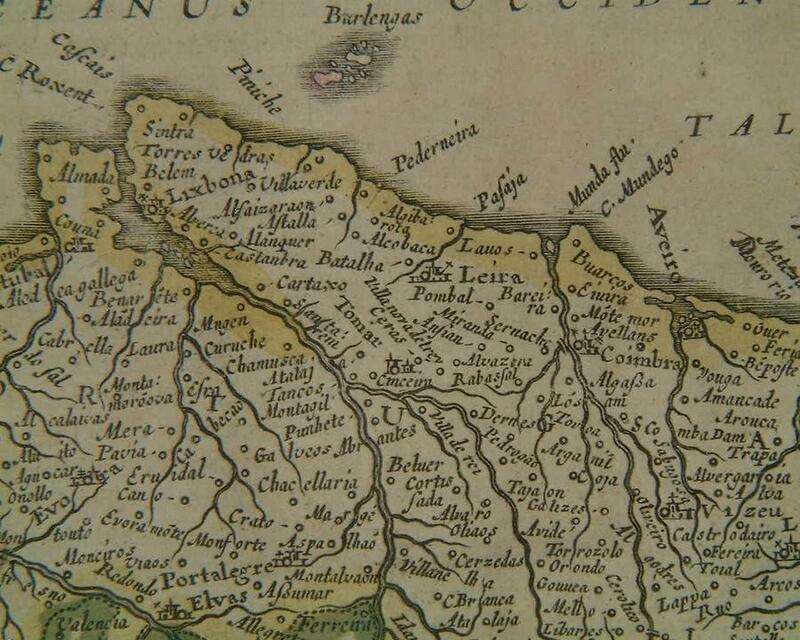 1535, where he took courses in mathematics, both theoretical and practical, under the guidance of Gemma Frisius. 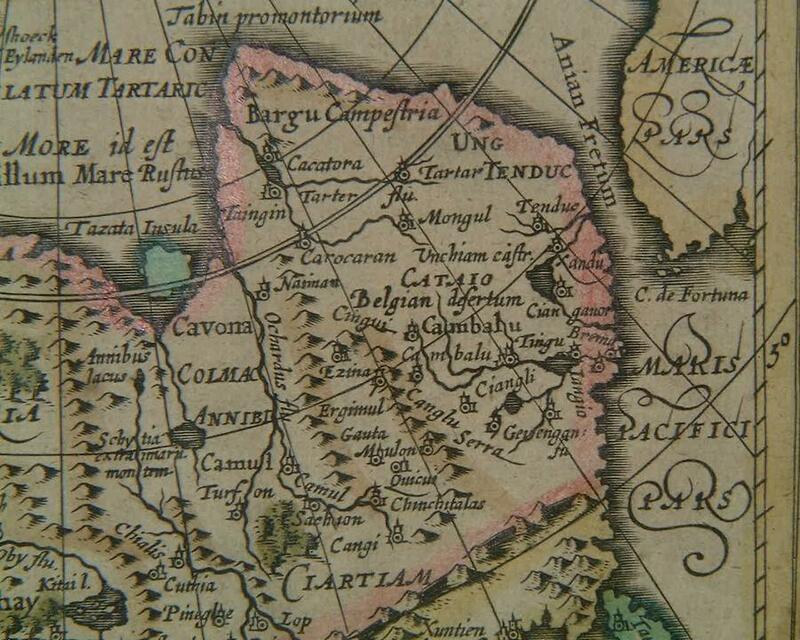 Soon he was recognised as an expert on the construction of mathematical instruments, as a land-surveyor and, after 1537, as a cartographer. 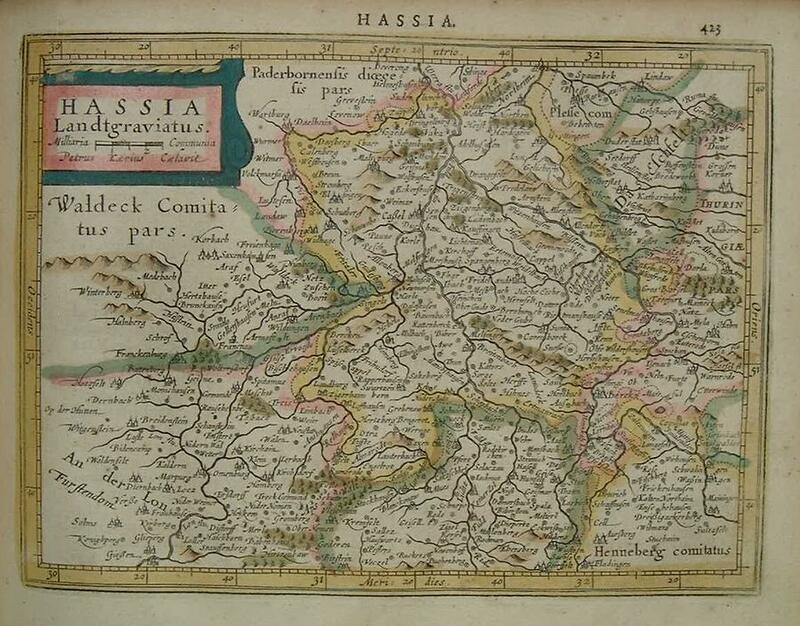 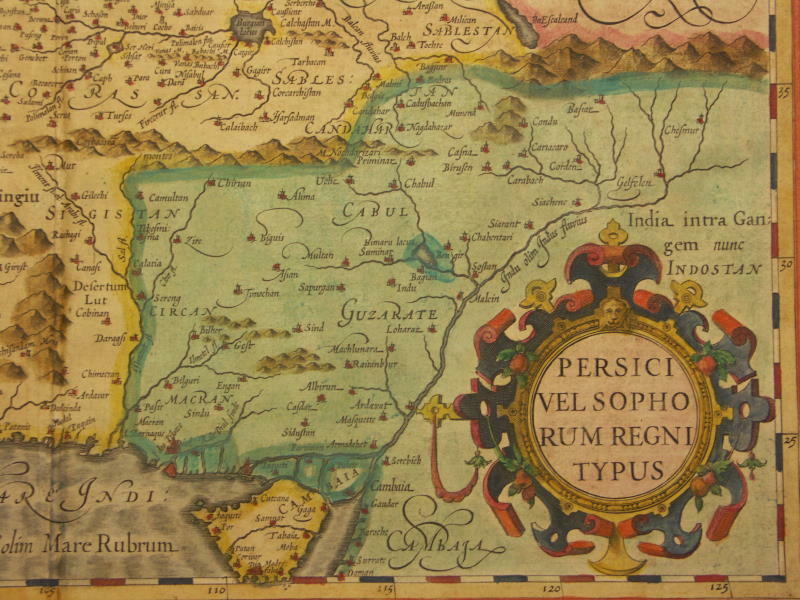 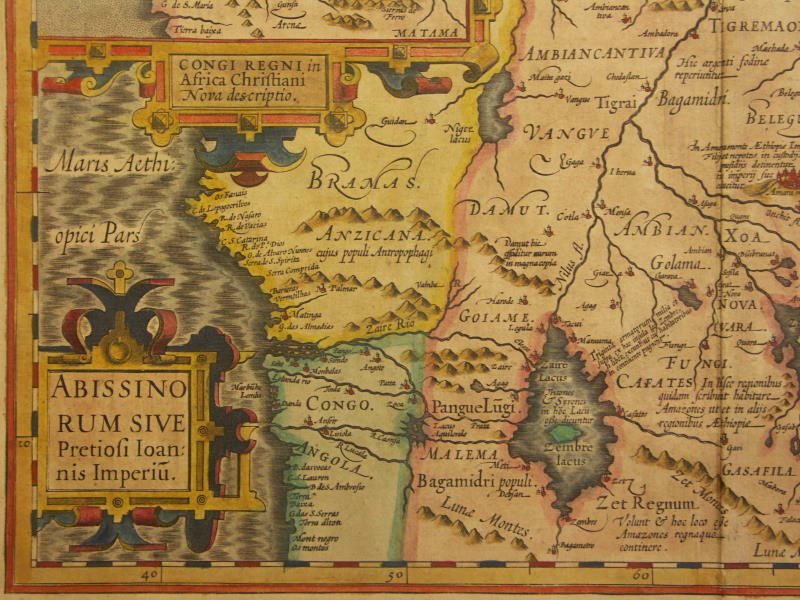 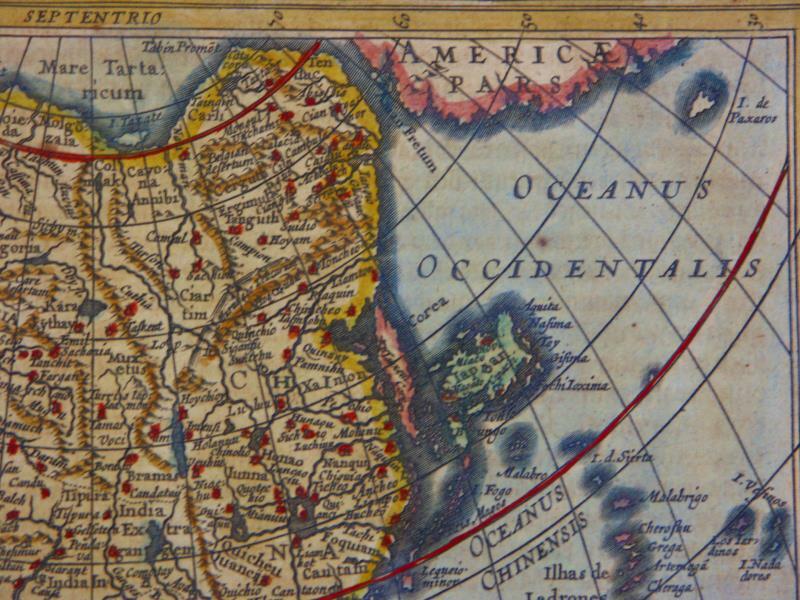 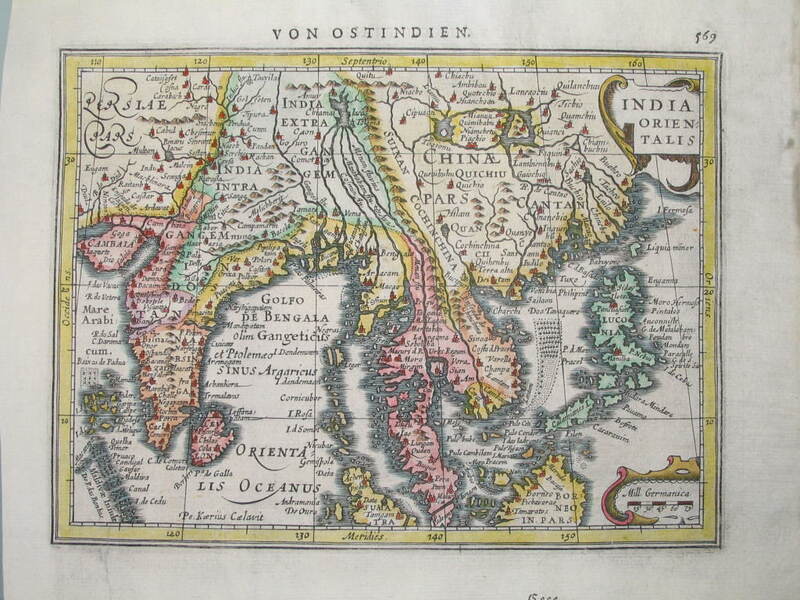 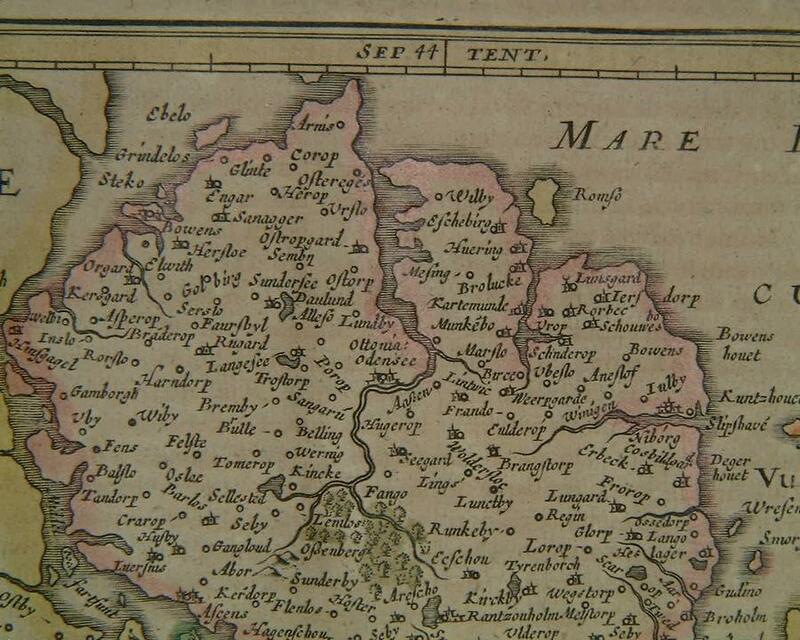 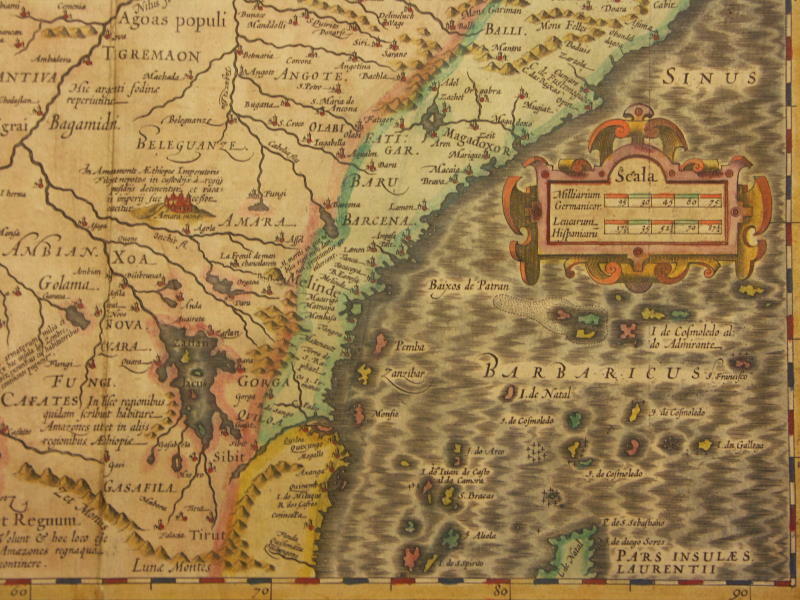 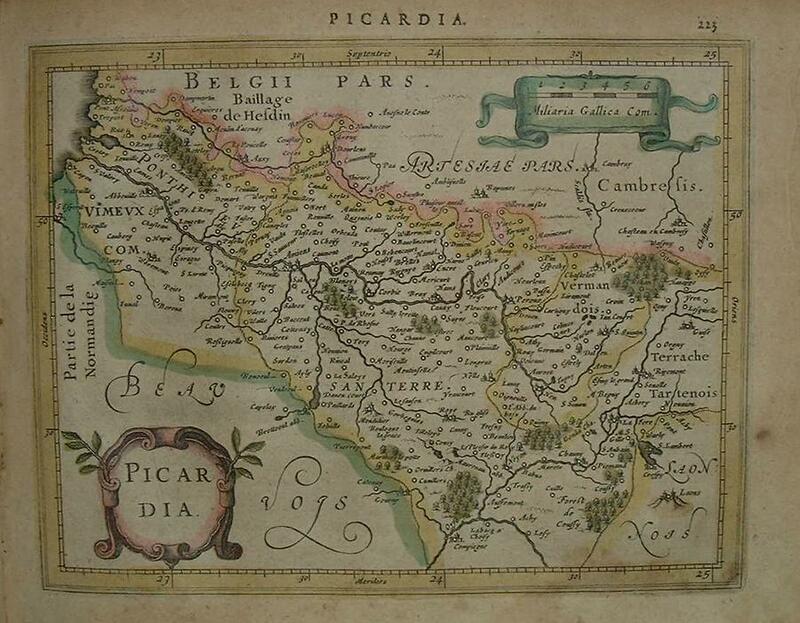 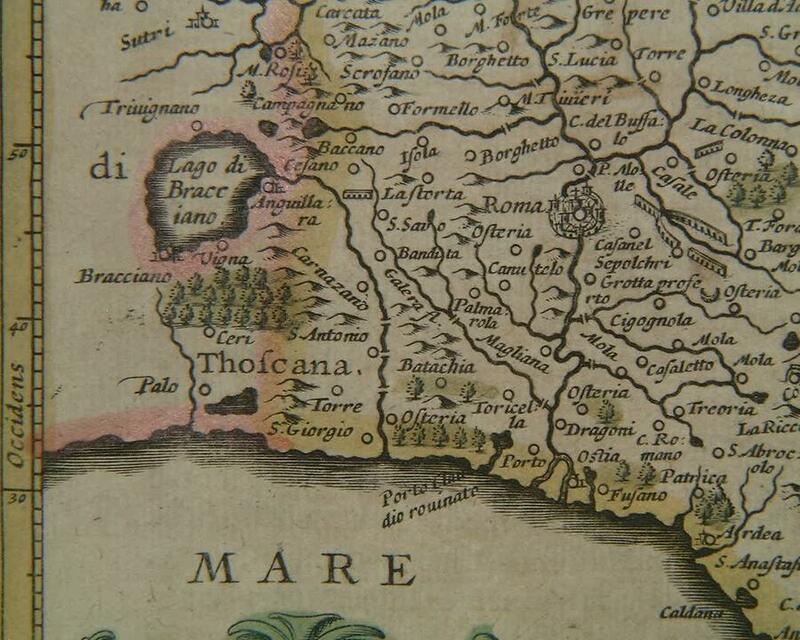 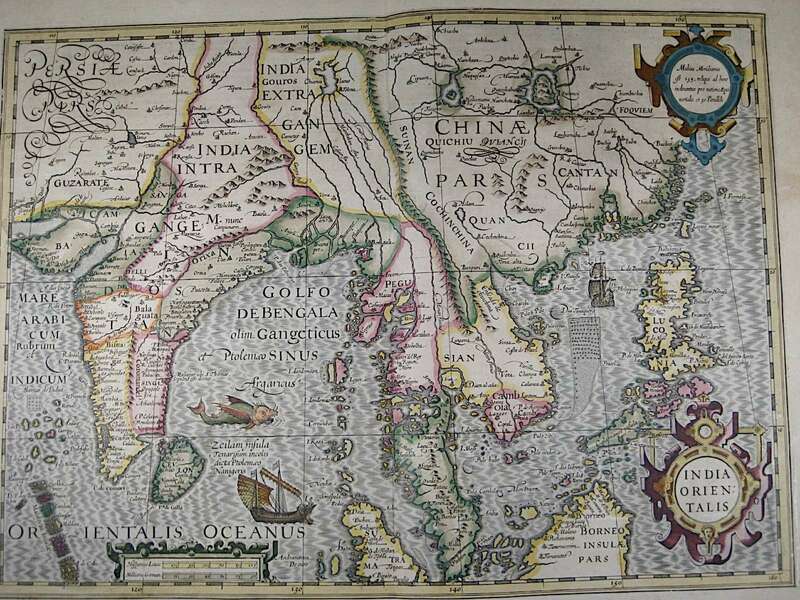 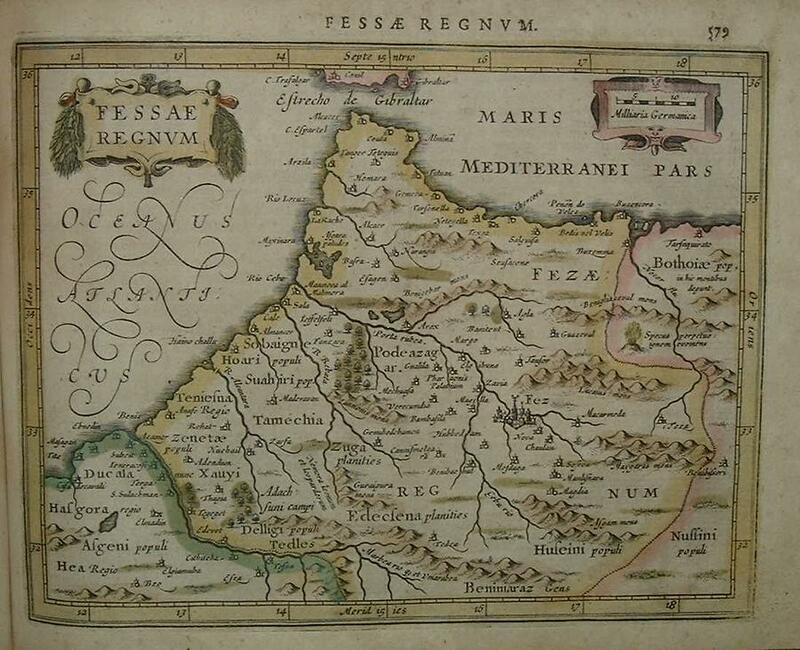 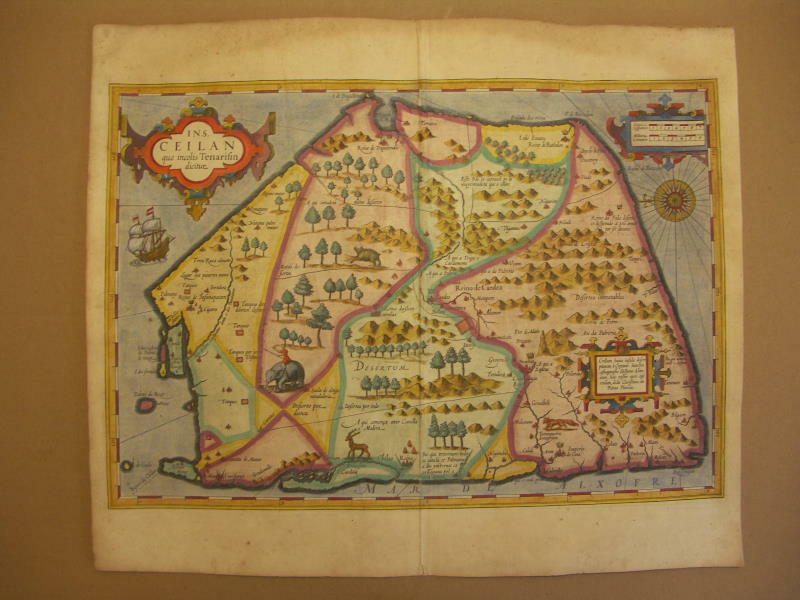 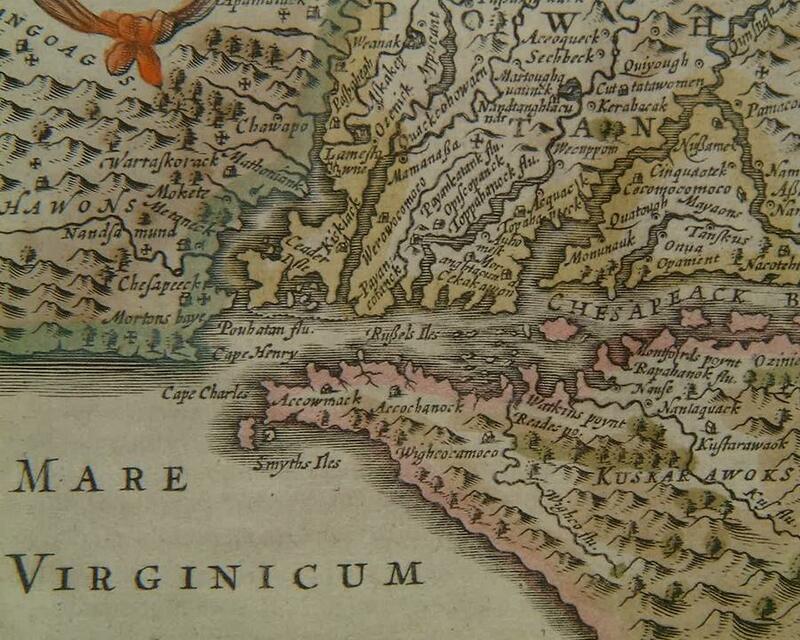 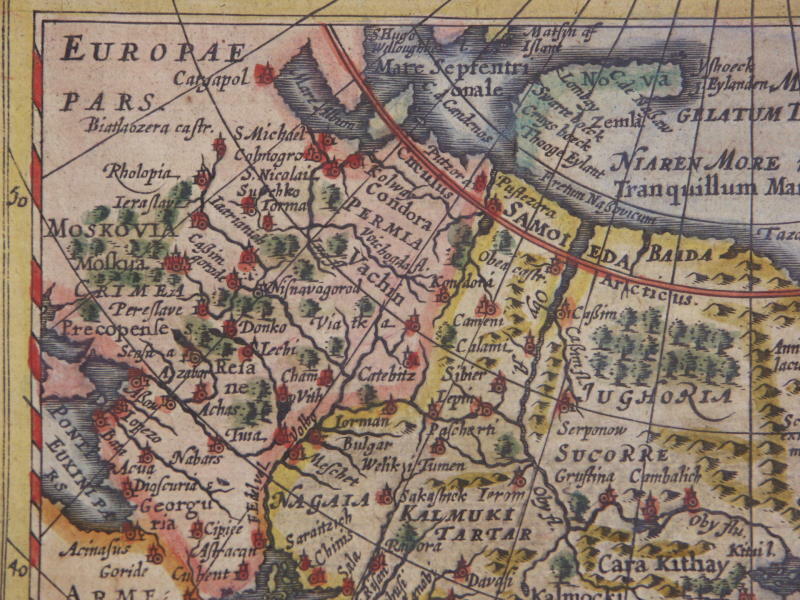 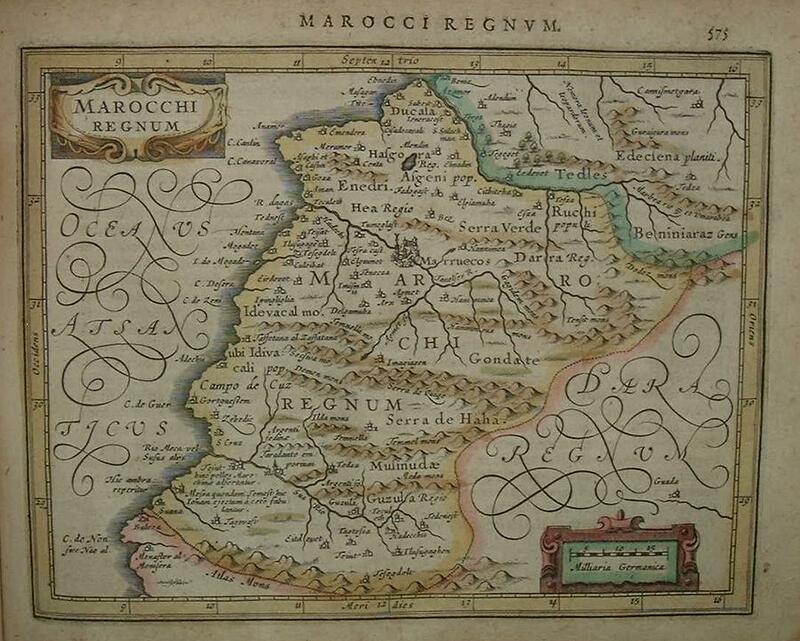 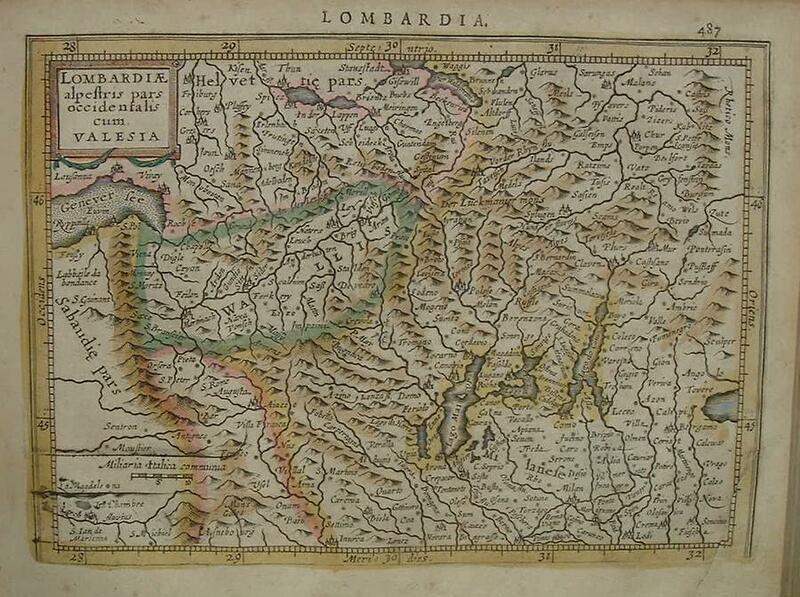 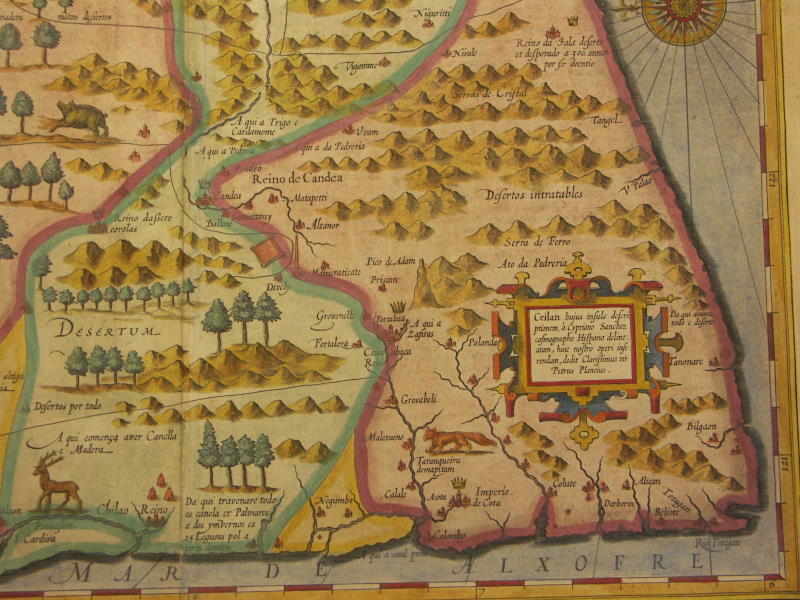 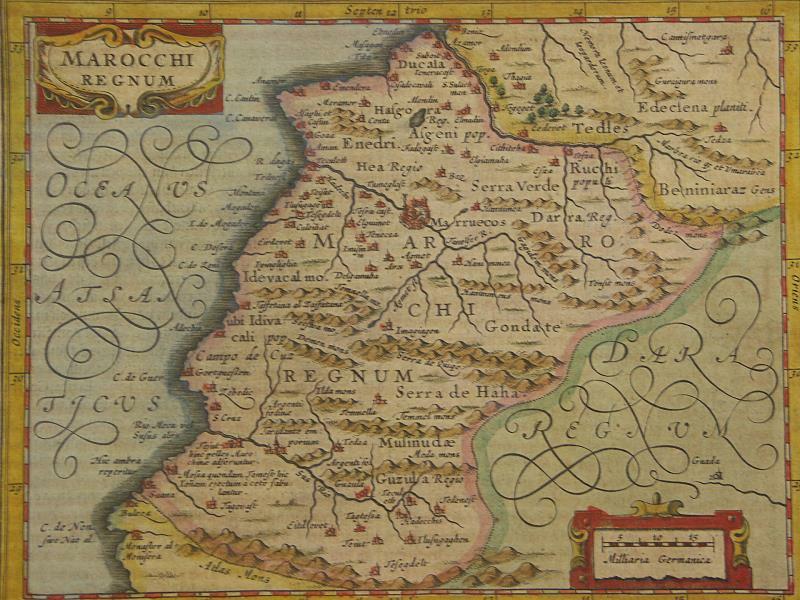 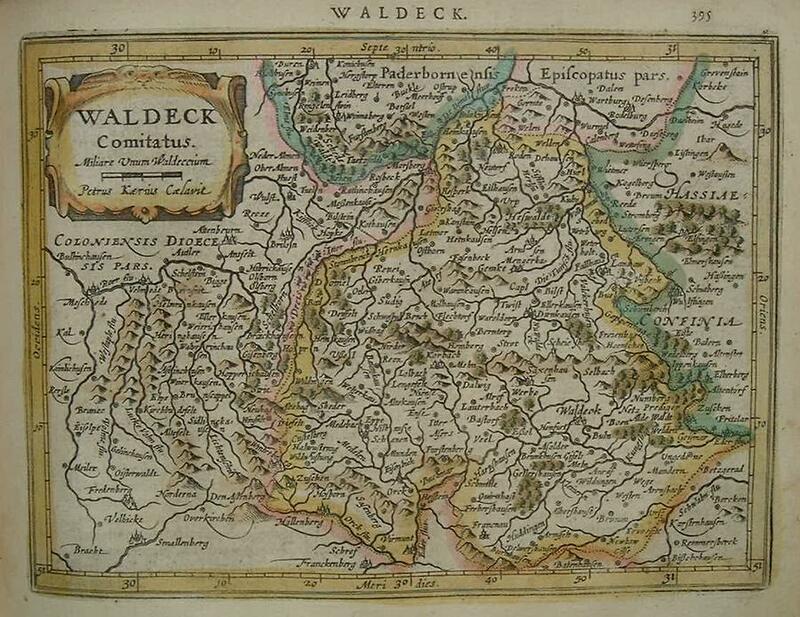 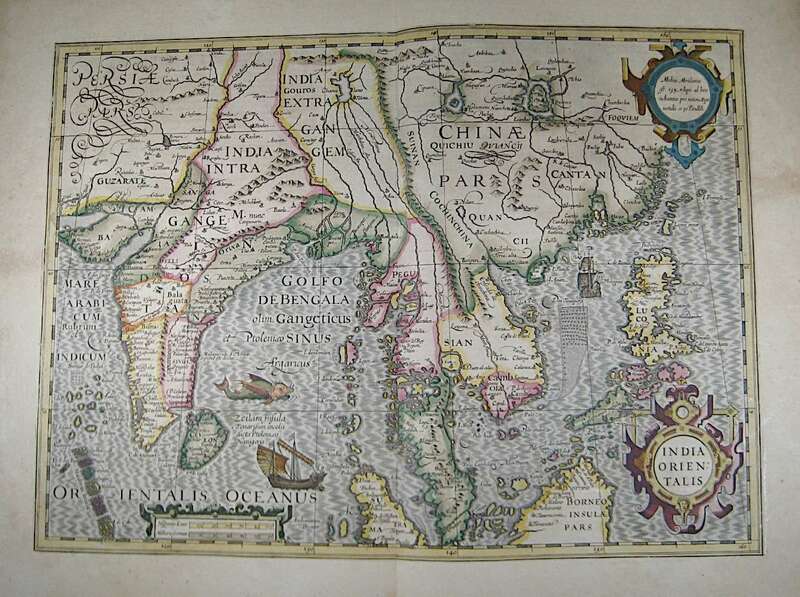 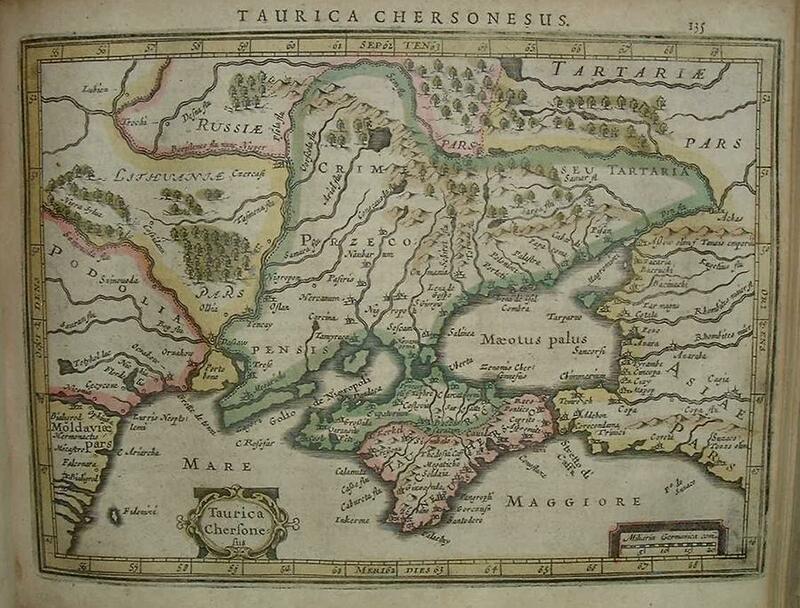 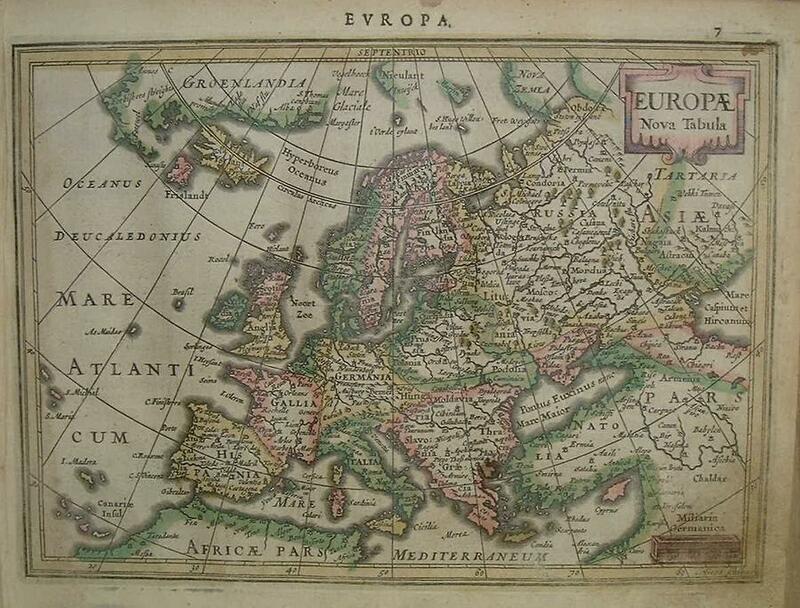 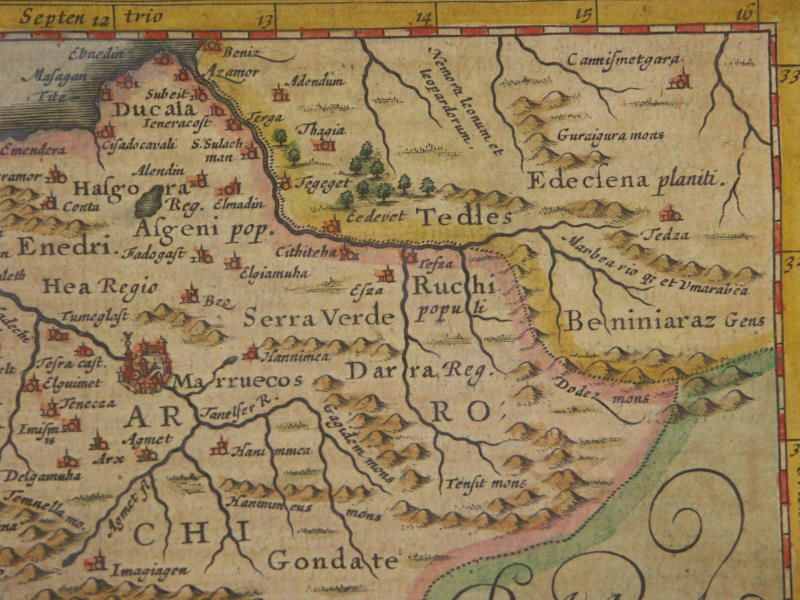 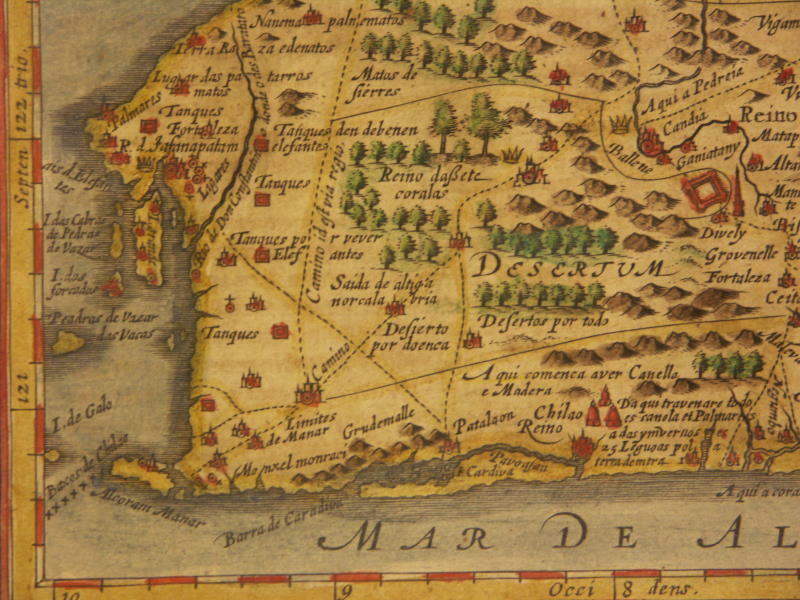 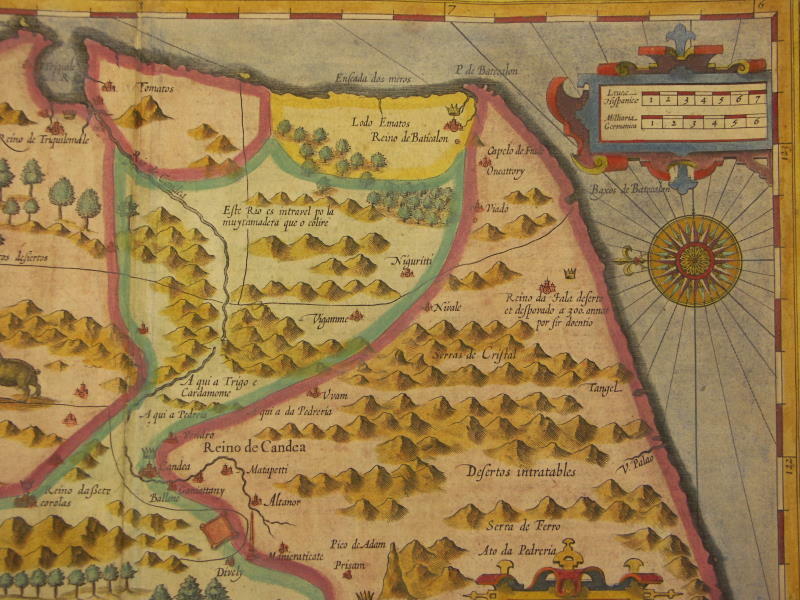 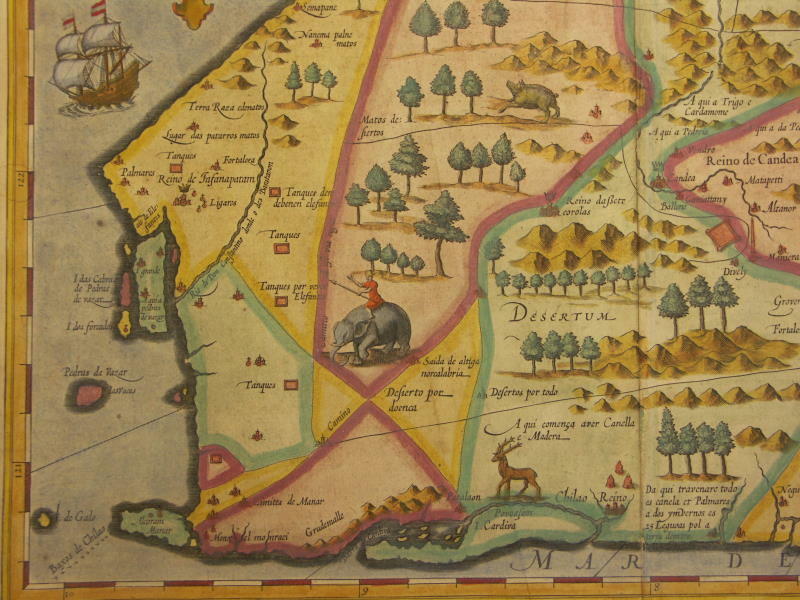 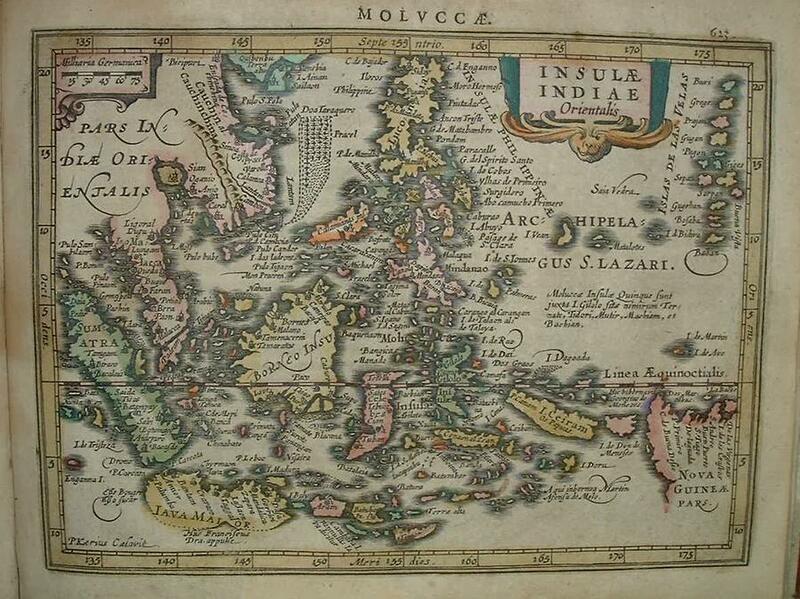 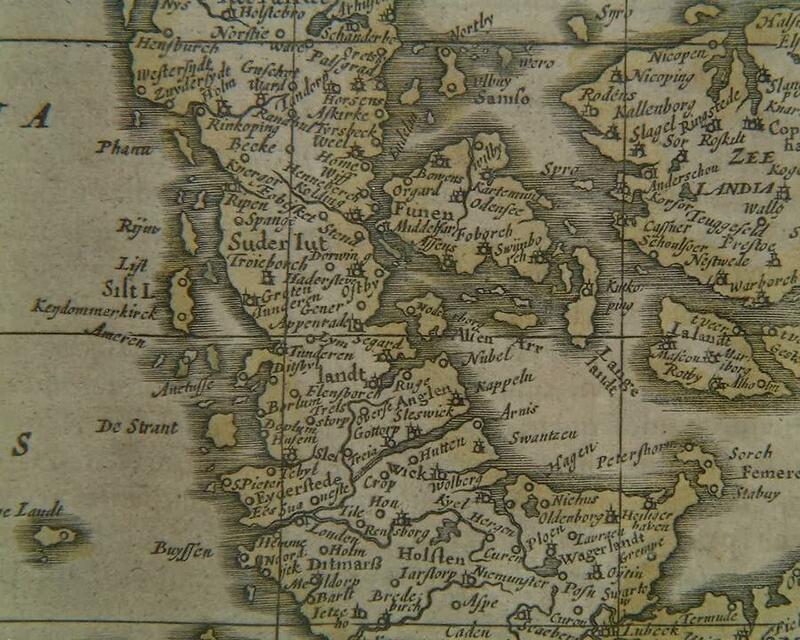 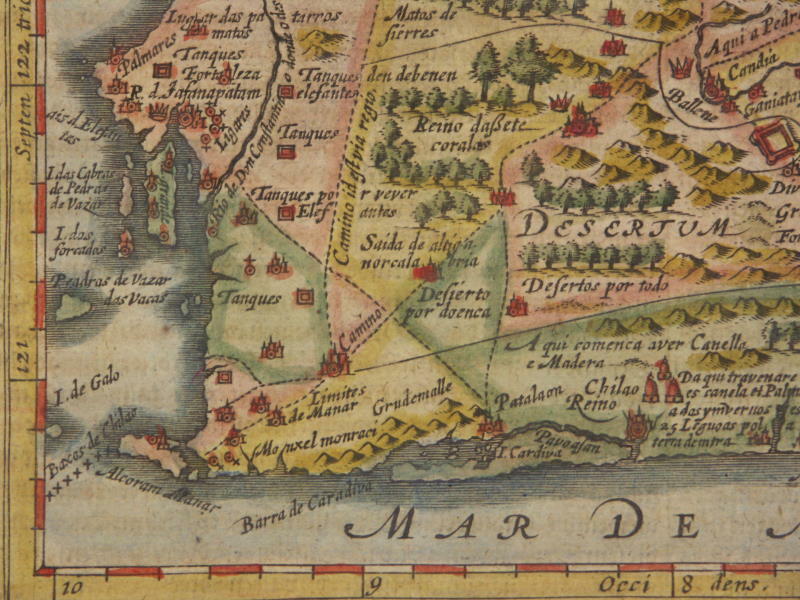 By the sale in 1604 of the plates for the maps, both of the Ptolemy edition and the Atlas, to Jodocus Hondius of Amsterdam, Mercator's work won its proper fame. 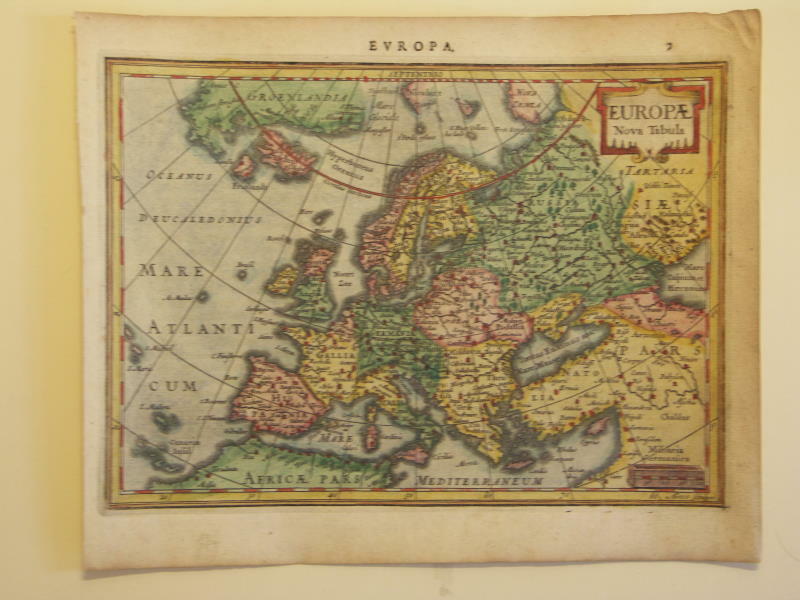 Shortly after the publication of the big folio-atlases (the Atlas, sive cosmographicae meditationes de fabrica mundi et fabricat figura 1585-9, and the edition of Ptolemy's Geographia 1578) the need was apparently felt for a smaller-sized atlas, one that would be handier and, above all cheaper, so that a larger public might have access to the use of maps. 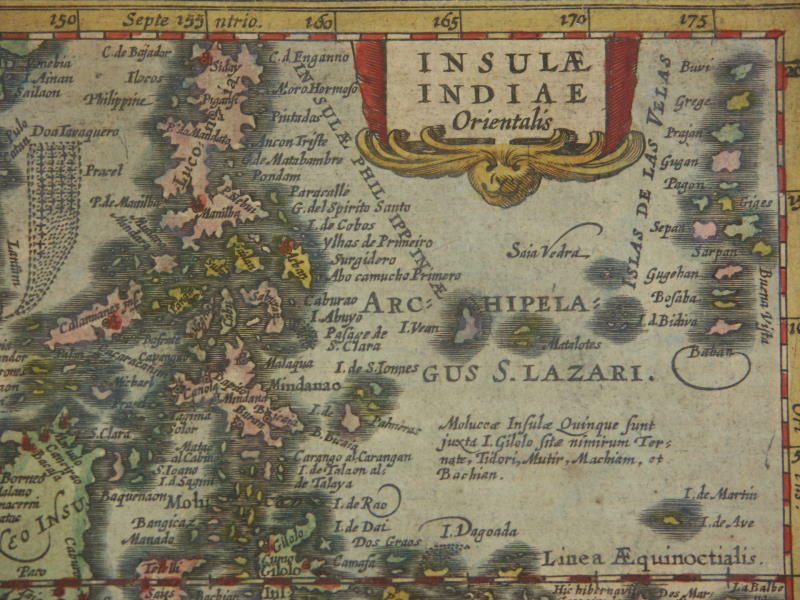 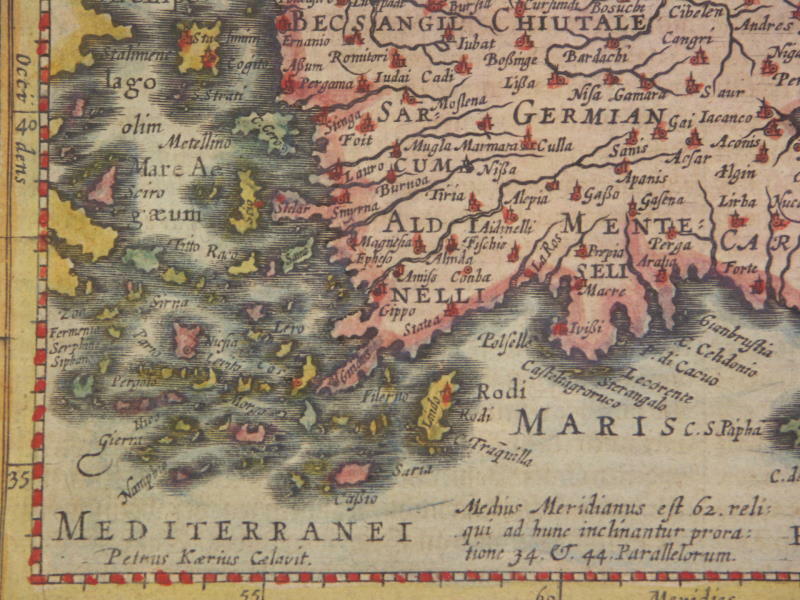 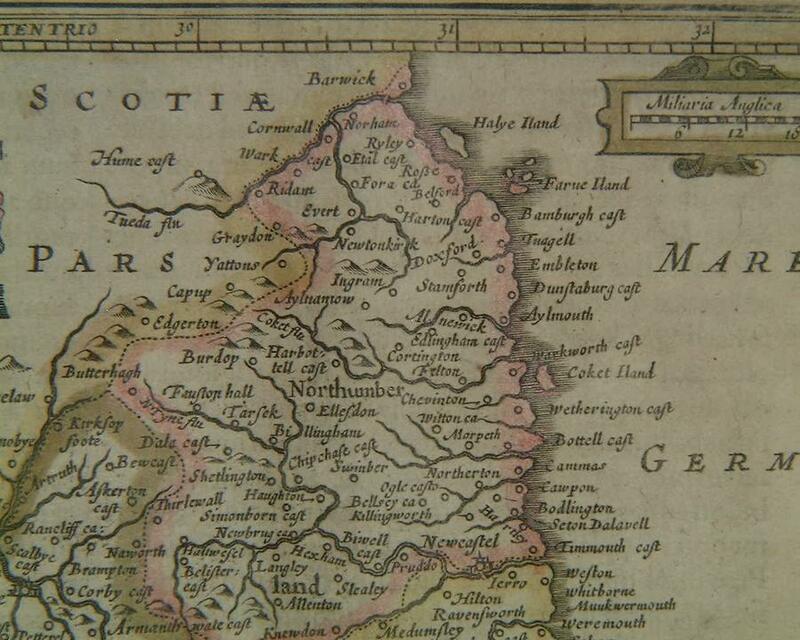 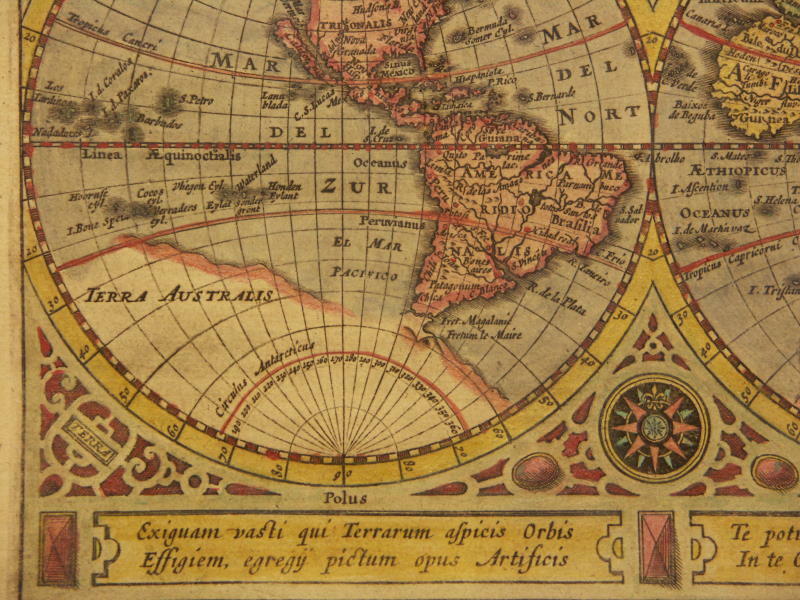 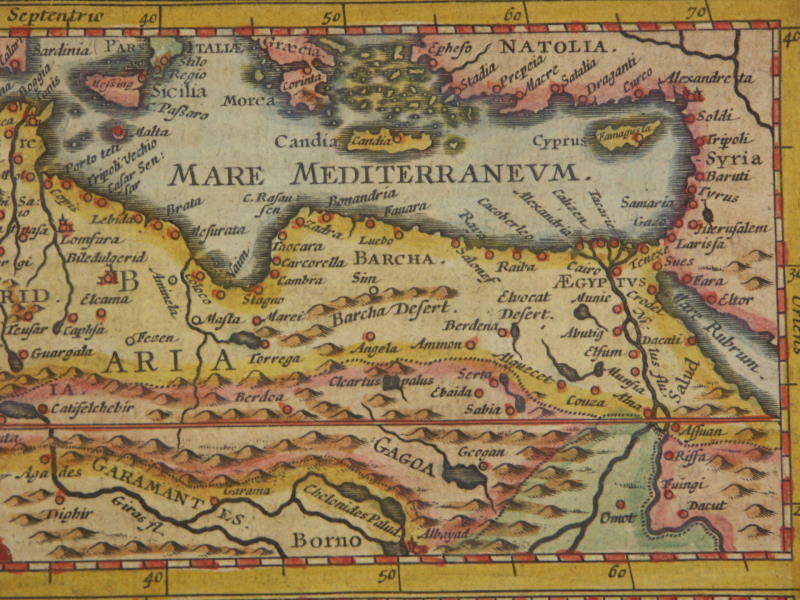 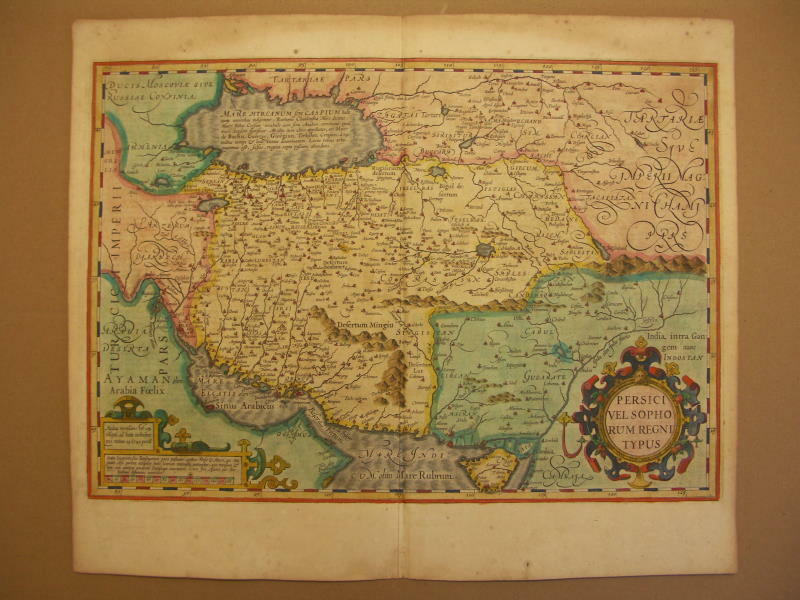 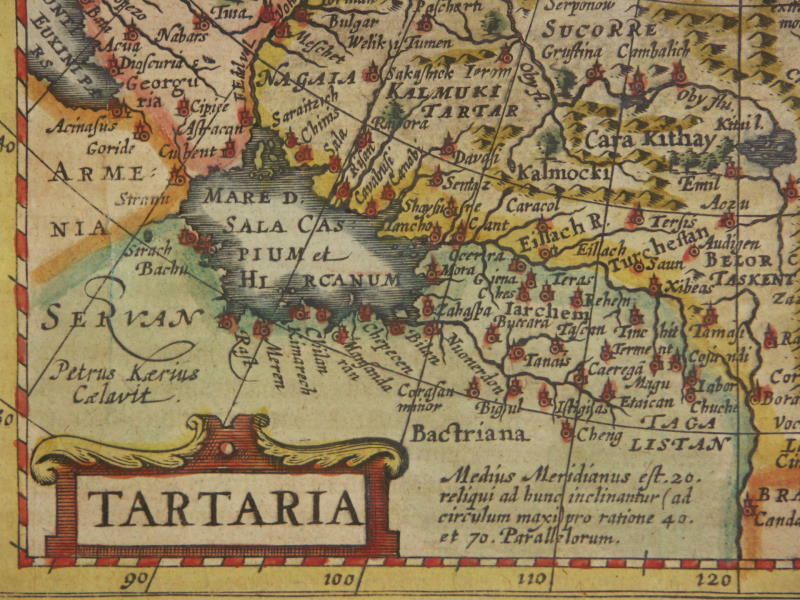 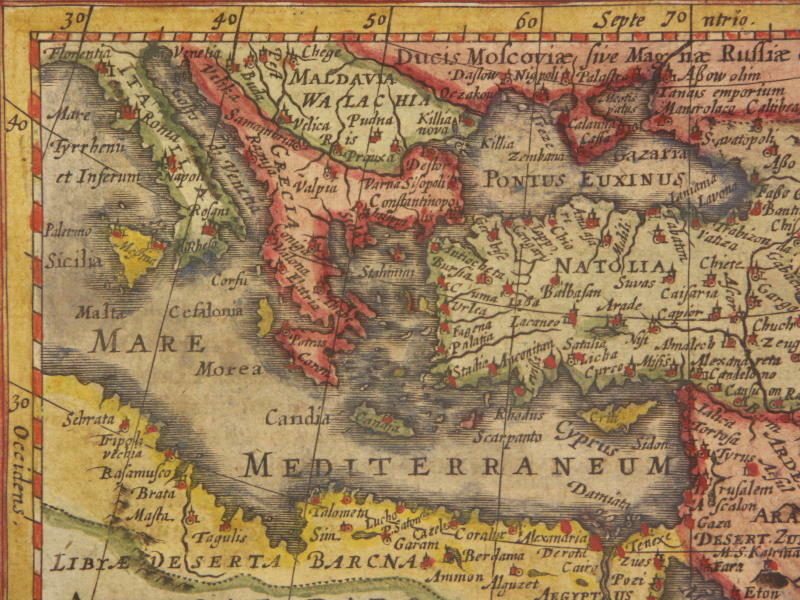 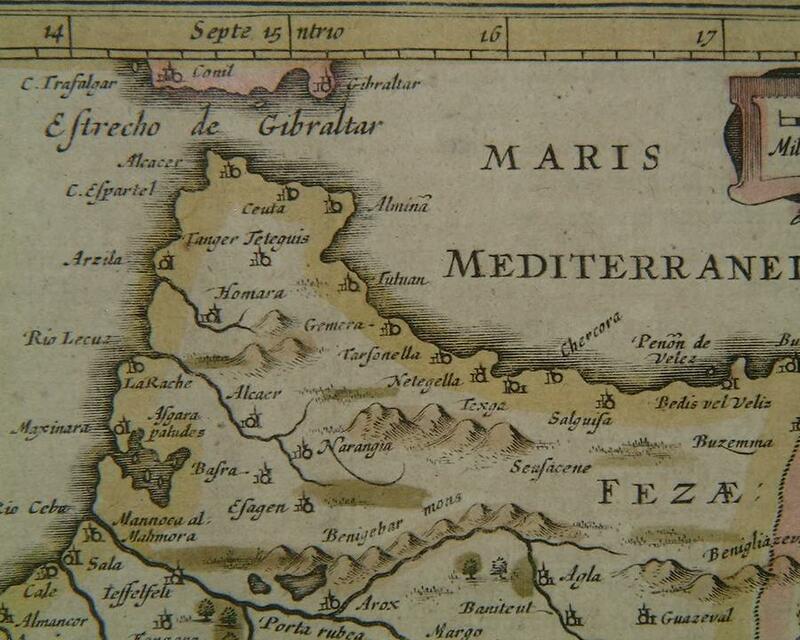 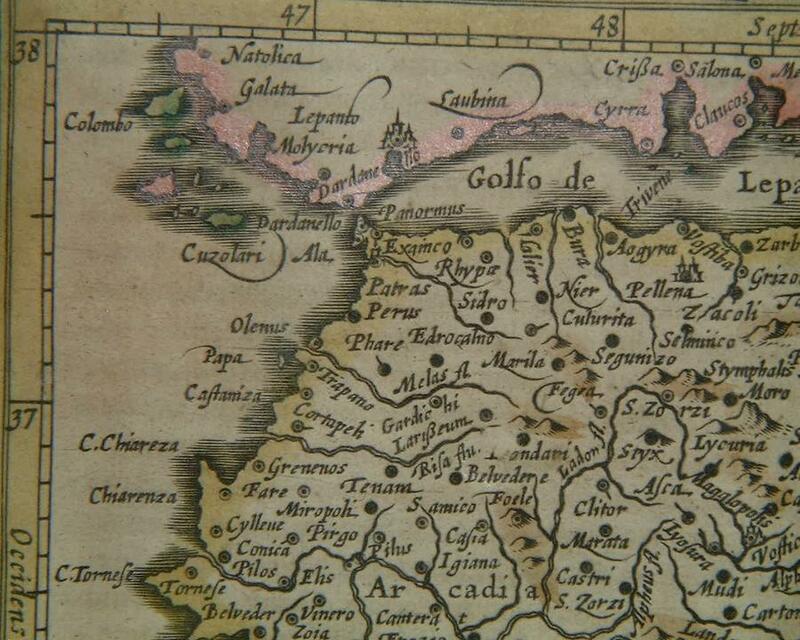 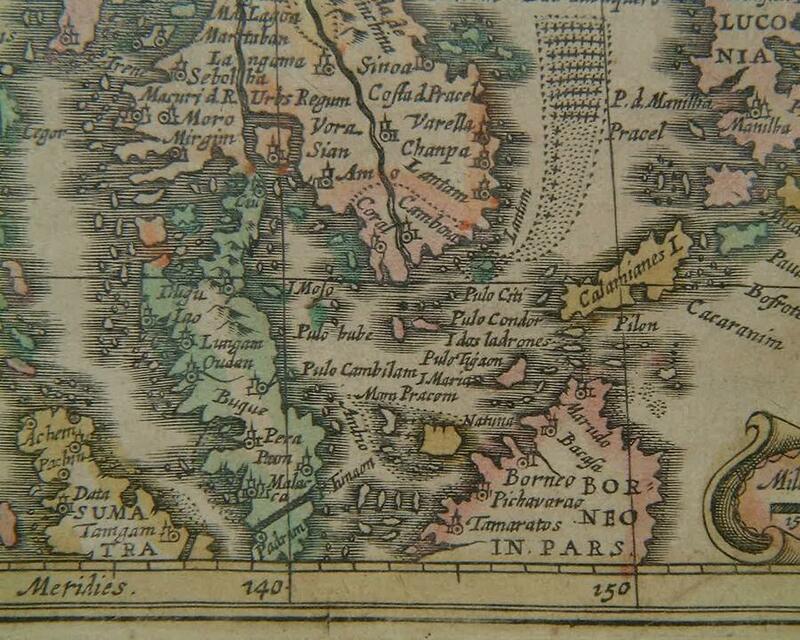 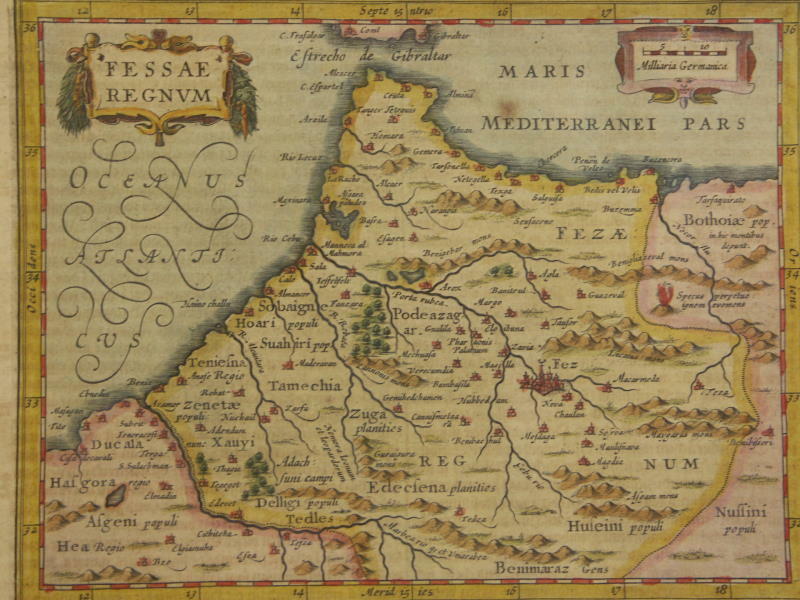 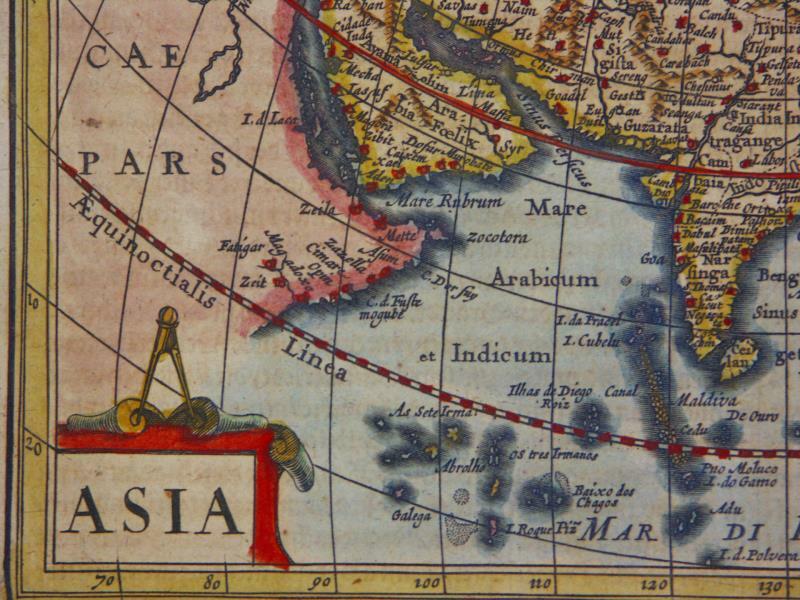 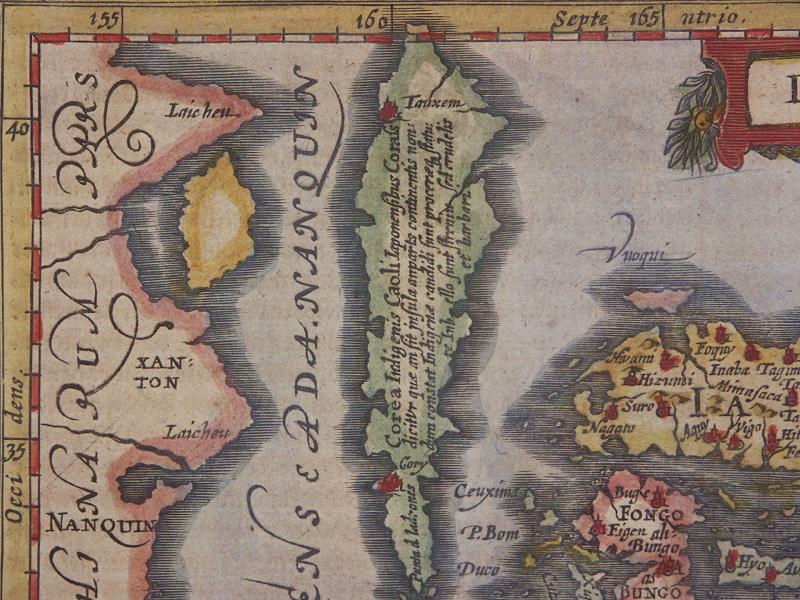 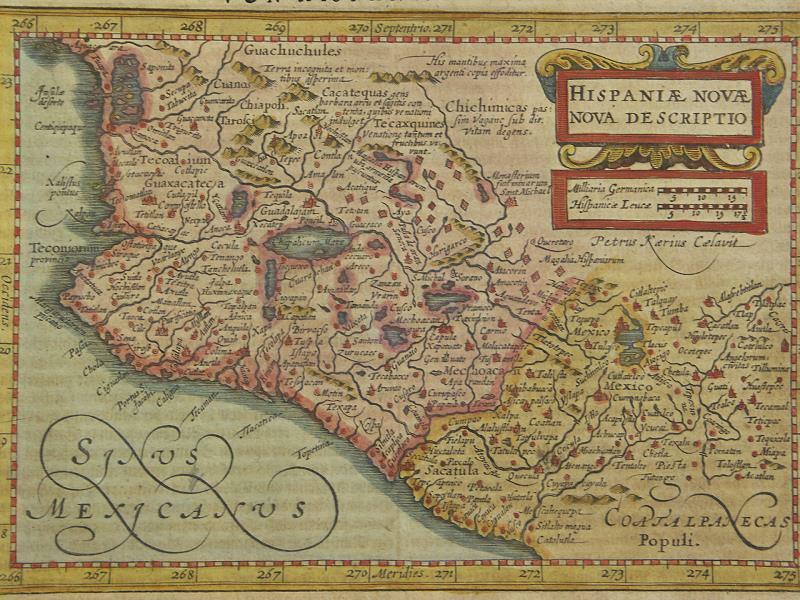 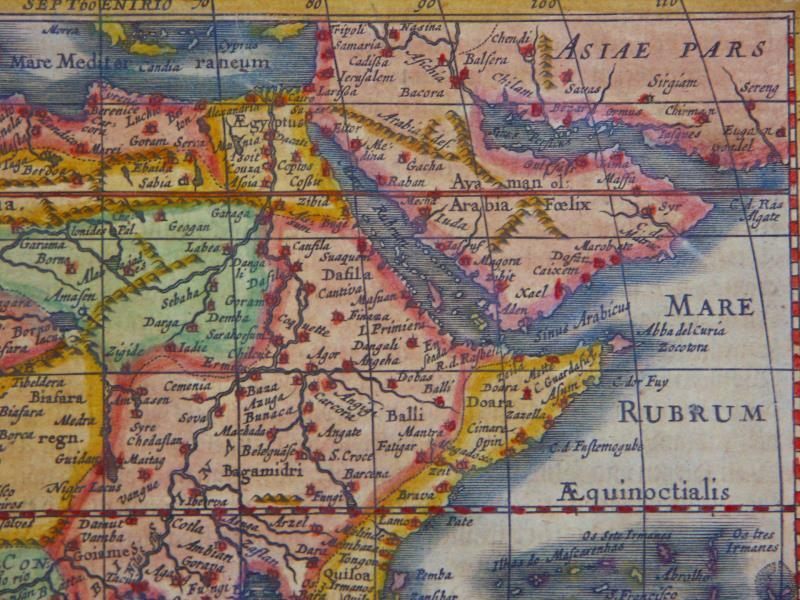 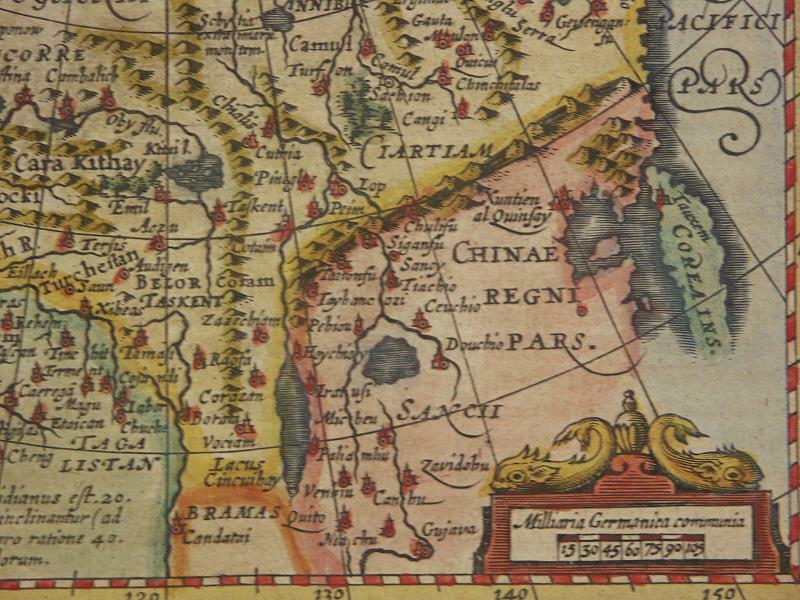 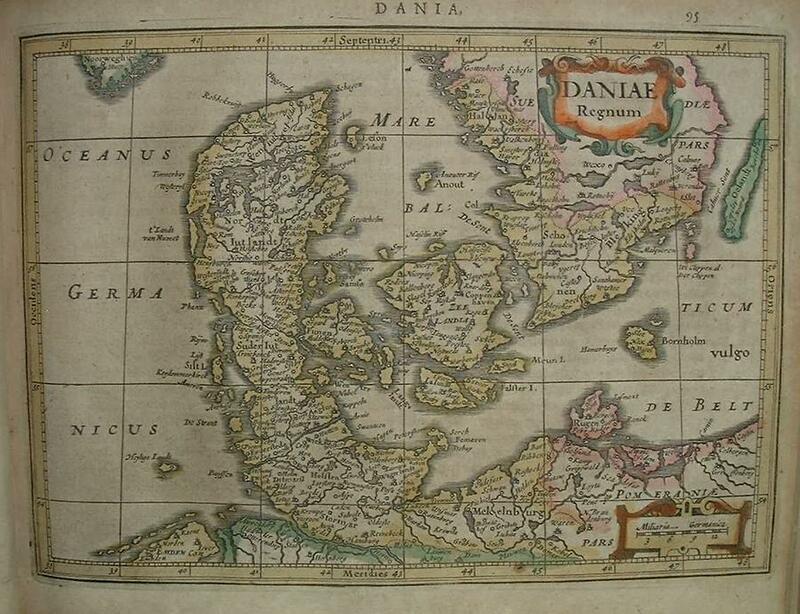 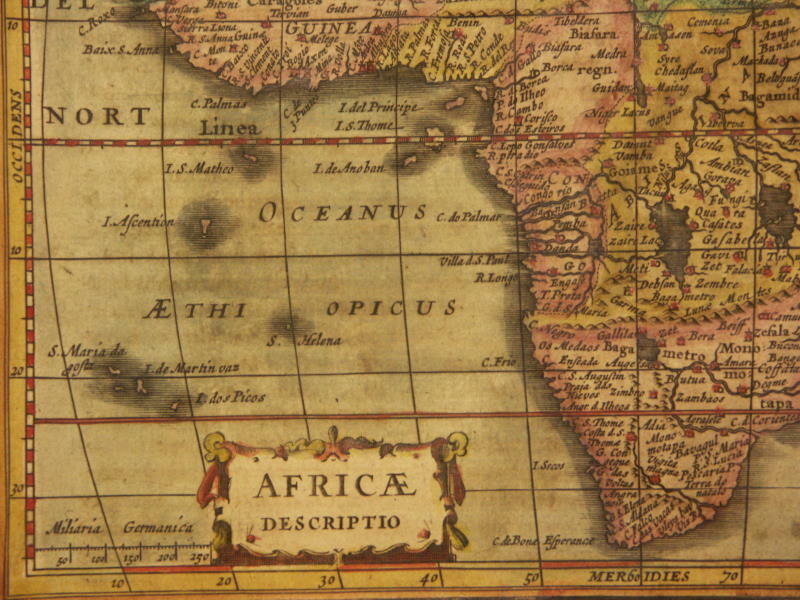 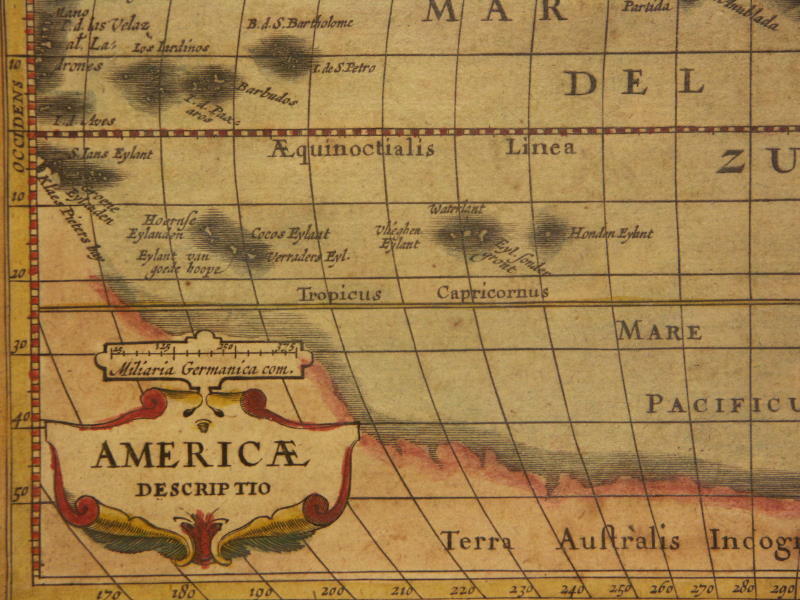 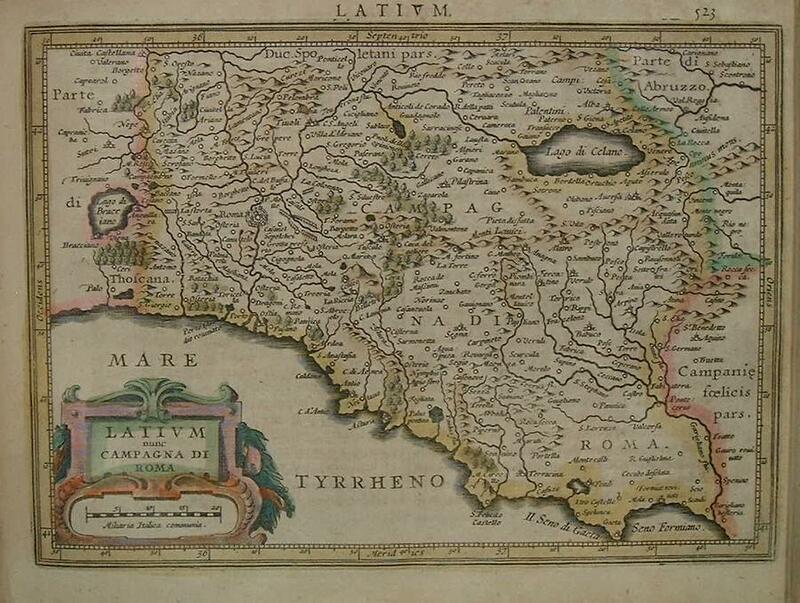 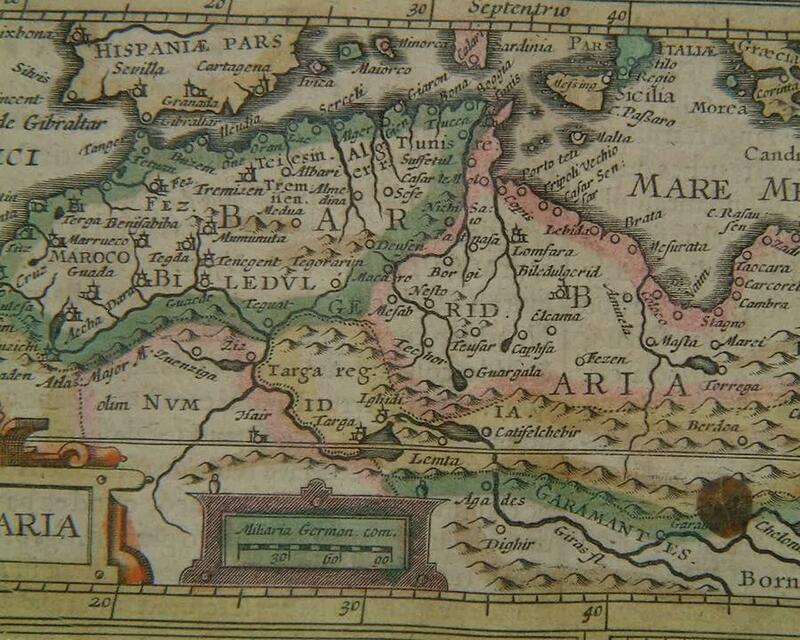 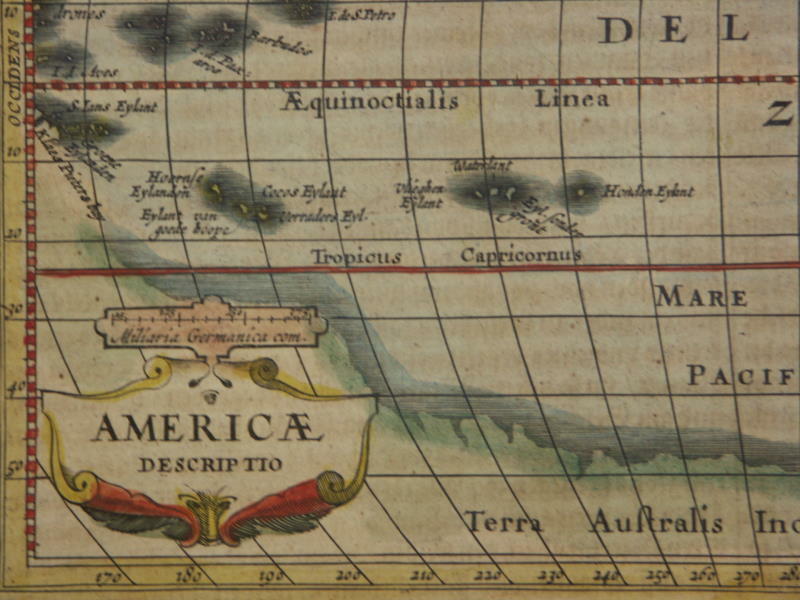 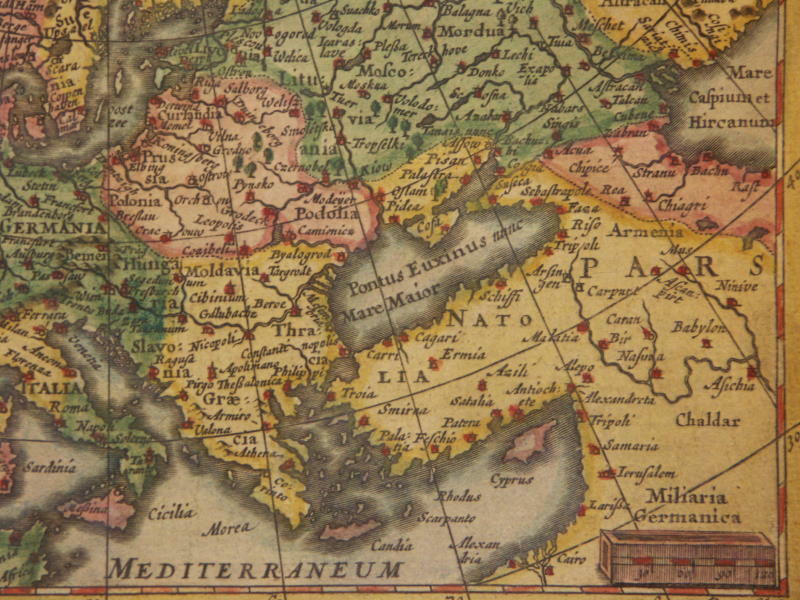 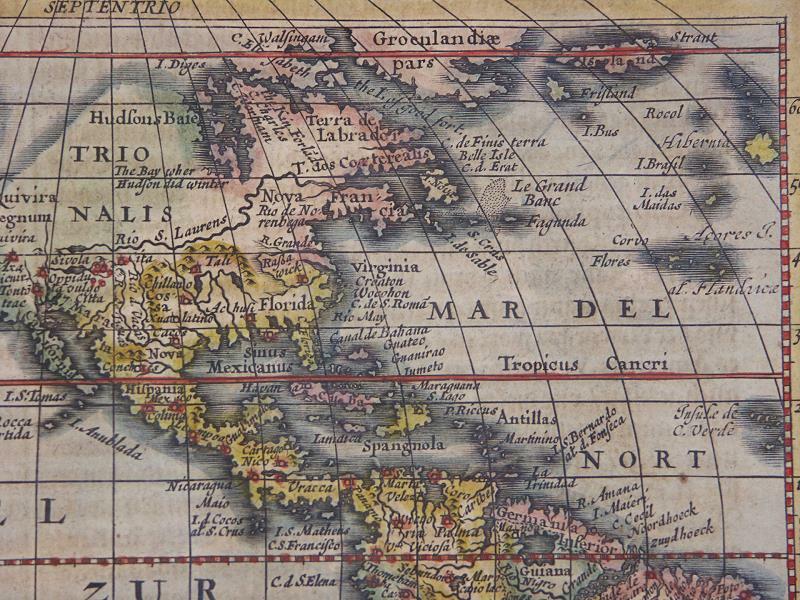 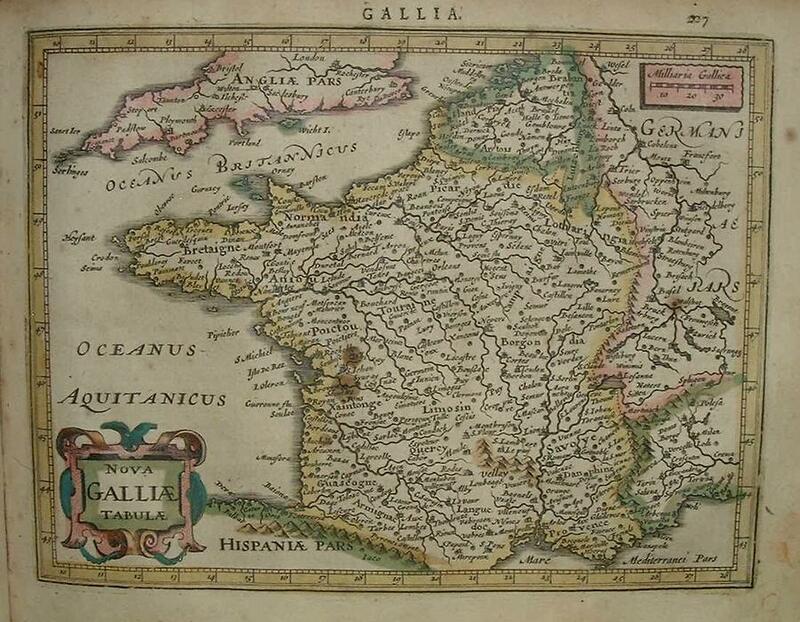 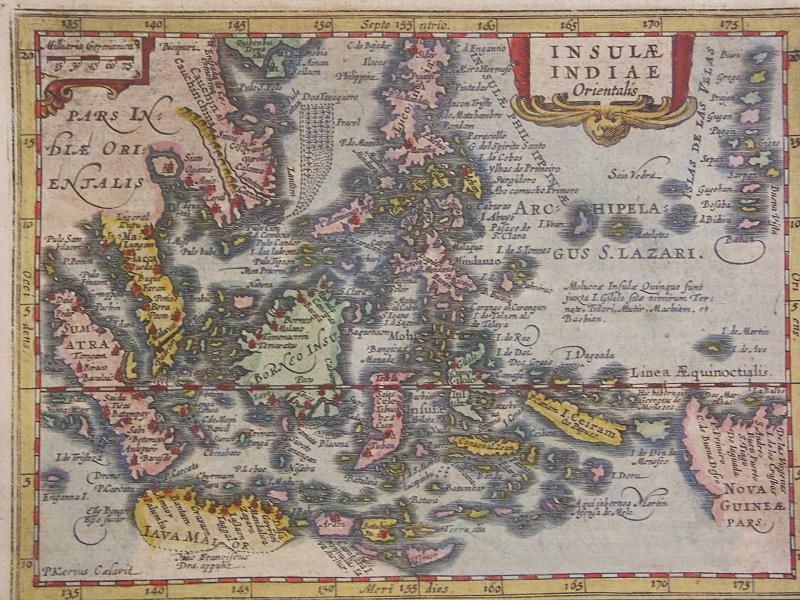 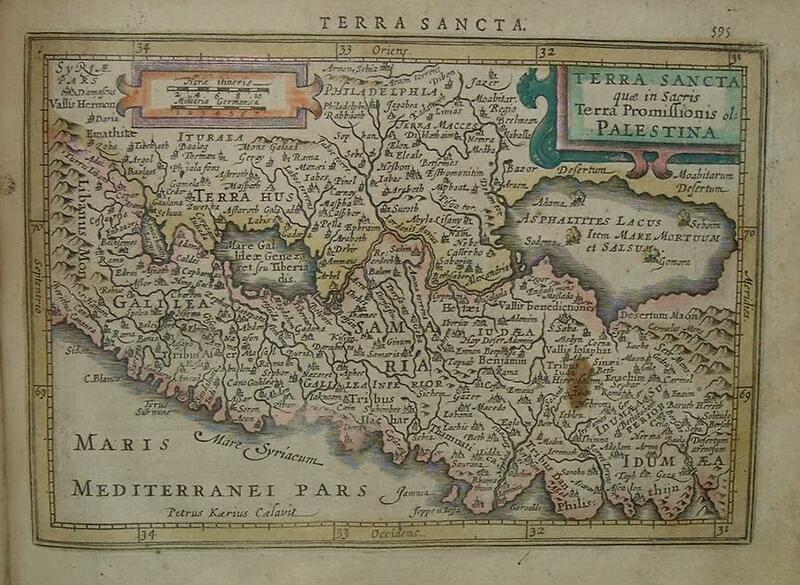 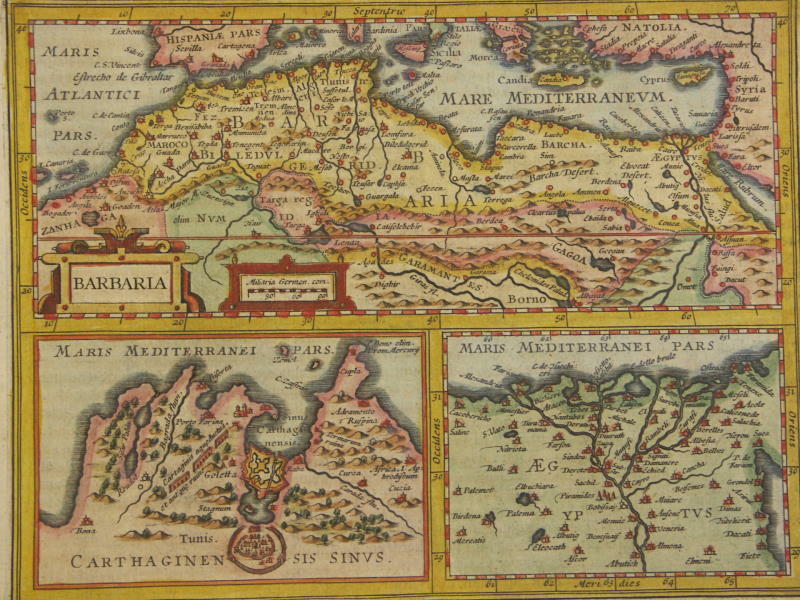 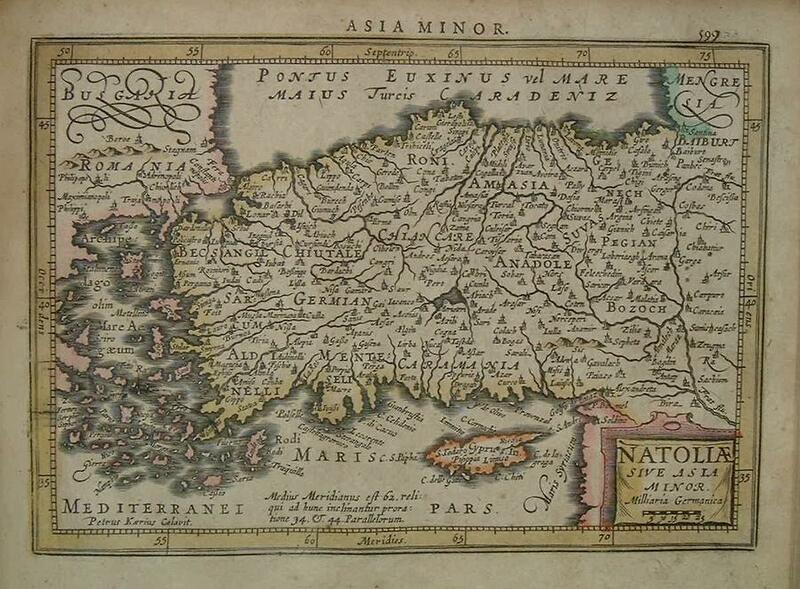 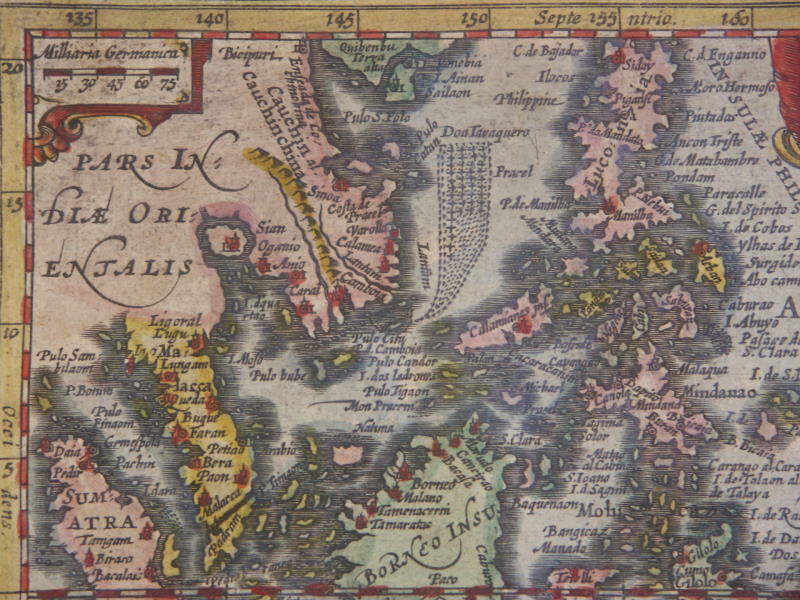 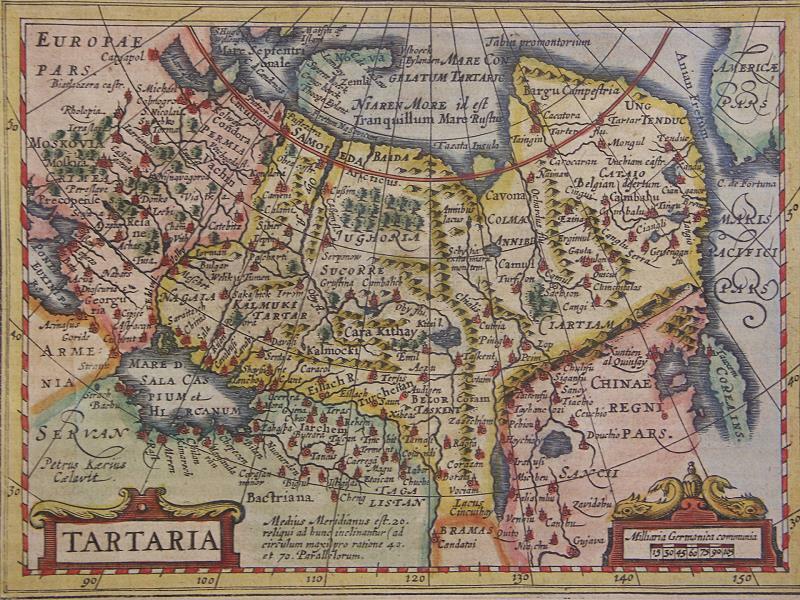 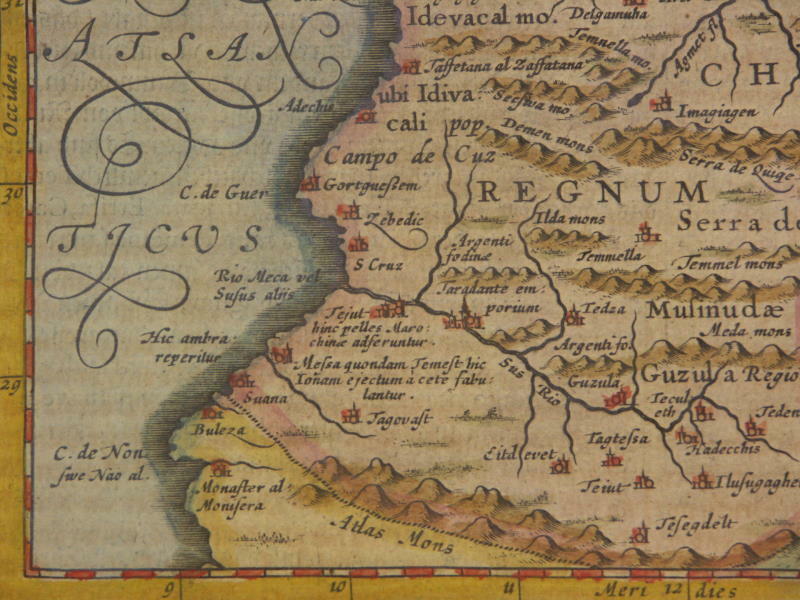 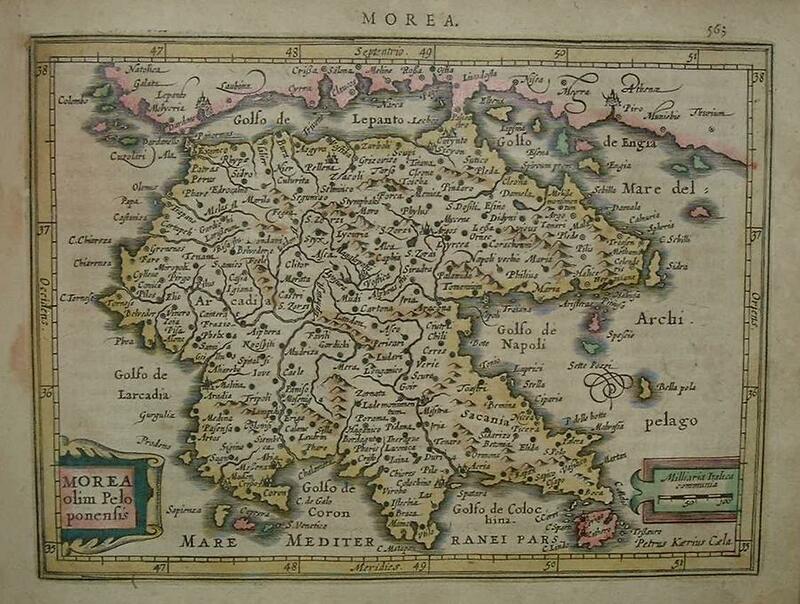 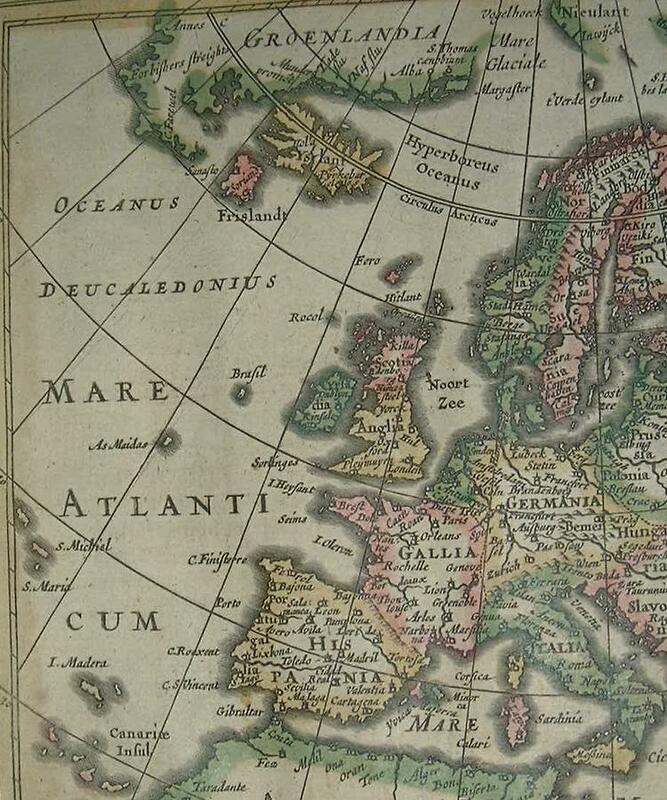 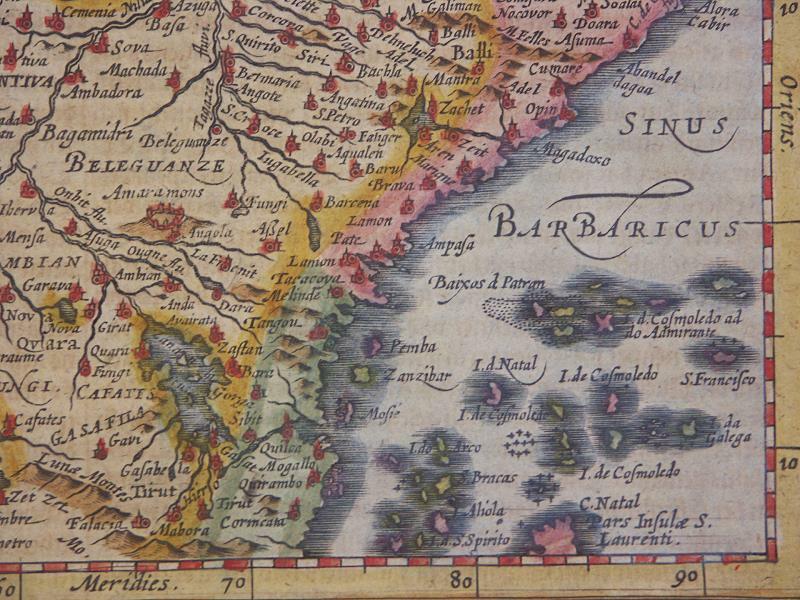 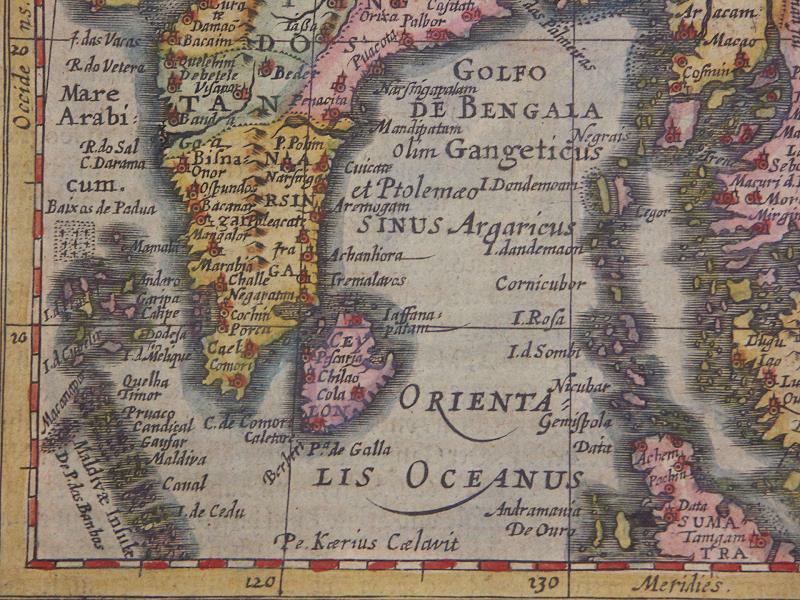 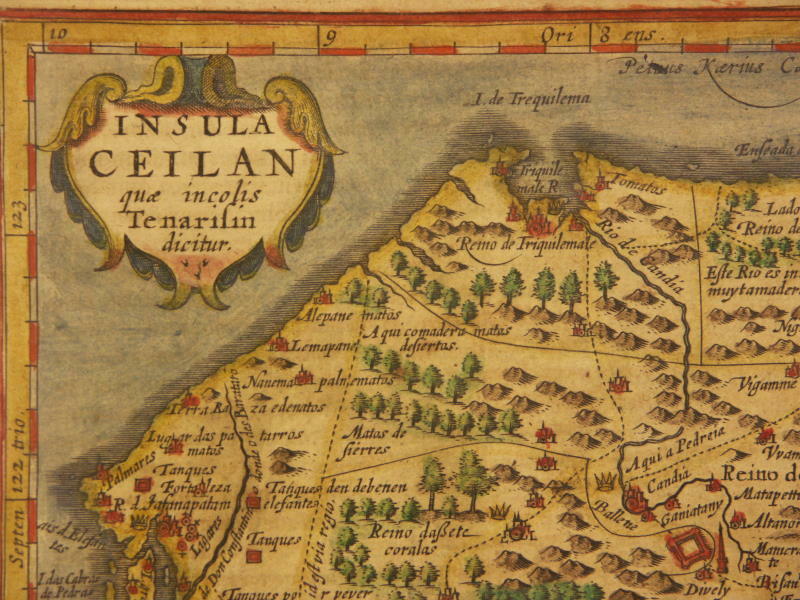 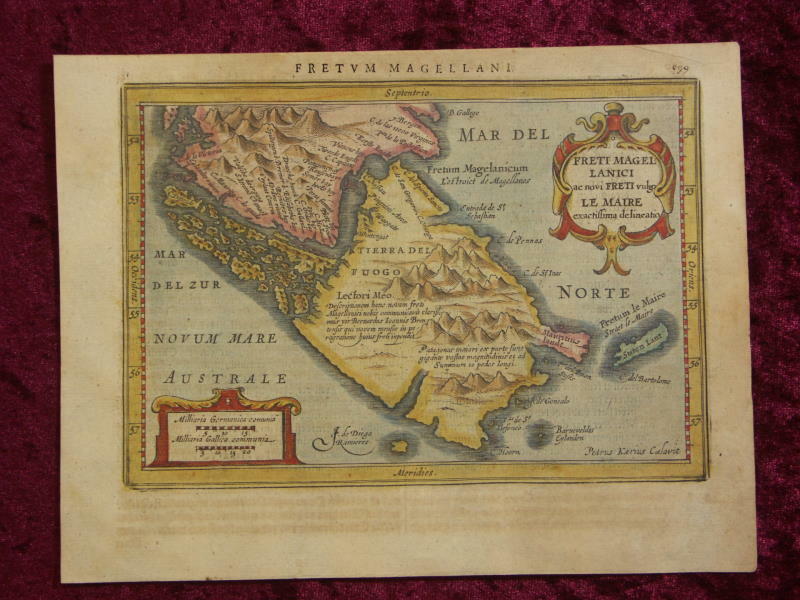 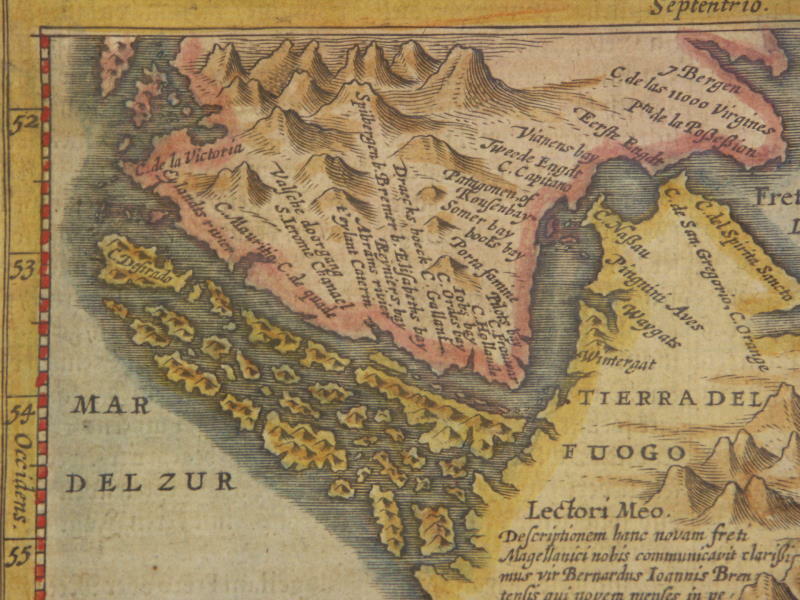 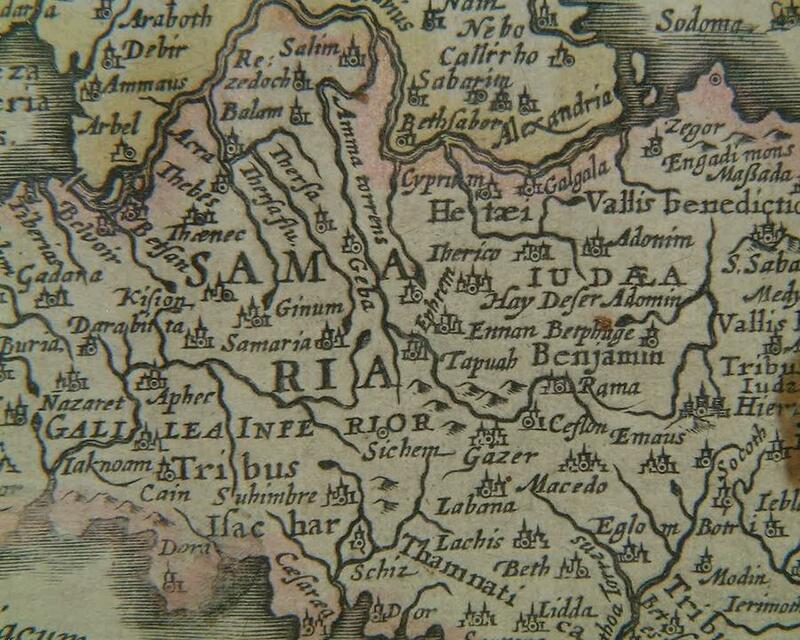 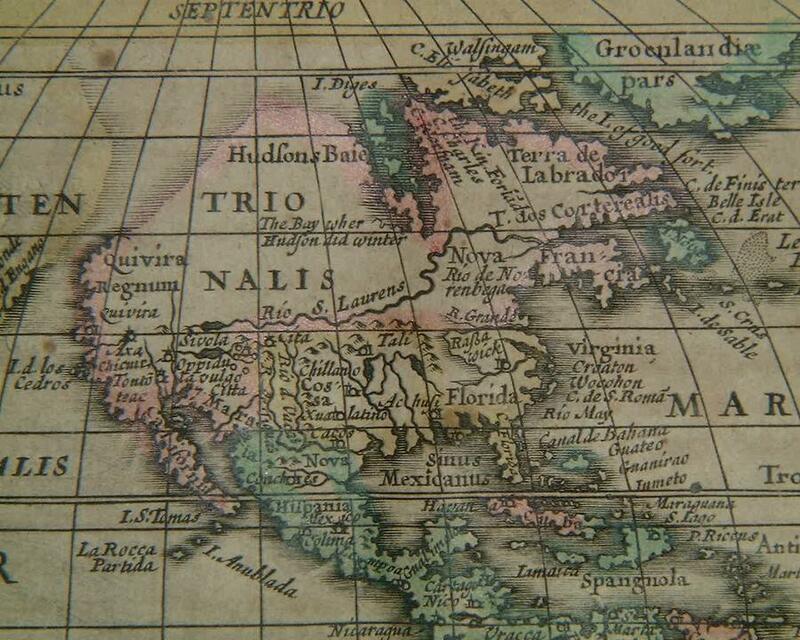 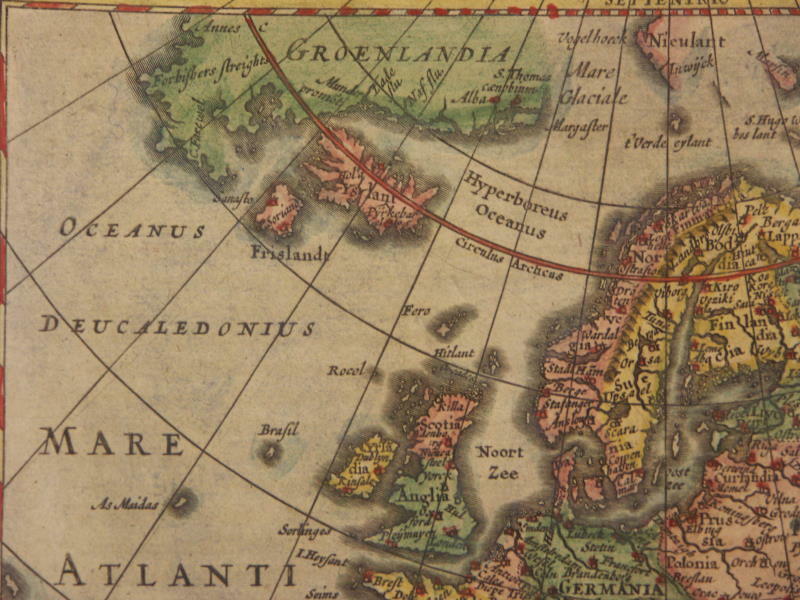 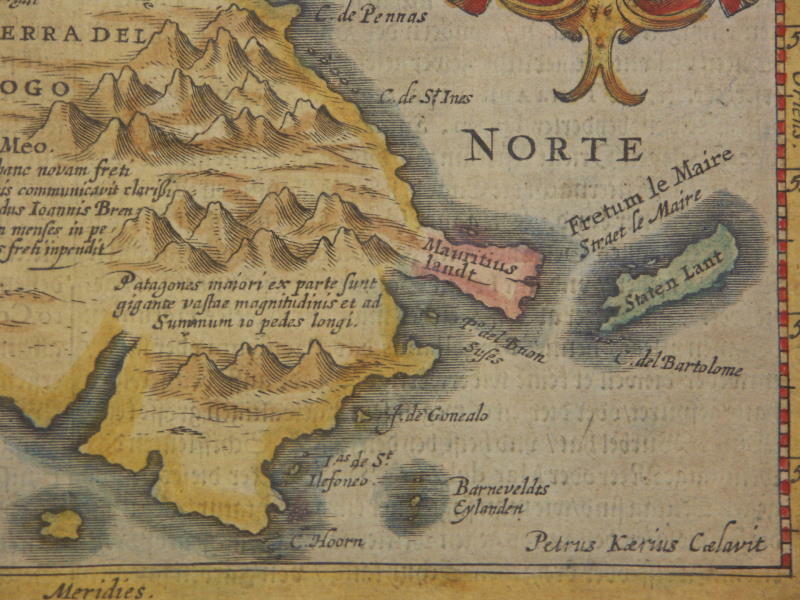 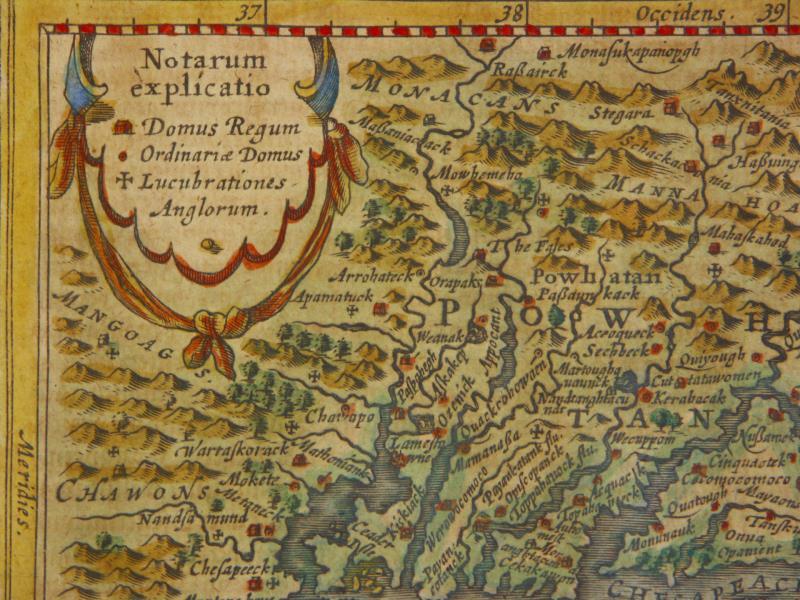 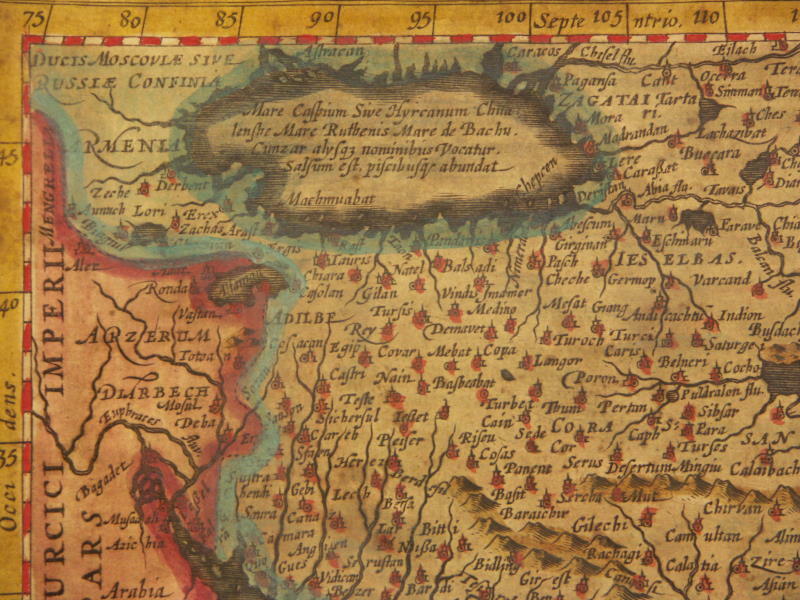 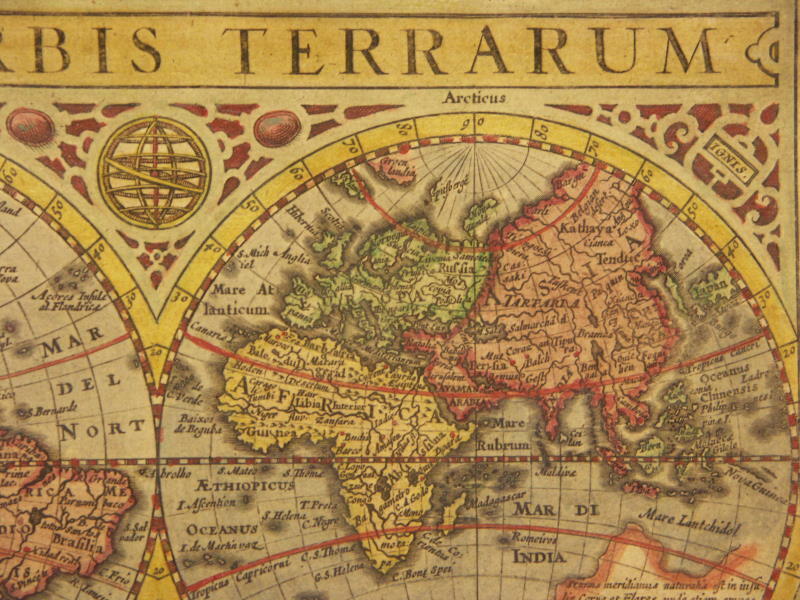 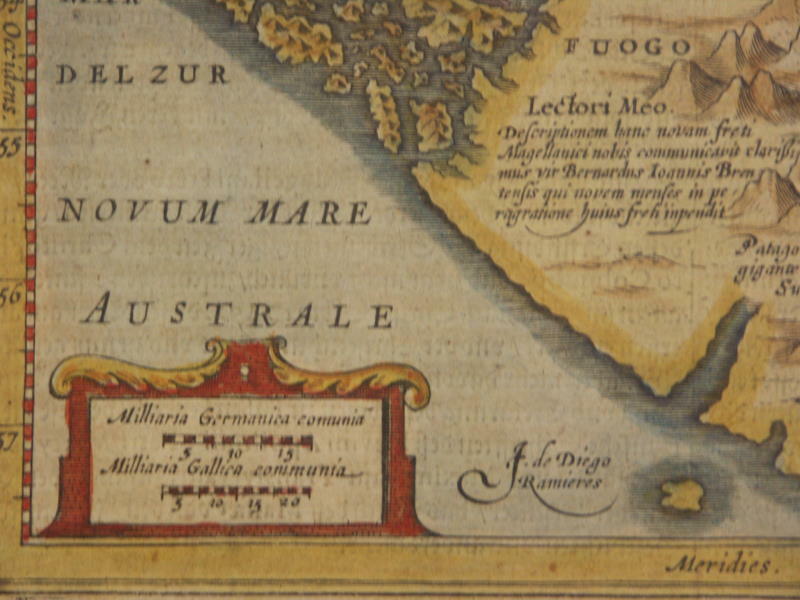 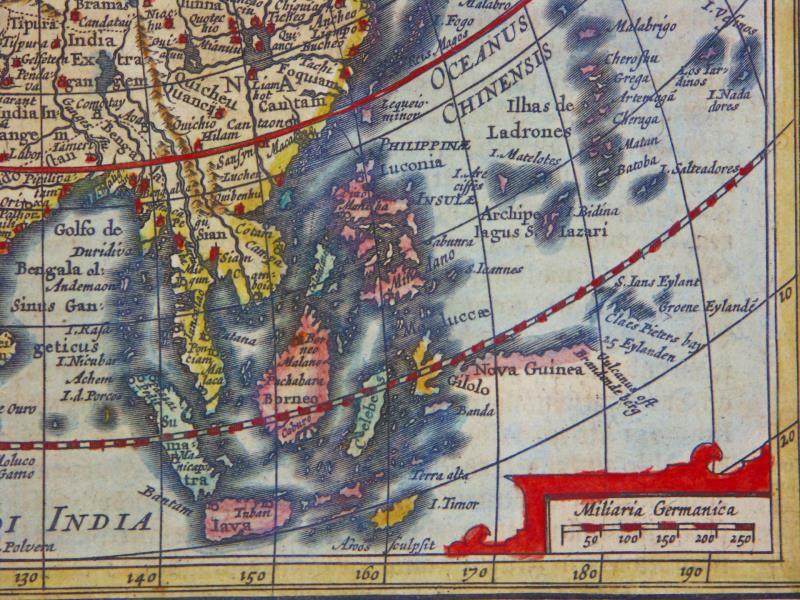 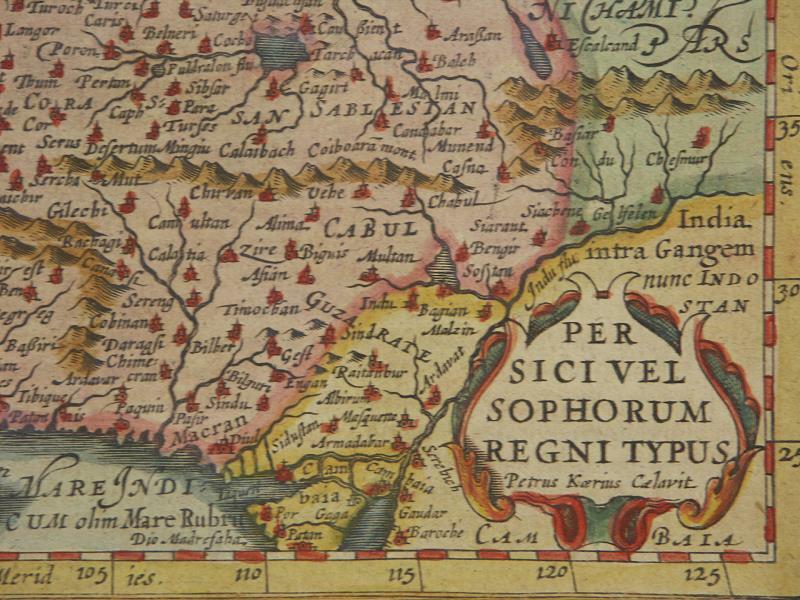 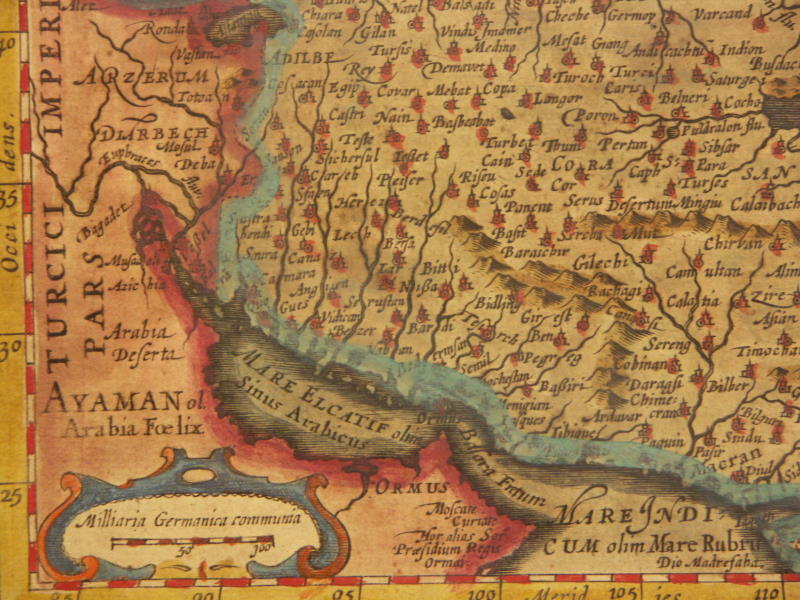 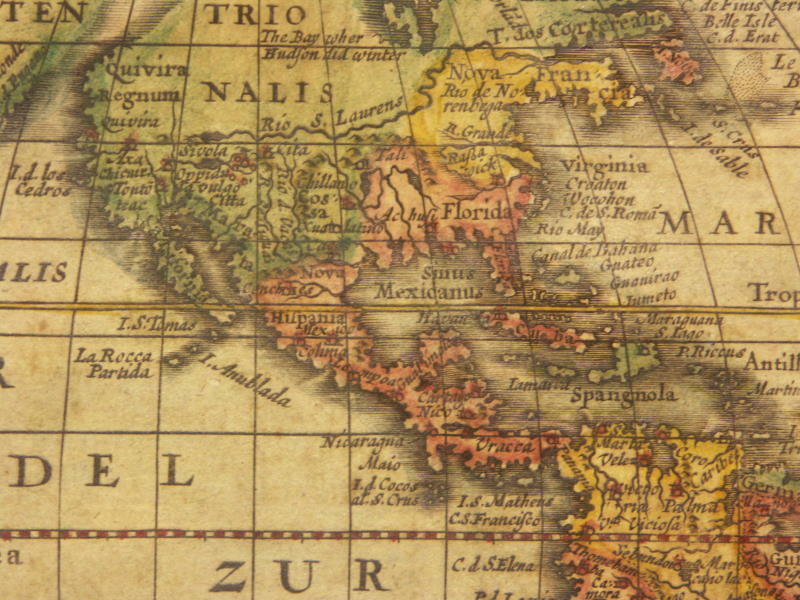 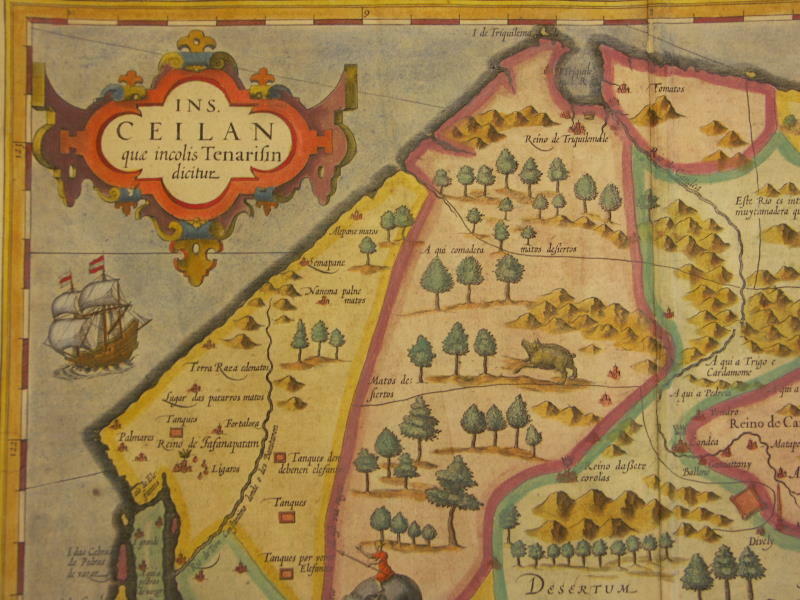 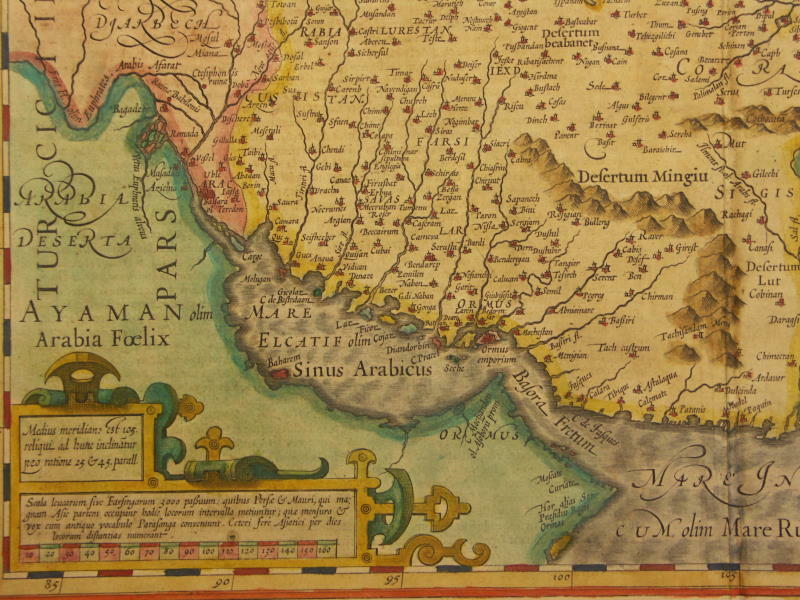 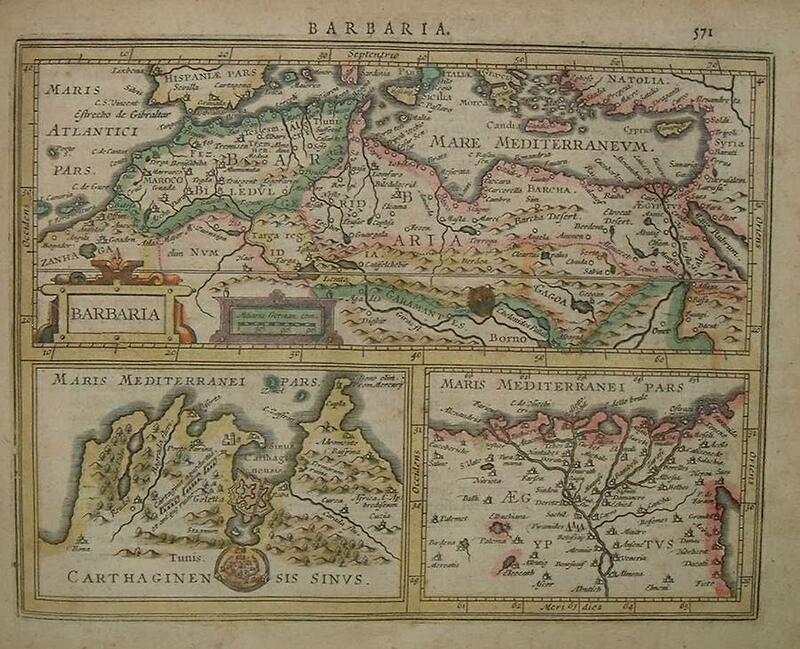 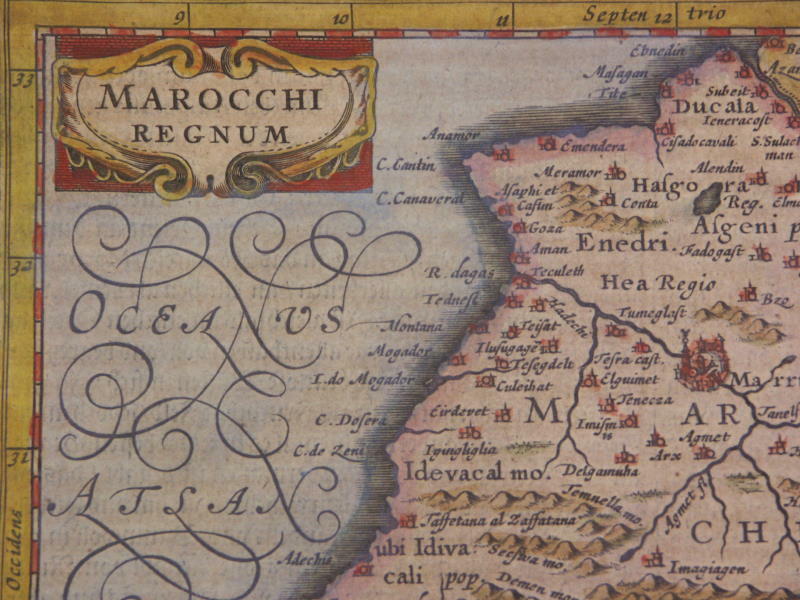 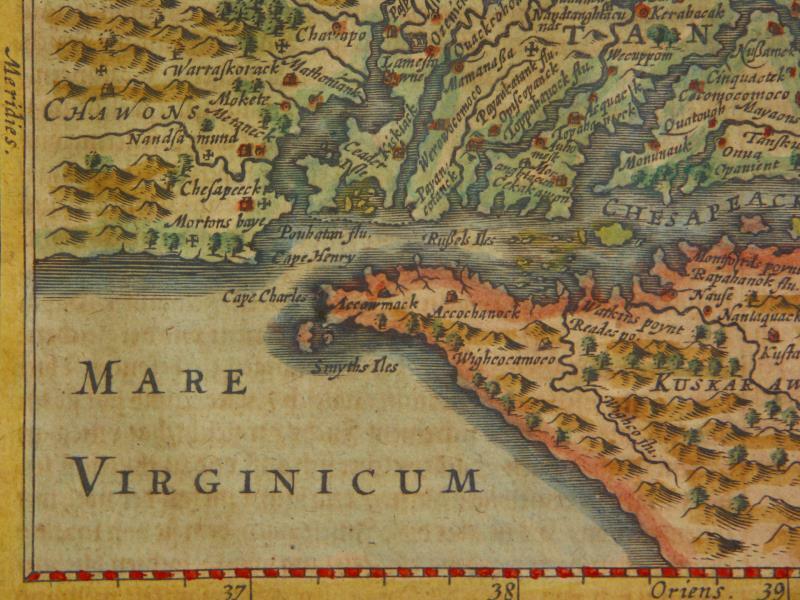 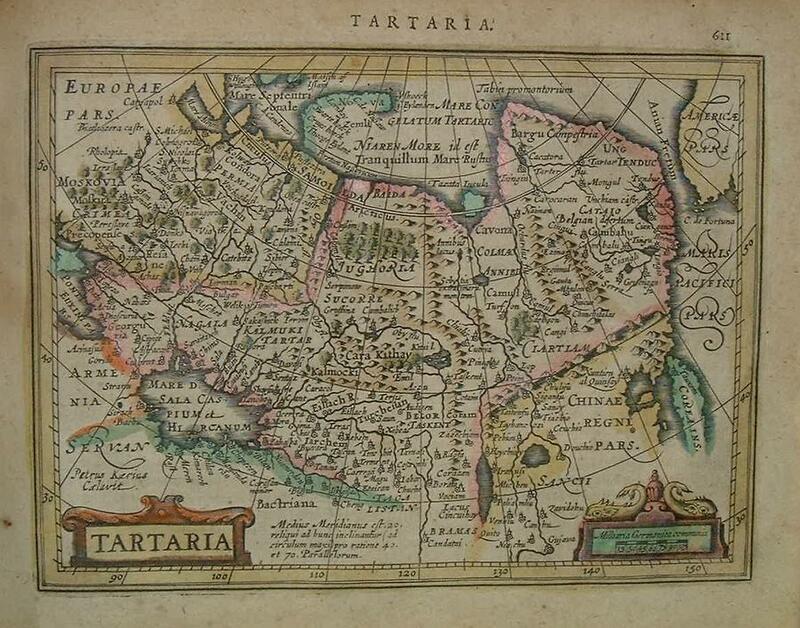 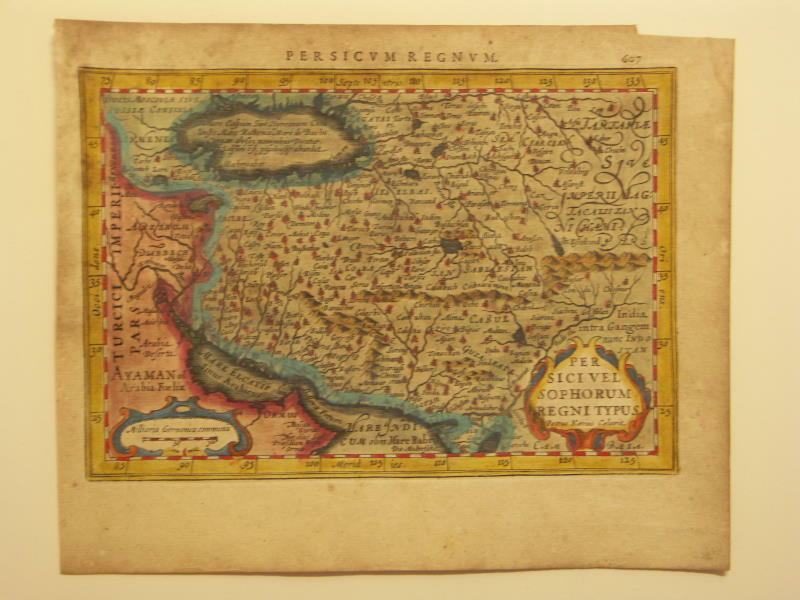 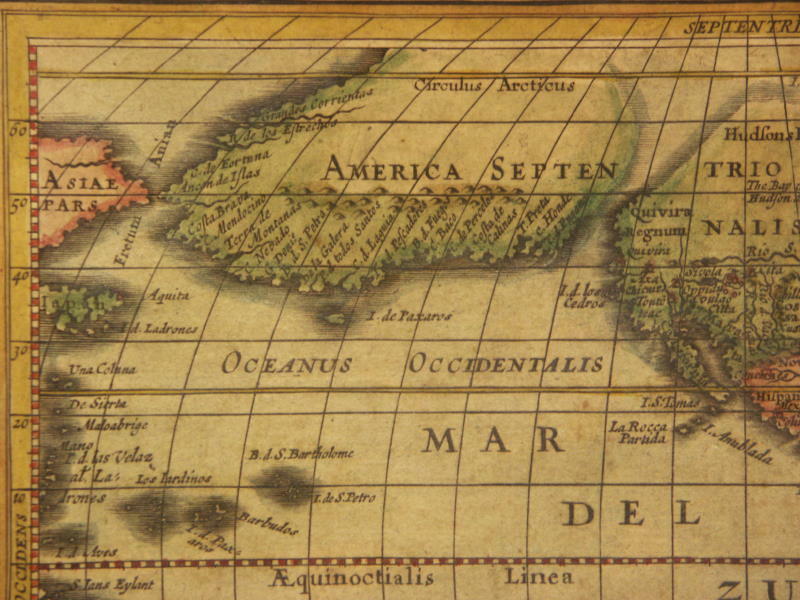 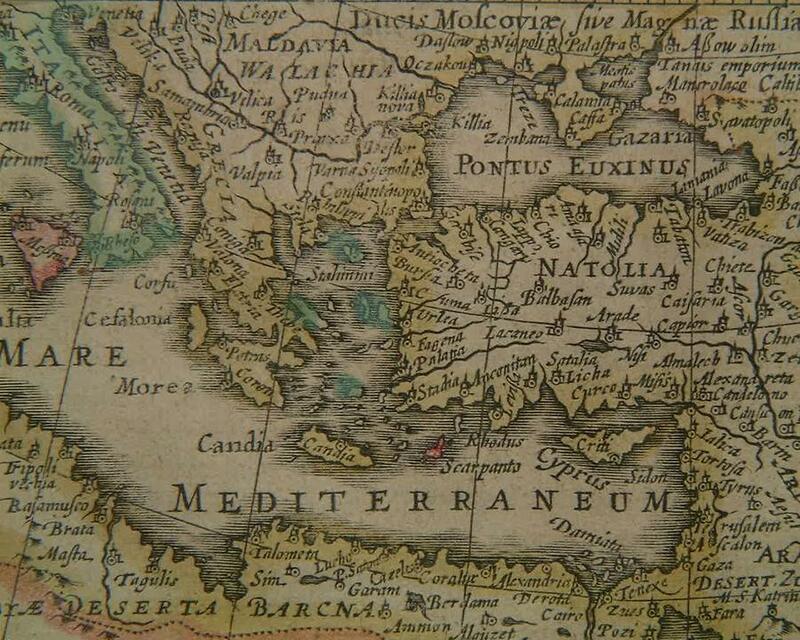 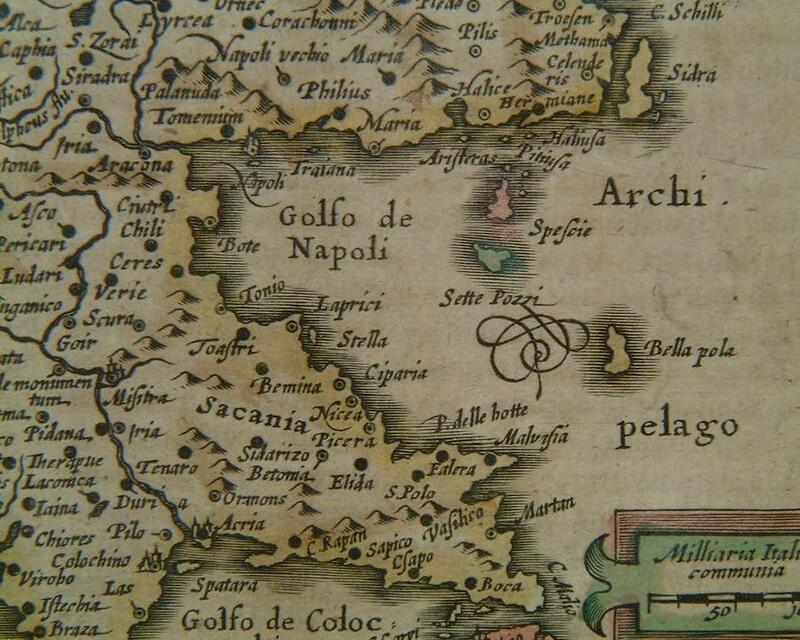 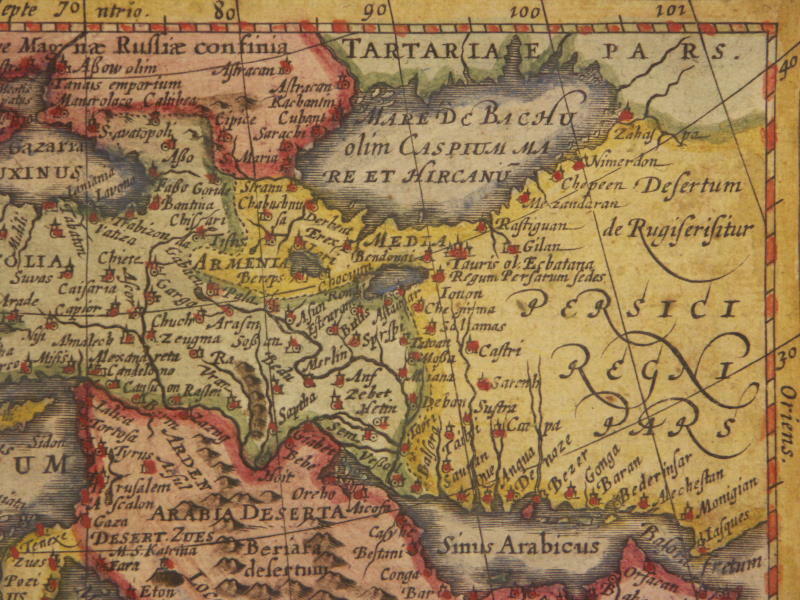 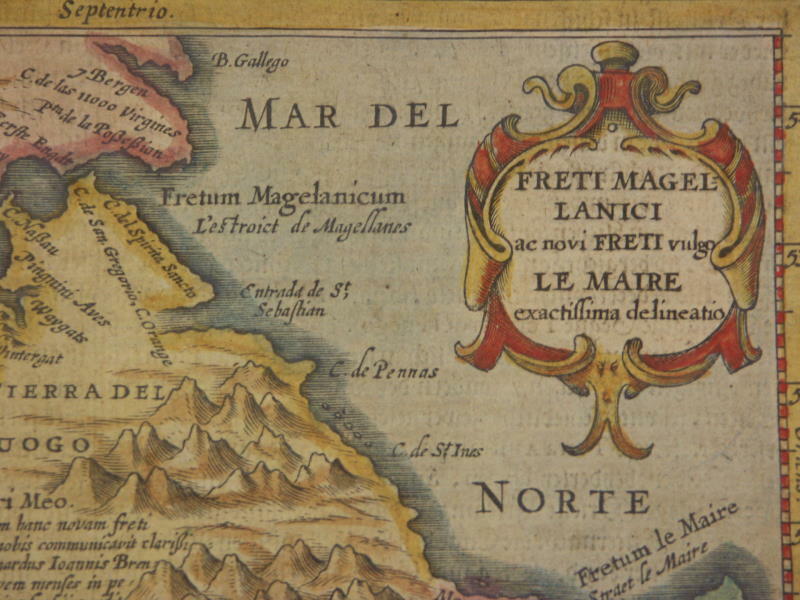 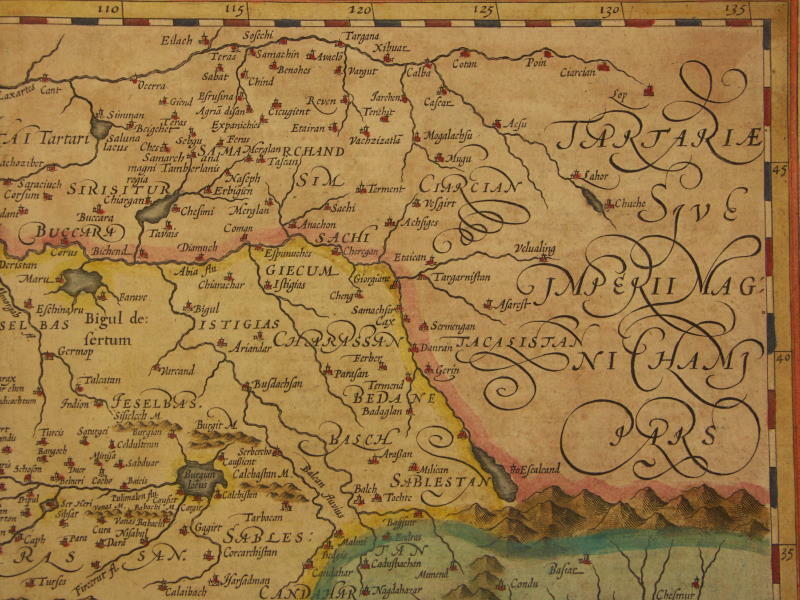 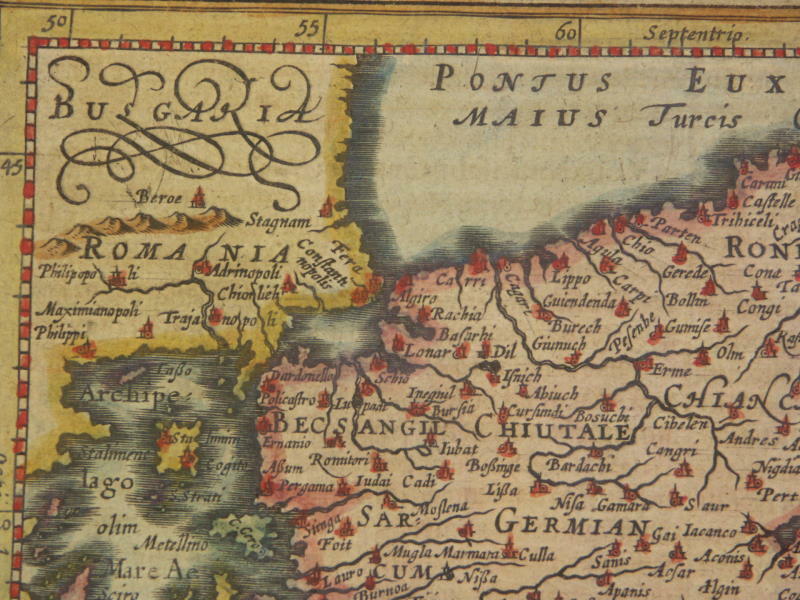 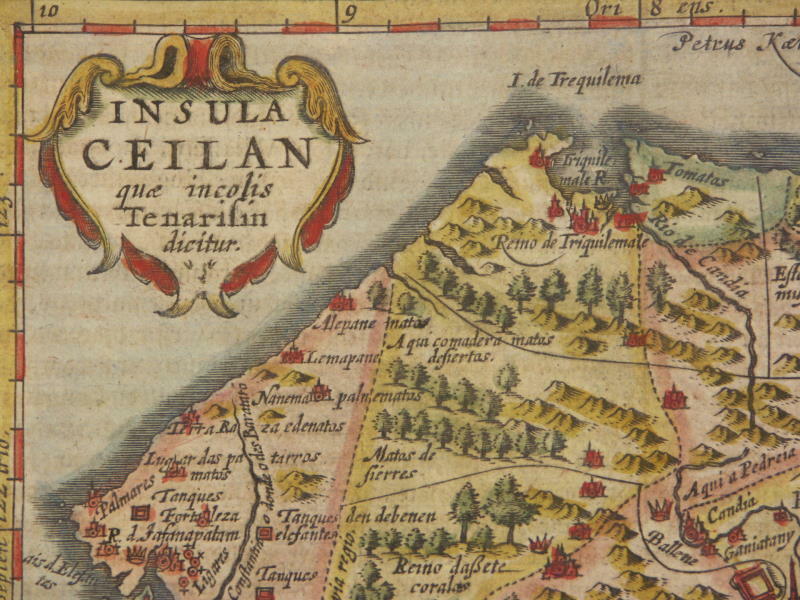 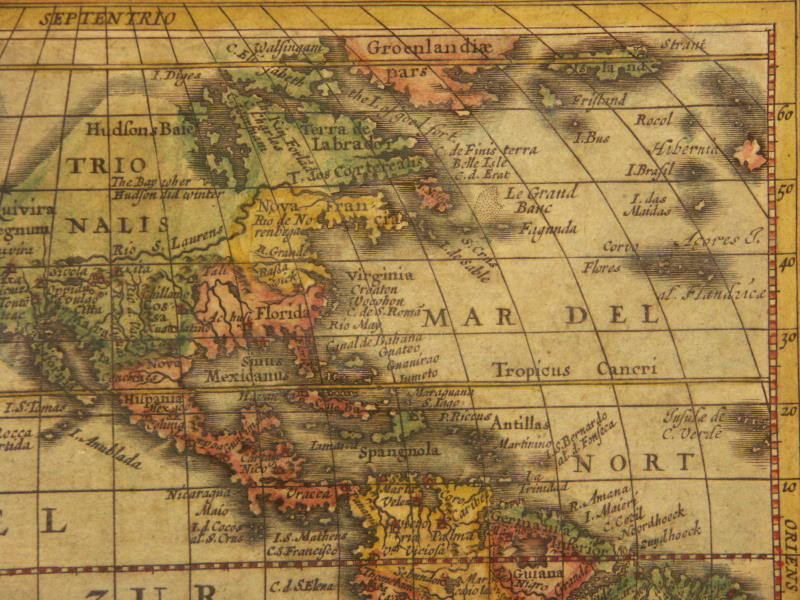 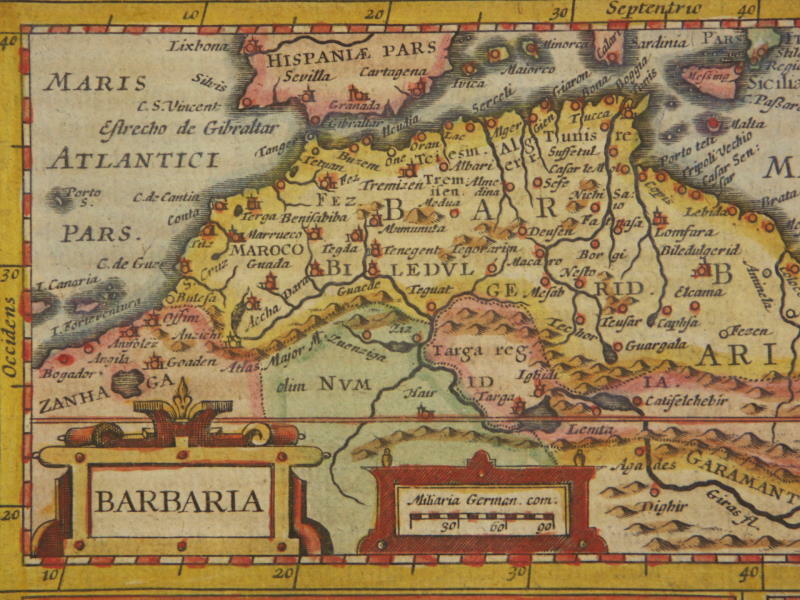 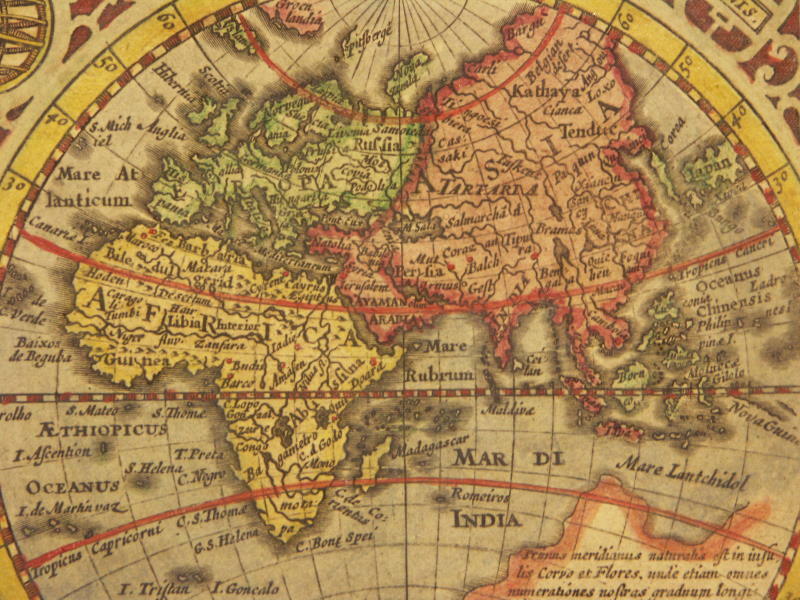 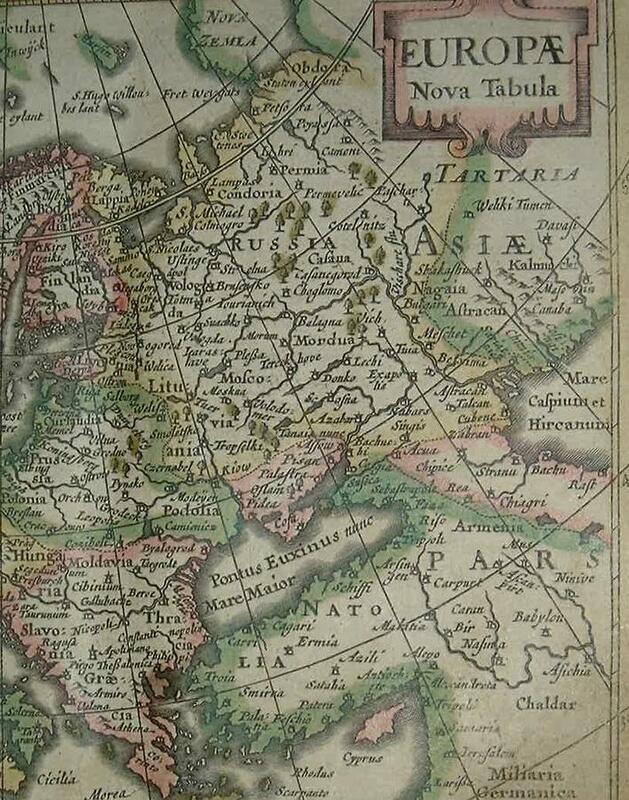 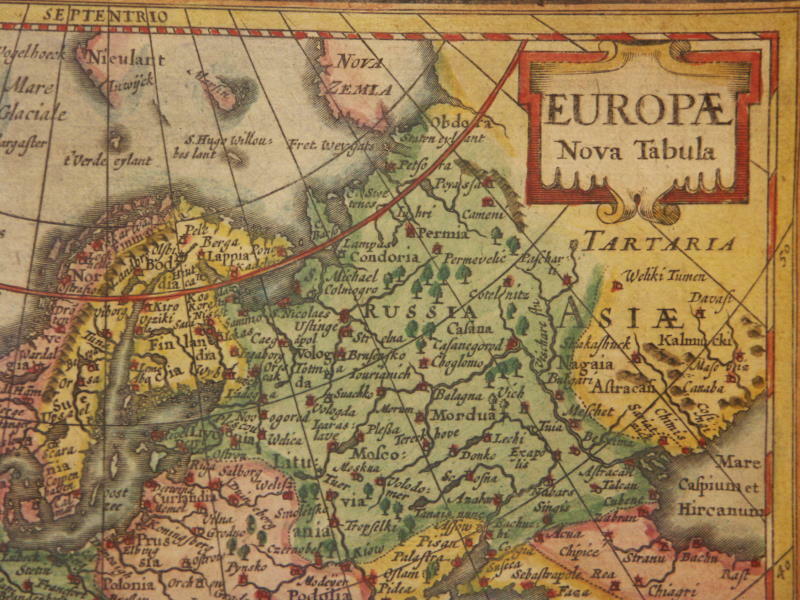 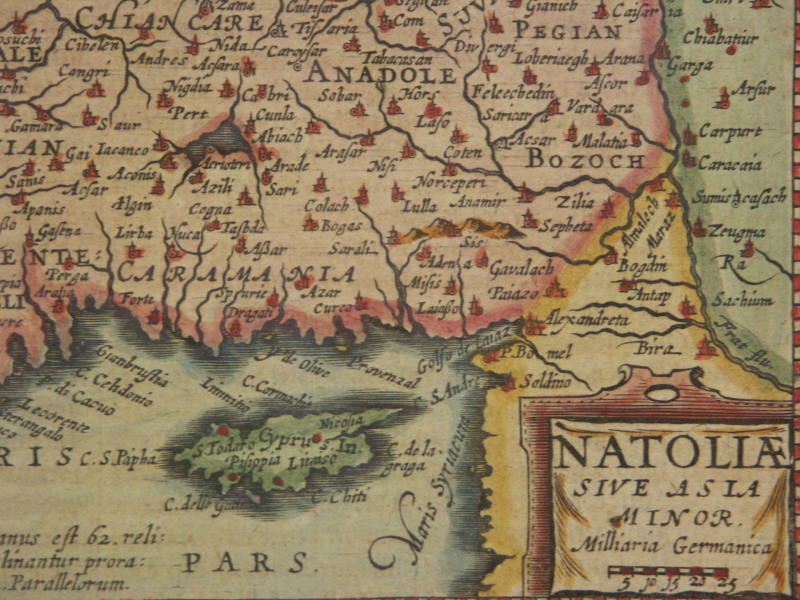 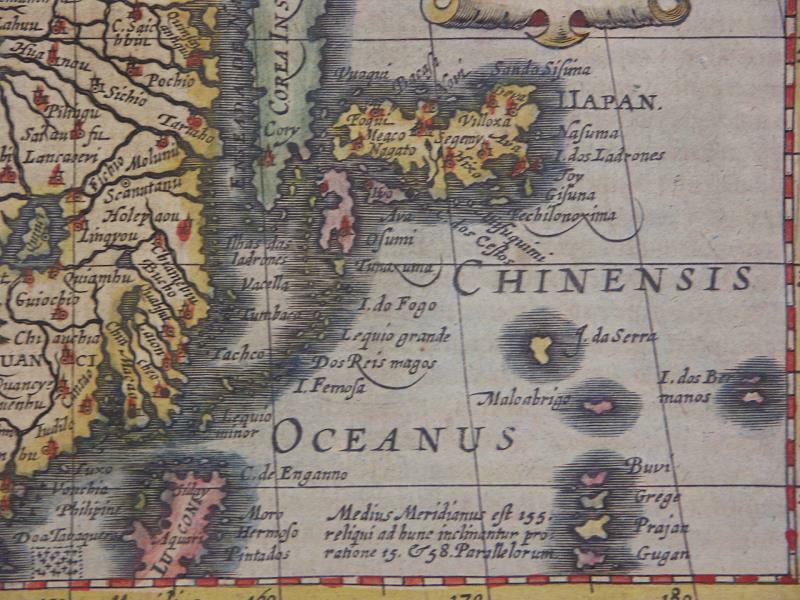 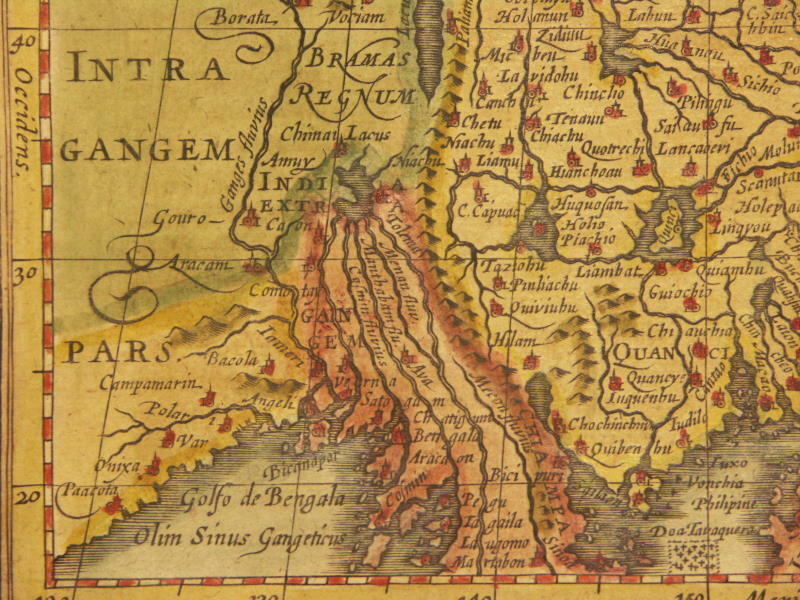 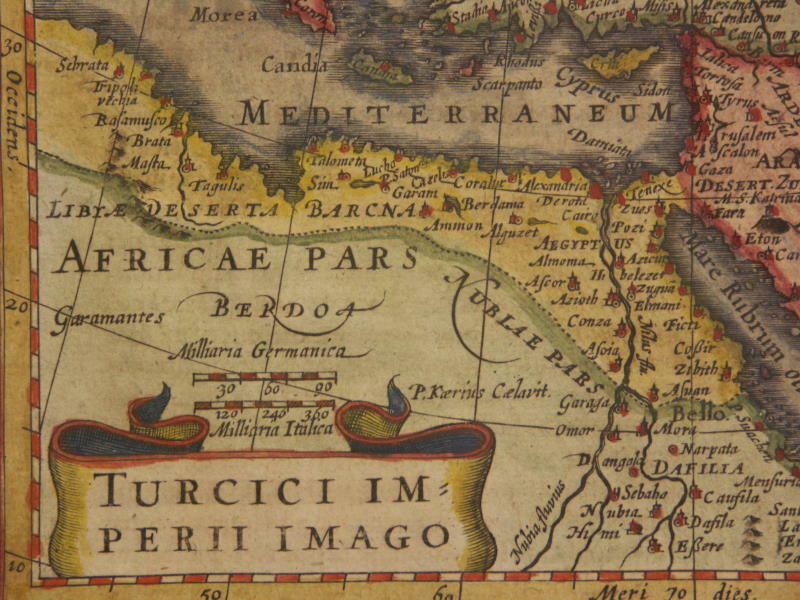 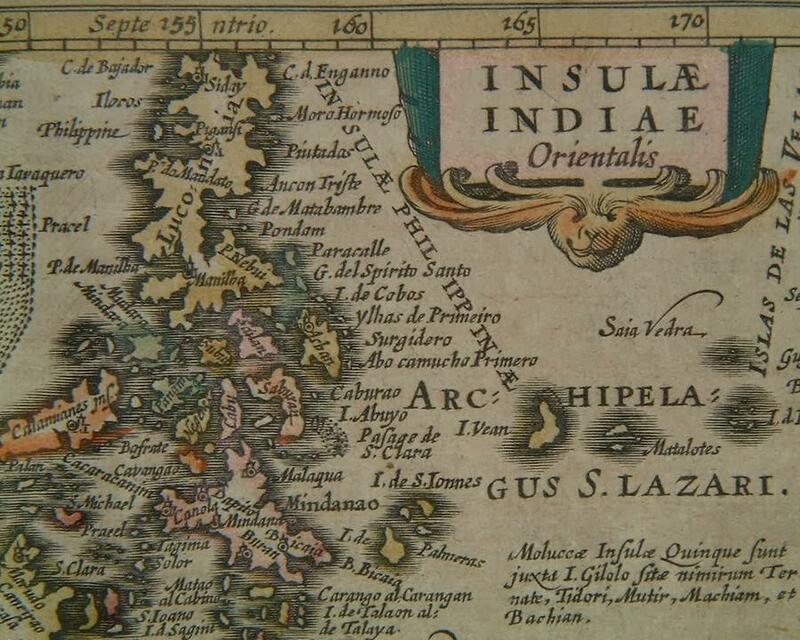 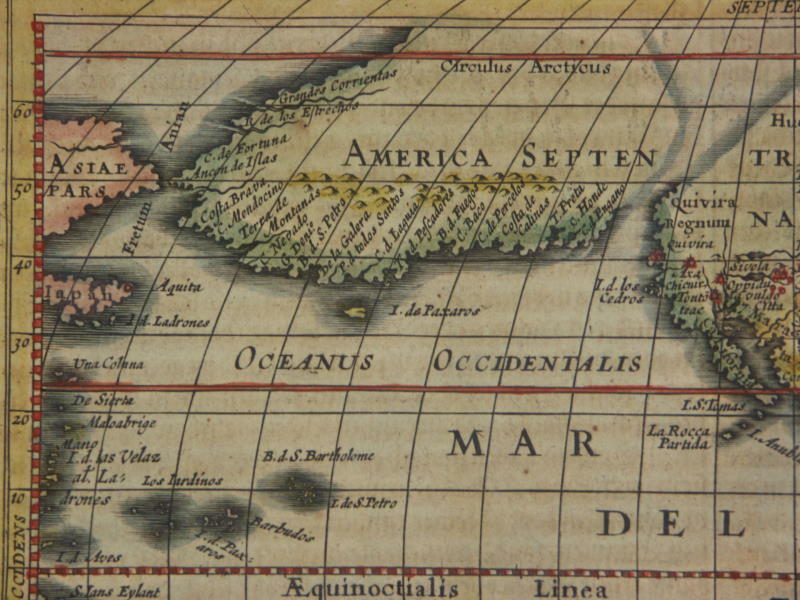 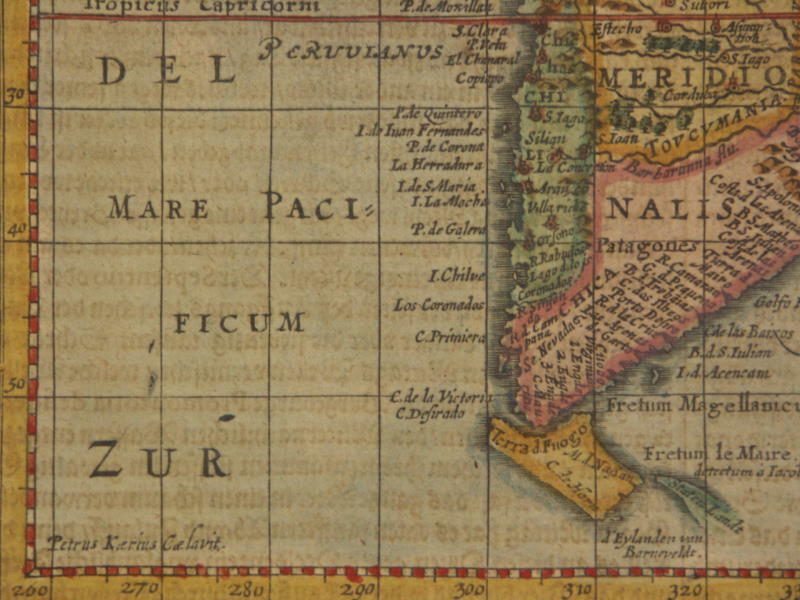 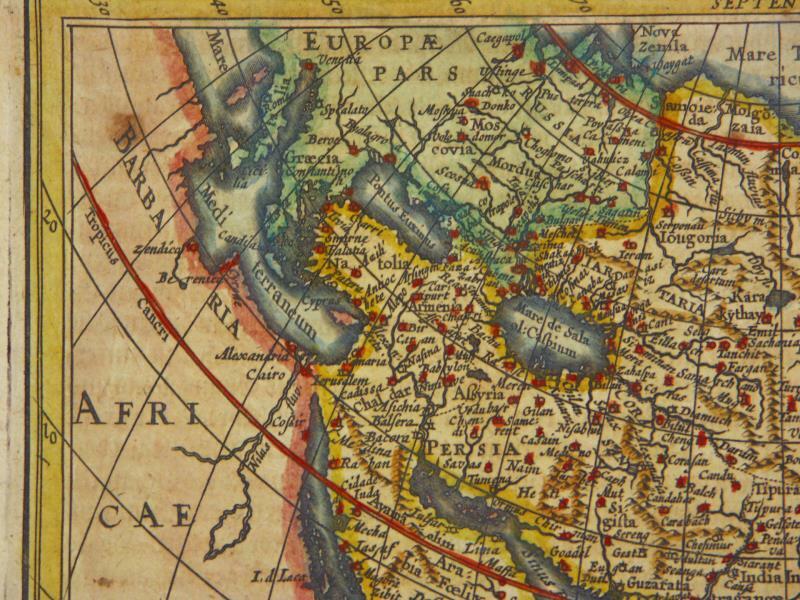 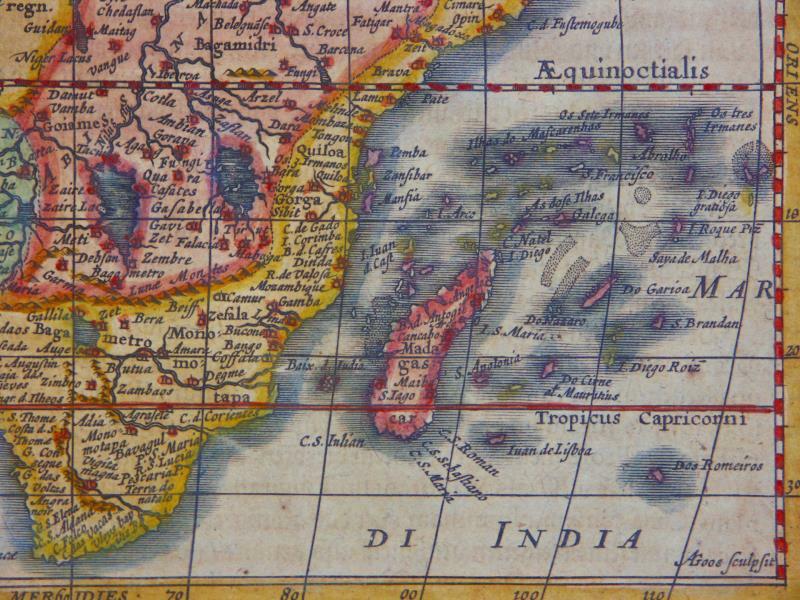 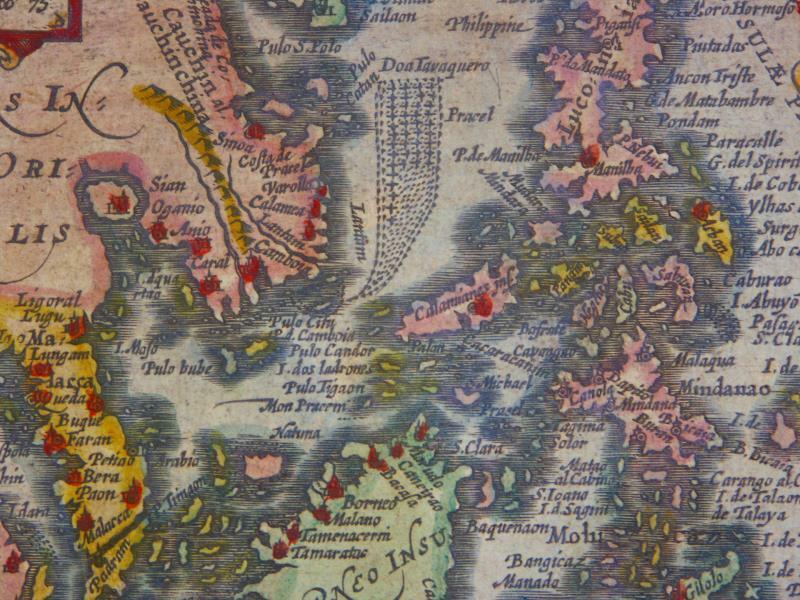 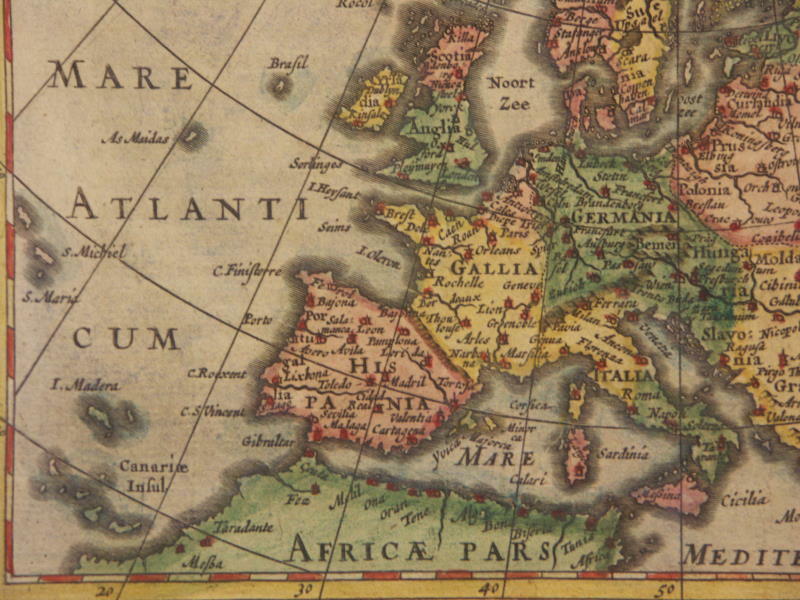 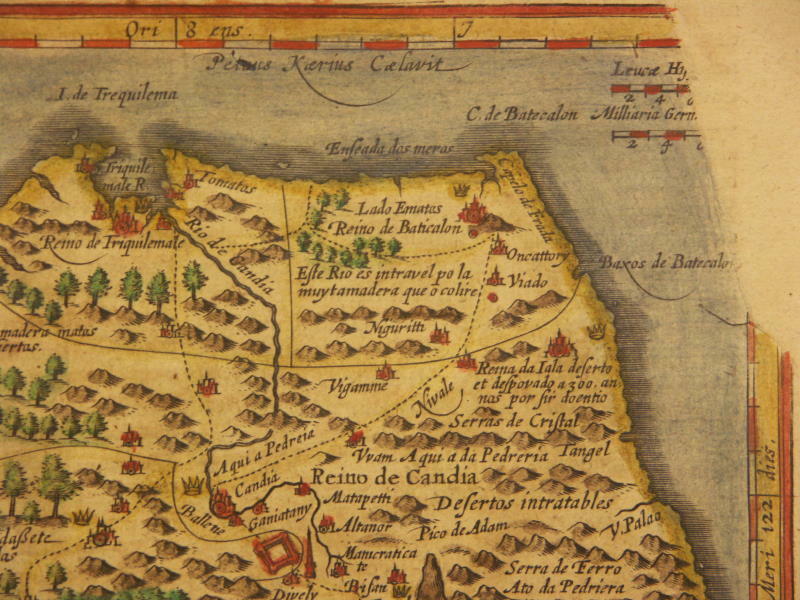 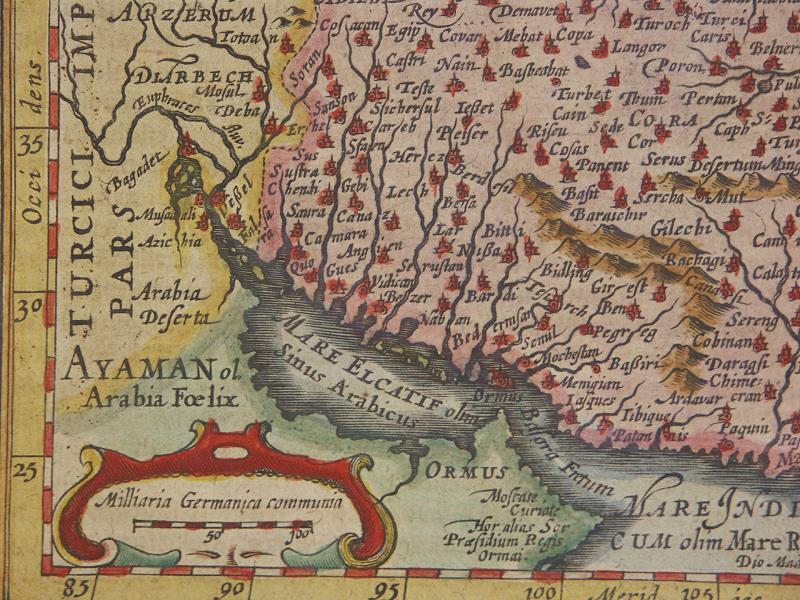 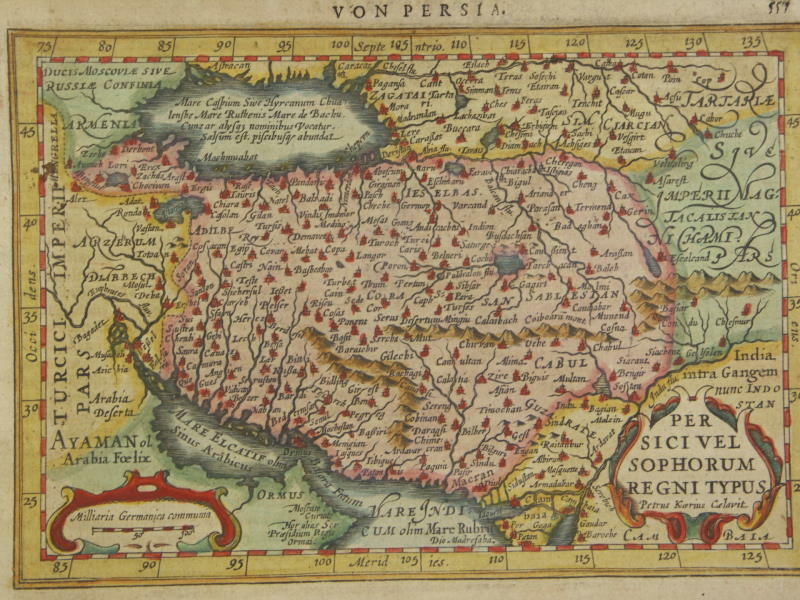 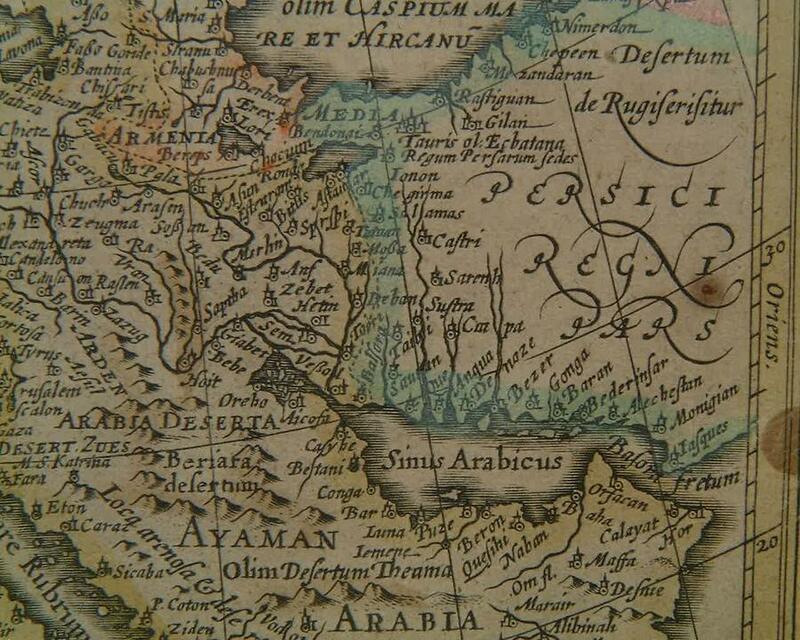 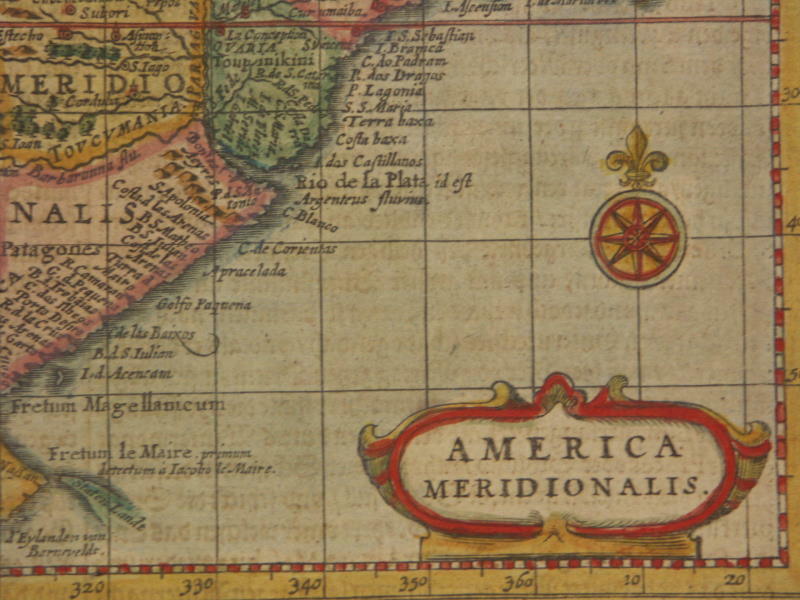 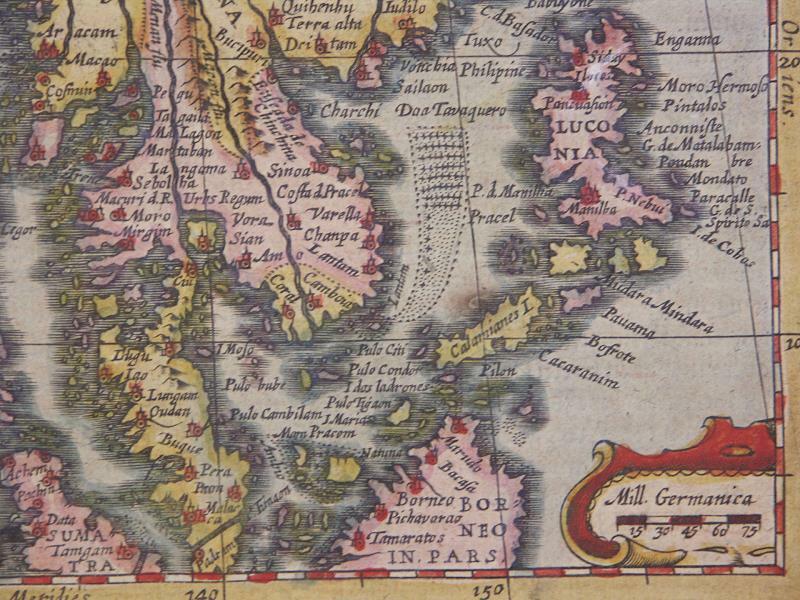 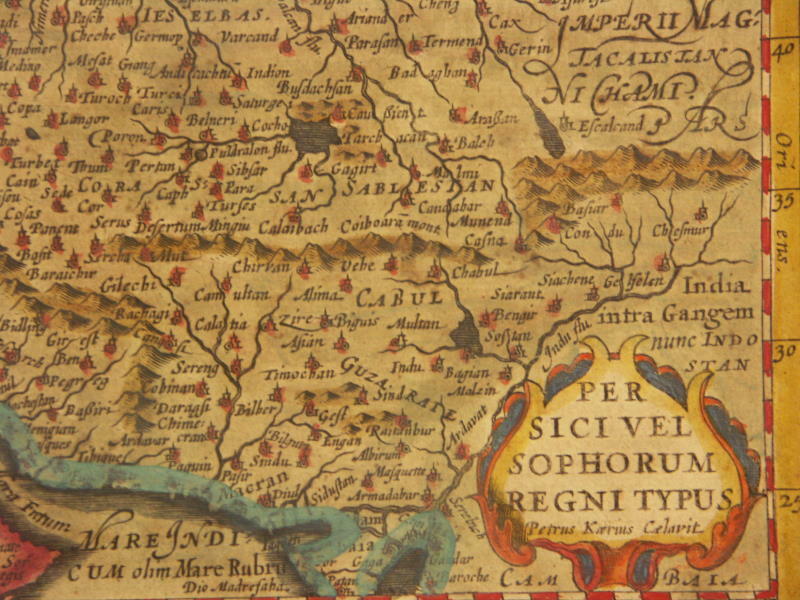 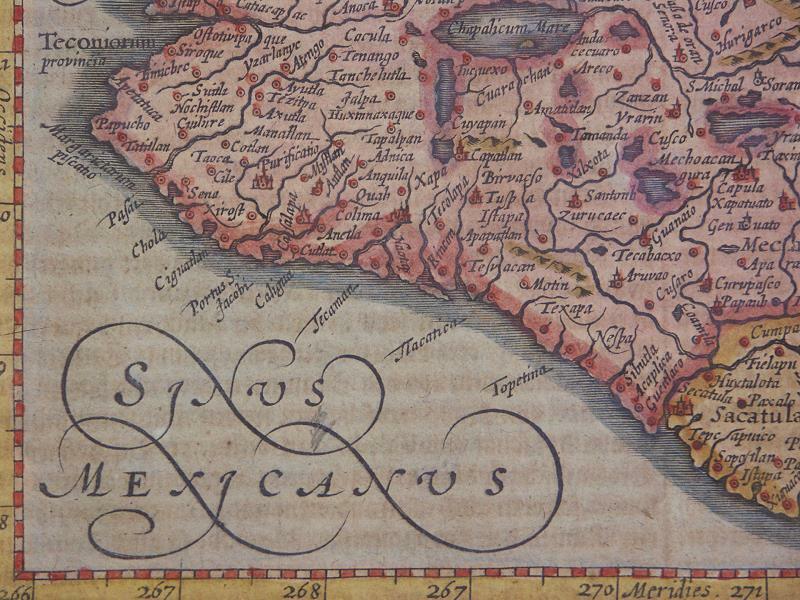 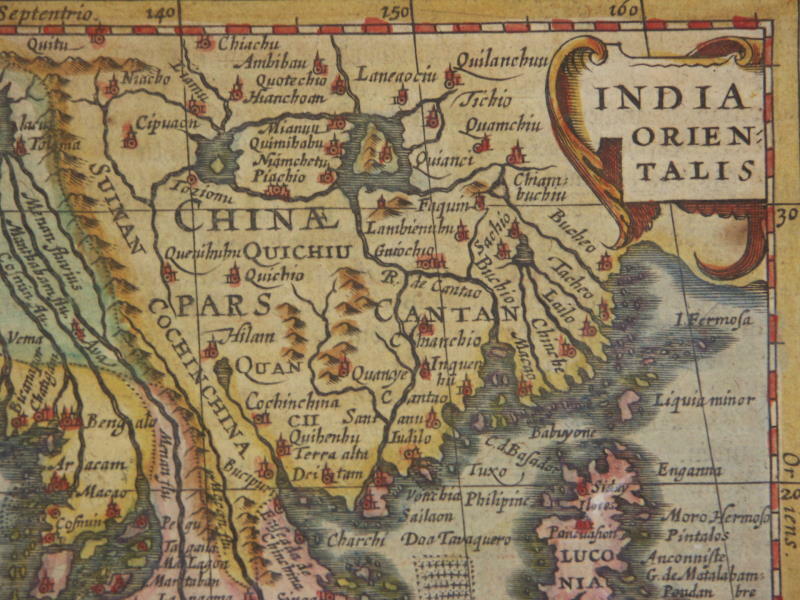 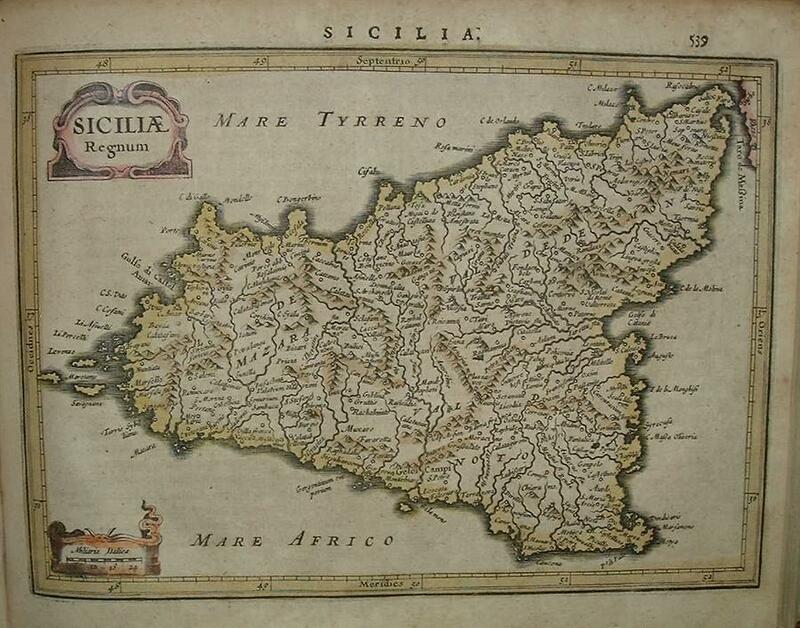 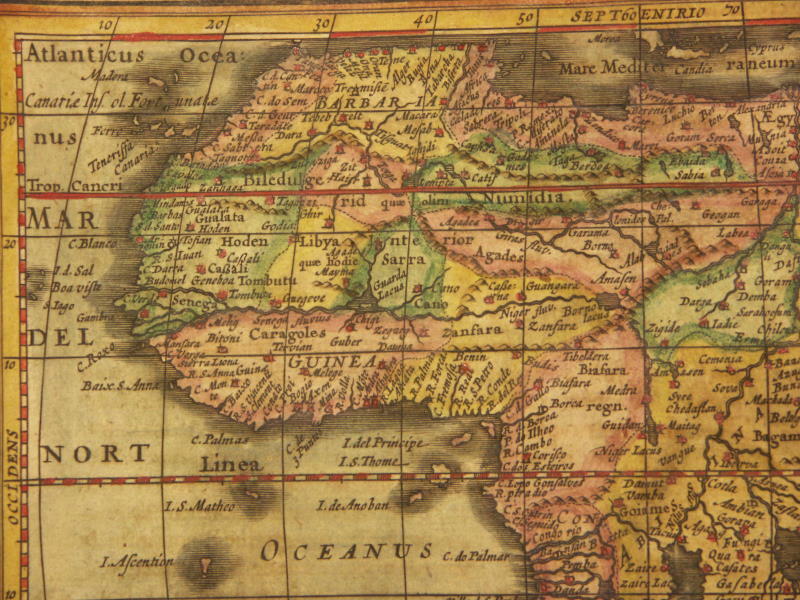 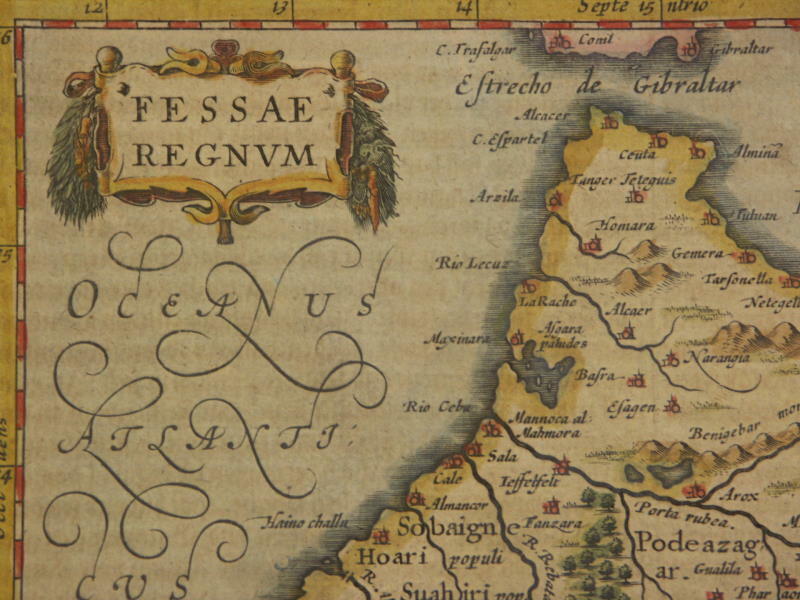 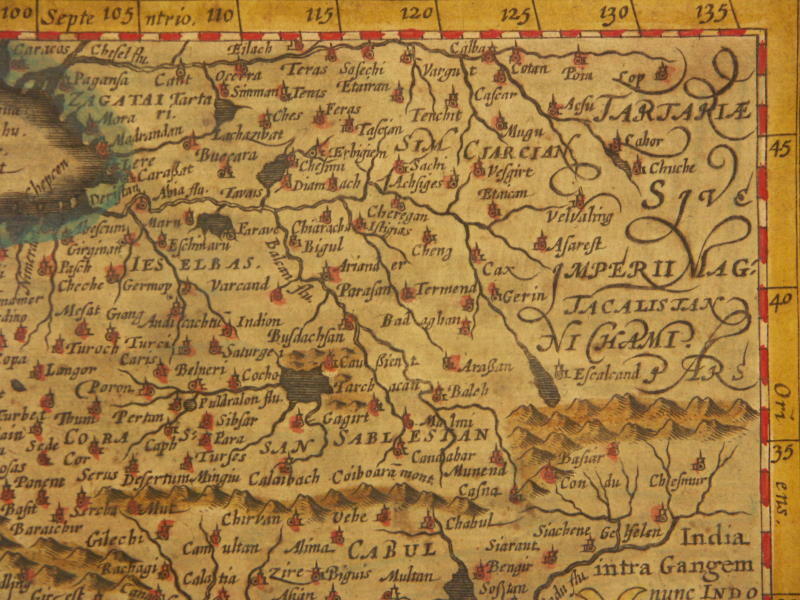 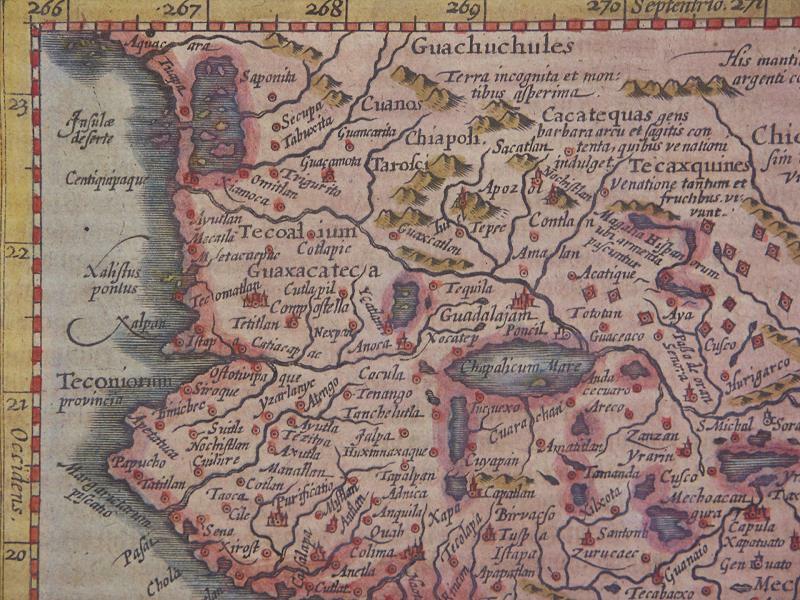 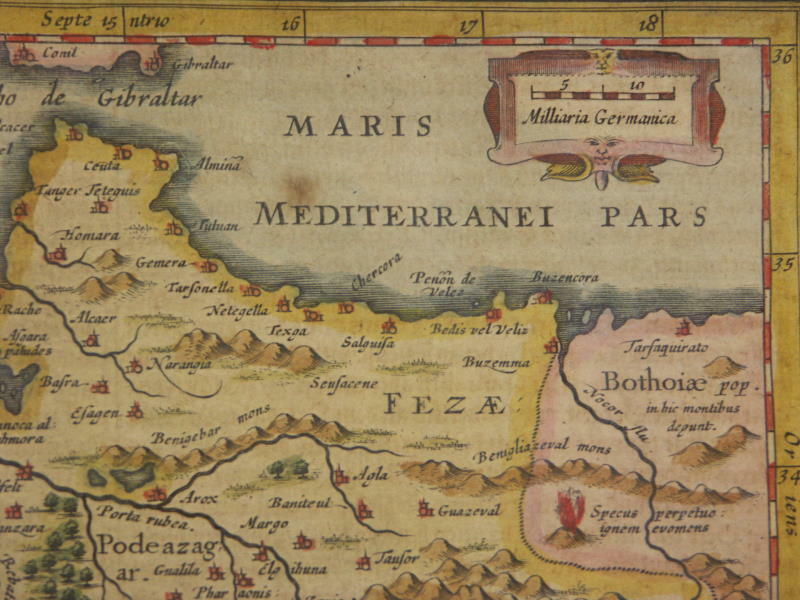 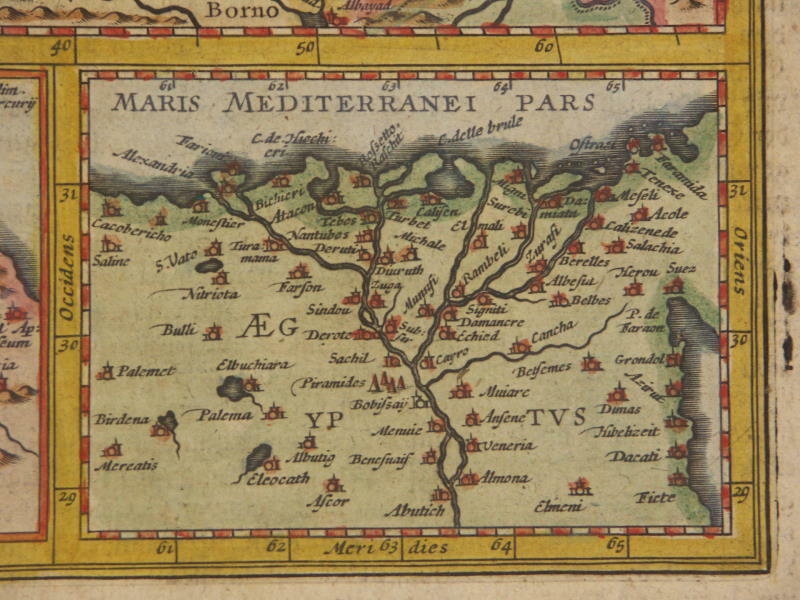 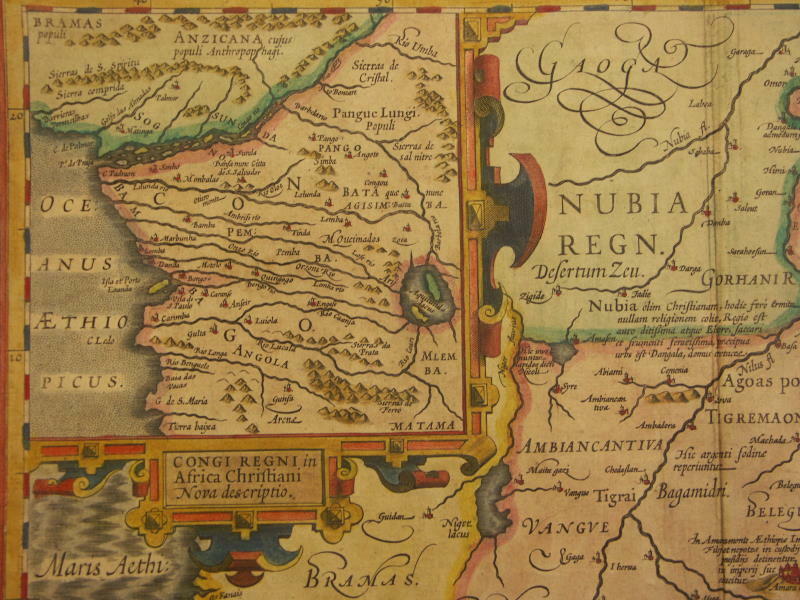 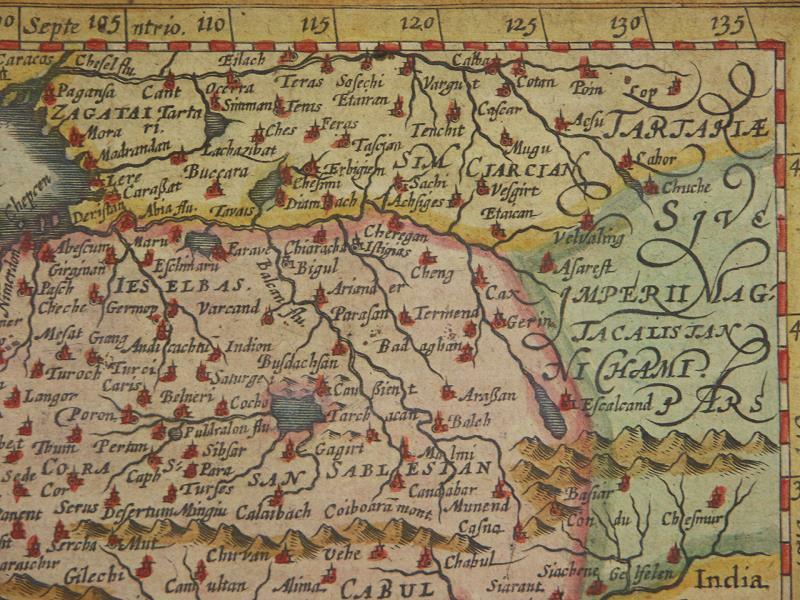 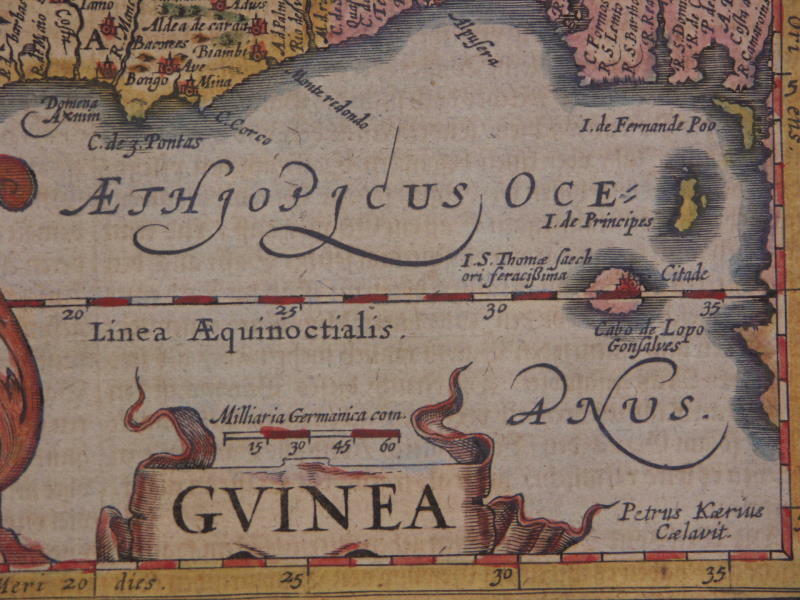 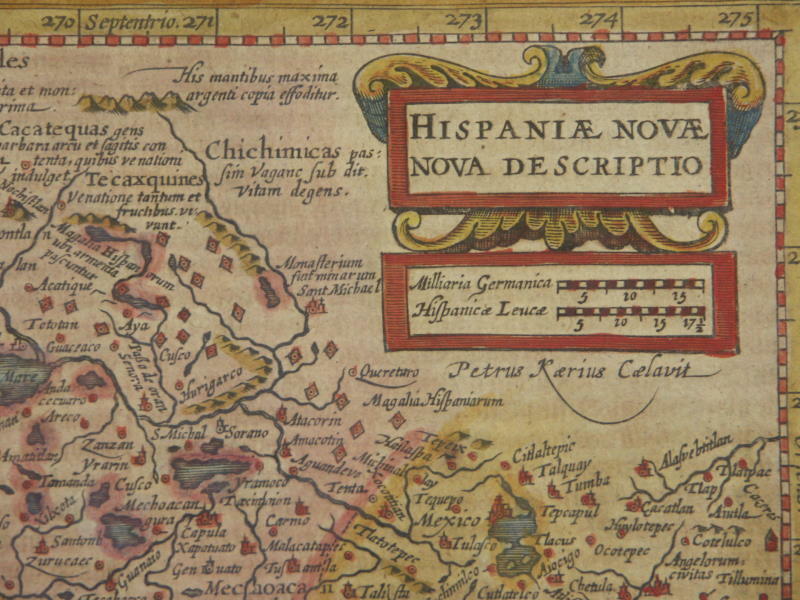 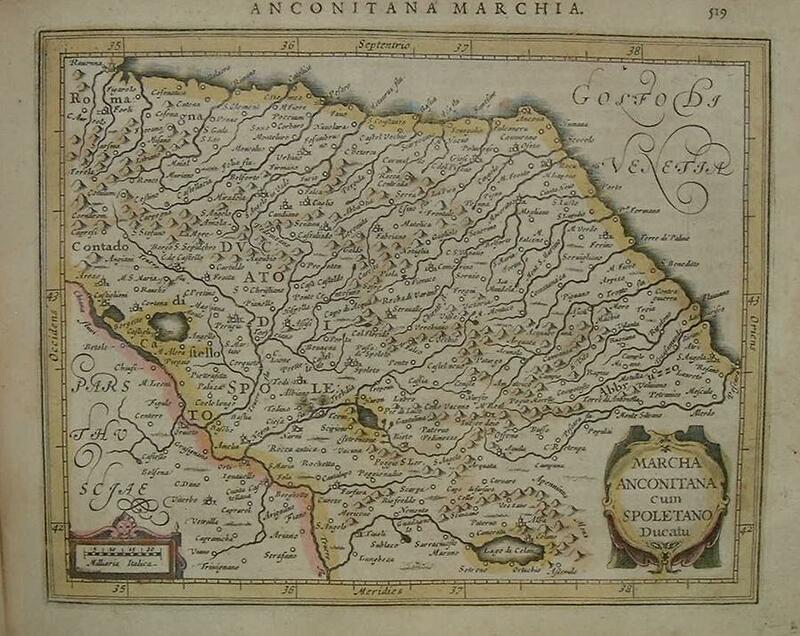 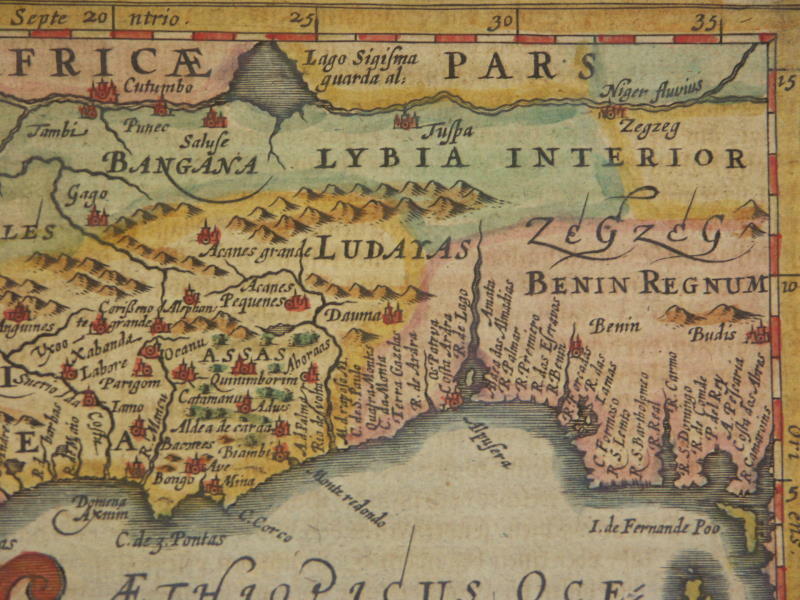 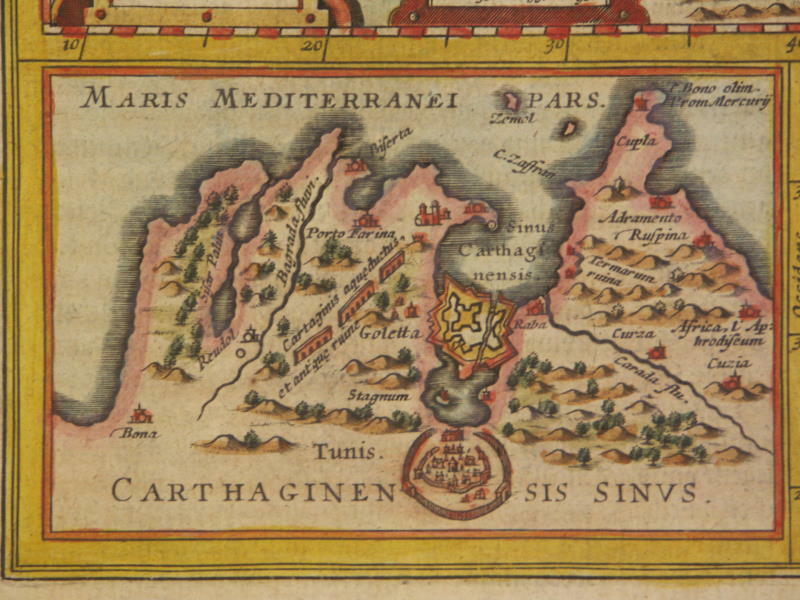 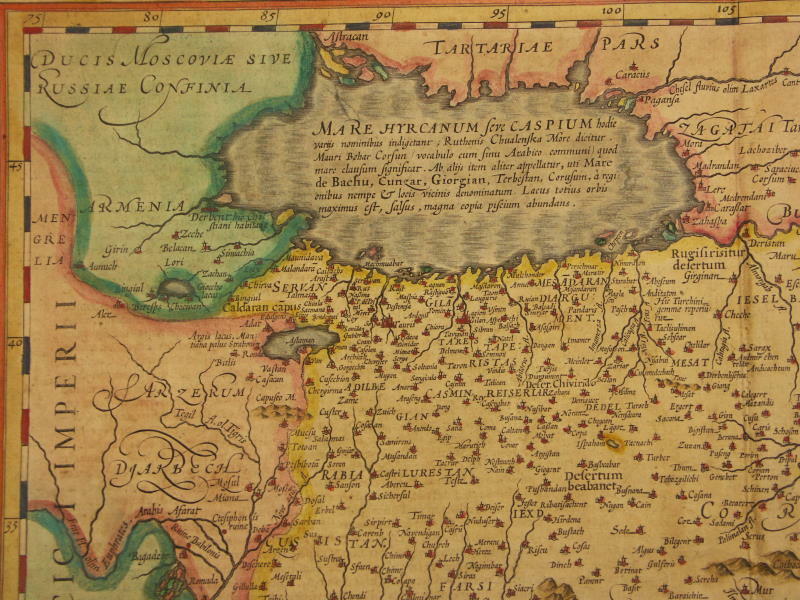 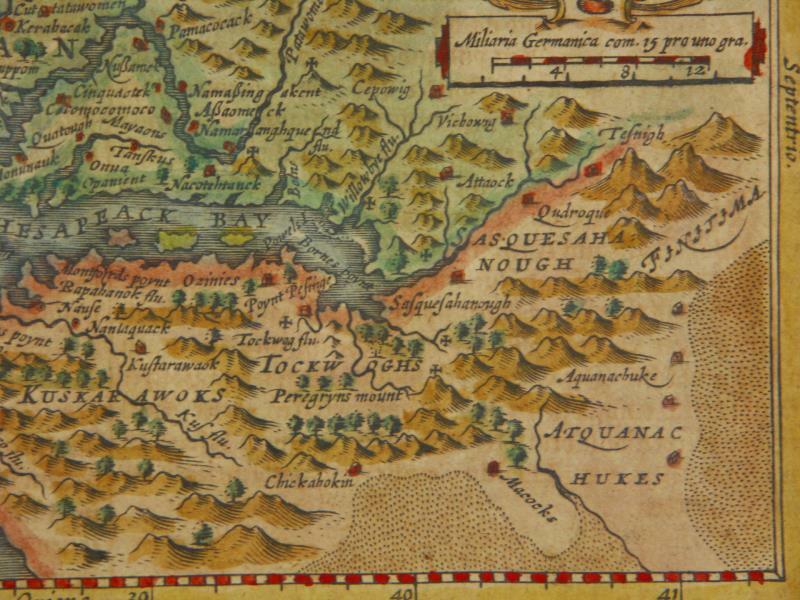 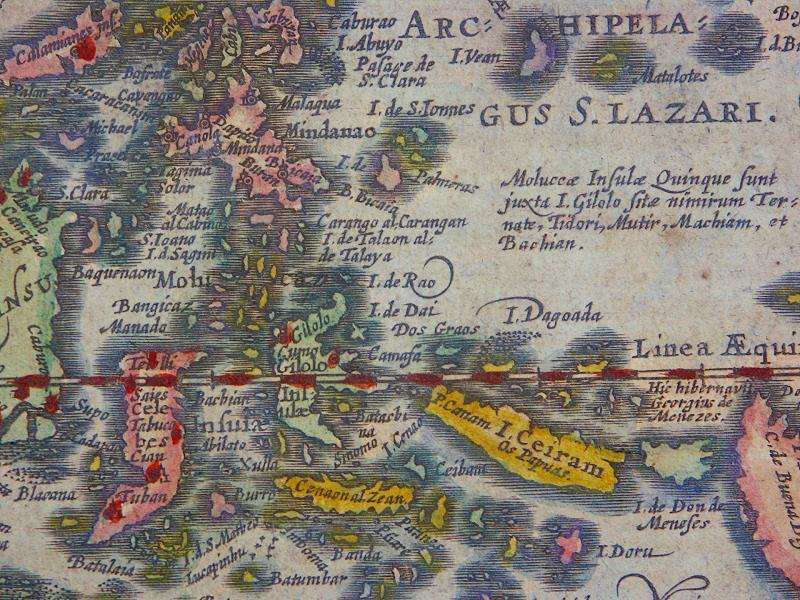 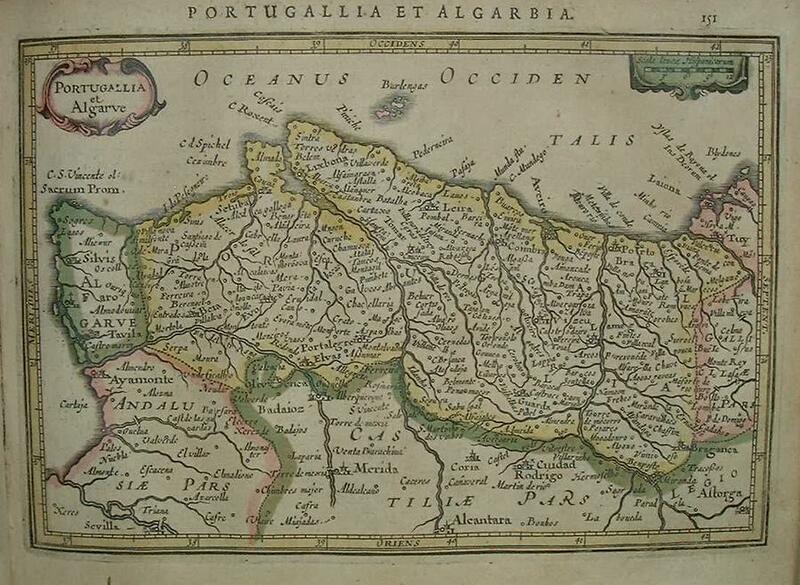 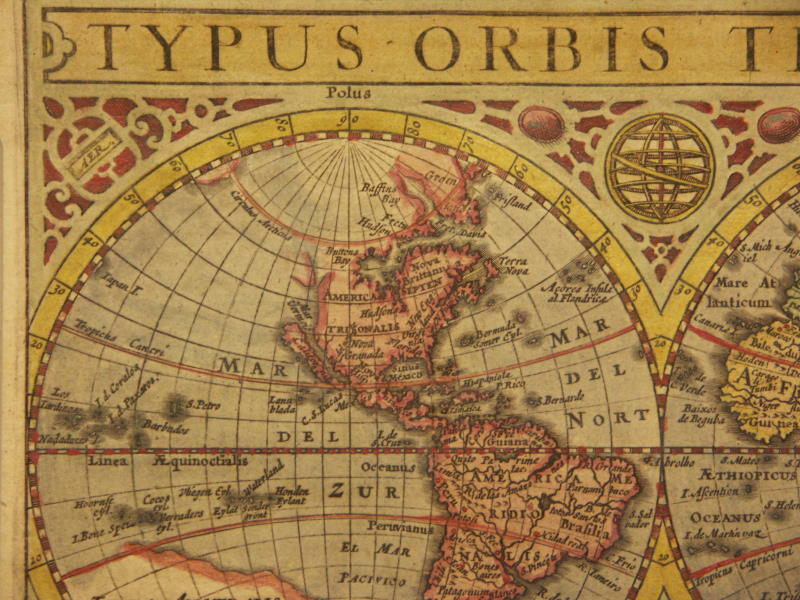 During the preparation of the publication of Mercator's large Atlas, Jodocus had the maps reduced, in order to publish them as the Atlas Minor in 1607. 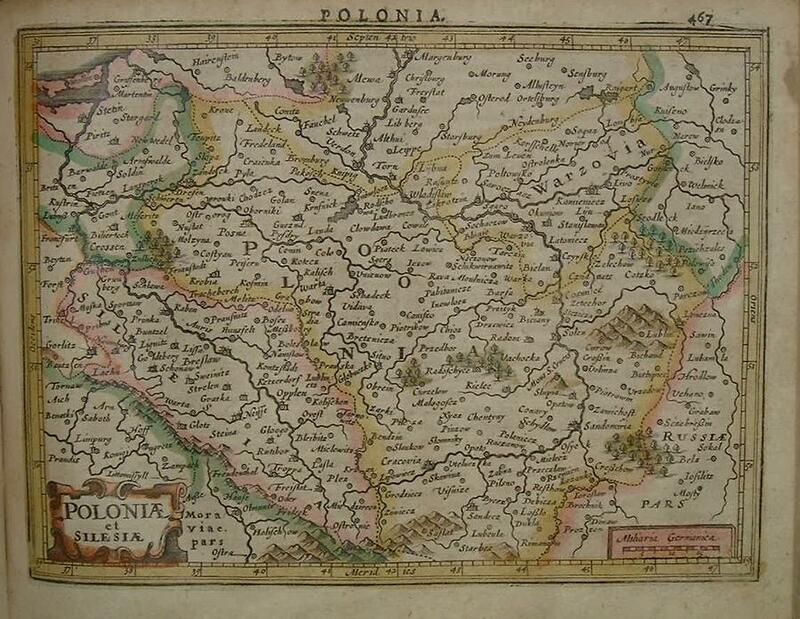 The publisher, Cornelis Claesz, also participated in this enterprise. 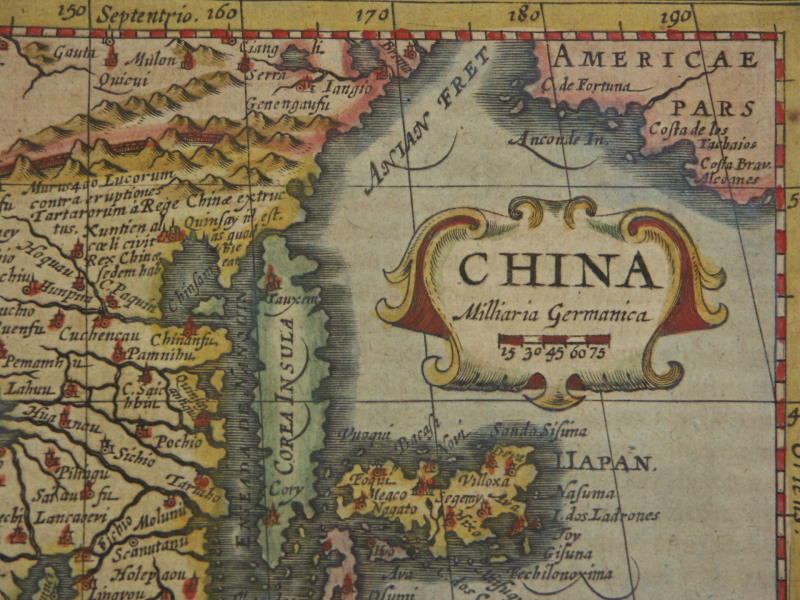 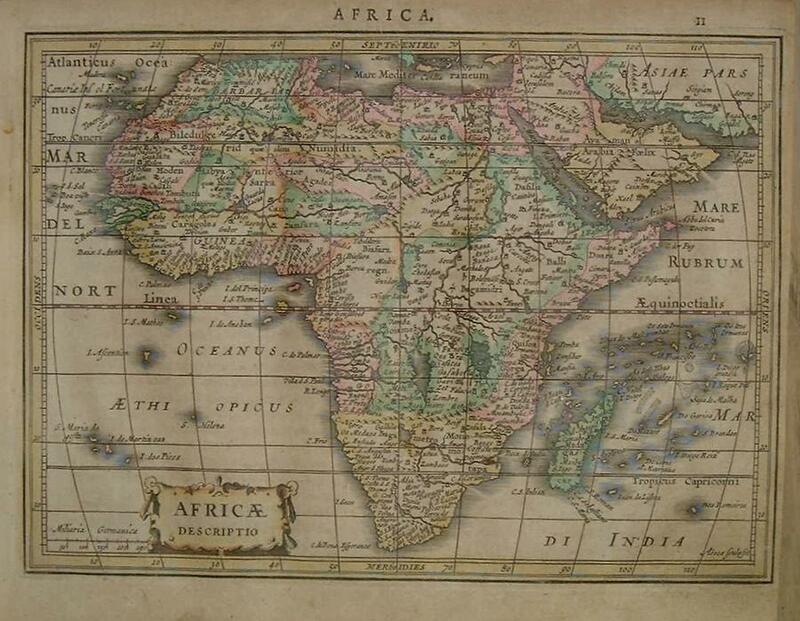 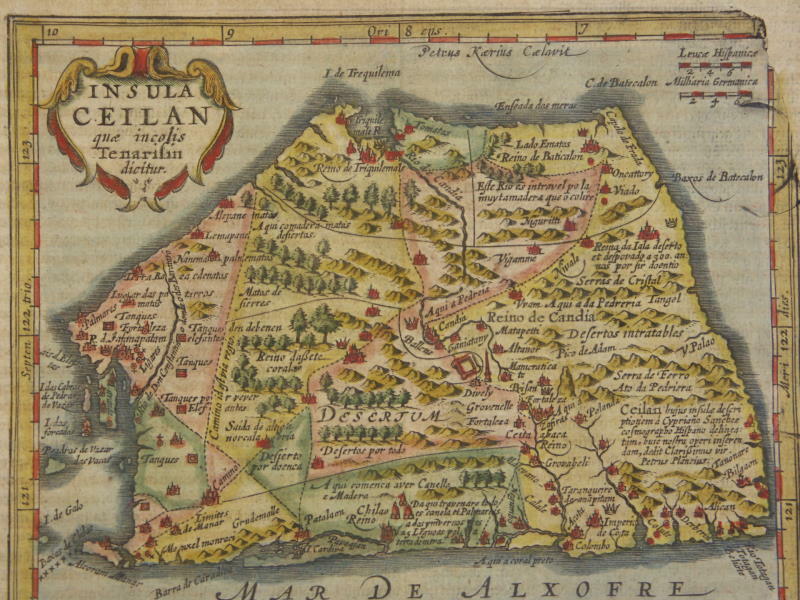 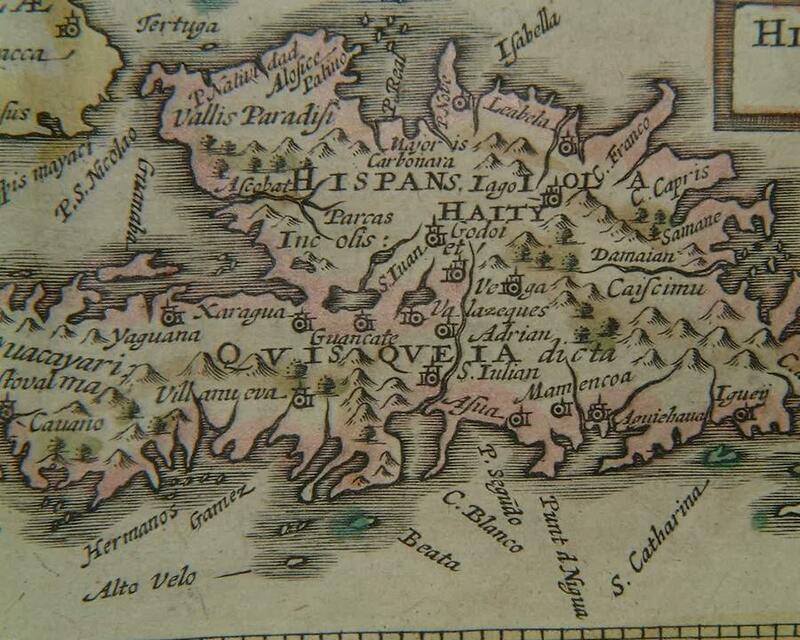 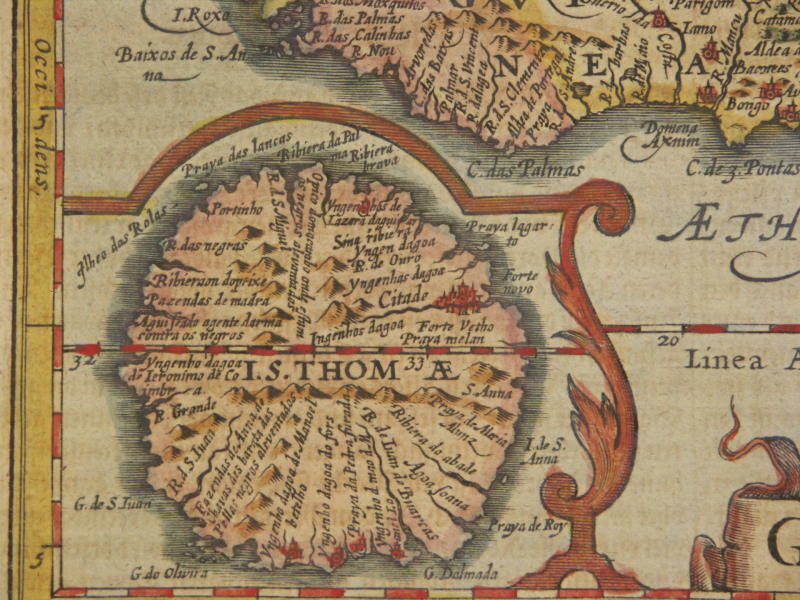 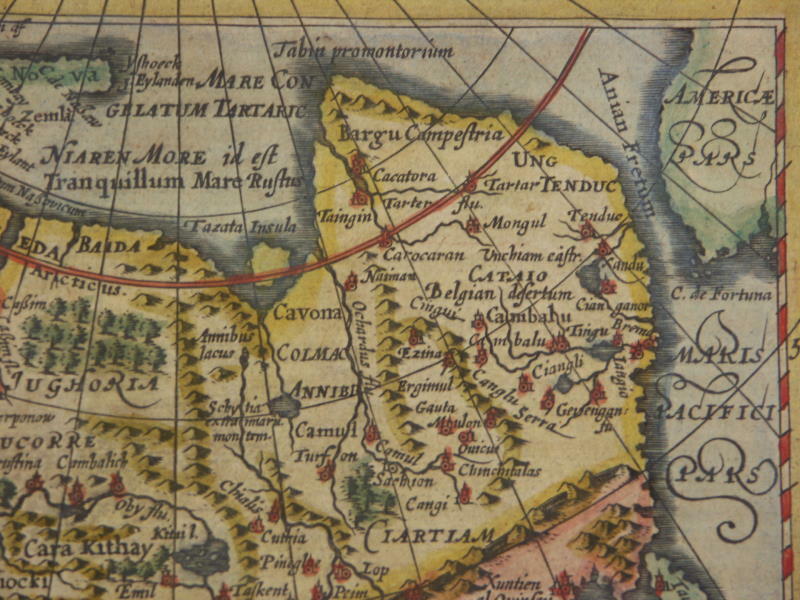 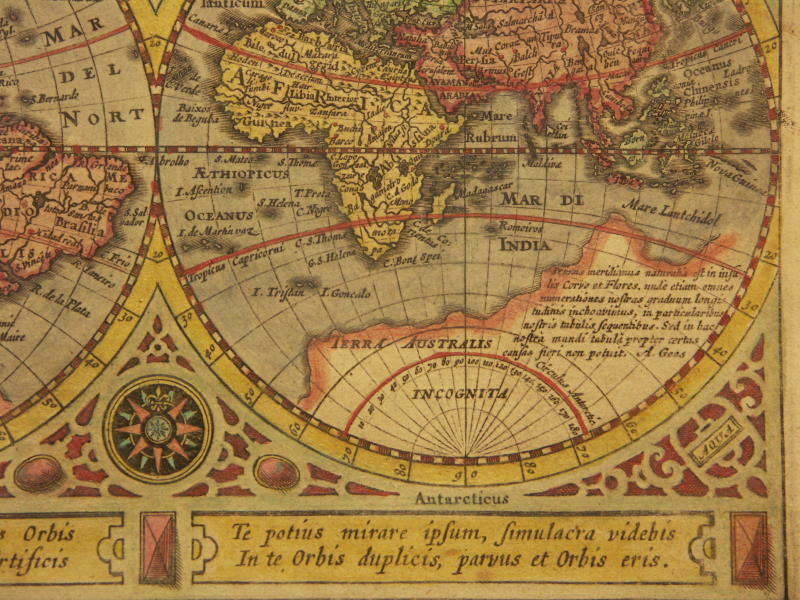 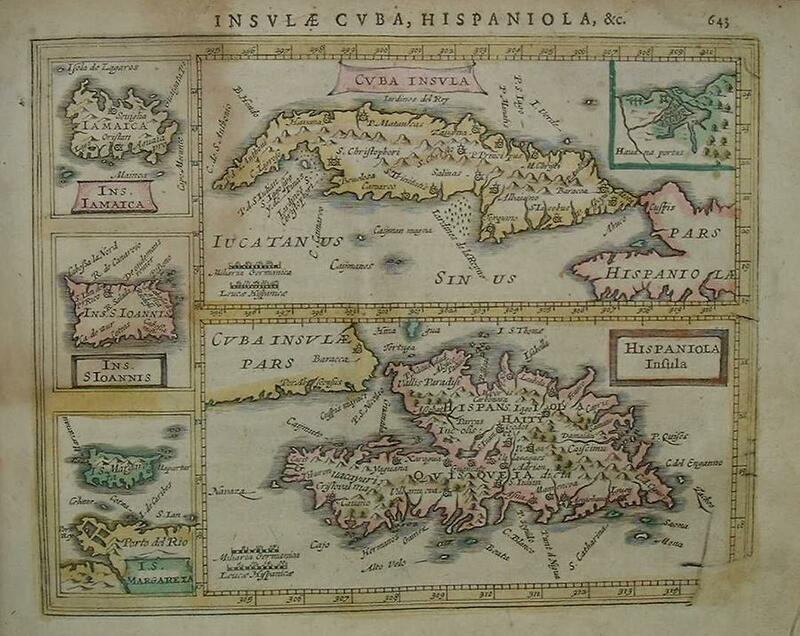 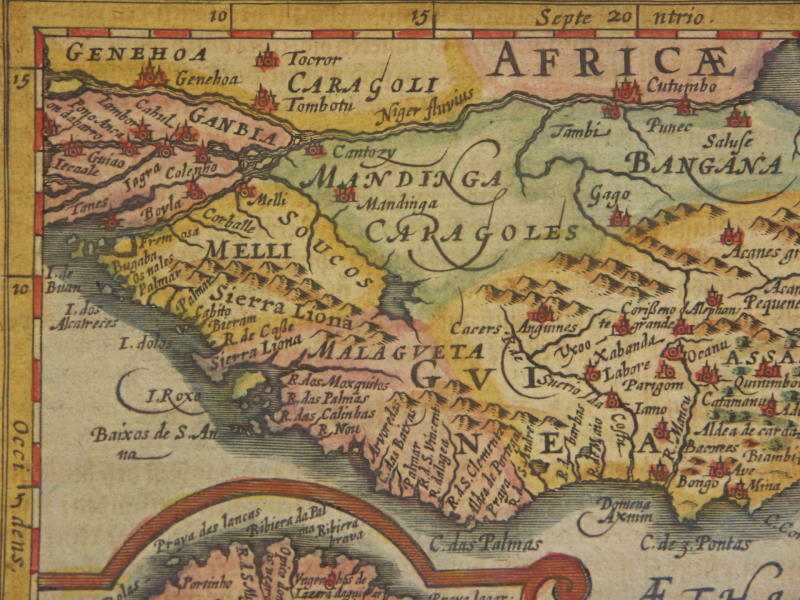 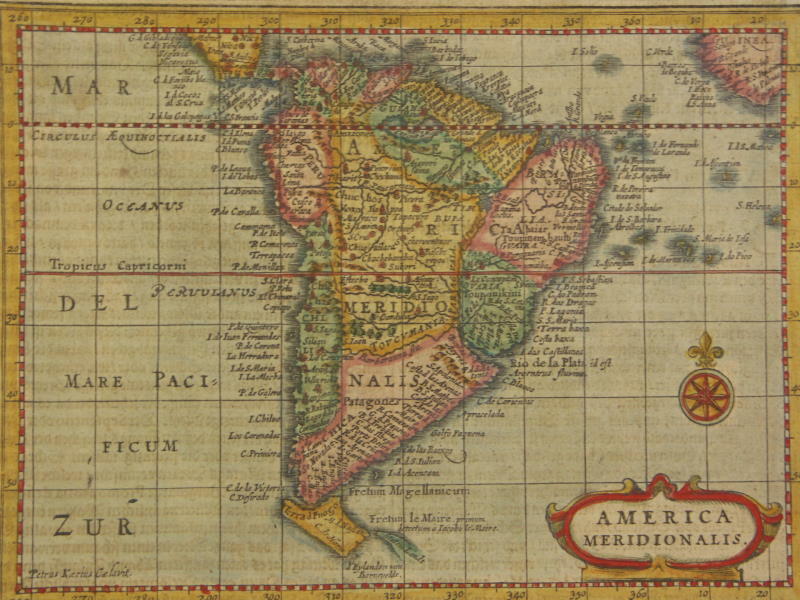 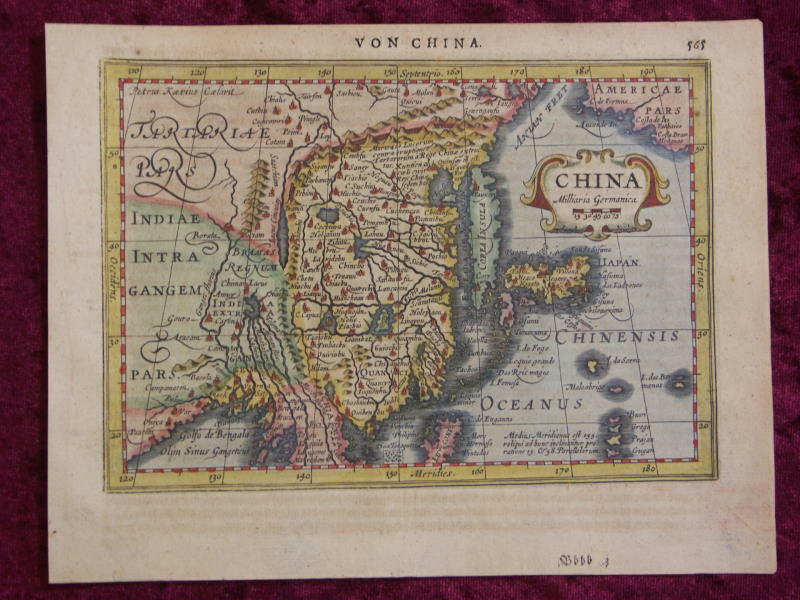 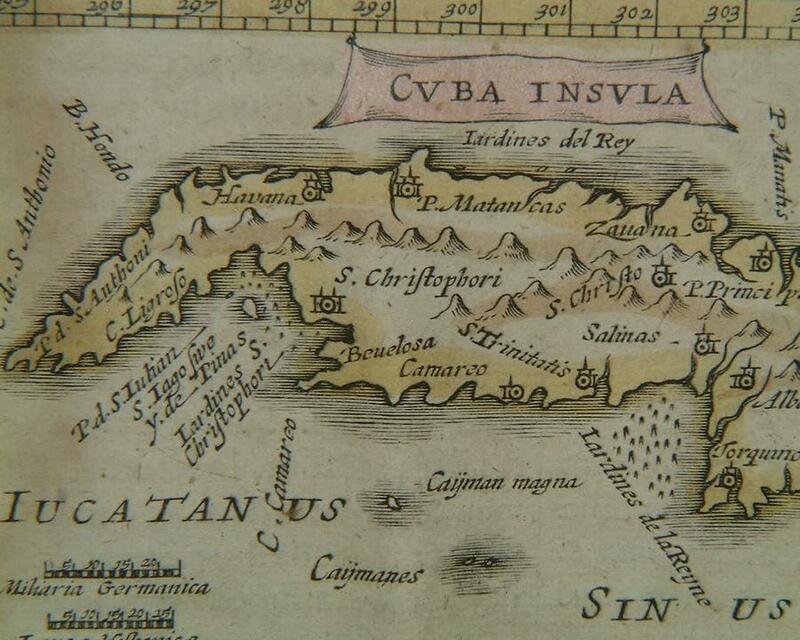 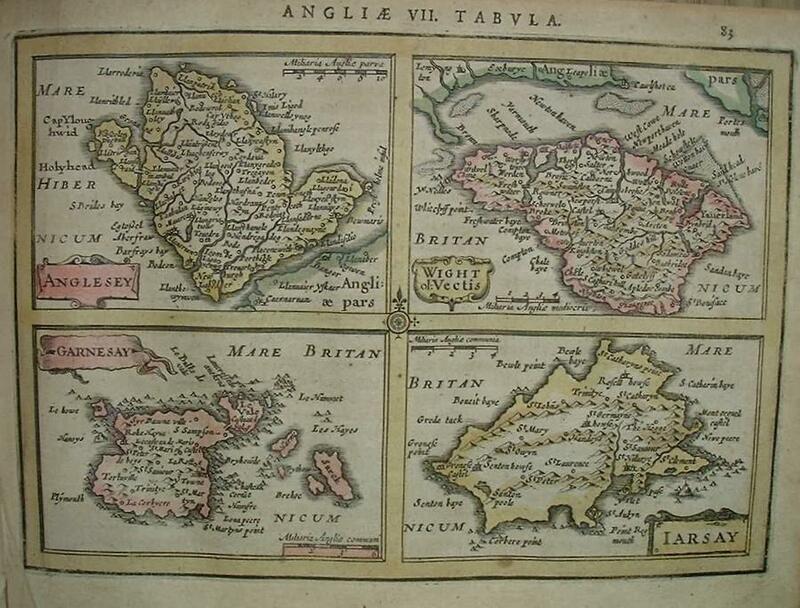 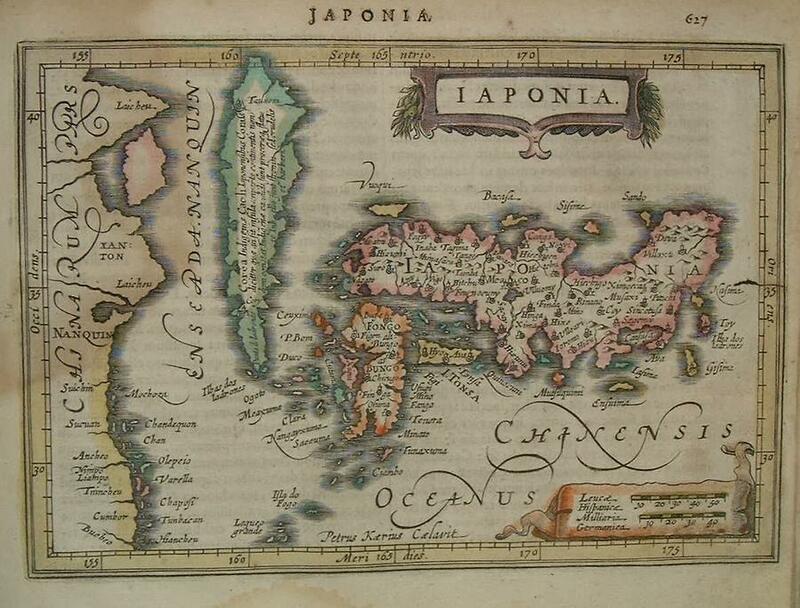 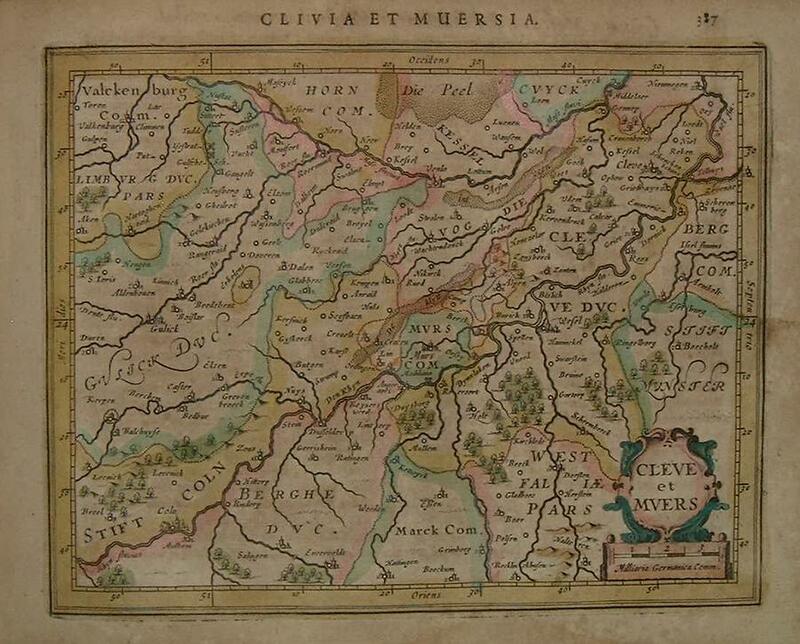 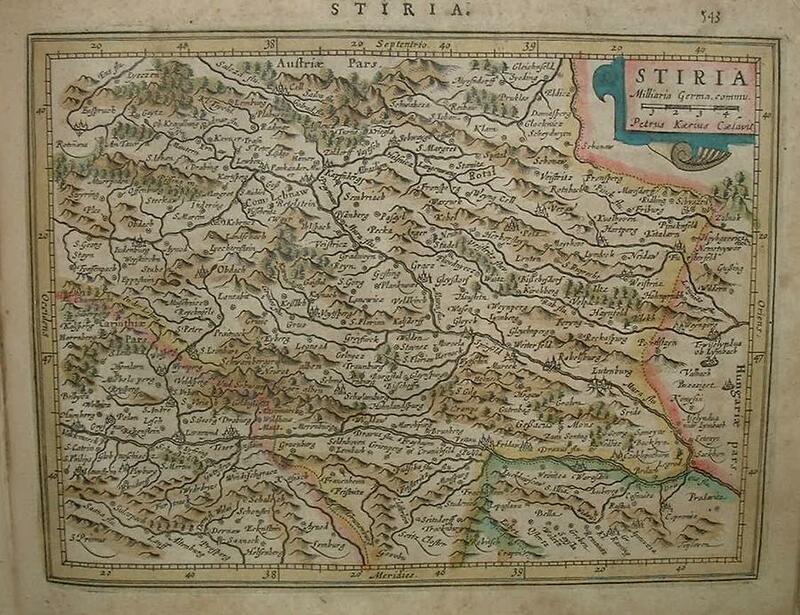 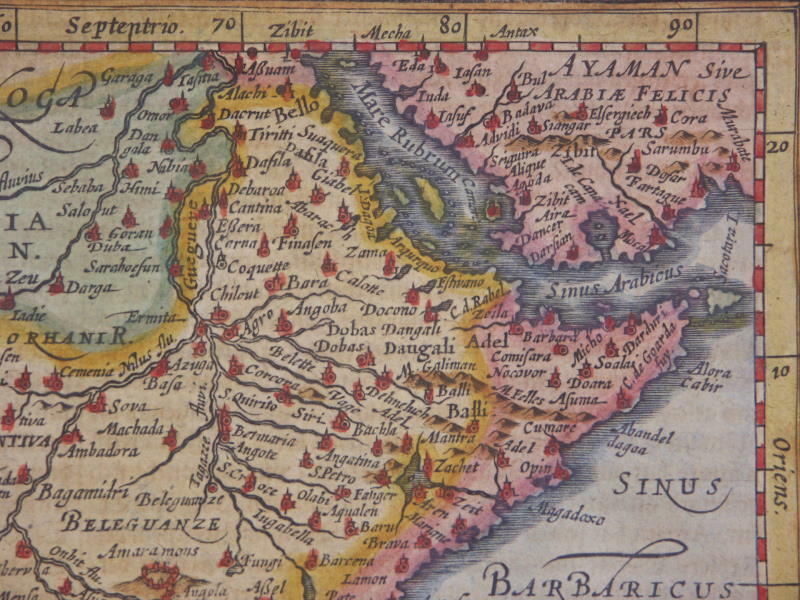 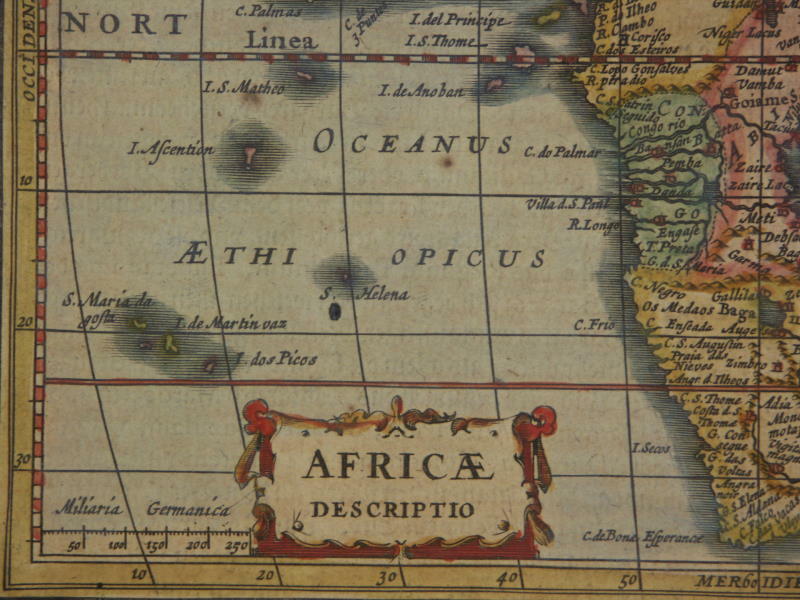 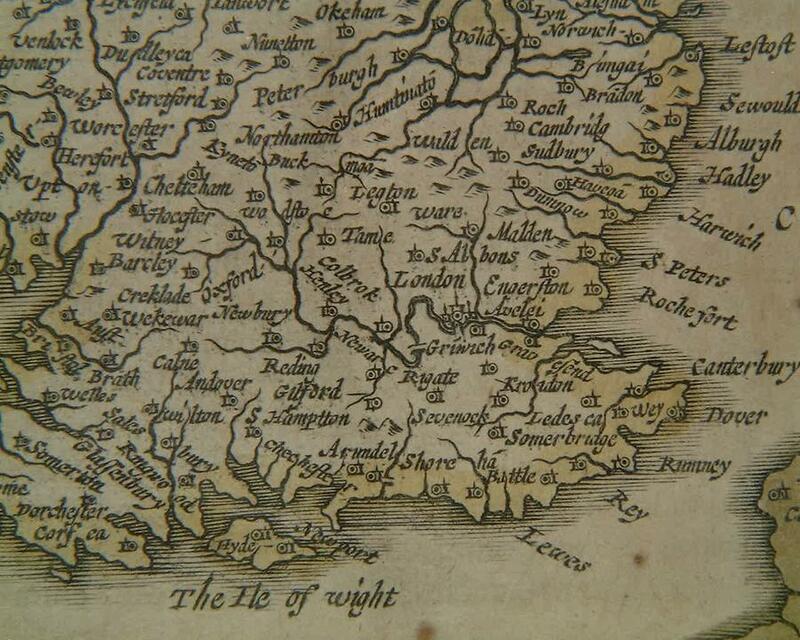 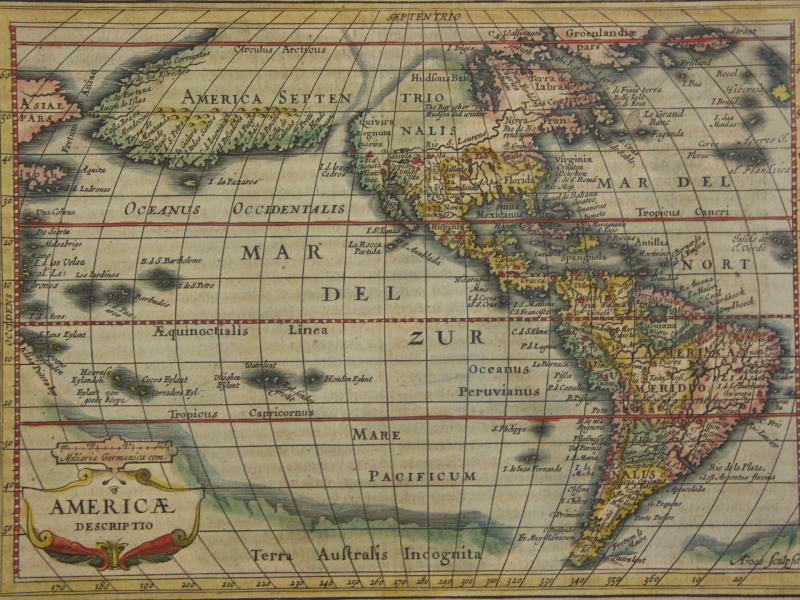 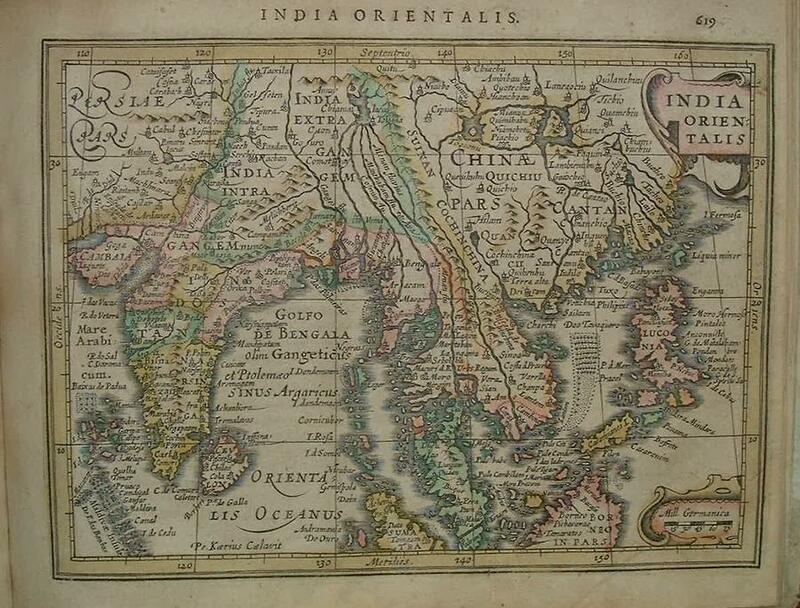 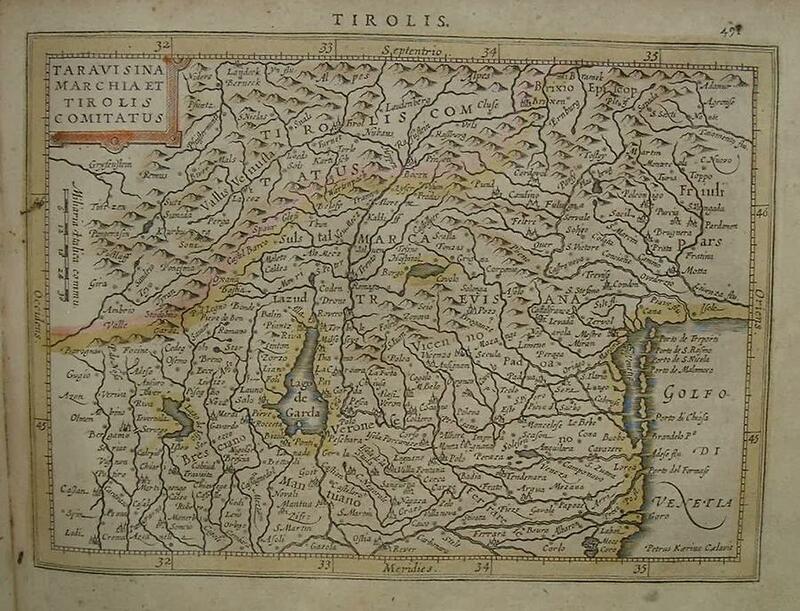 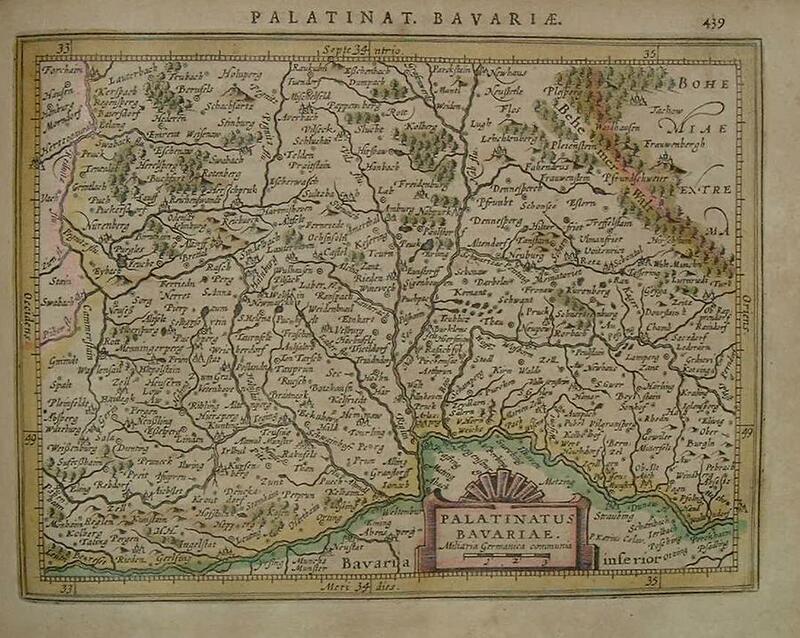 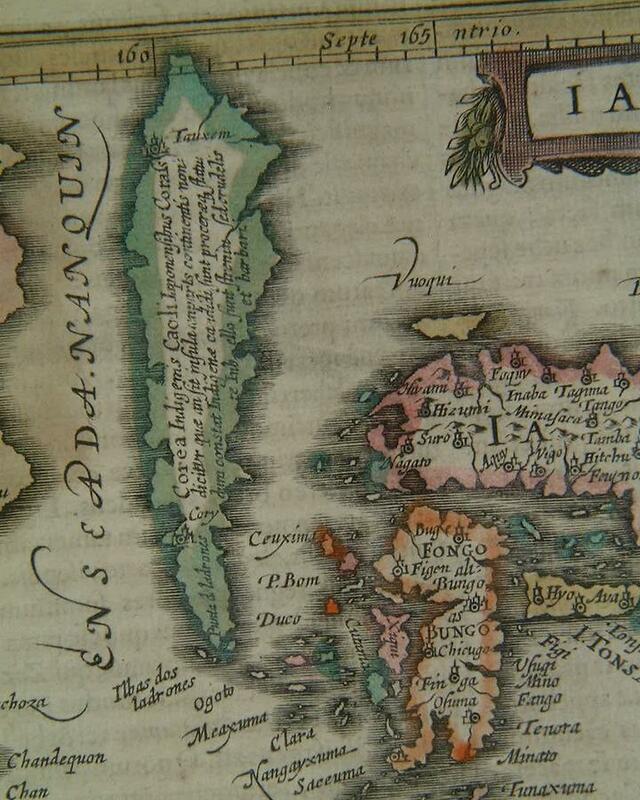 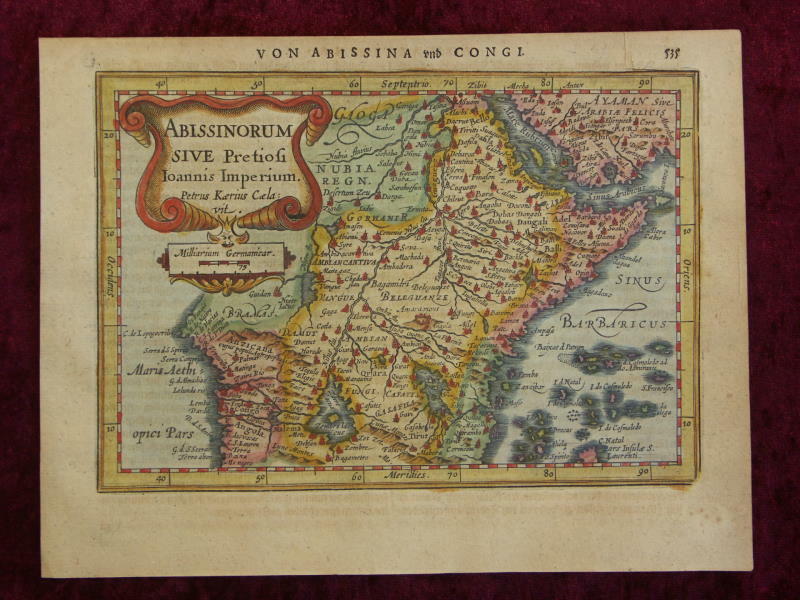 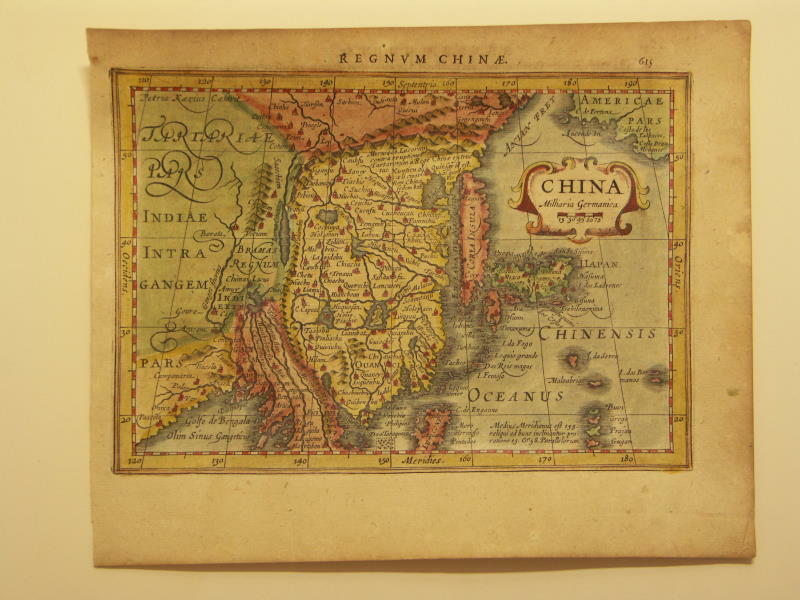 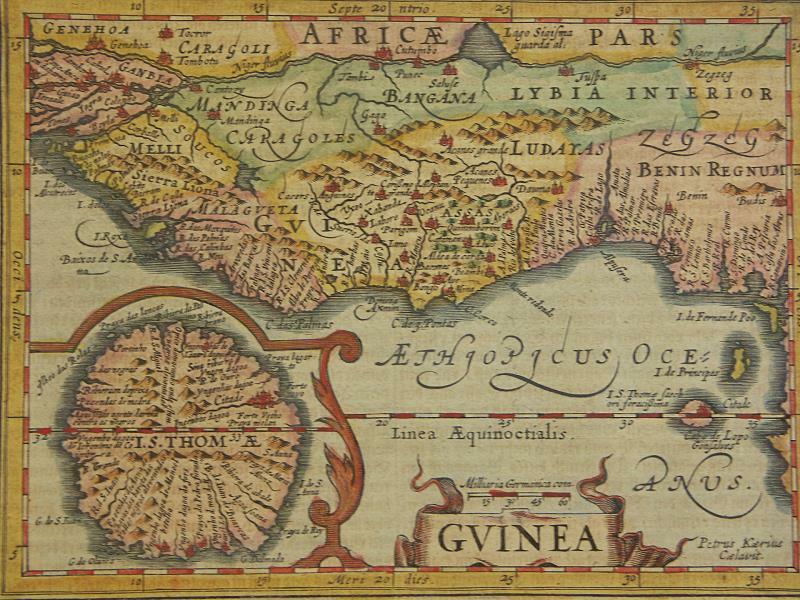 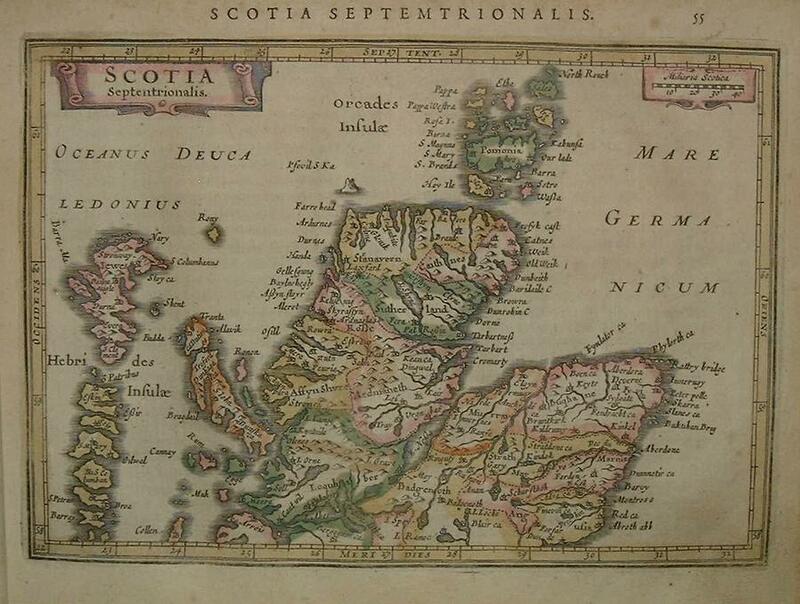 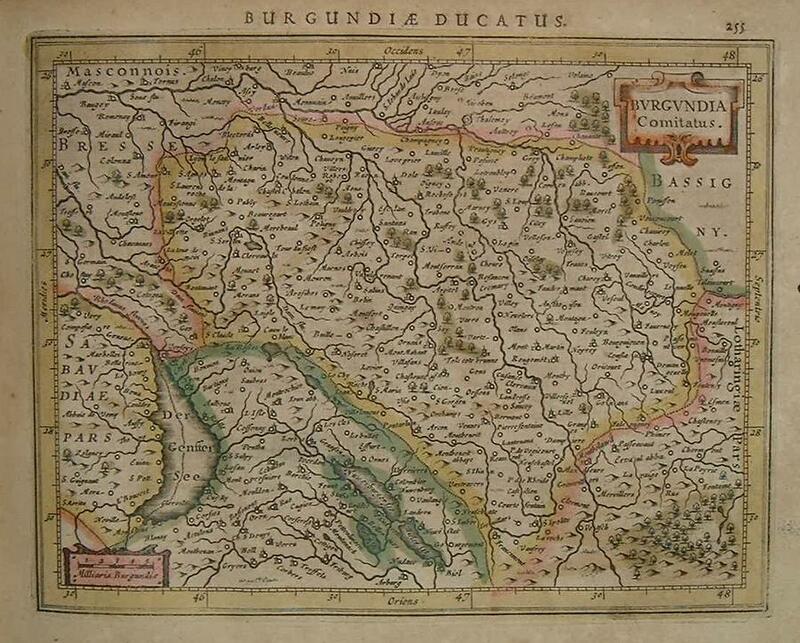 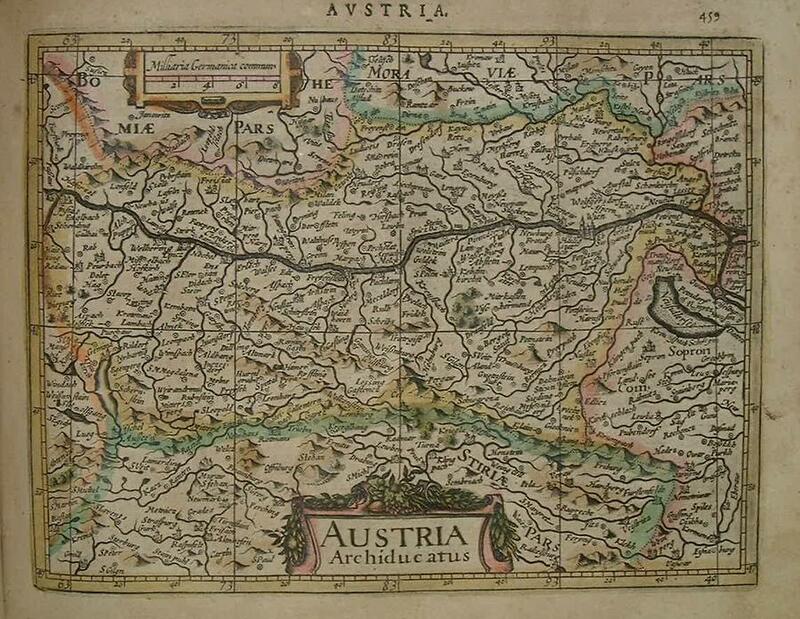 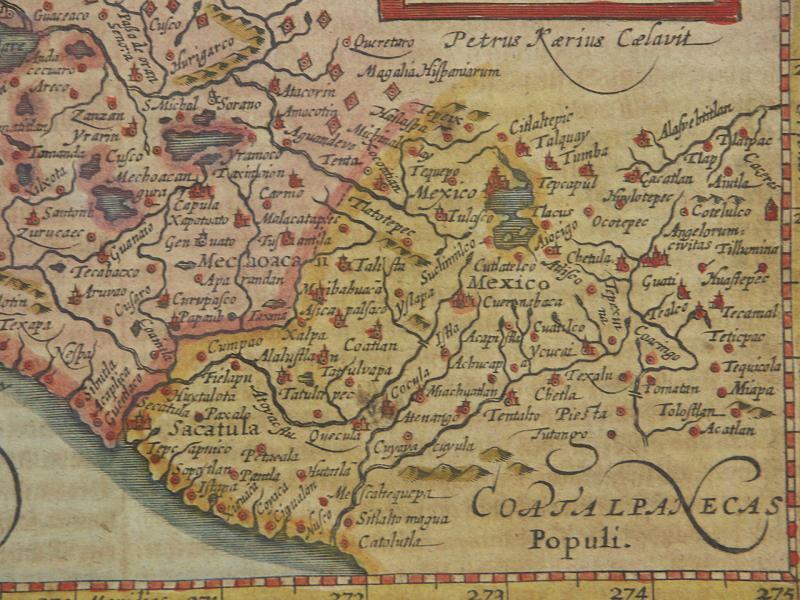 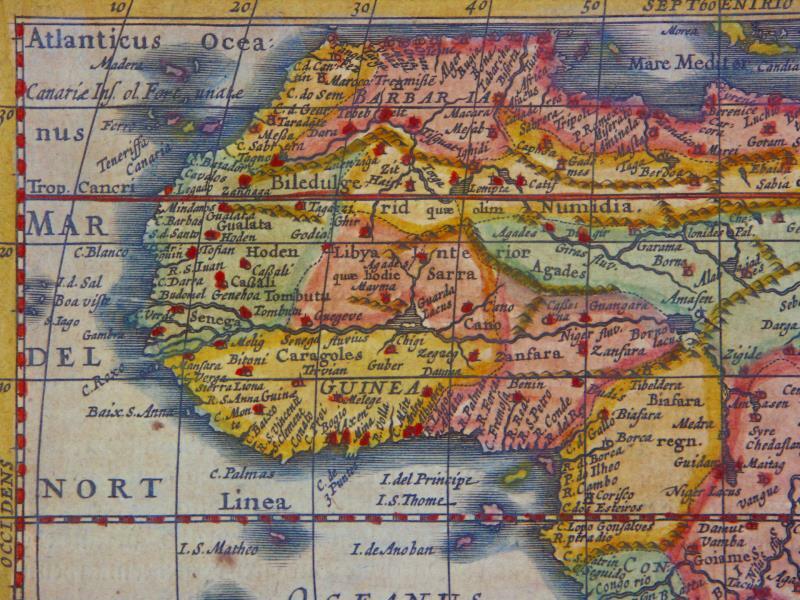 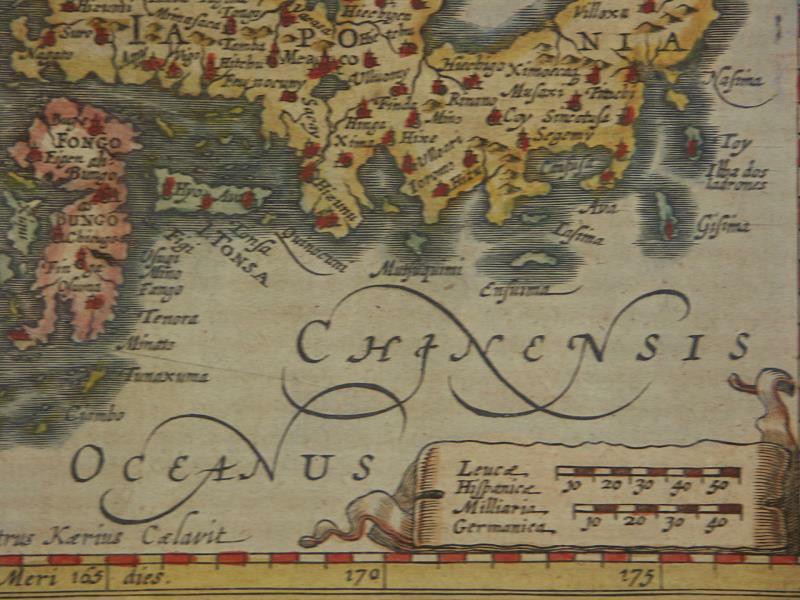 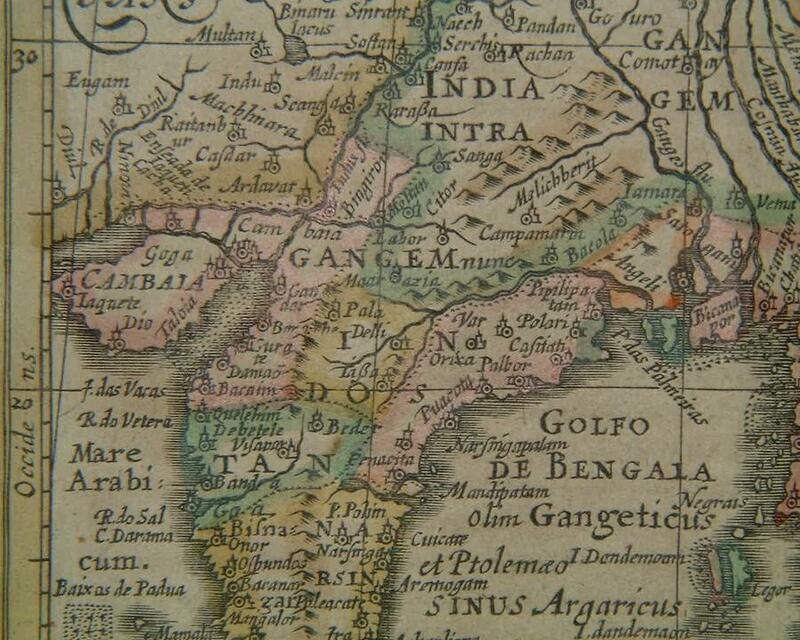 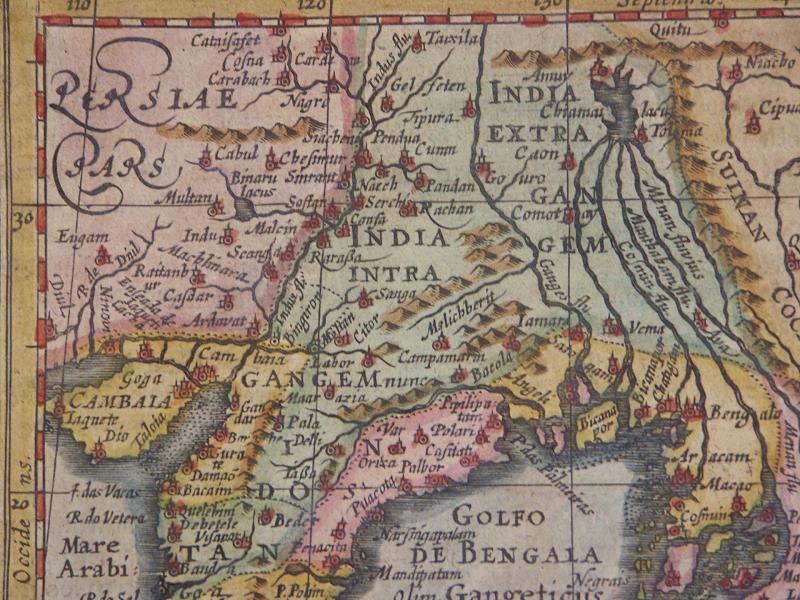 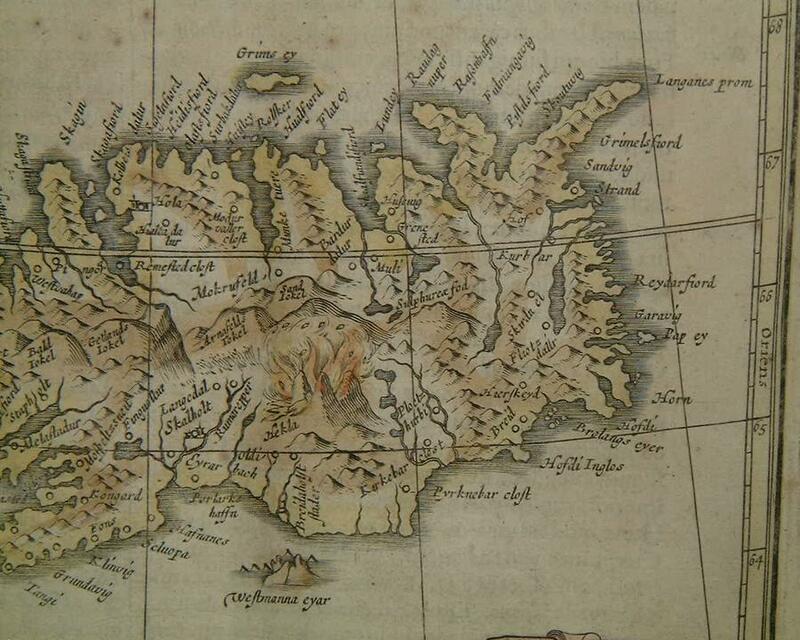 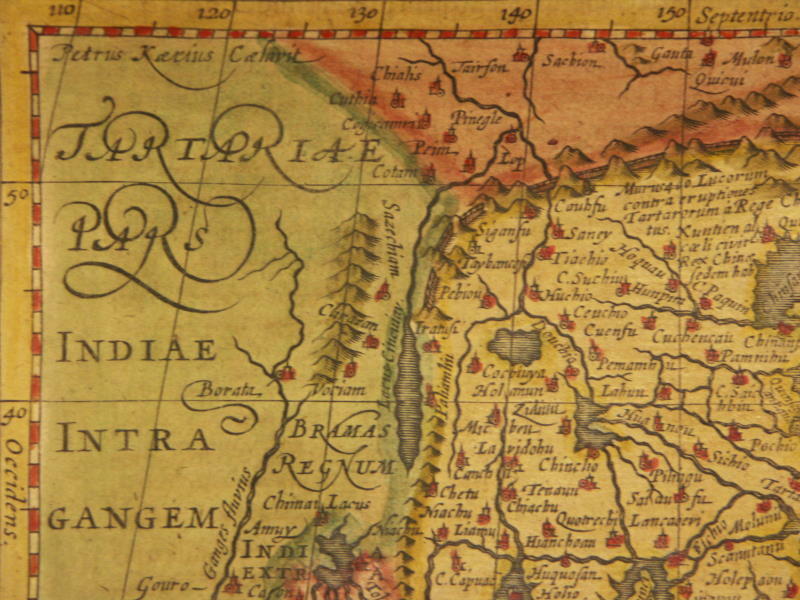 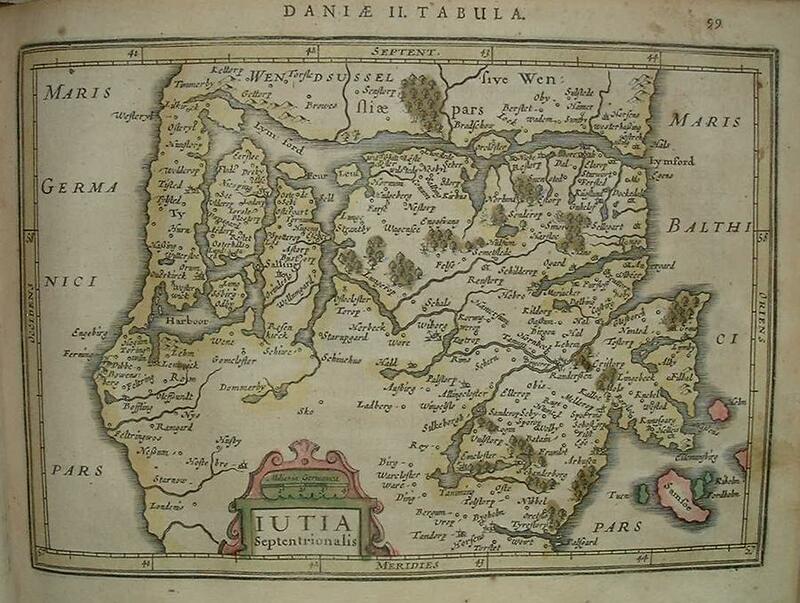 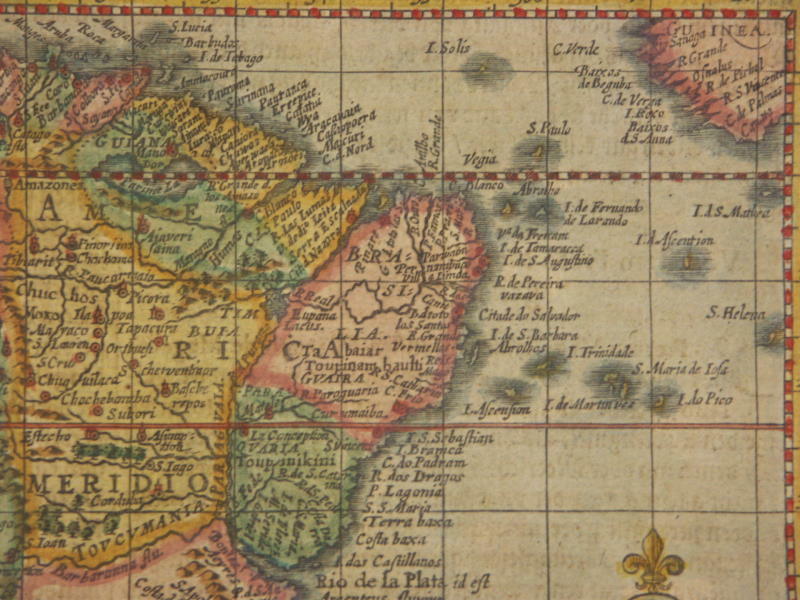 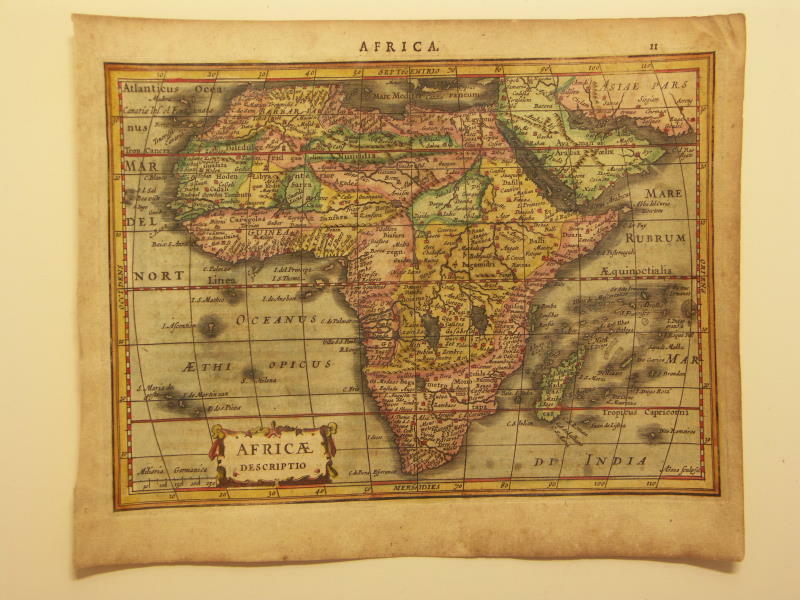 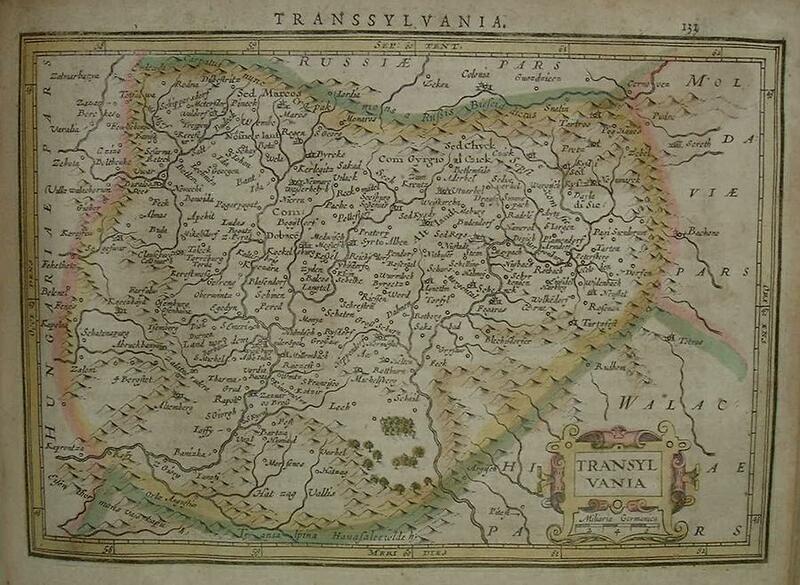 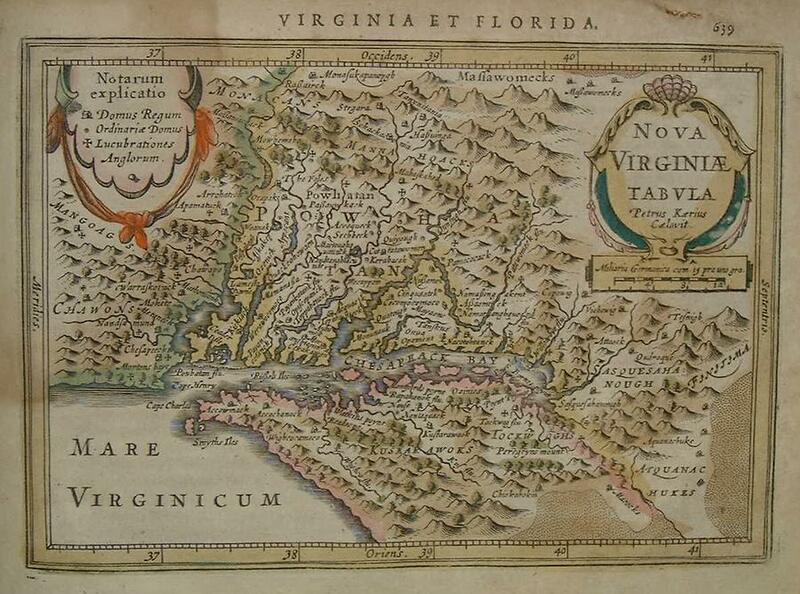 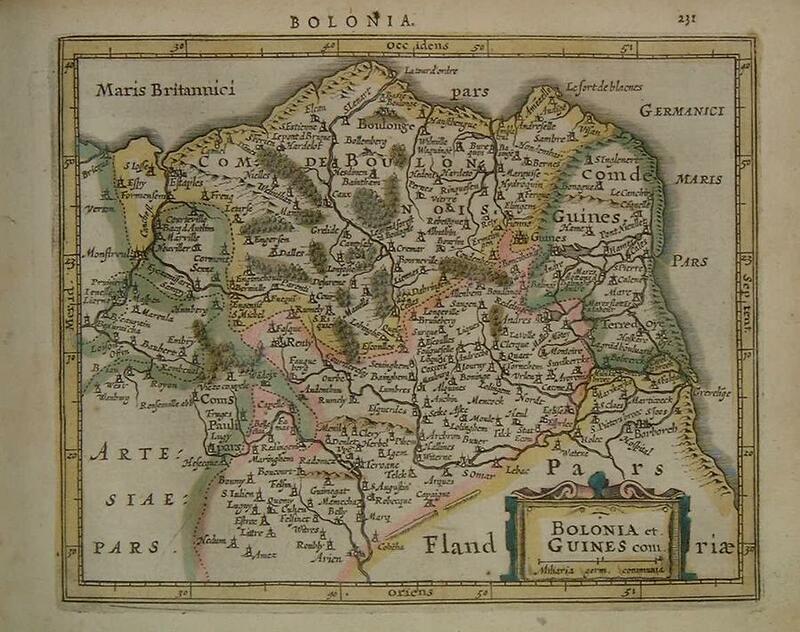 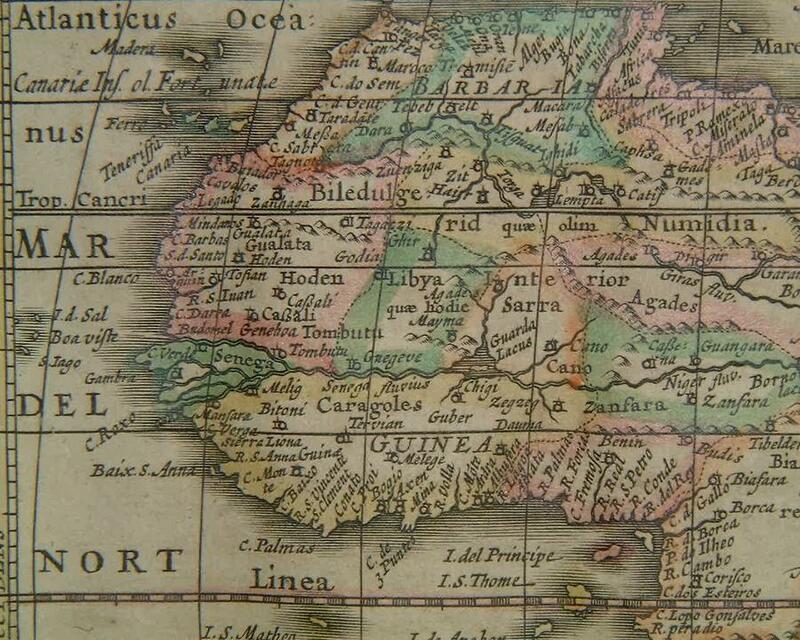 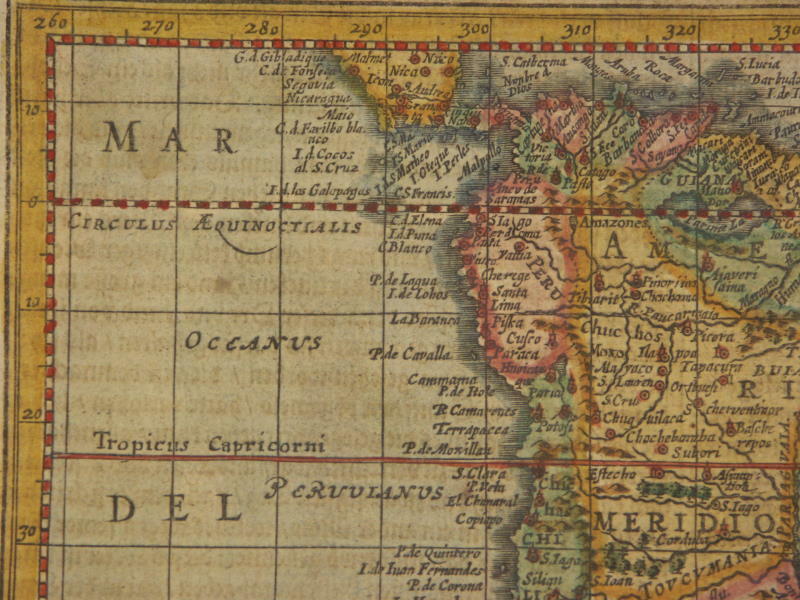 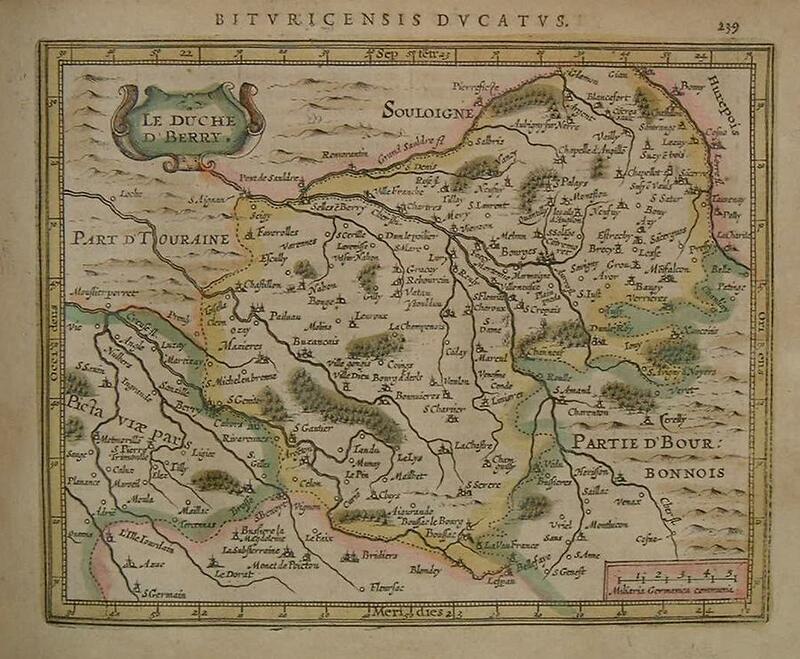 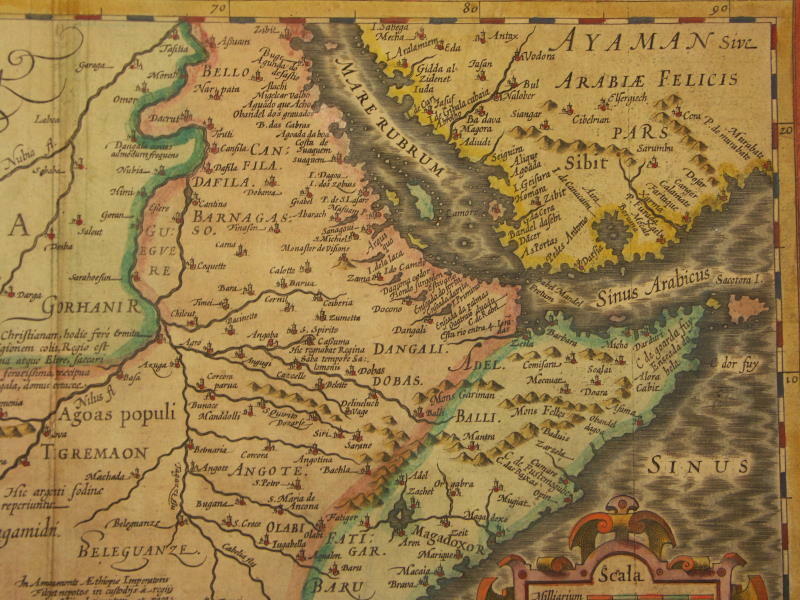 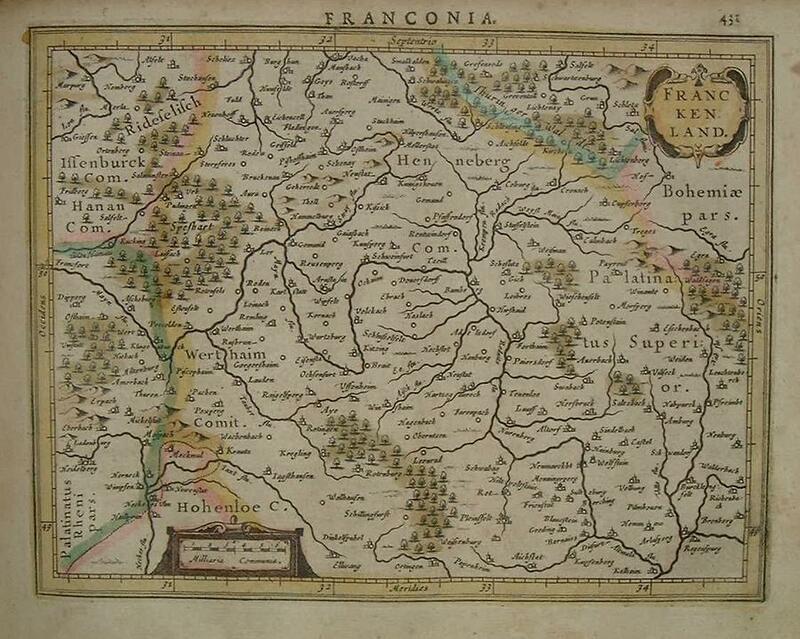 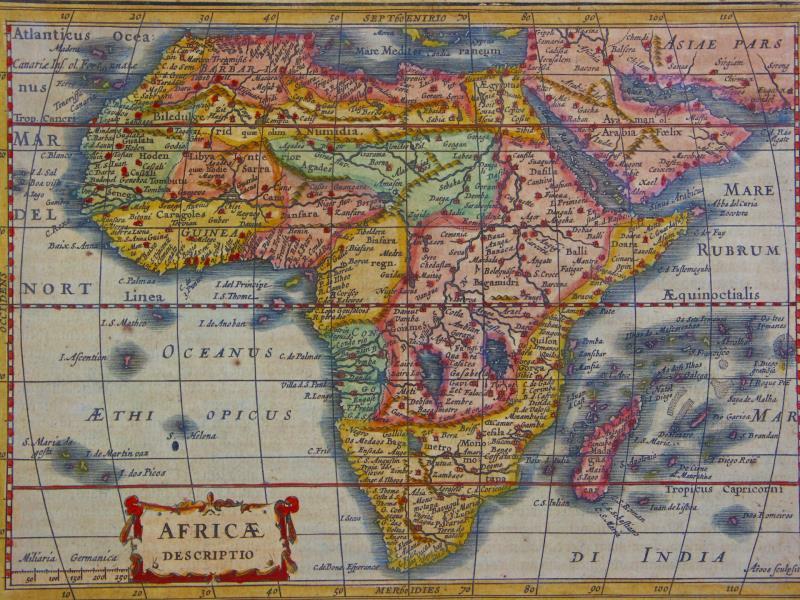 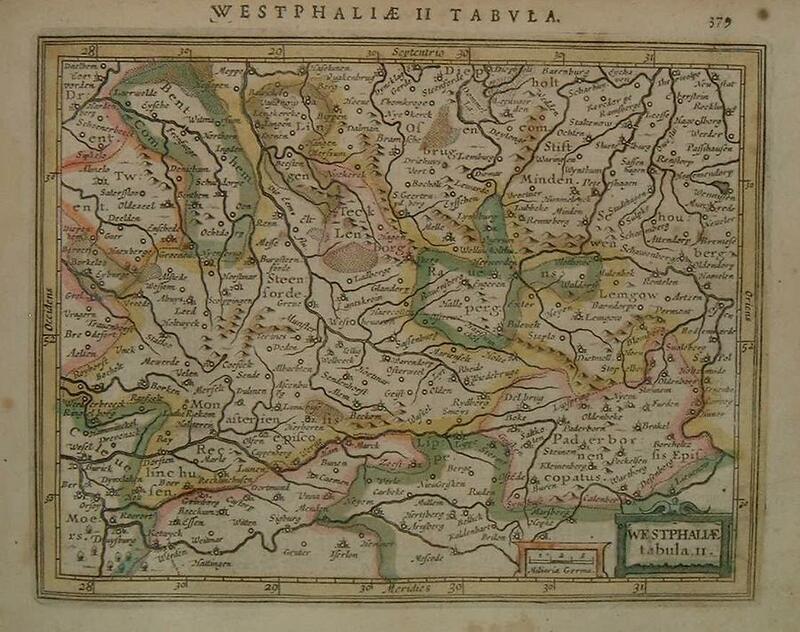 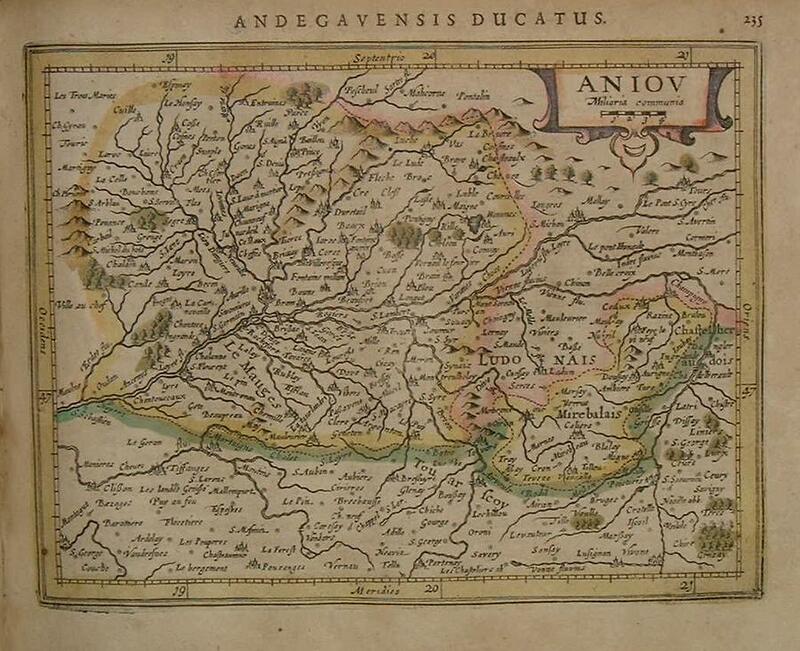 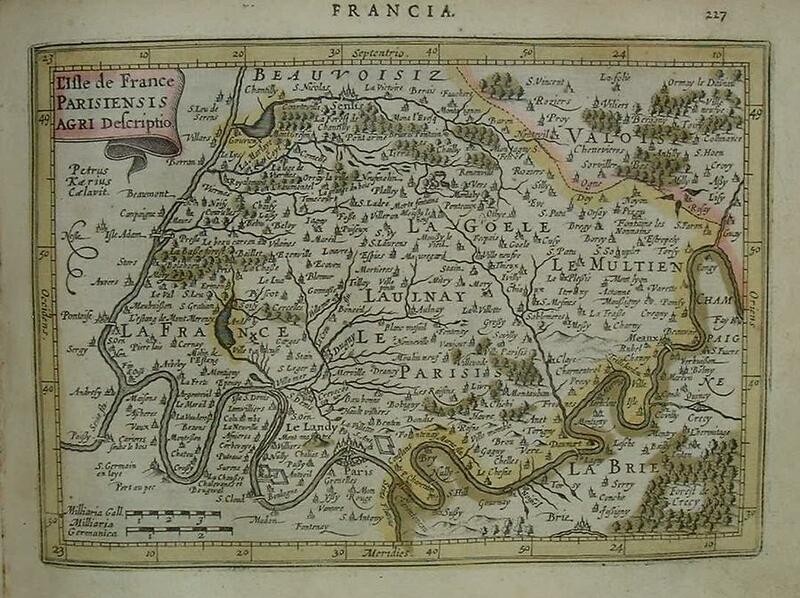 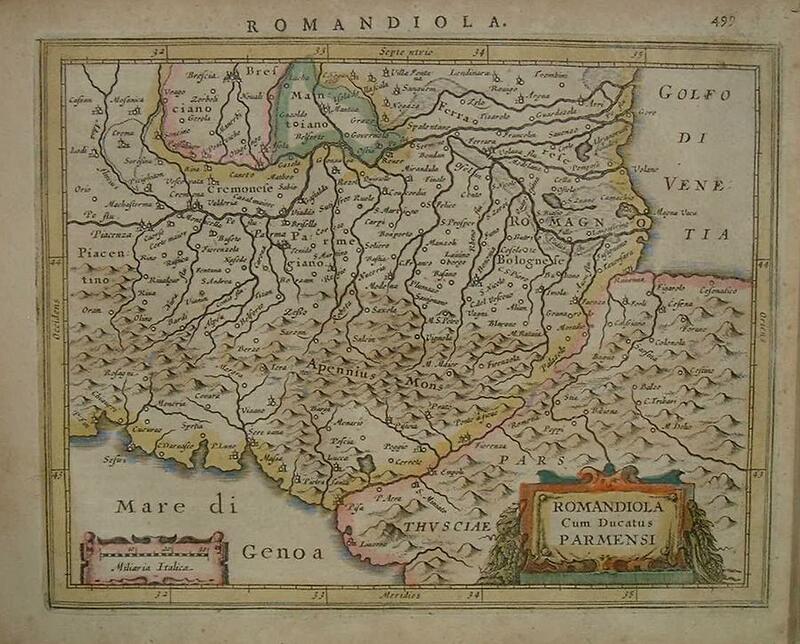 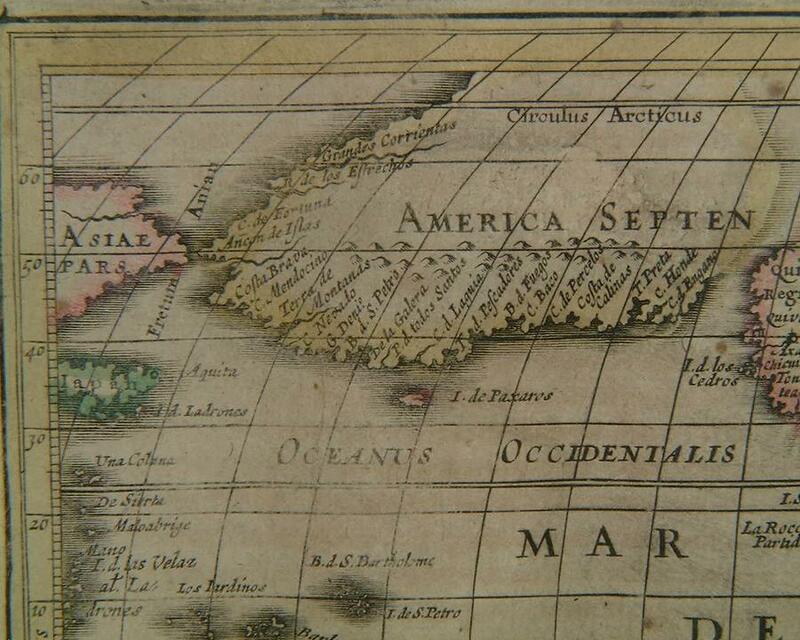 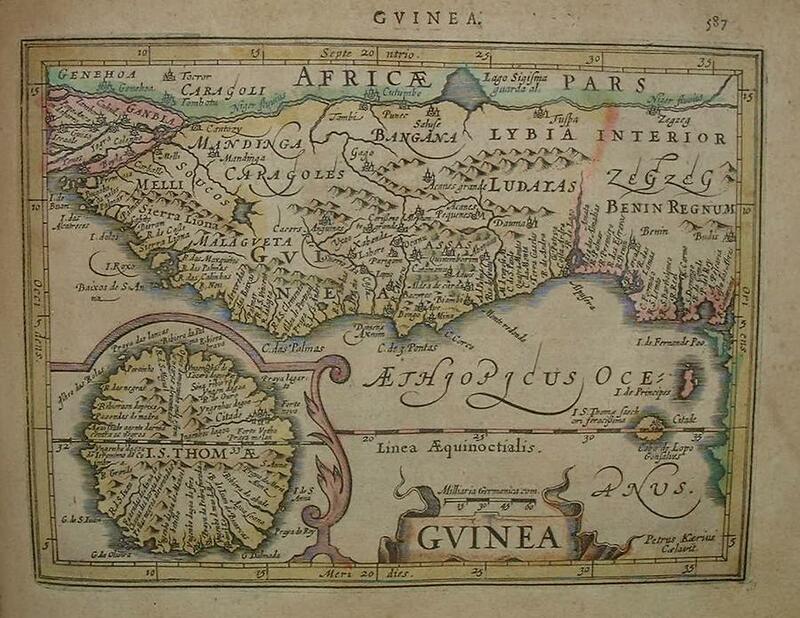 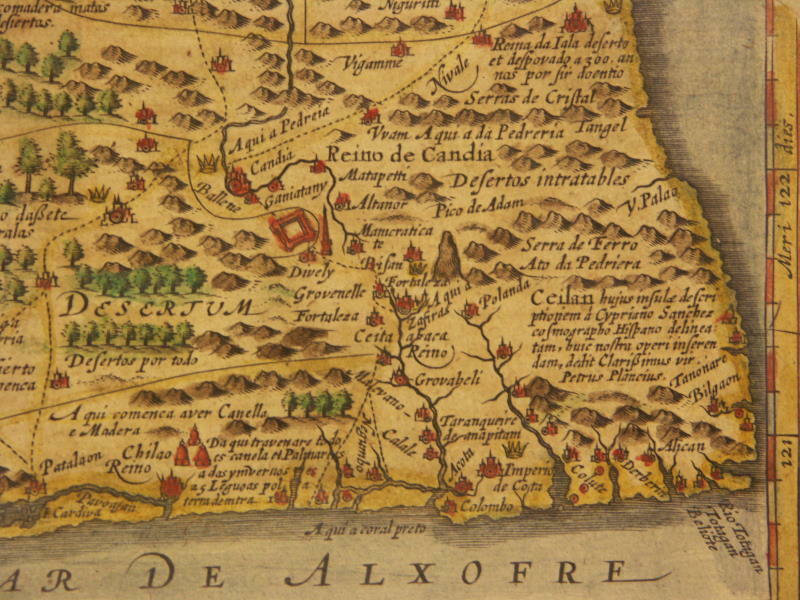 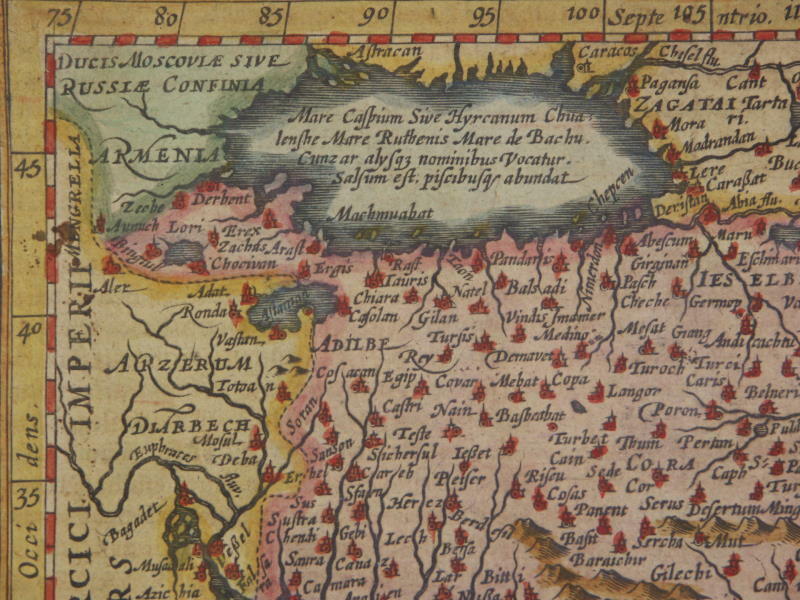 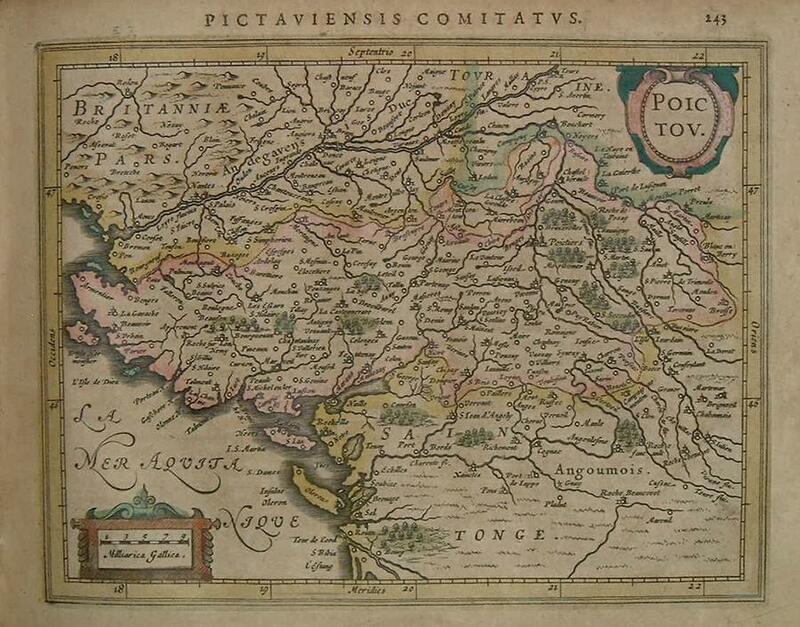 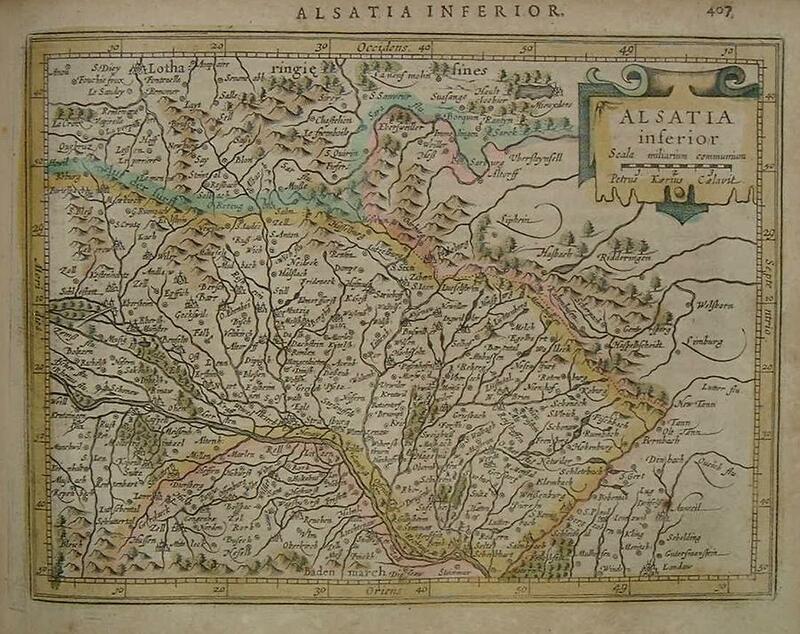 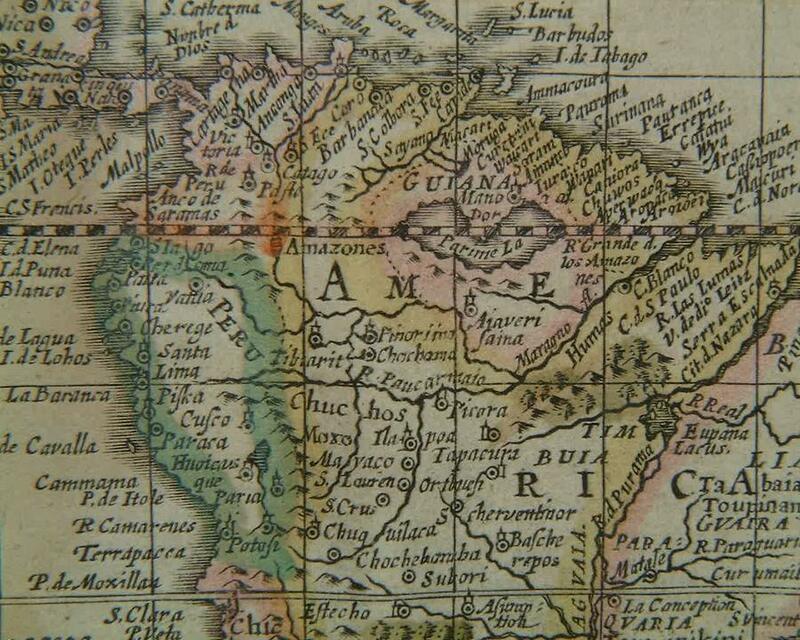 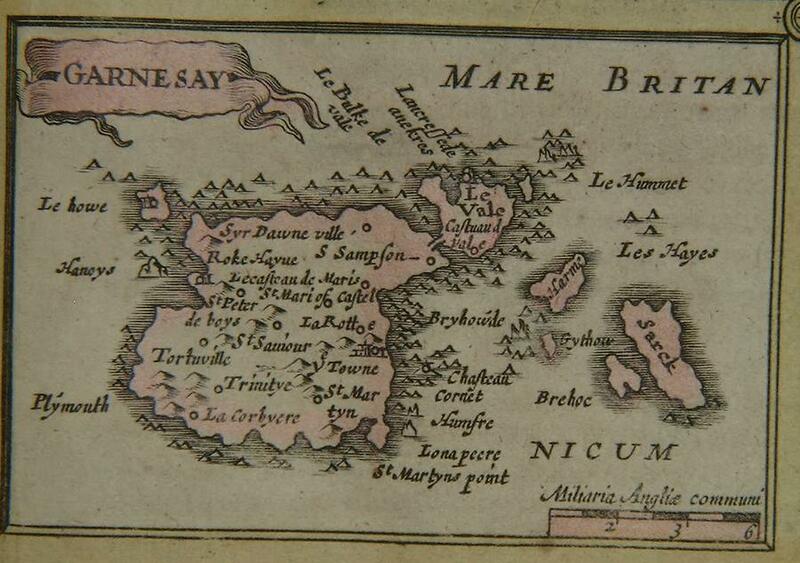 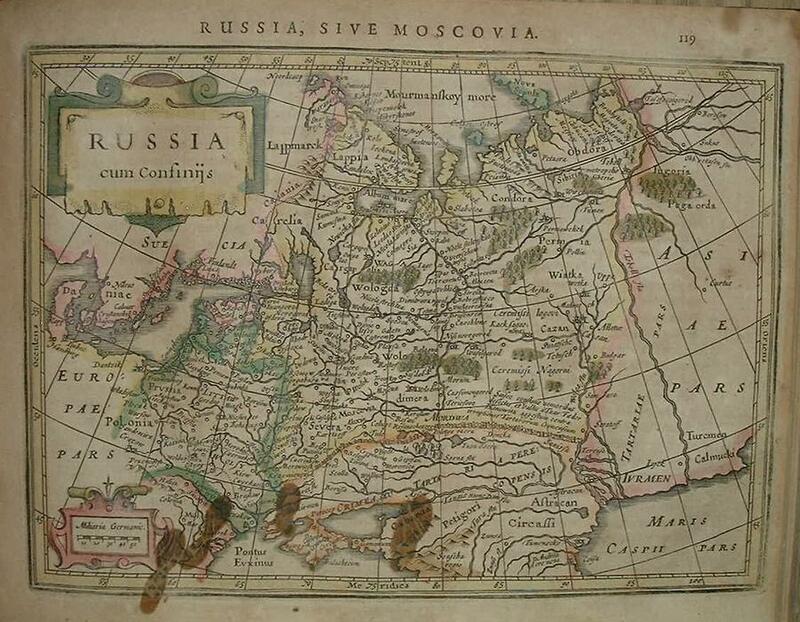 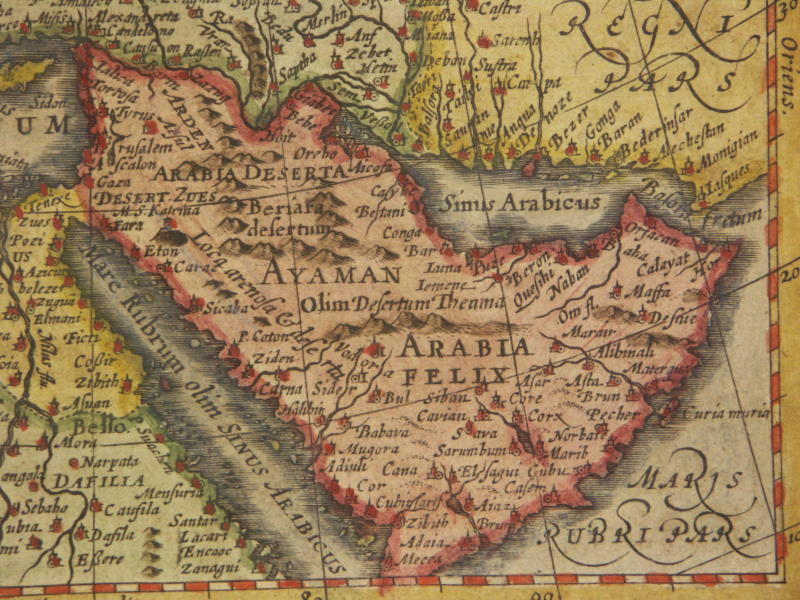 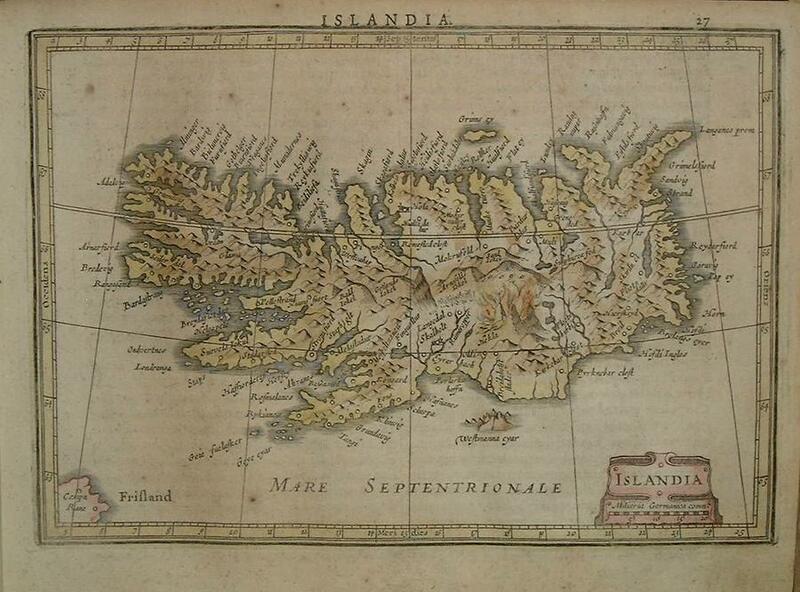 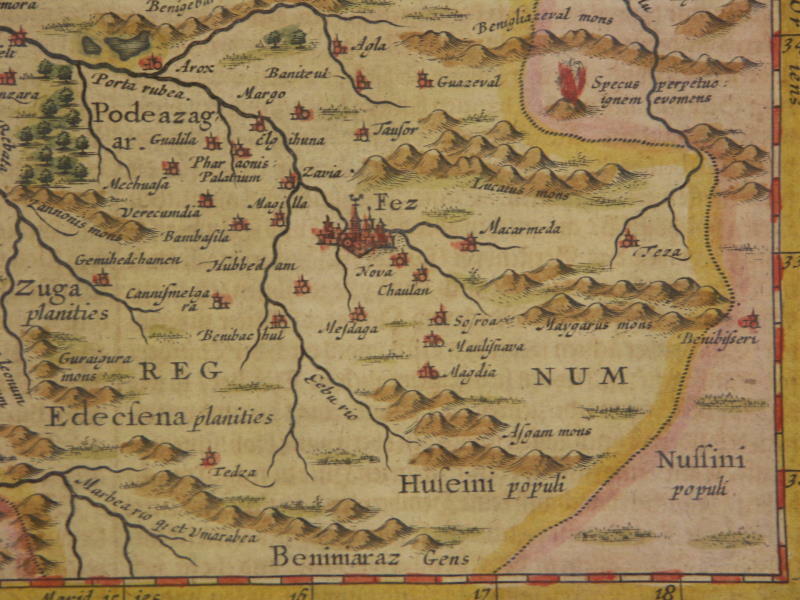 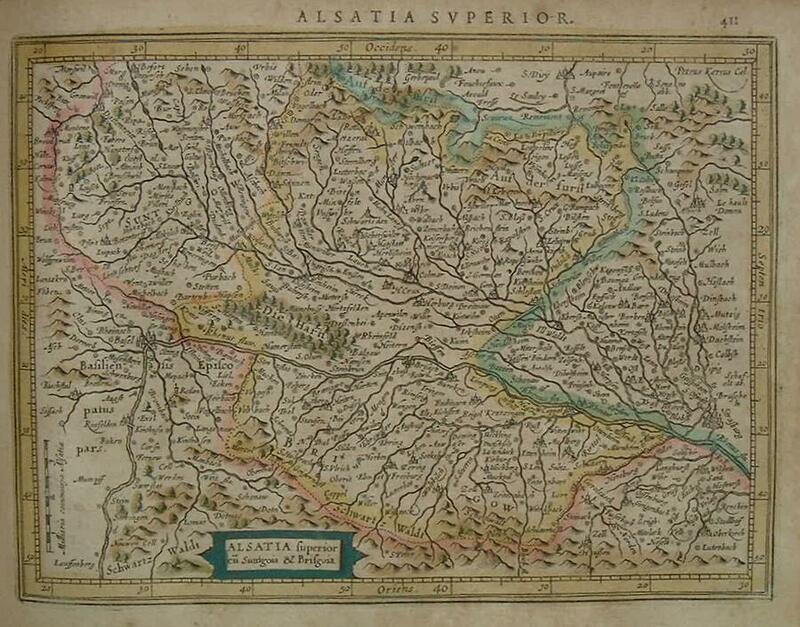 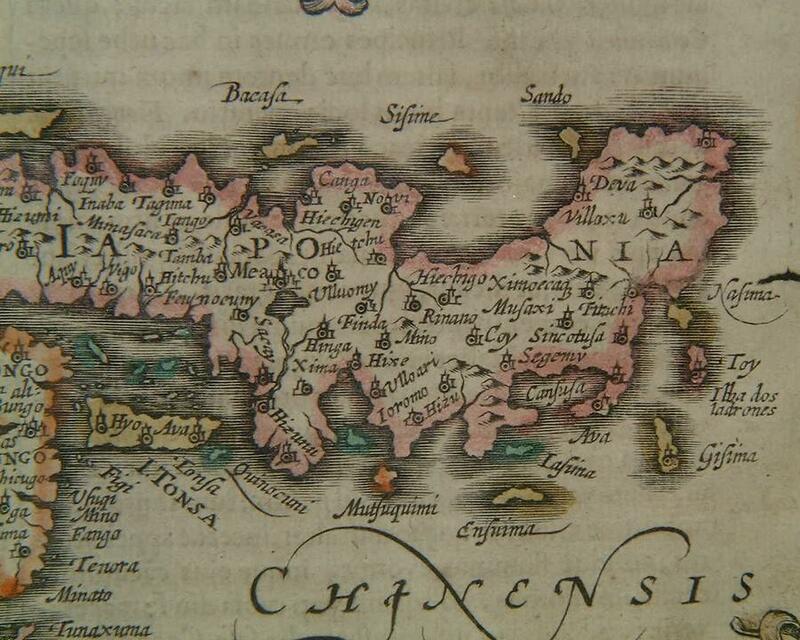 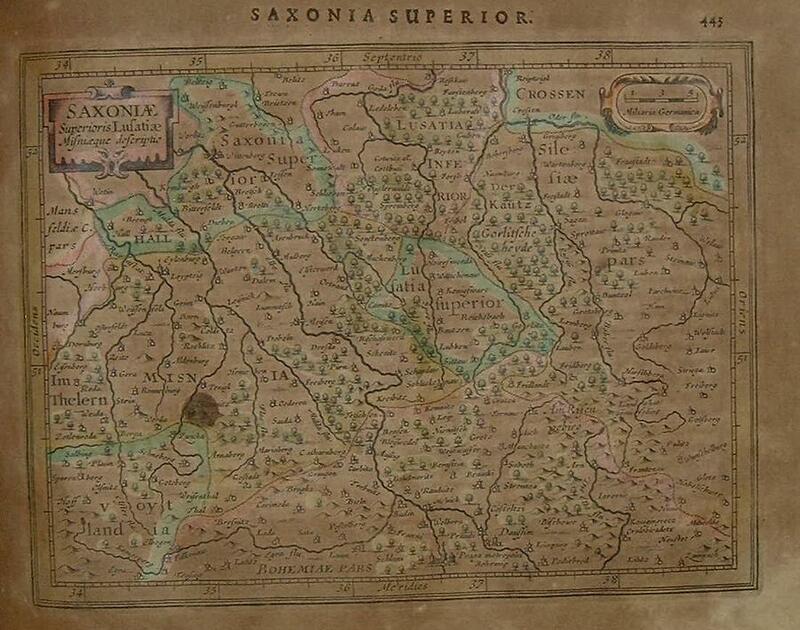 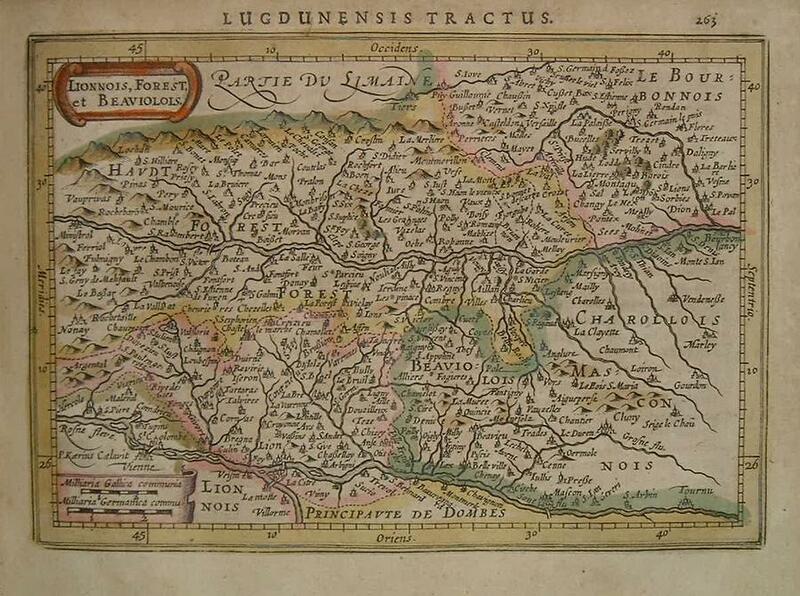 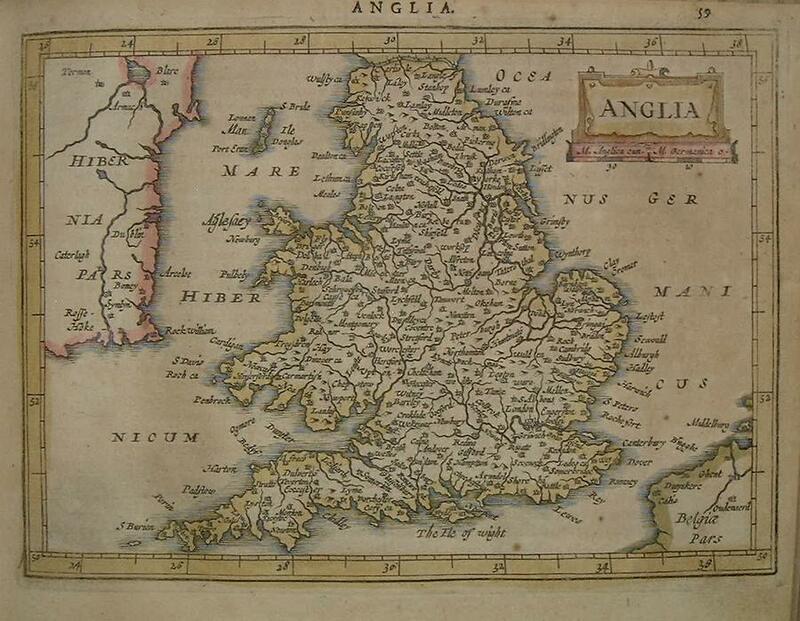 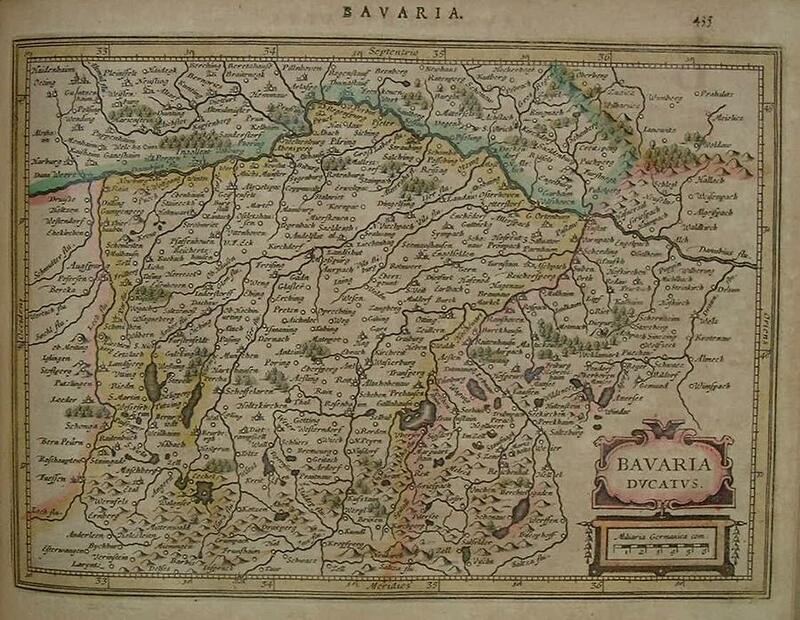 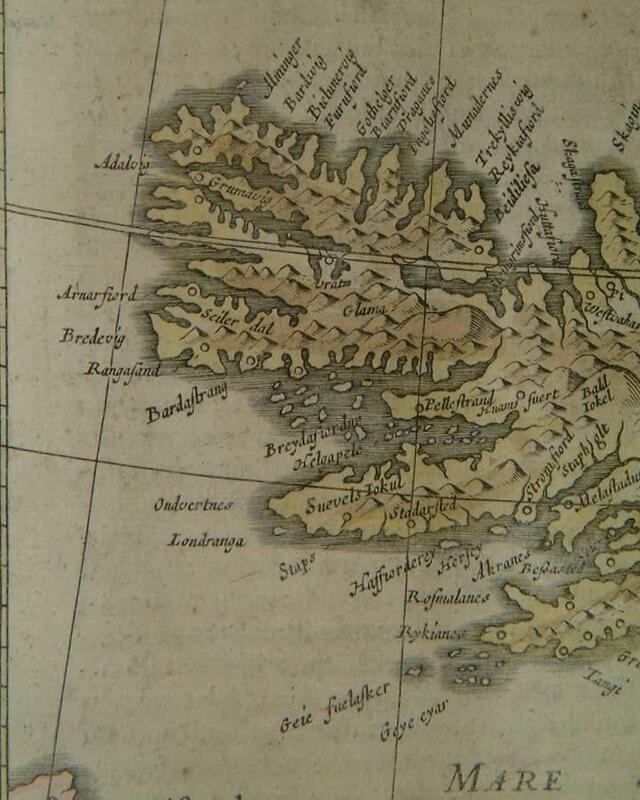 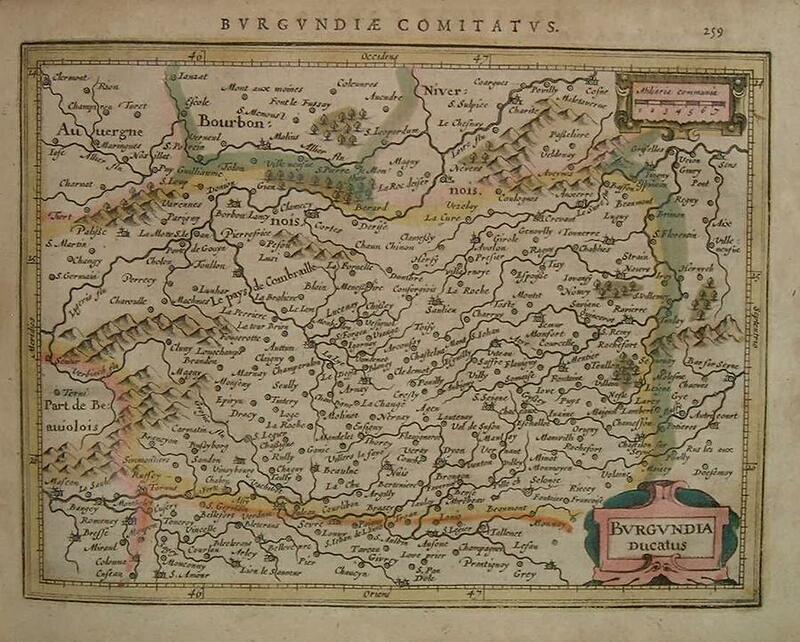 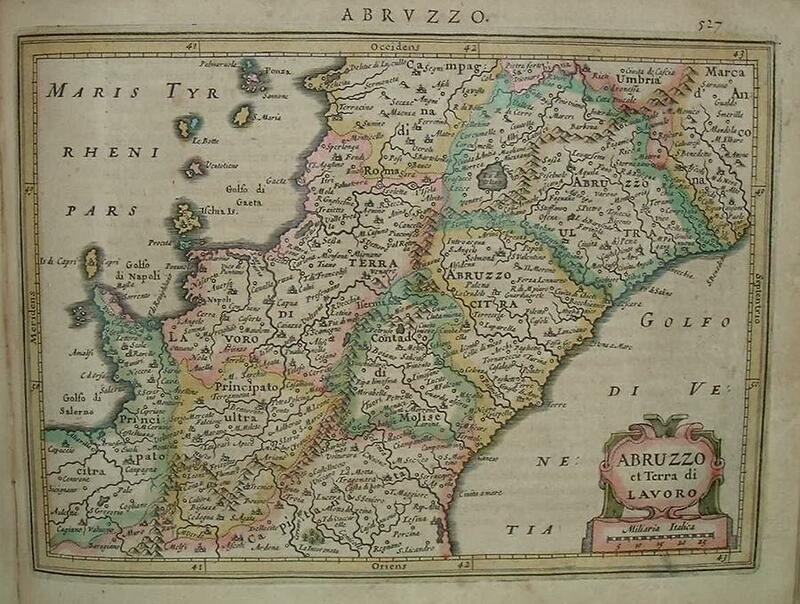 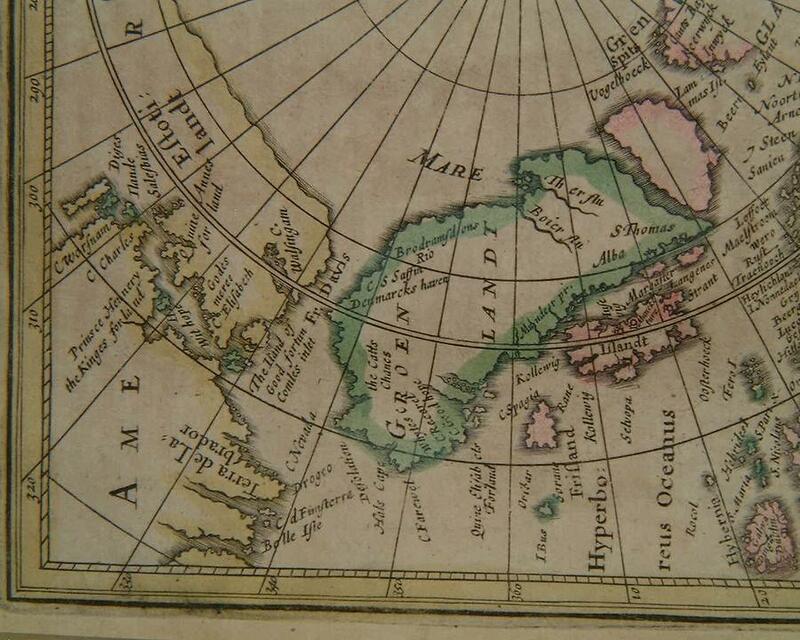 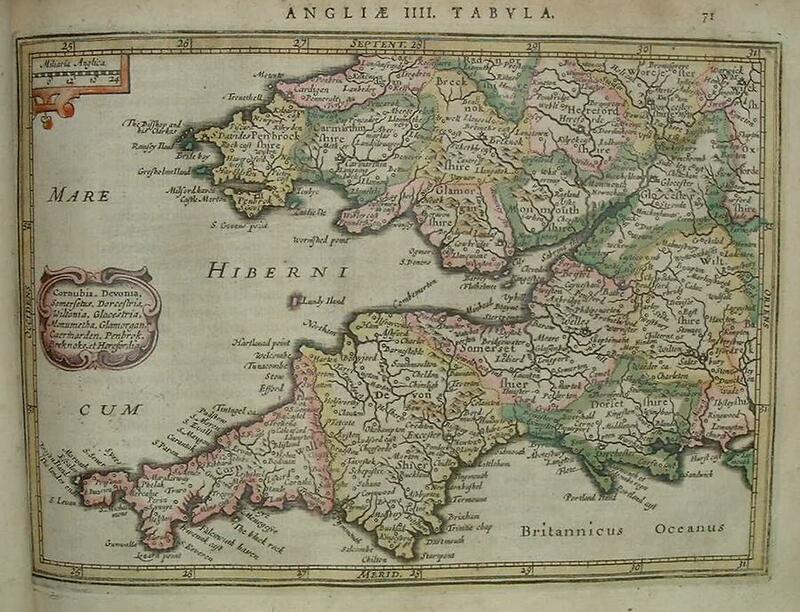 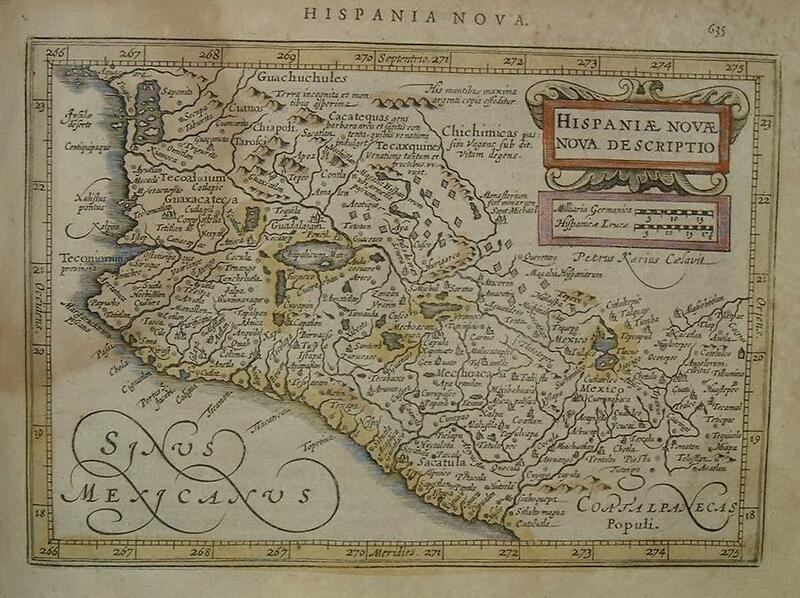 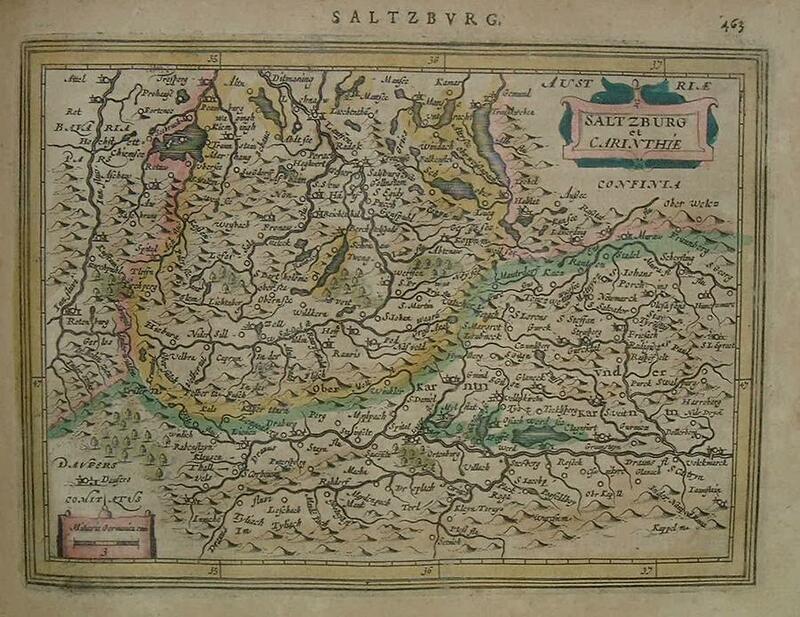 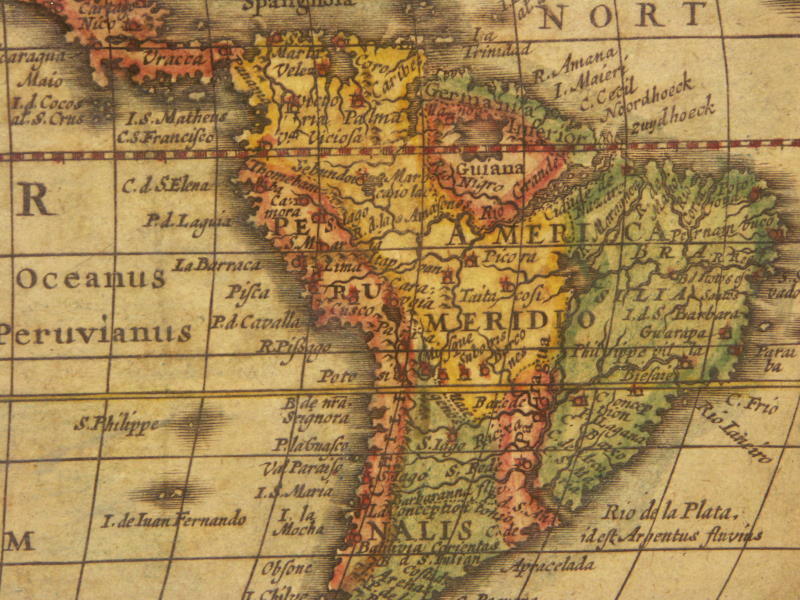 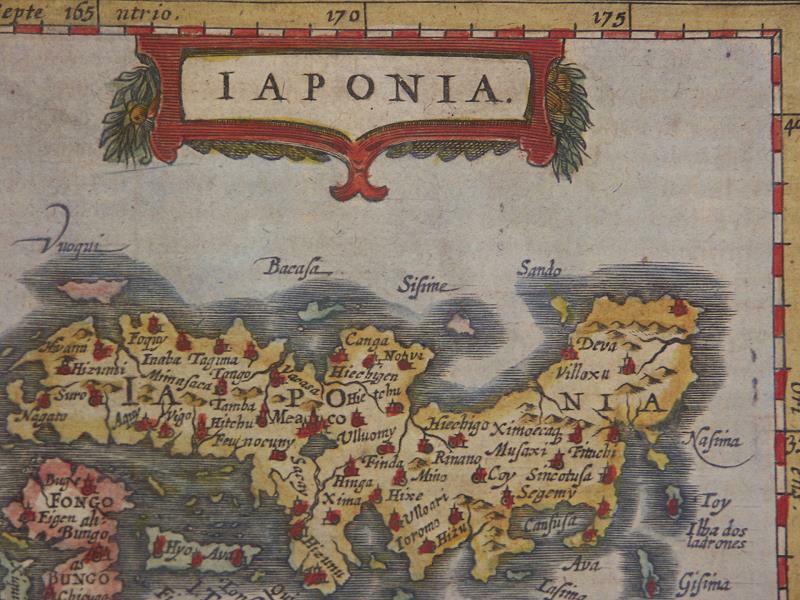 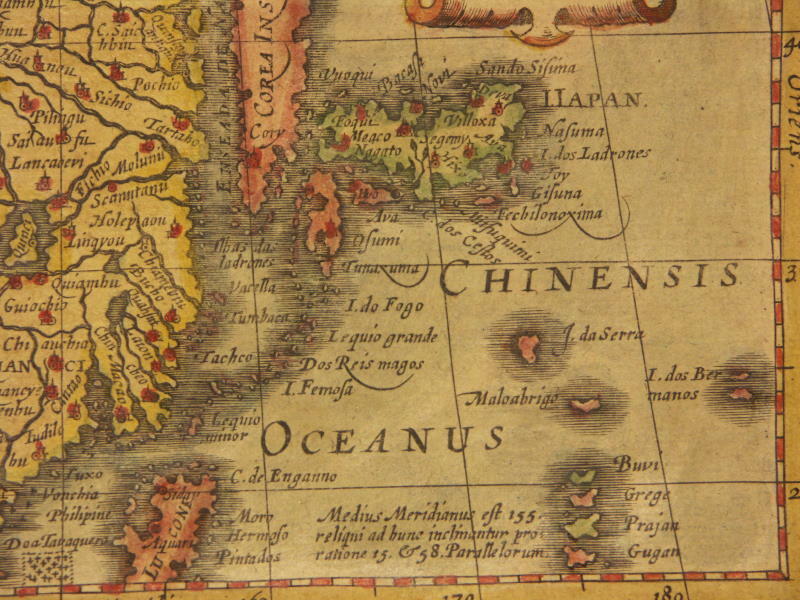 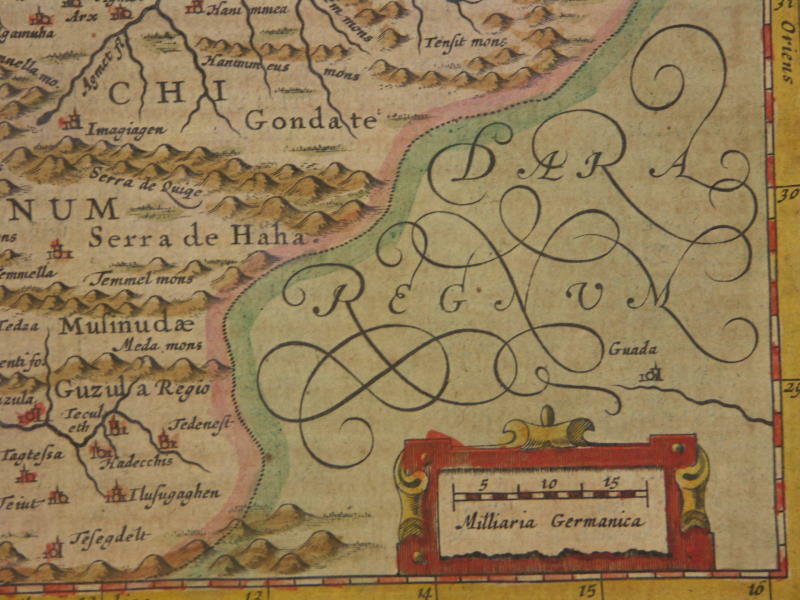 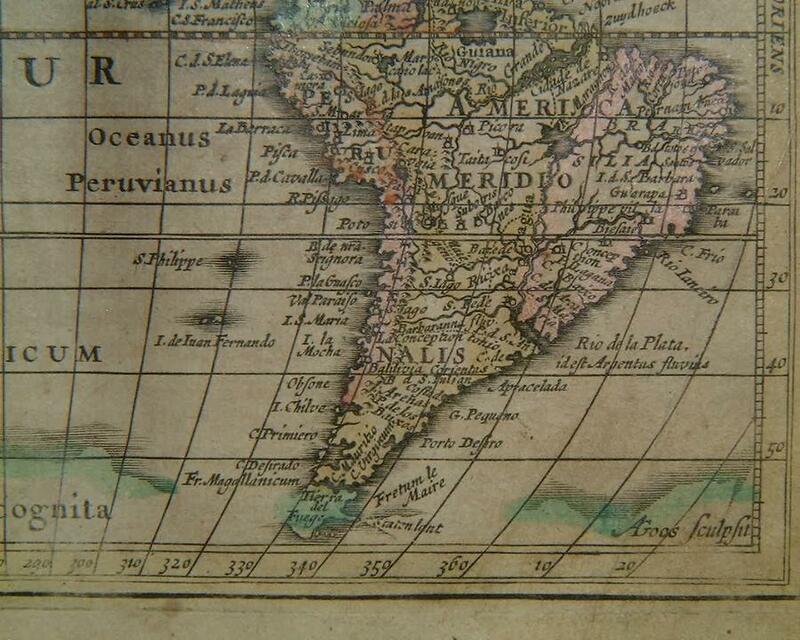 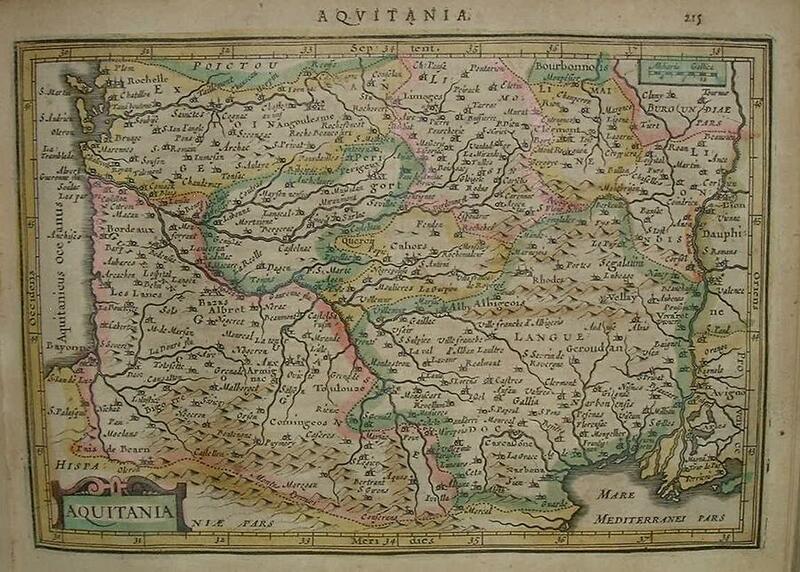 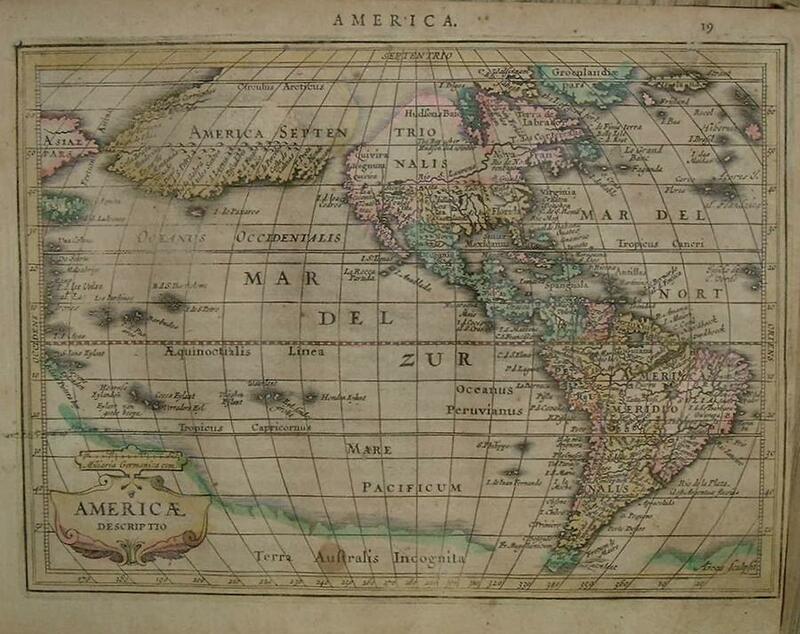 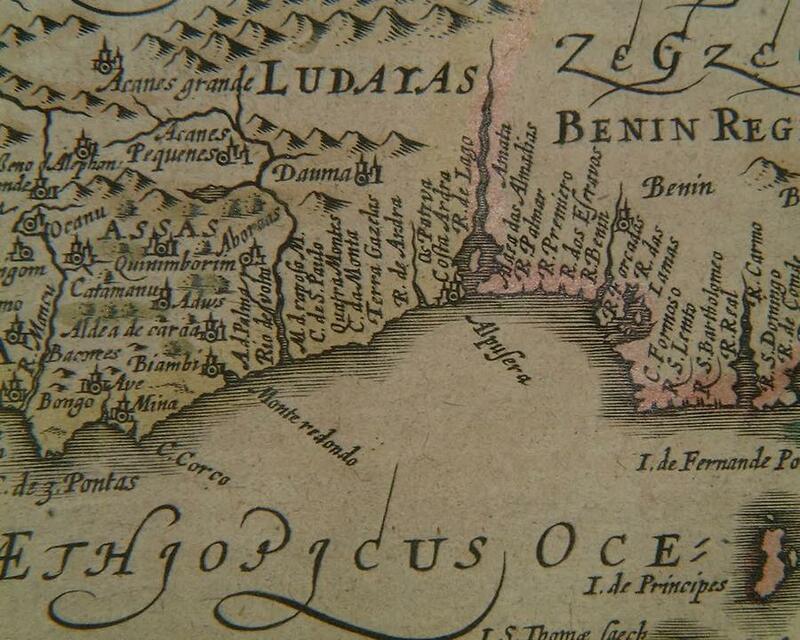 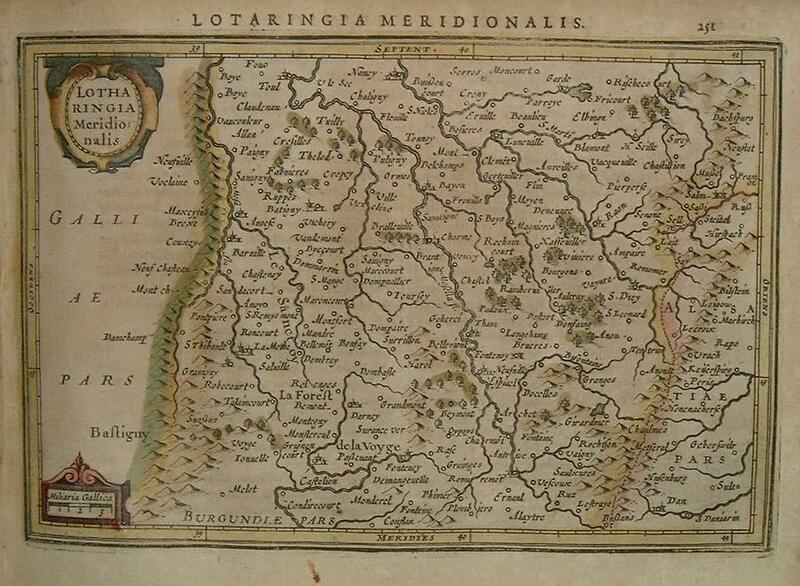 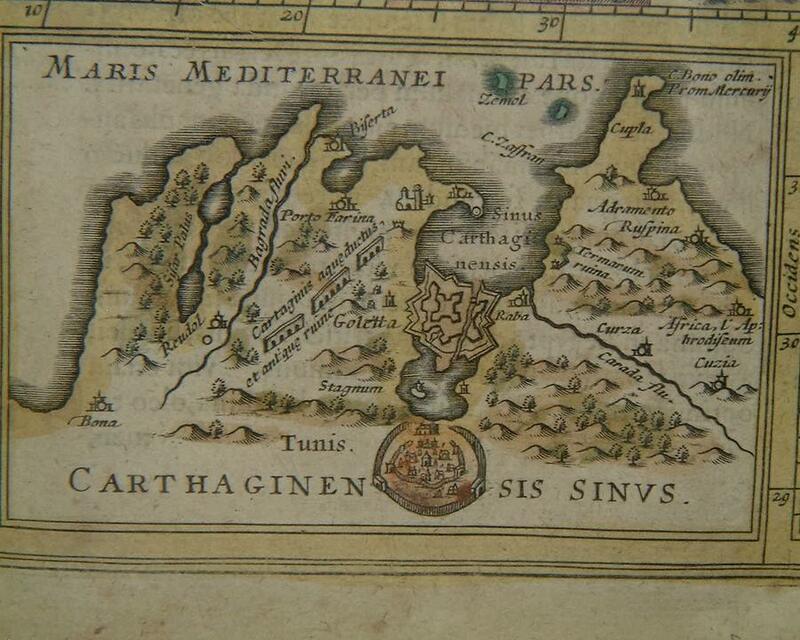 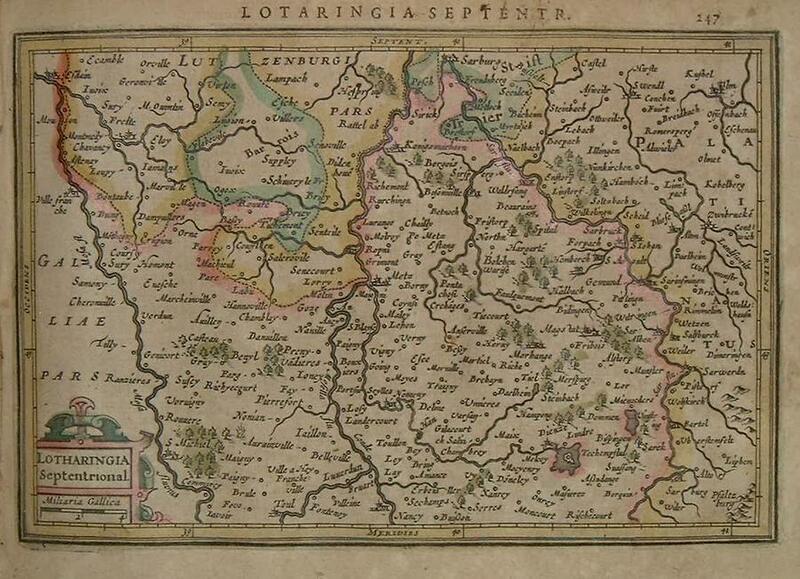 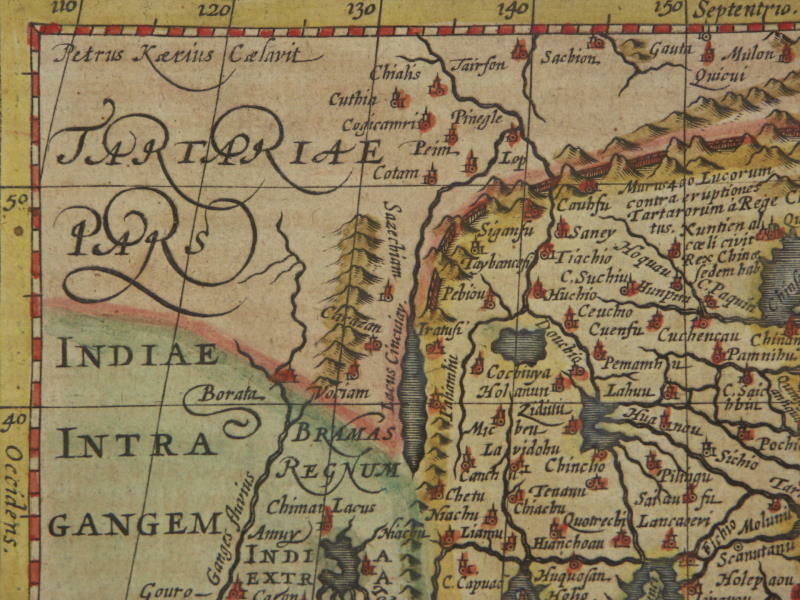 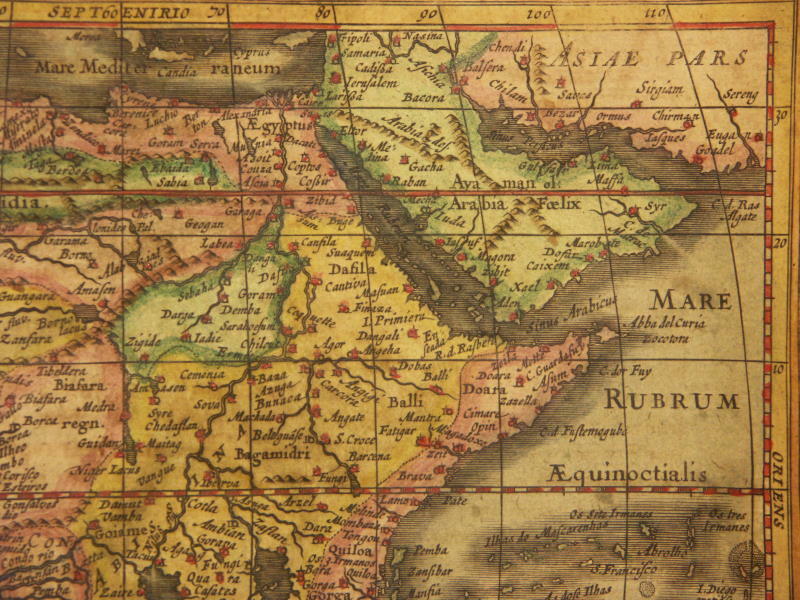 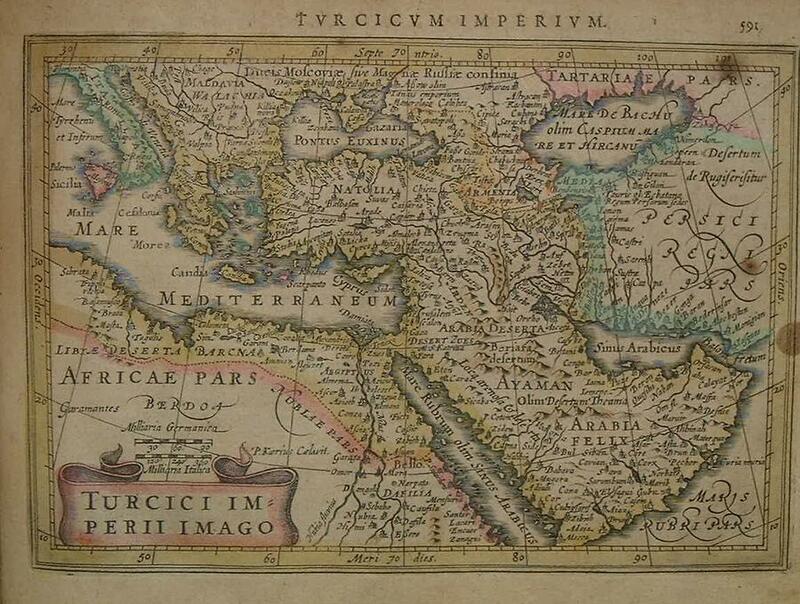 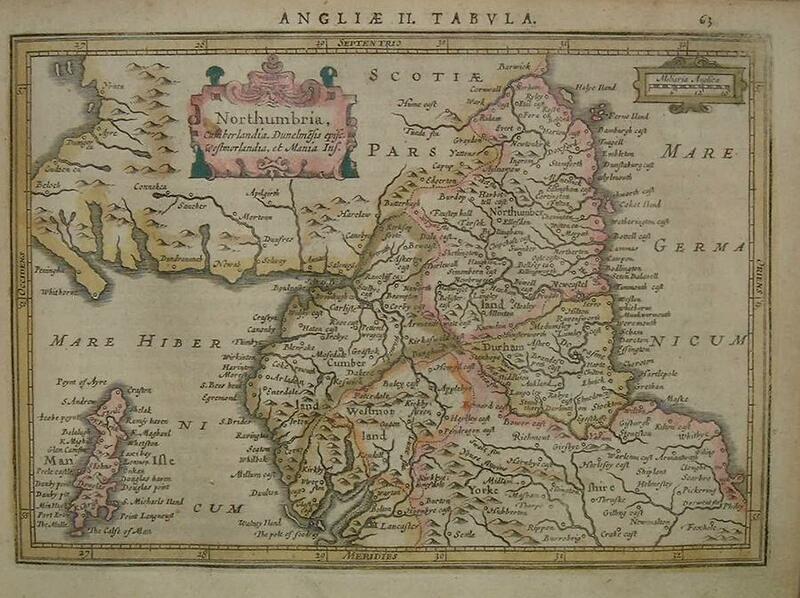 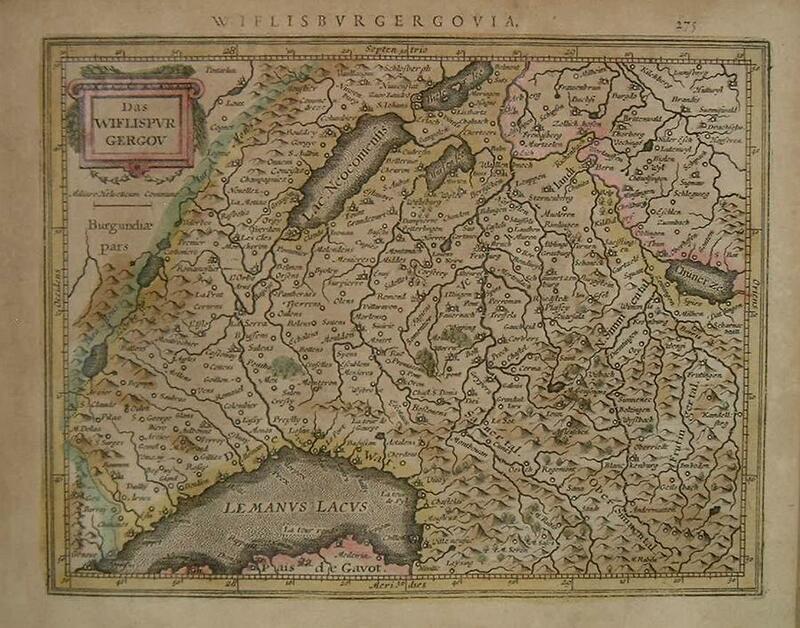 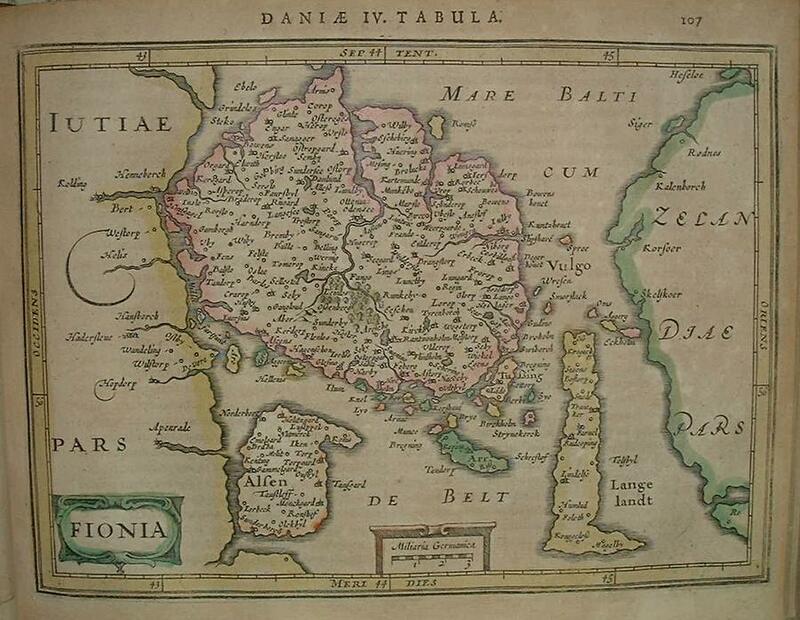 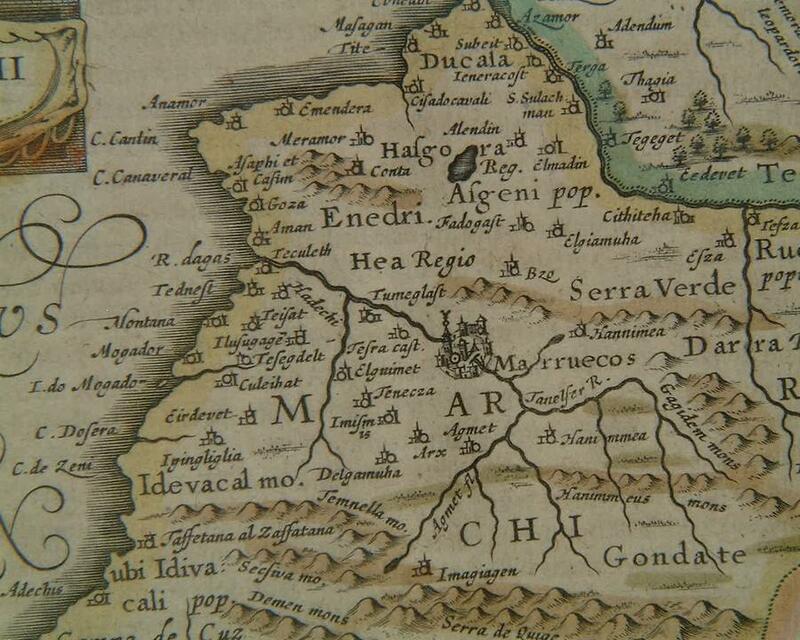 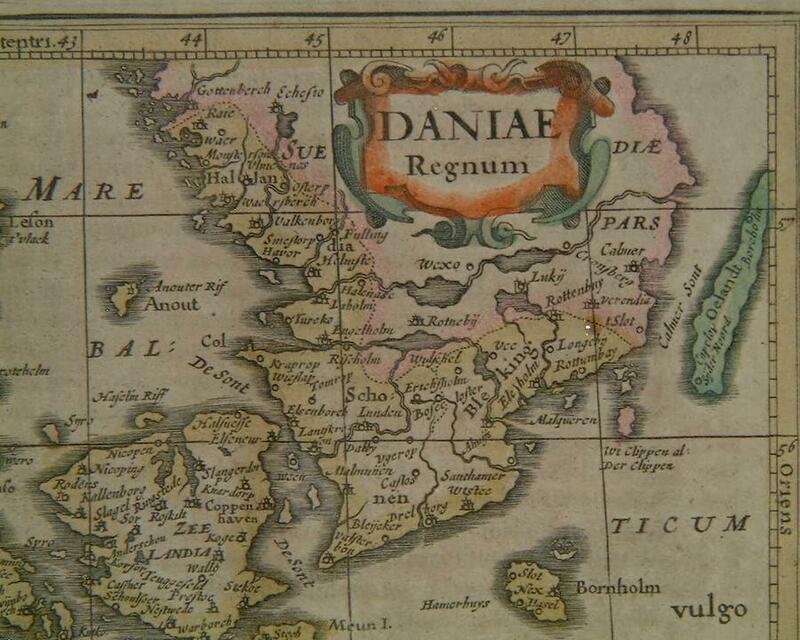 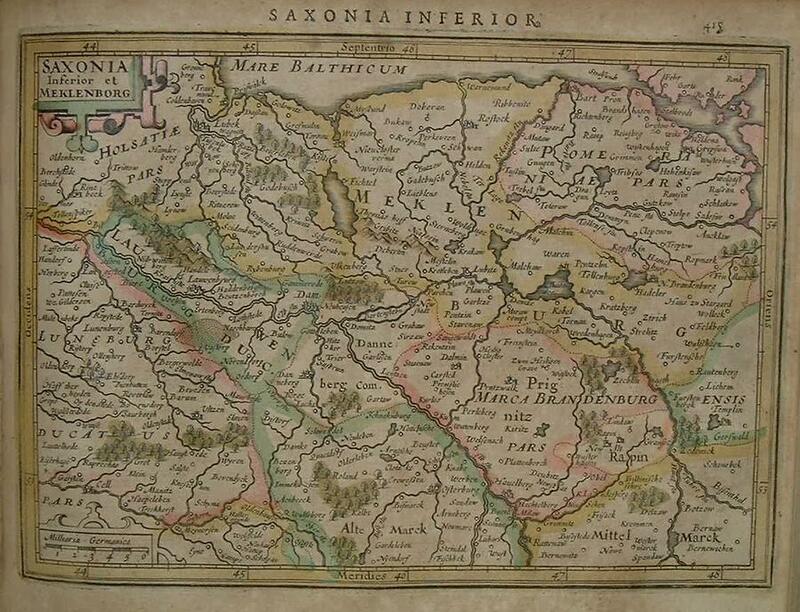 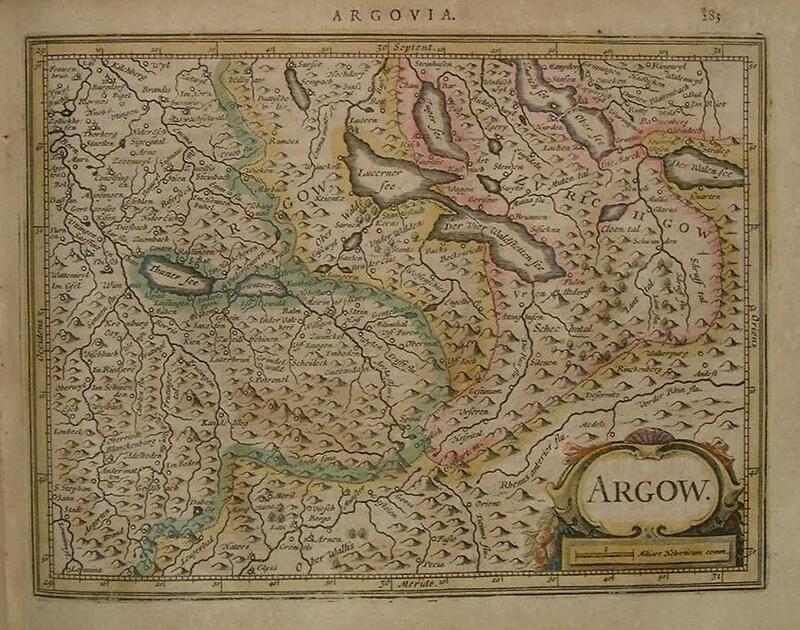 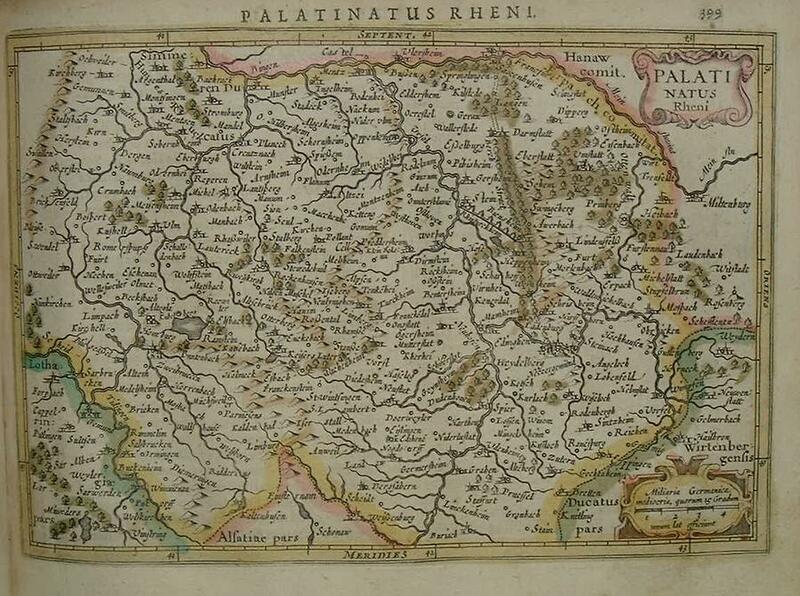 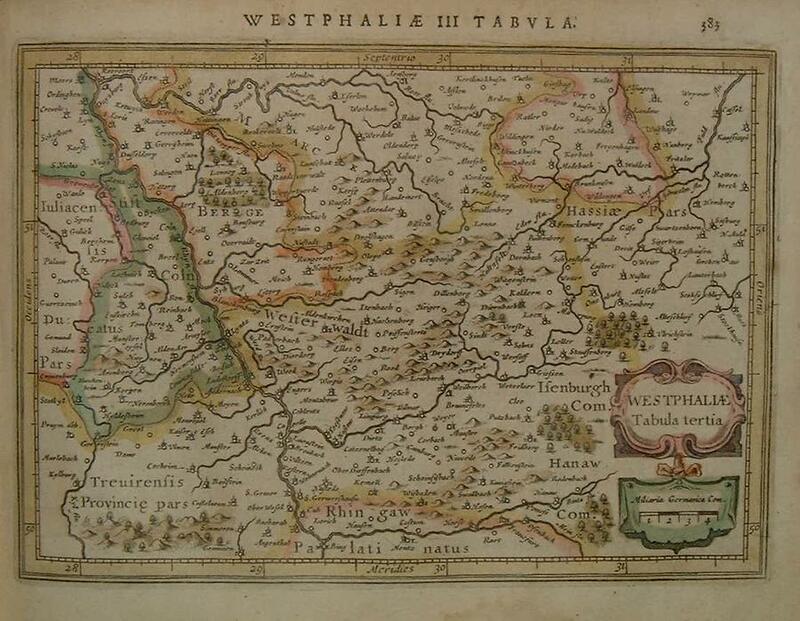 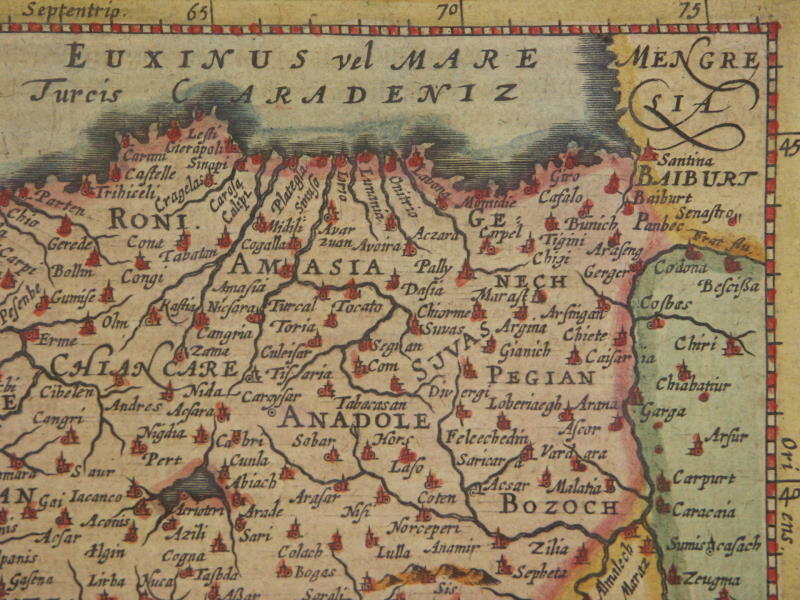 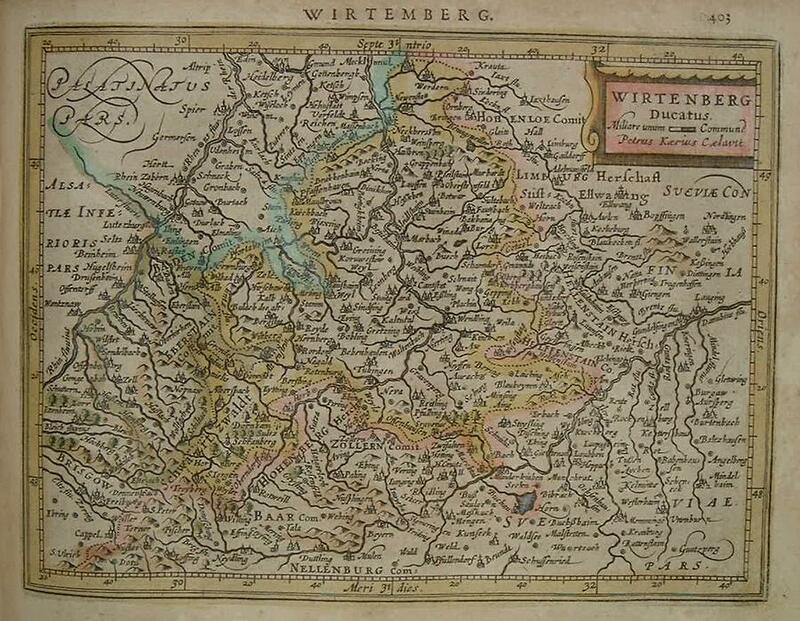 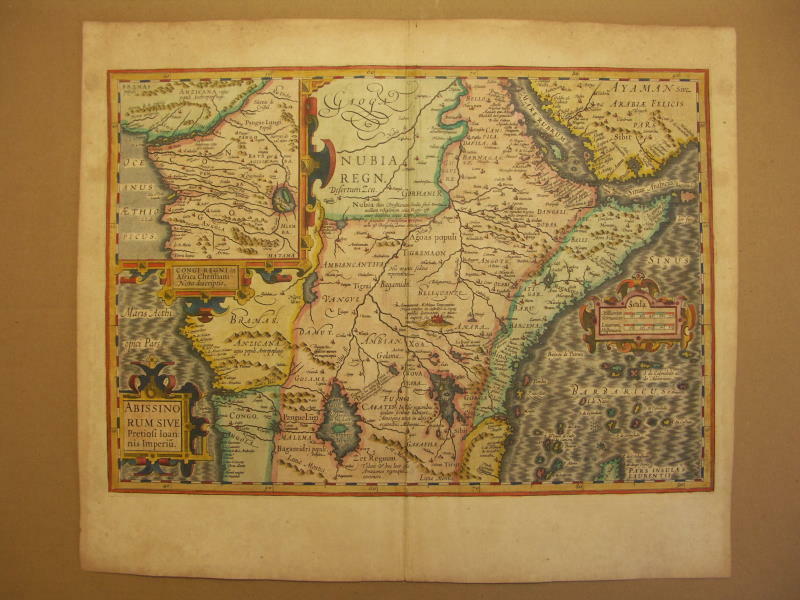 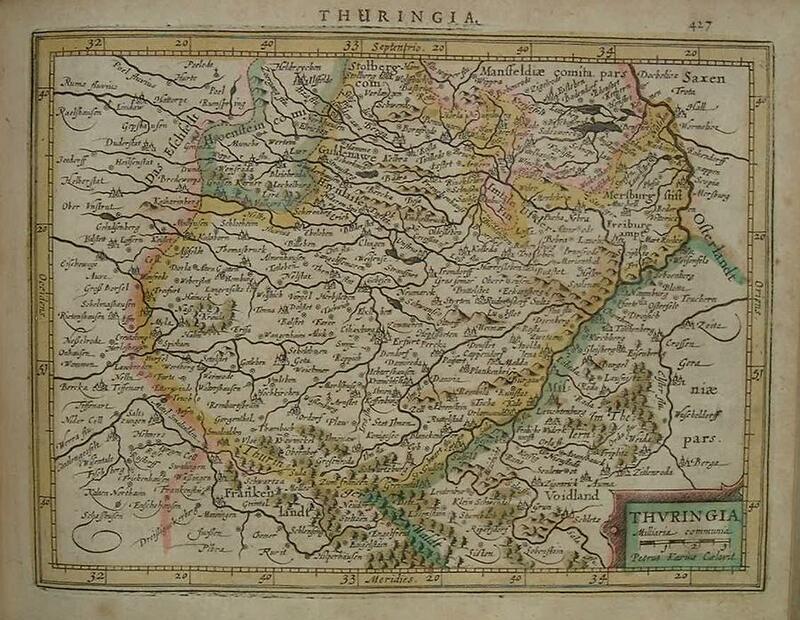 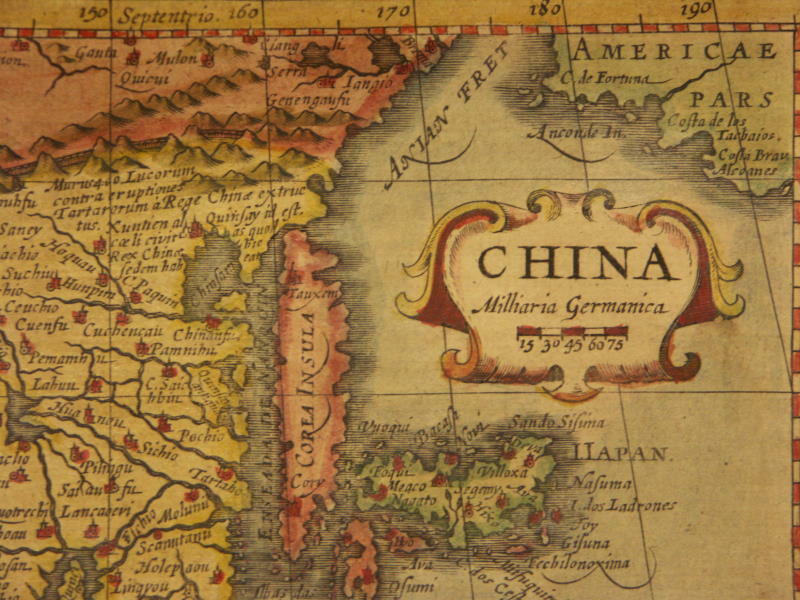 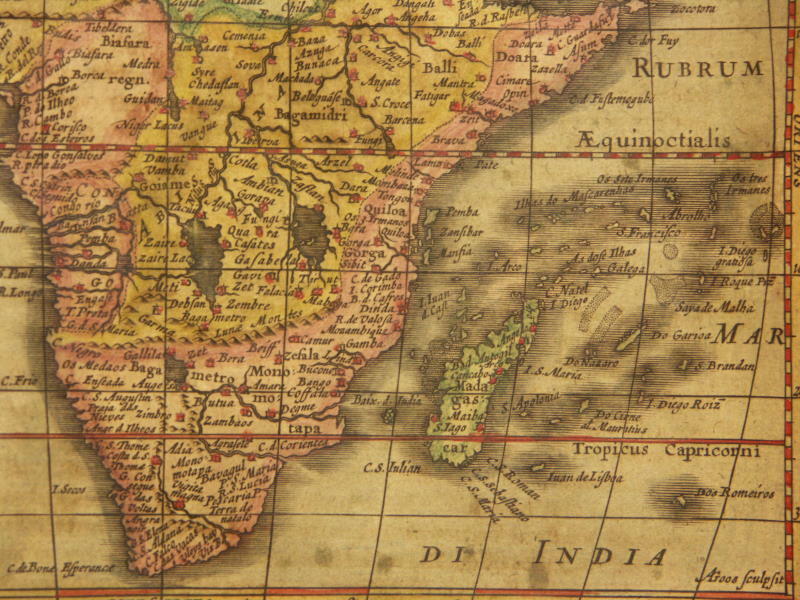 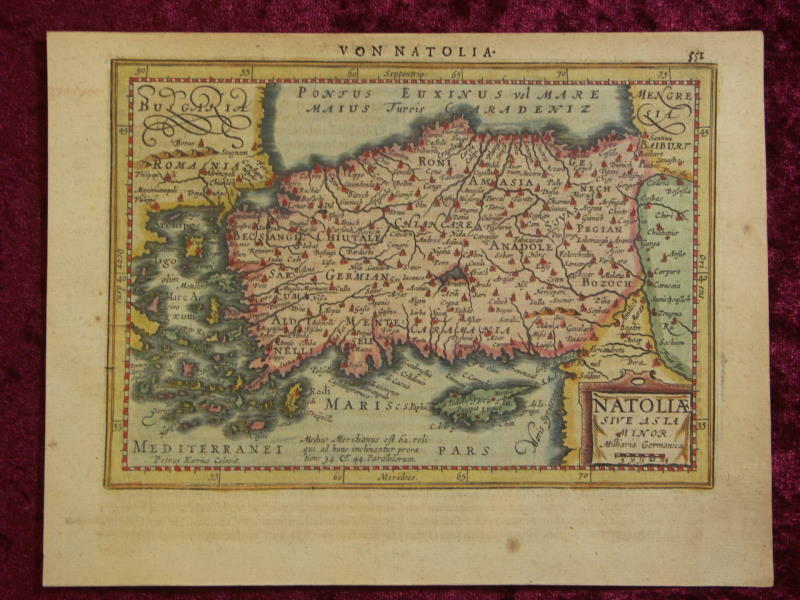 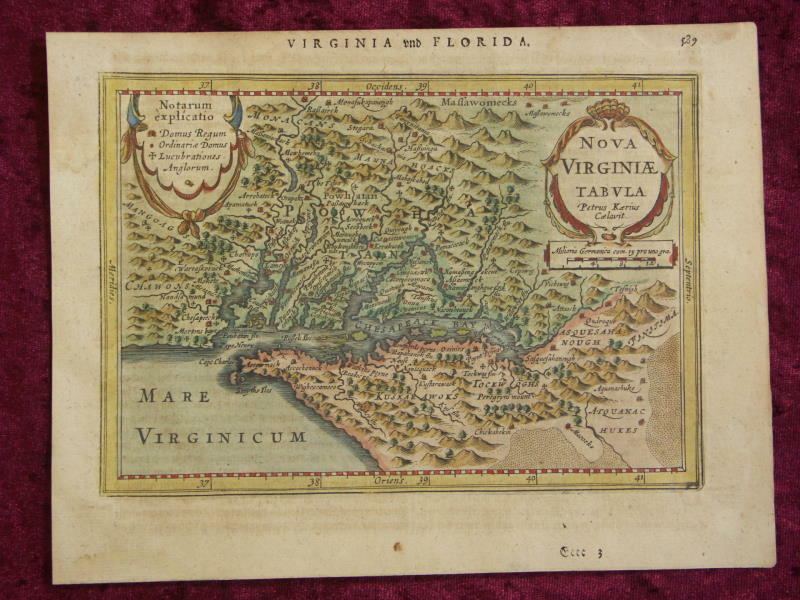 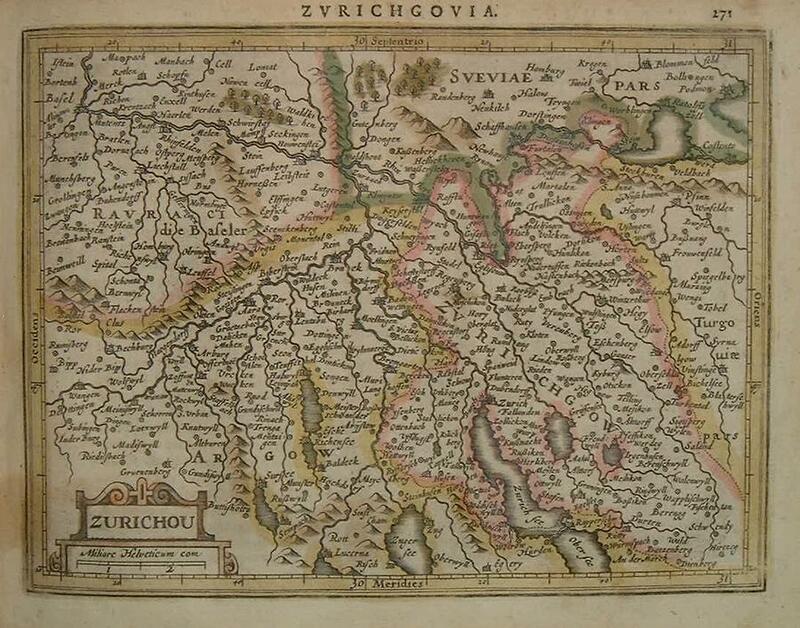 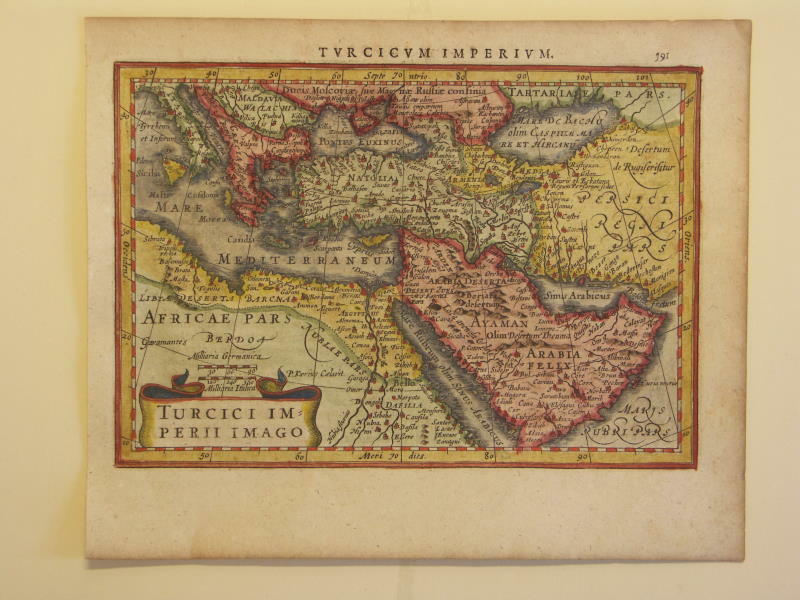 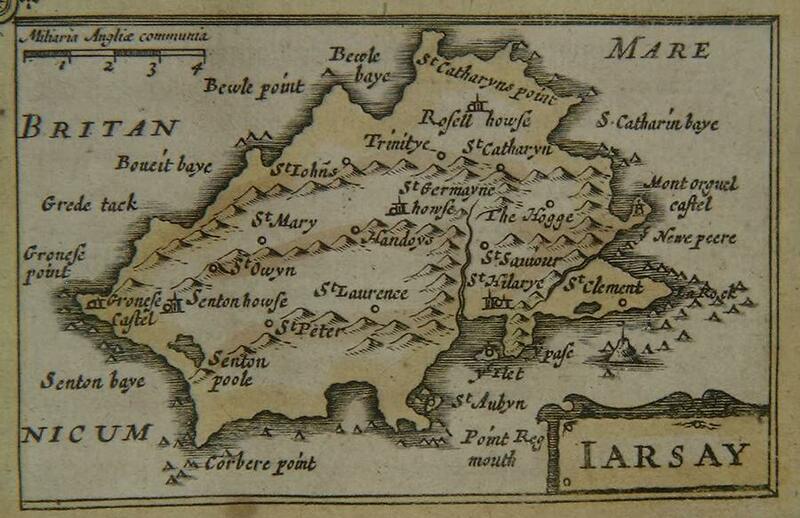 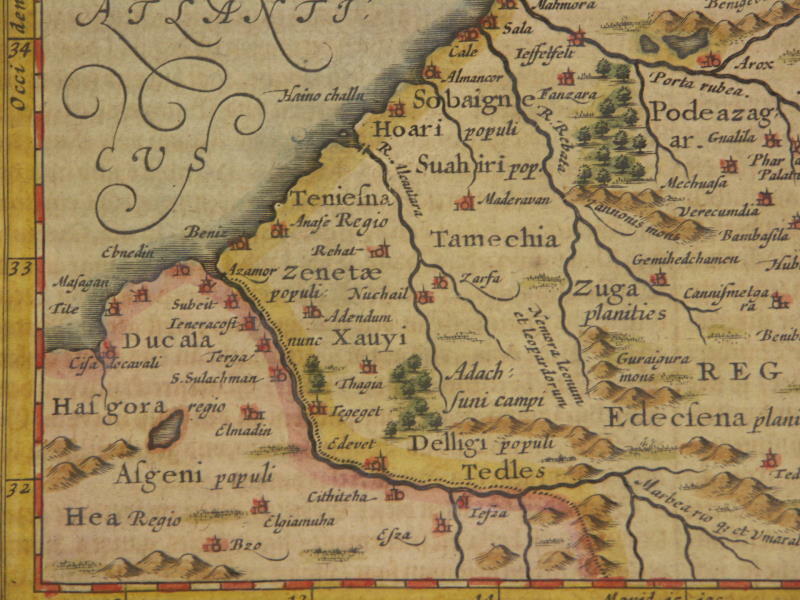 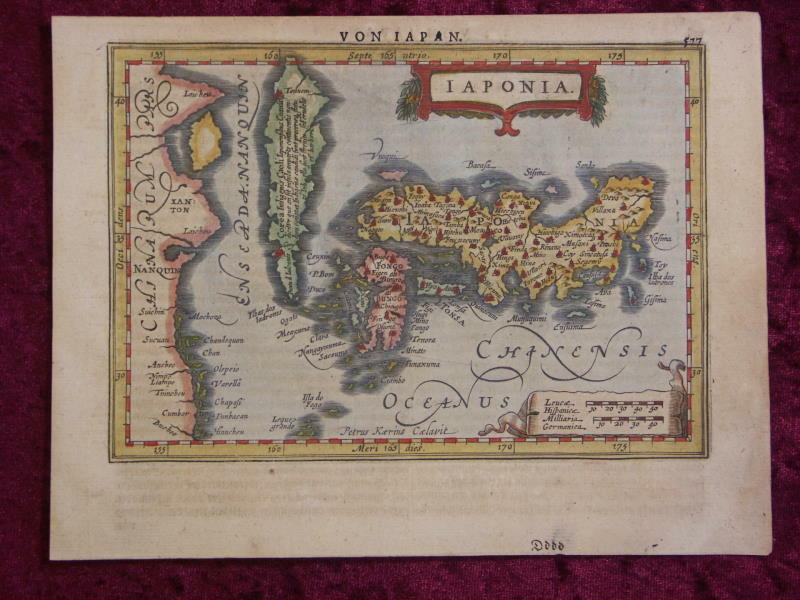 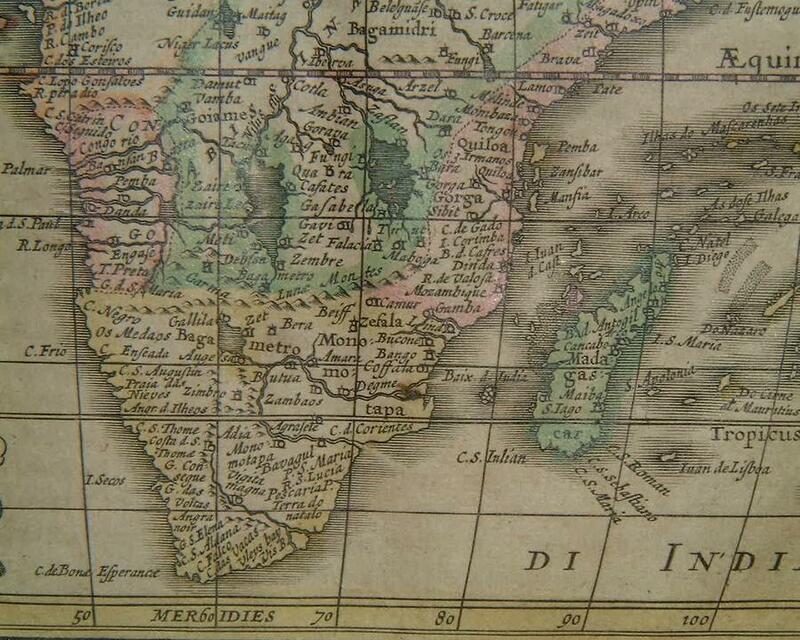 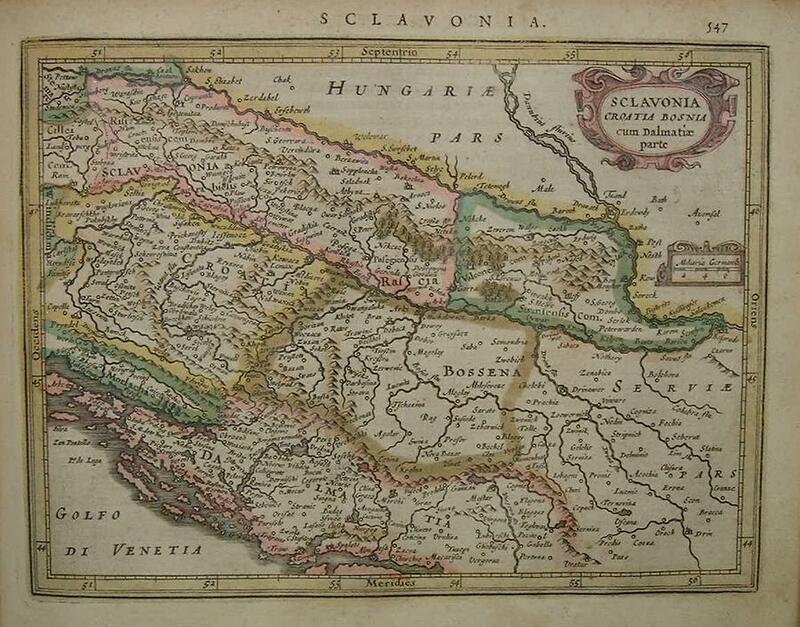 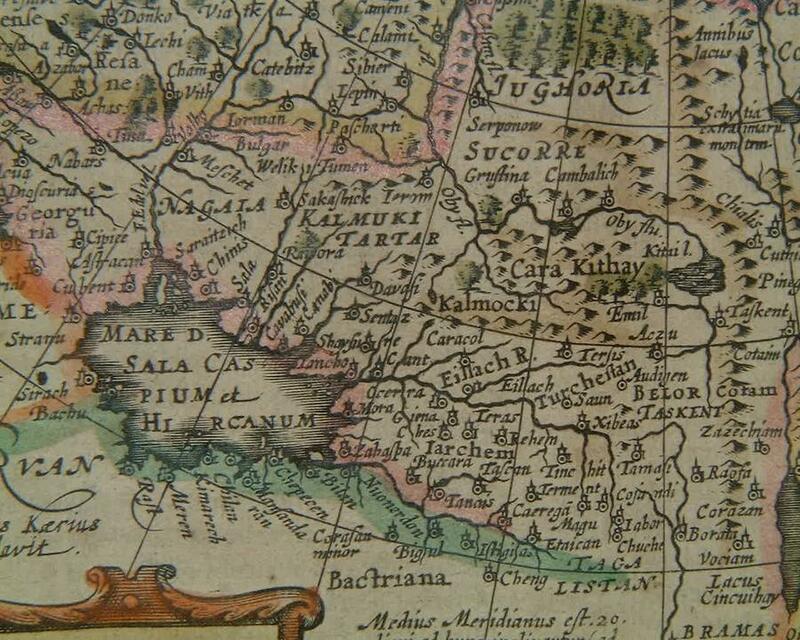 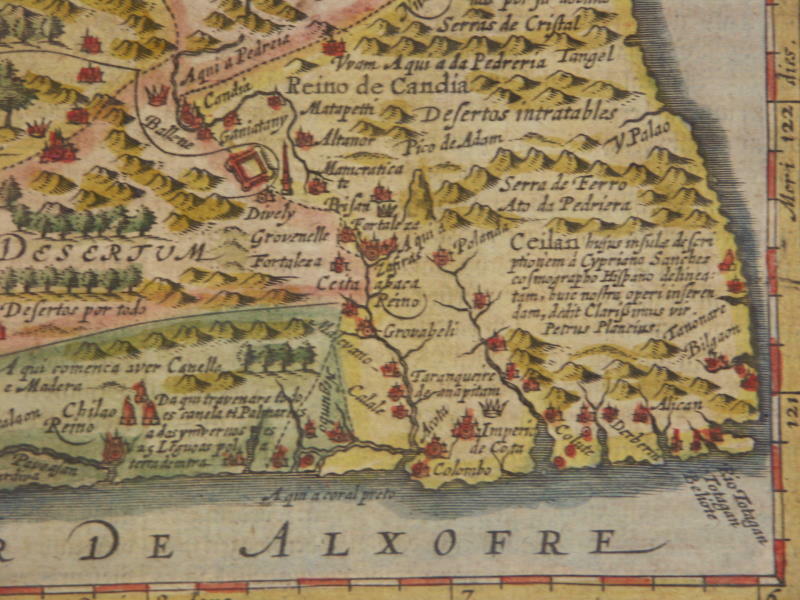 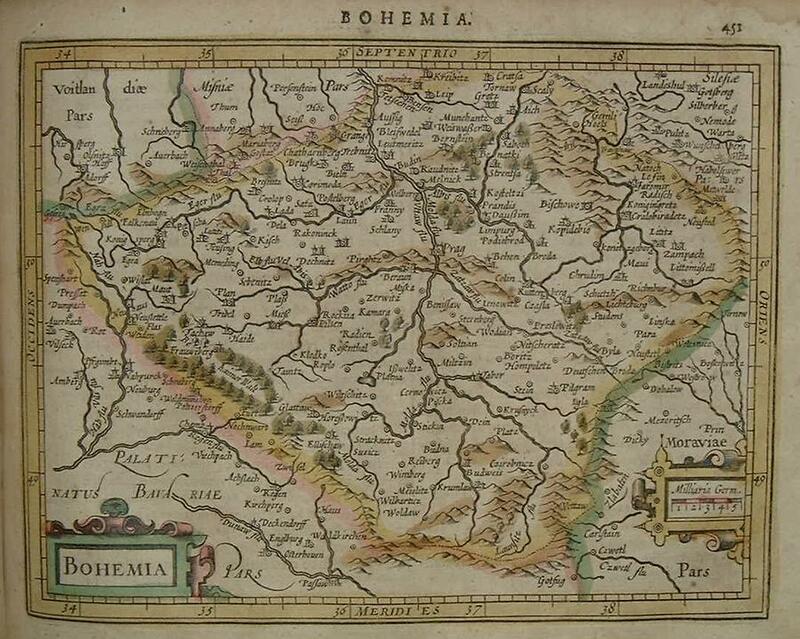 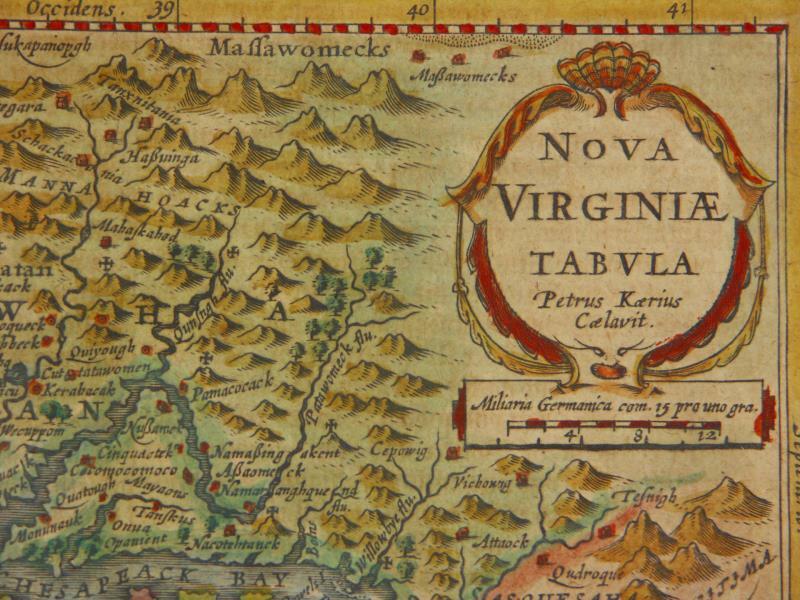 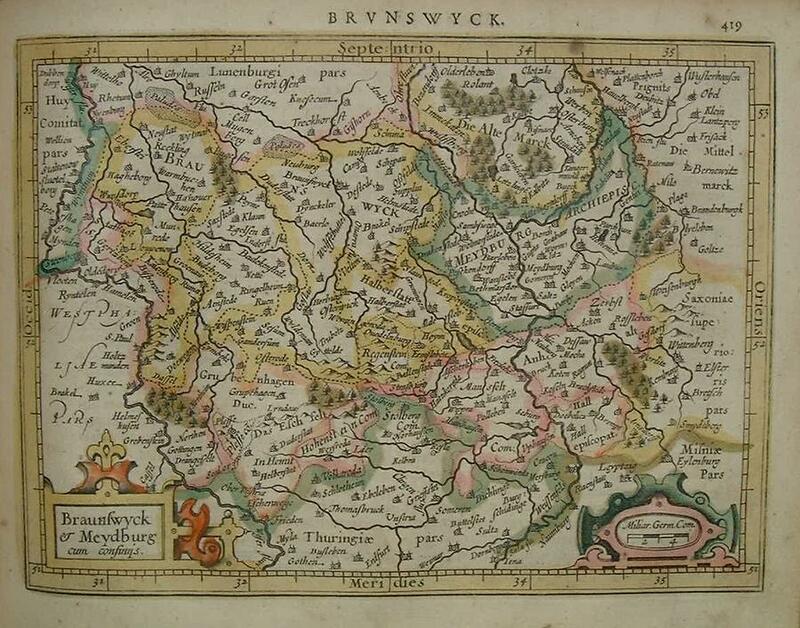 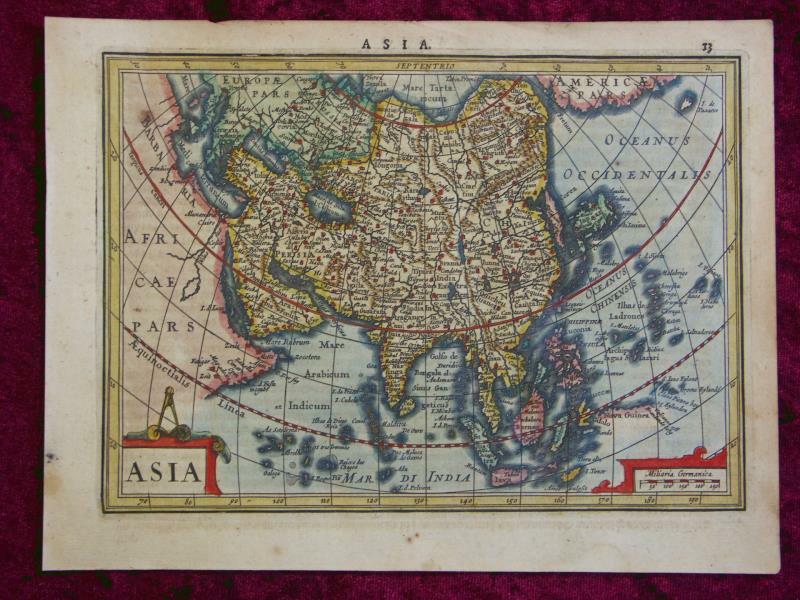 The copperplates for the first atlases minor were most probably by Hondius himself. 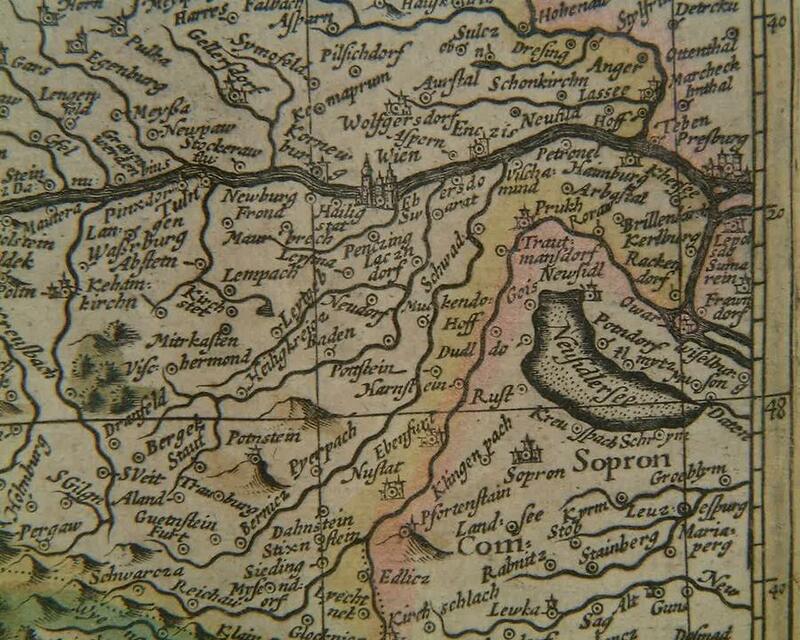 In 1628, Joh. 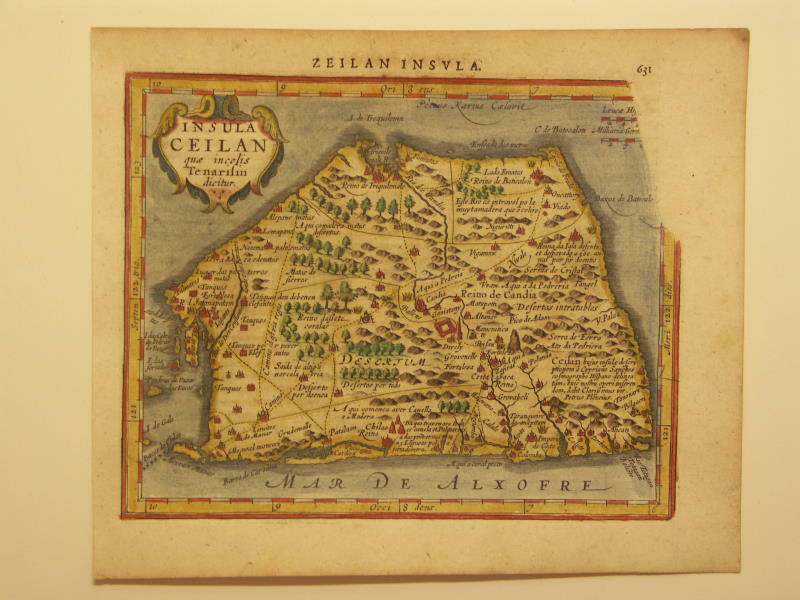 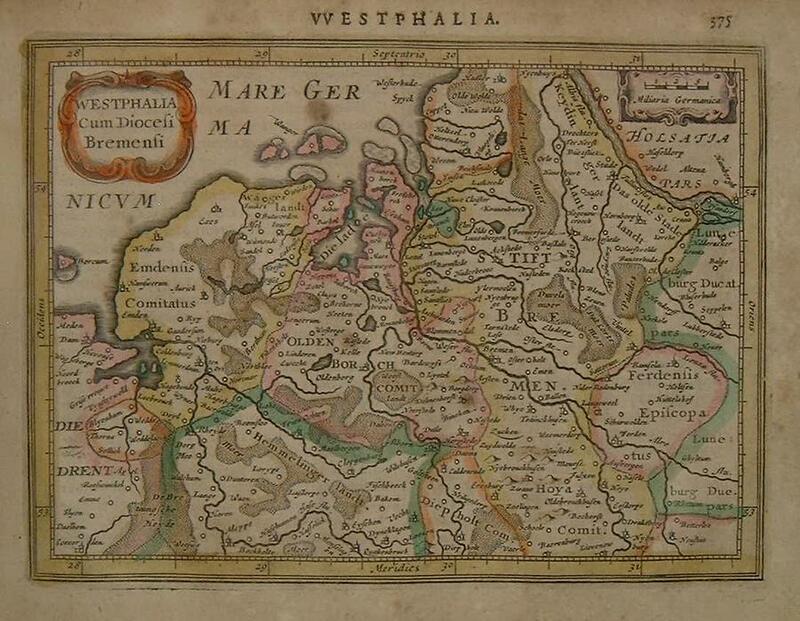 Janssonius published a series of new editions of the Atlas minor; the necessary copperplates were partly made by Petrus Kaerius (Pieter van den Keere) and Abraham Goos."